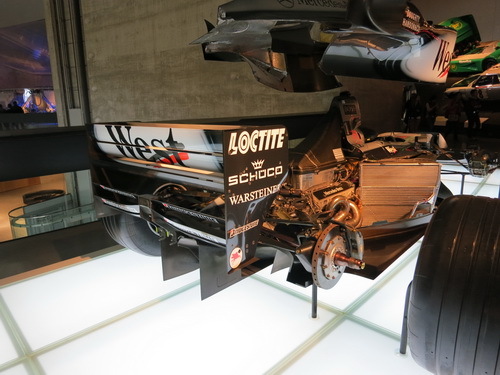 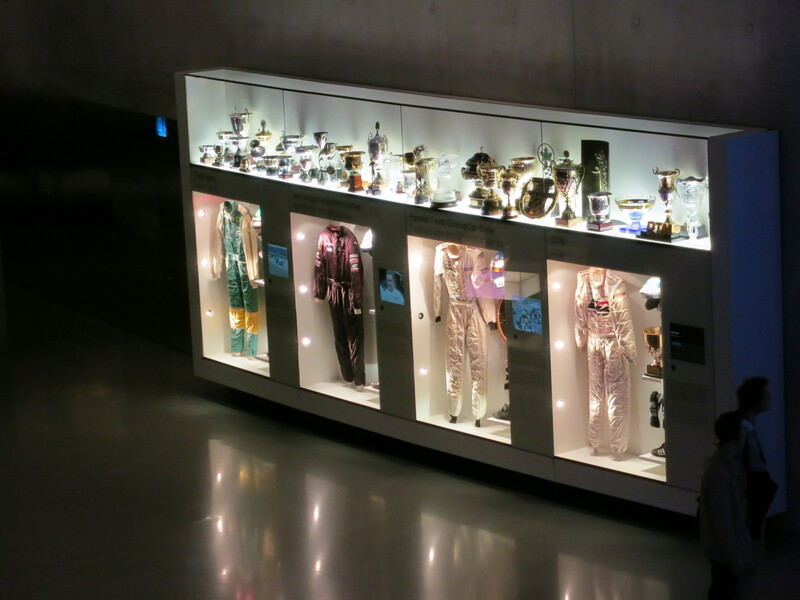 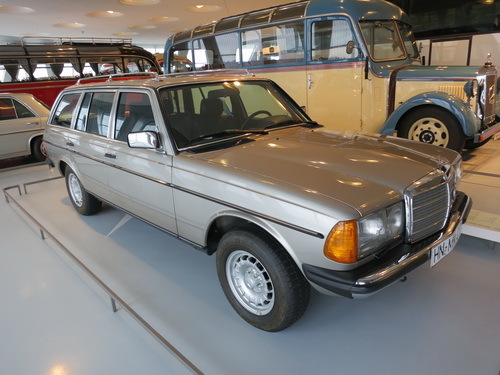 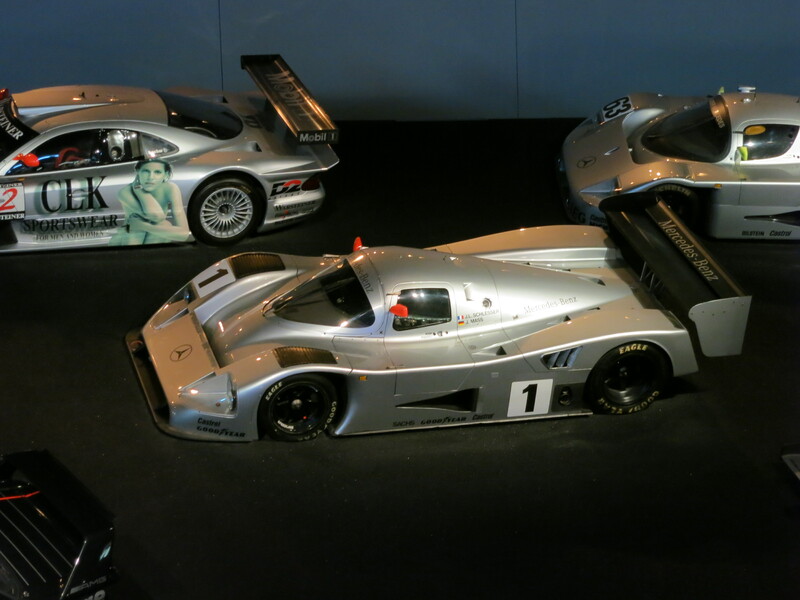 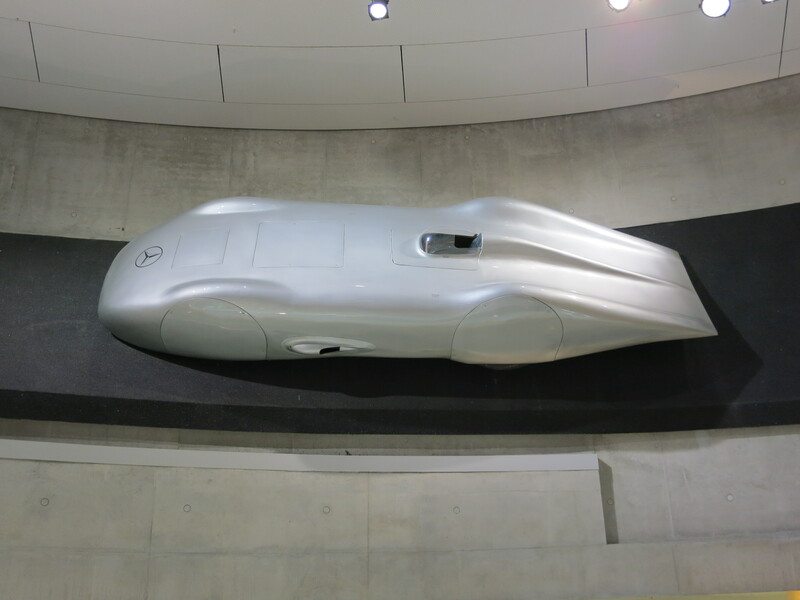 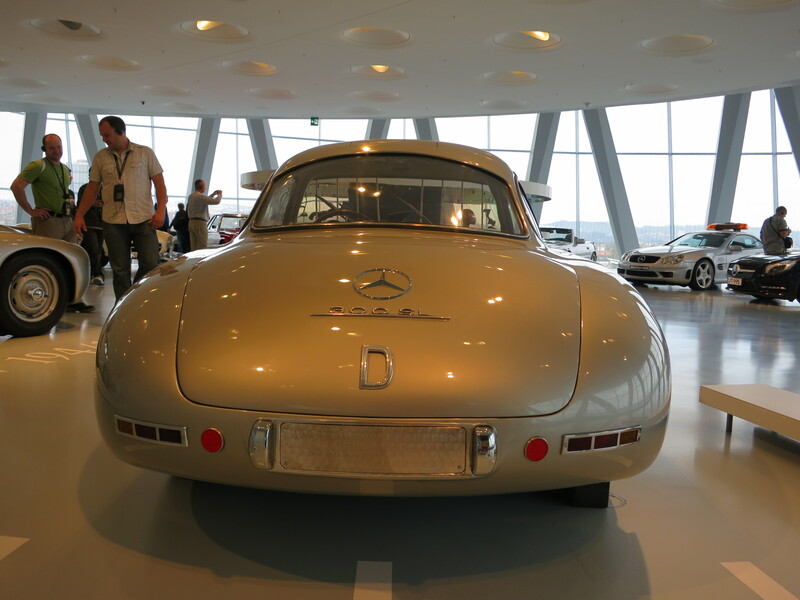 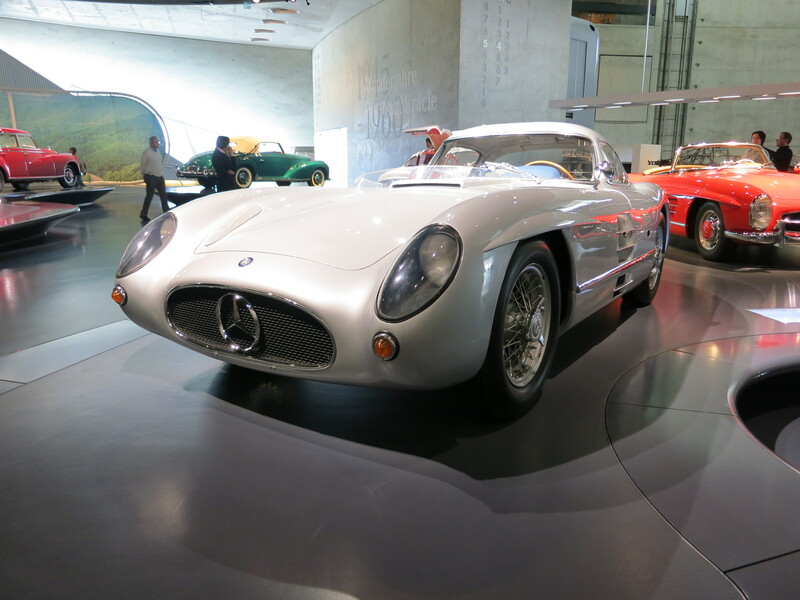 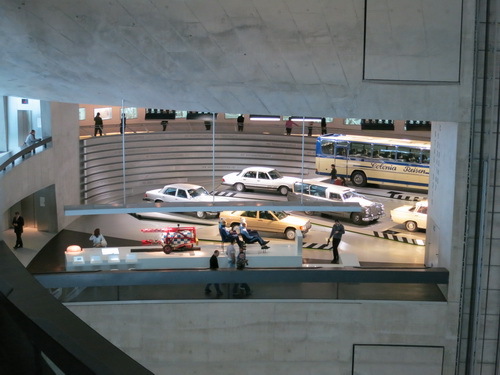 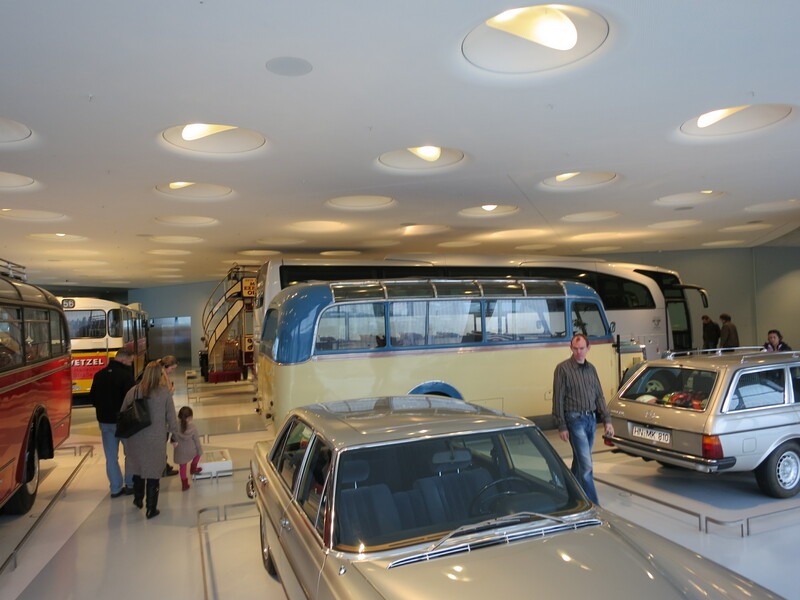 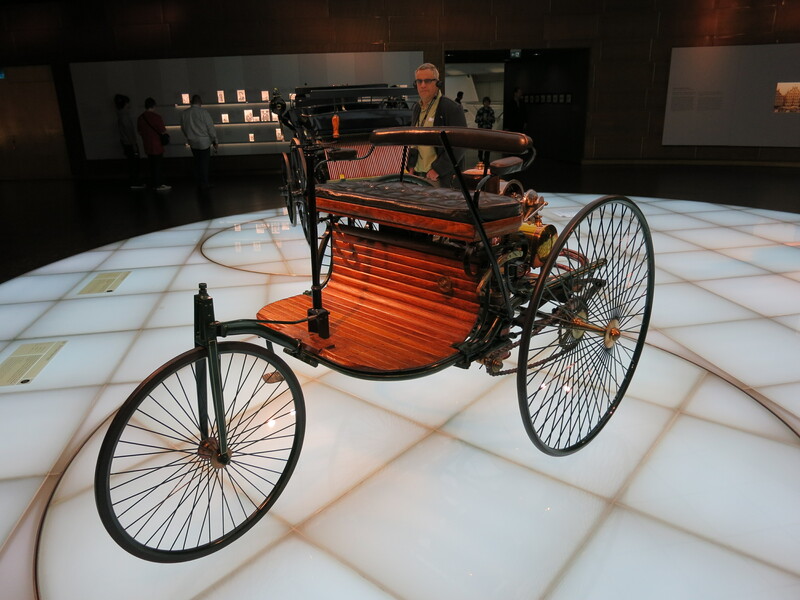 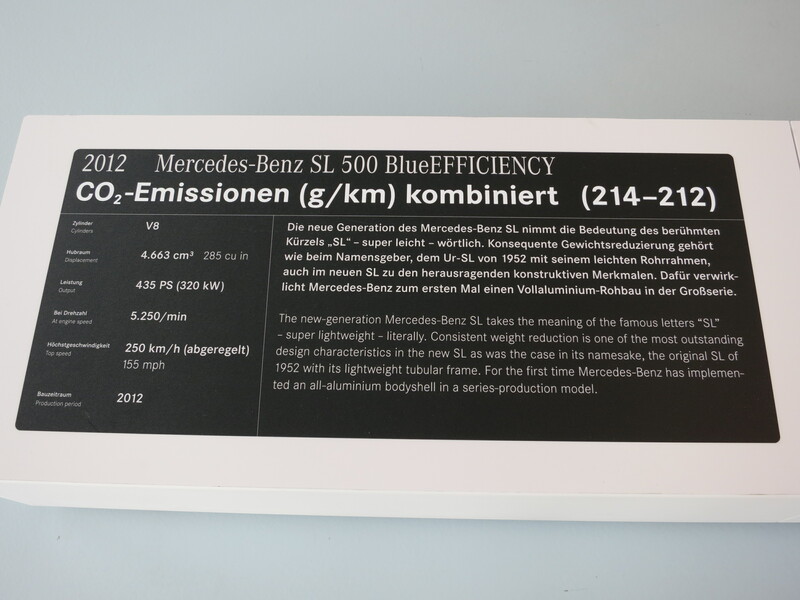 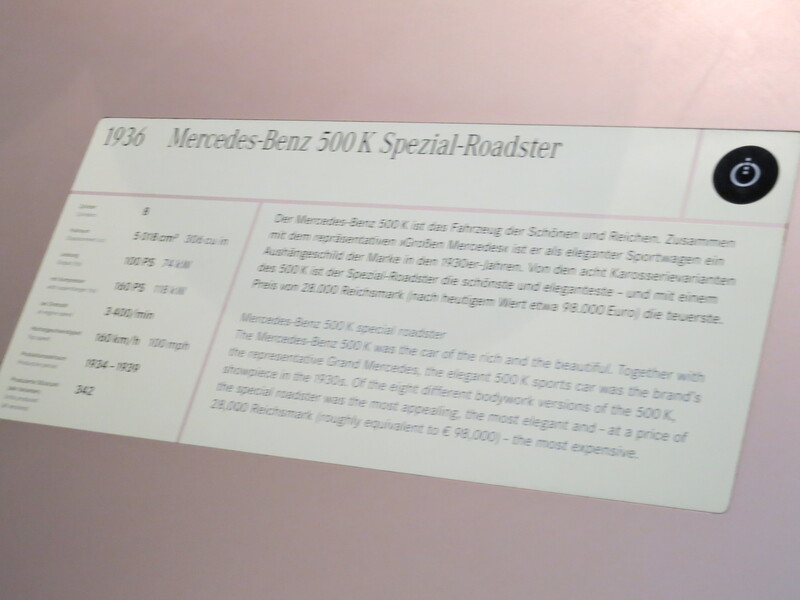 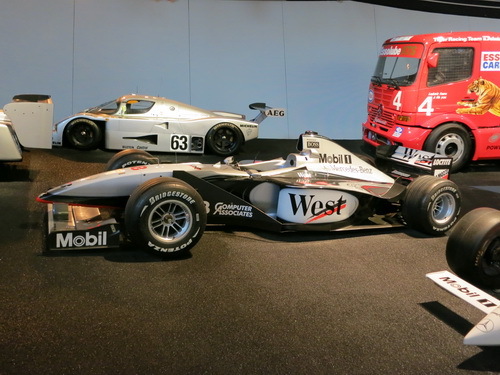 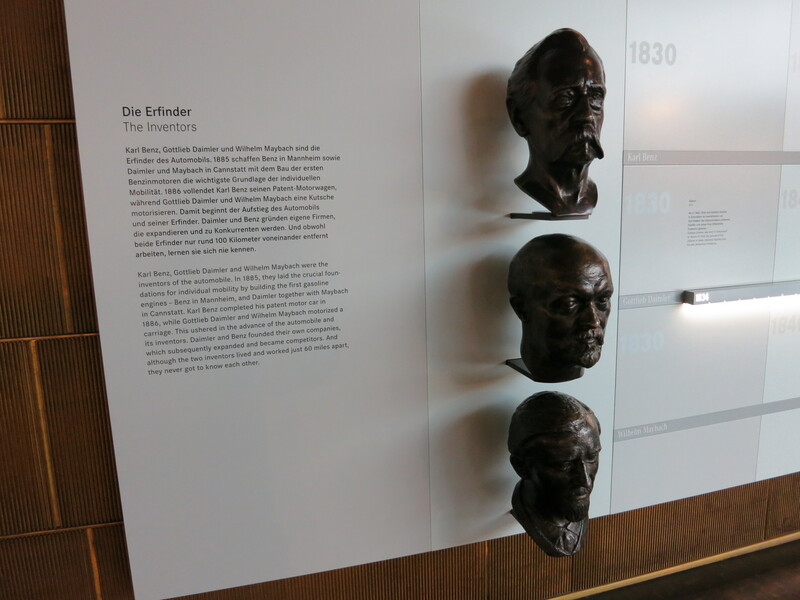 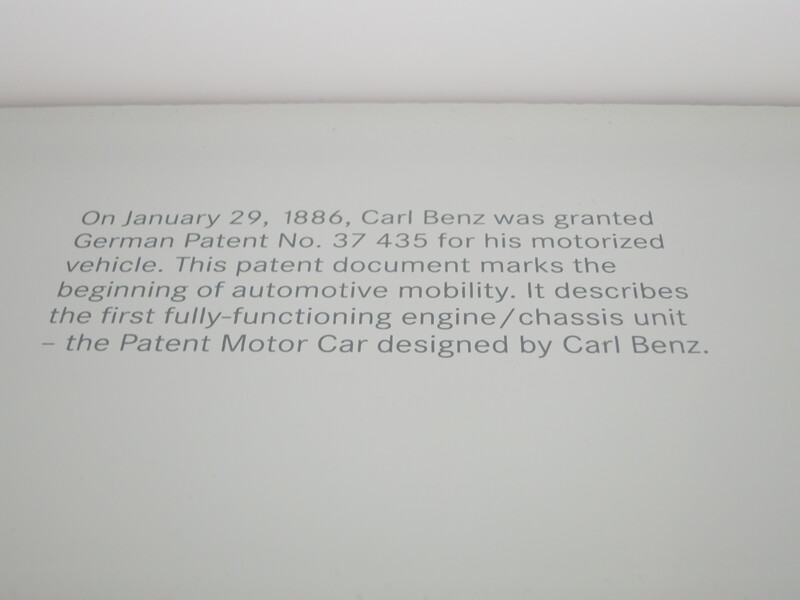 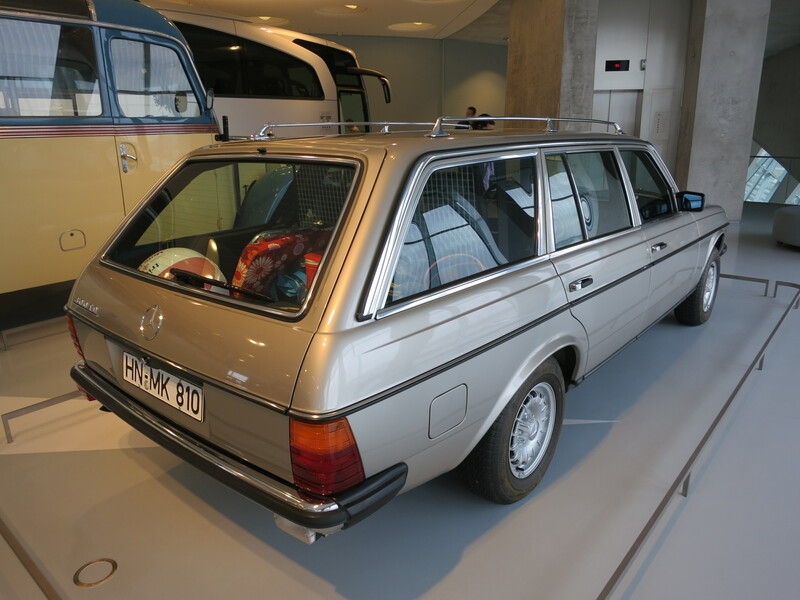 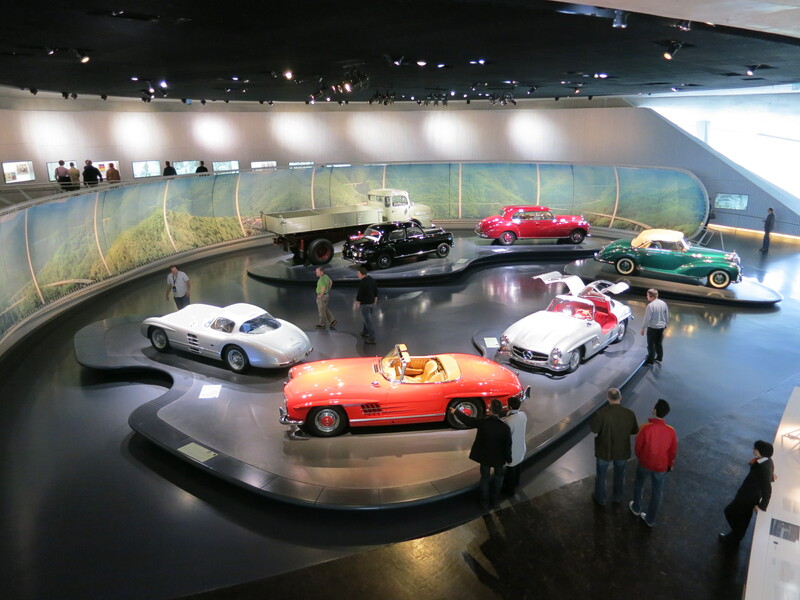 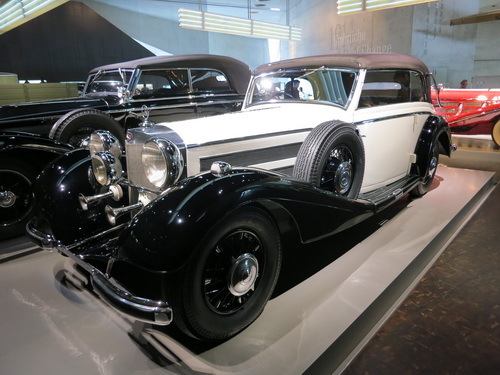 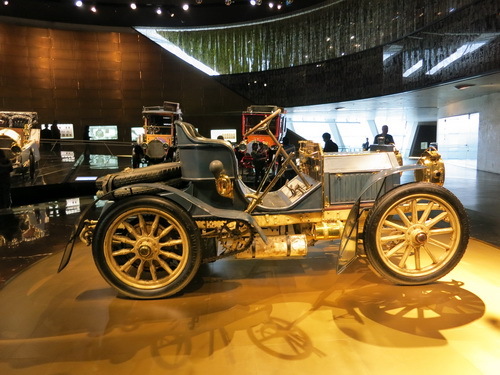 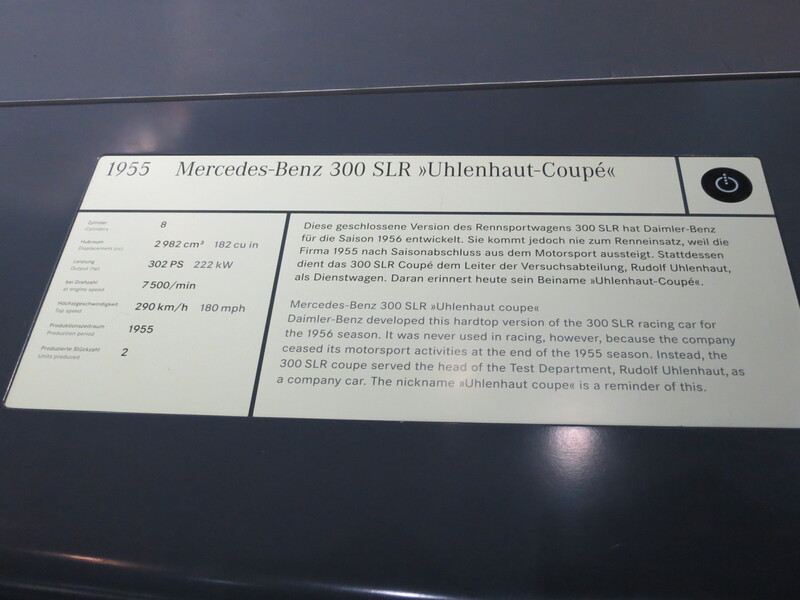 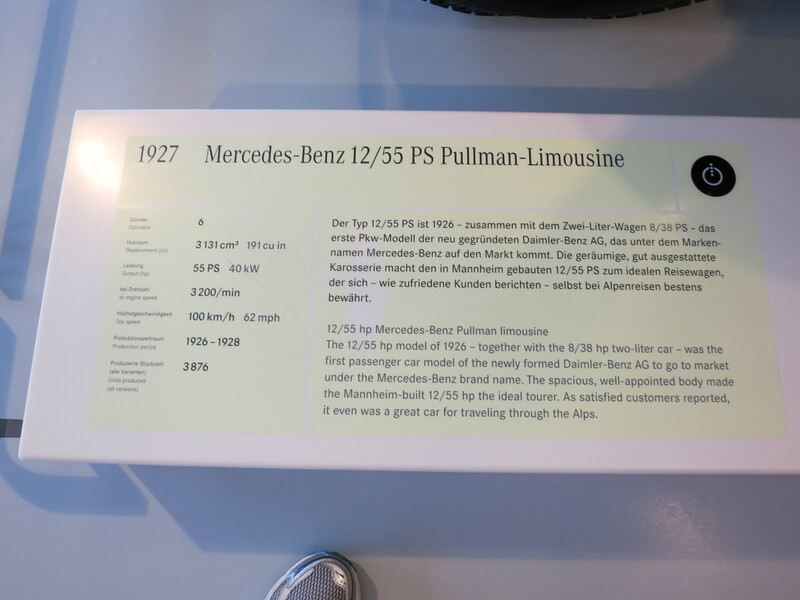 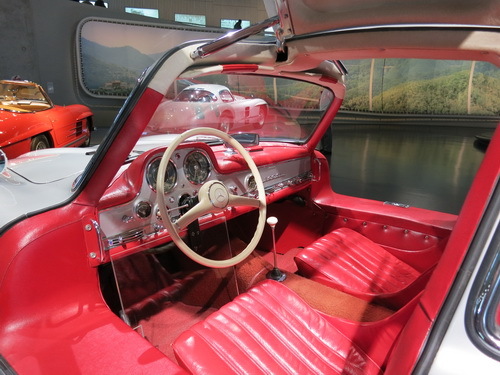 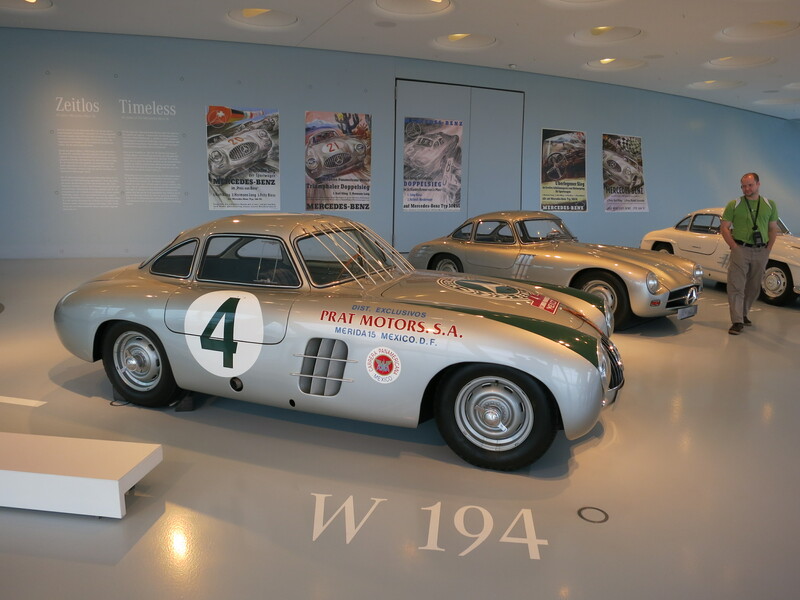 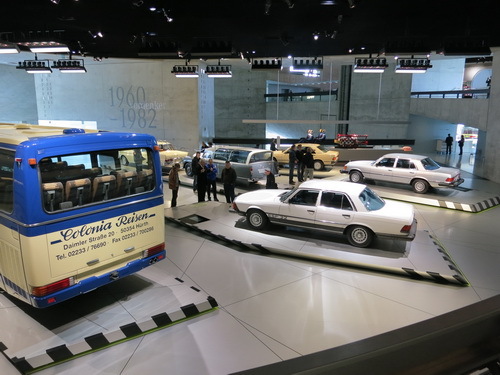 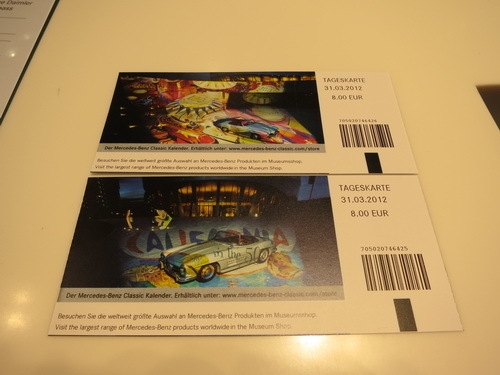 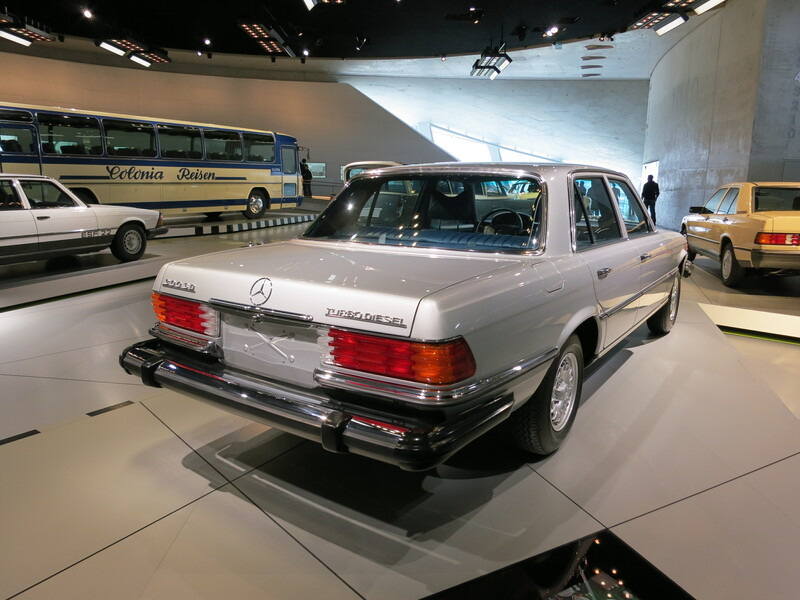 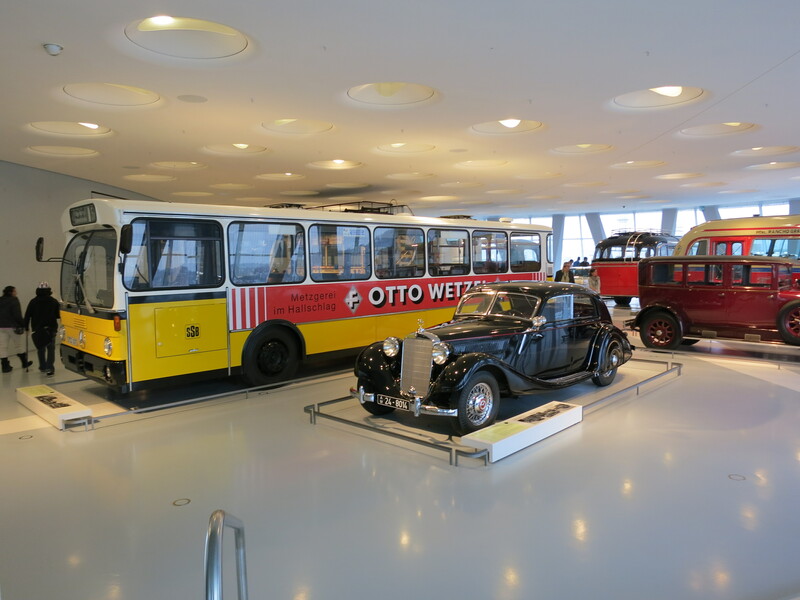 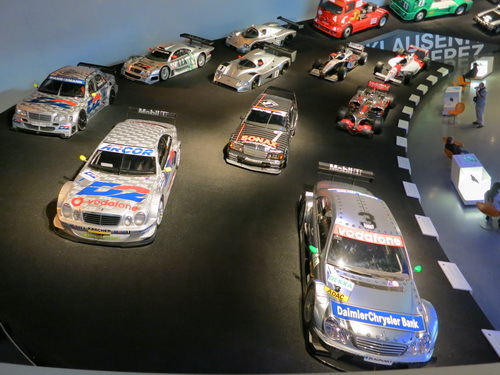 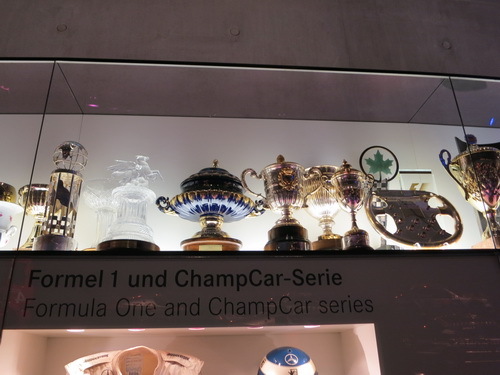 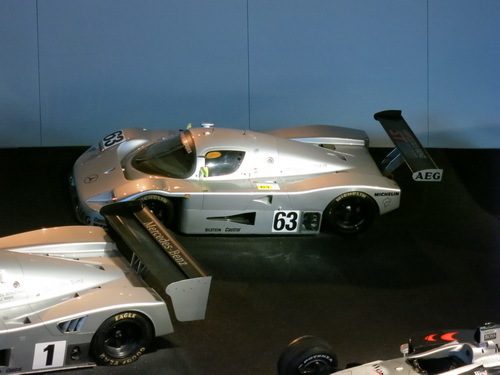 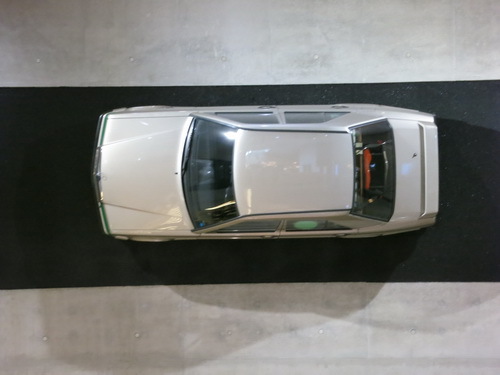 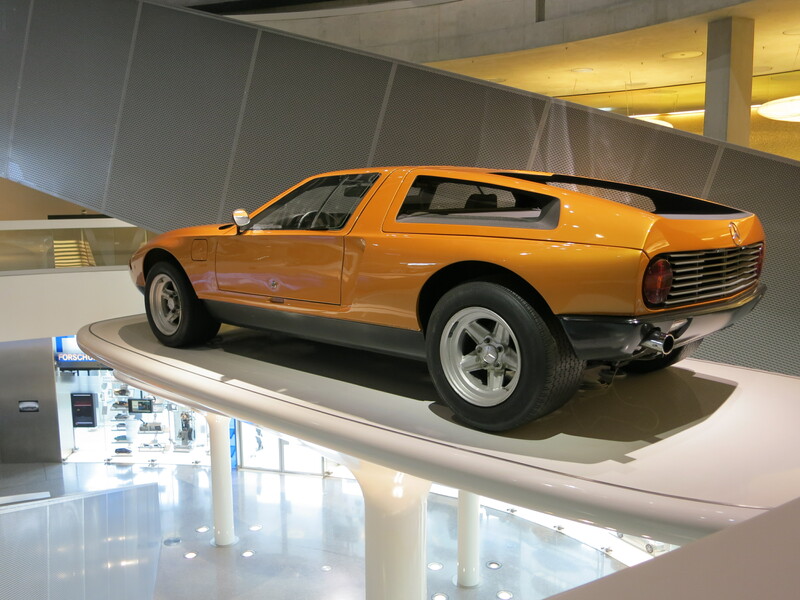 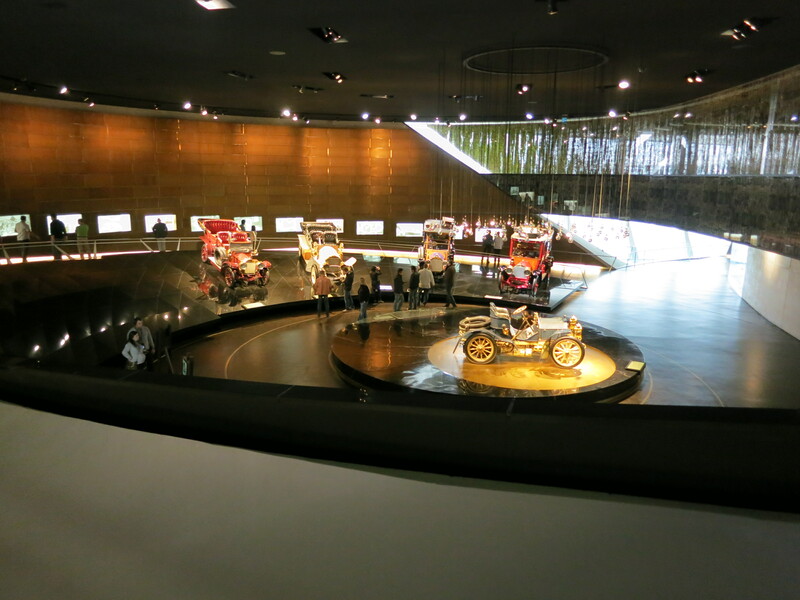 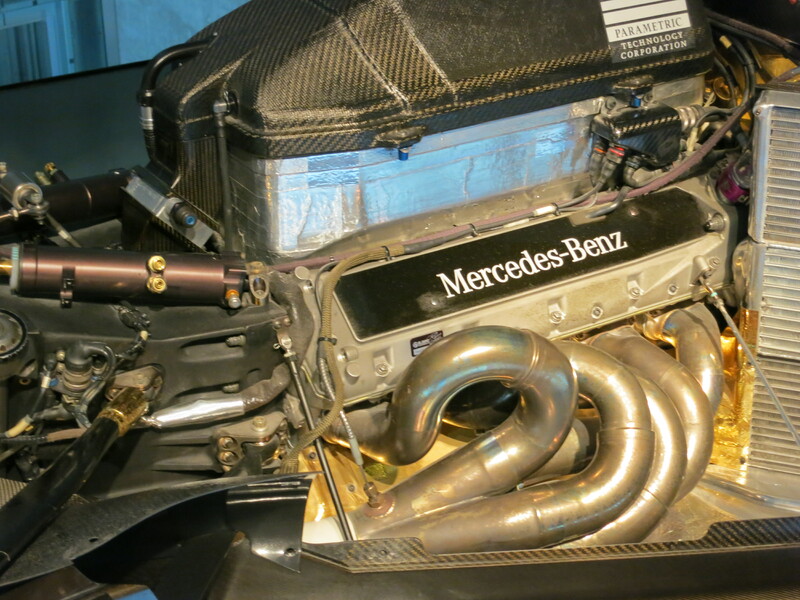 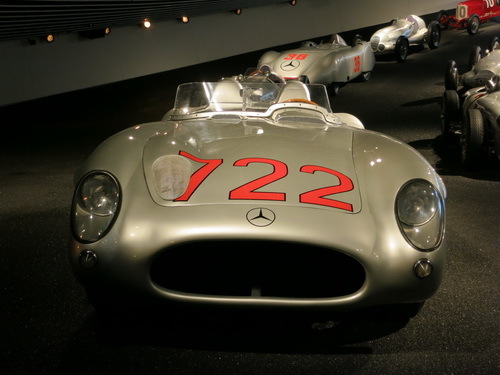 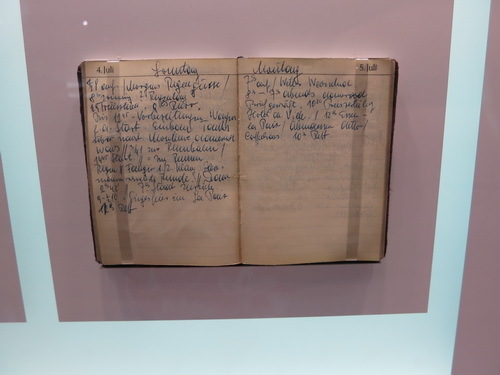 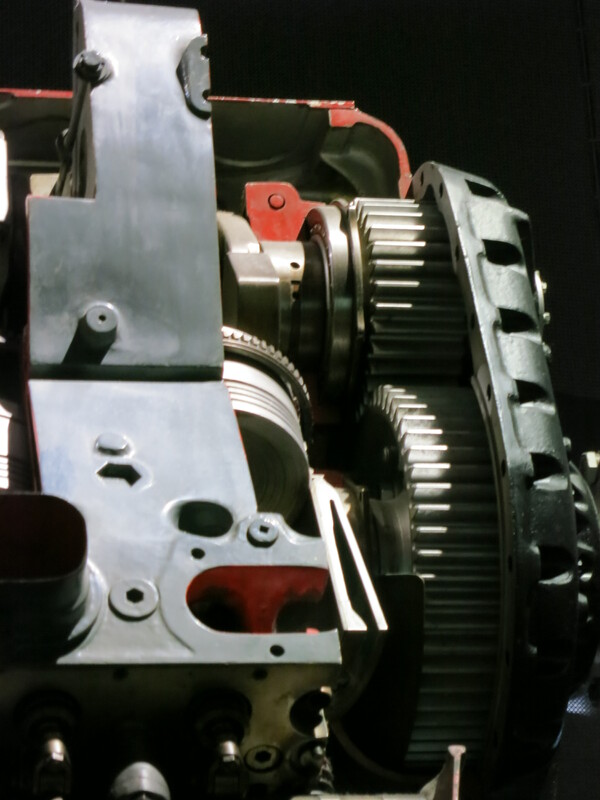 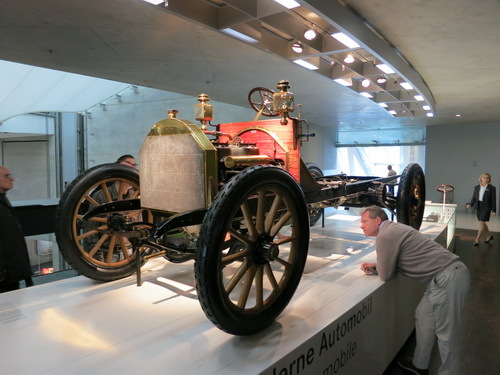 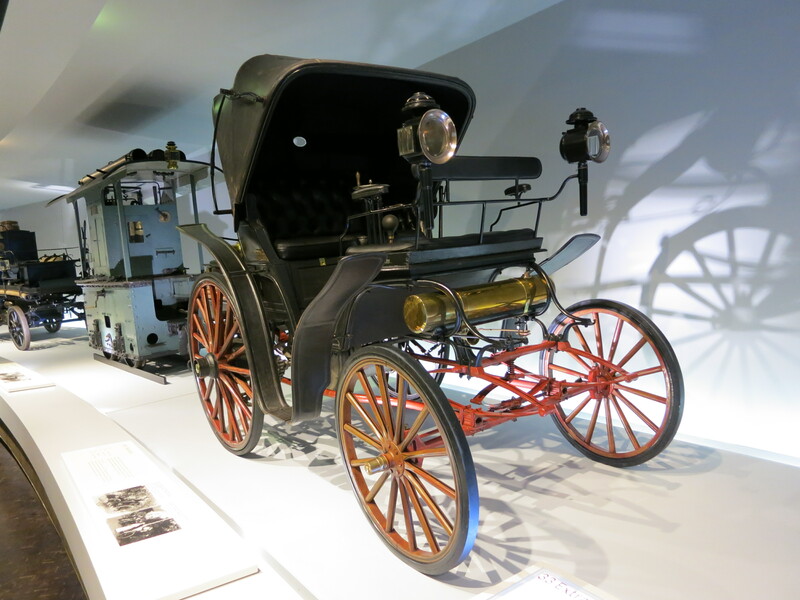 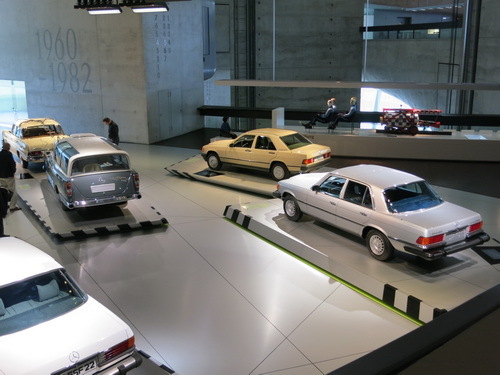 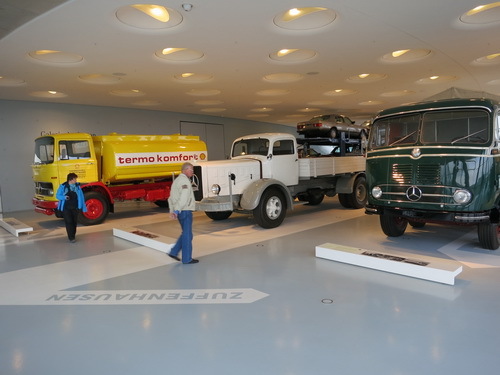 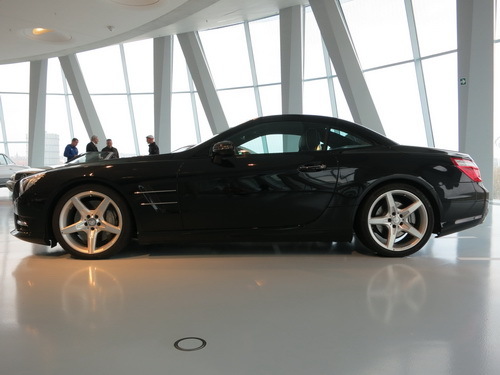 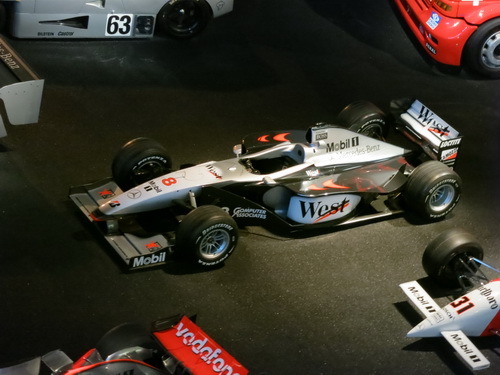 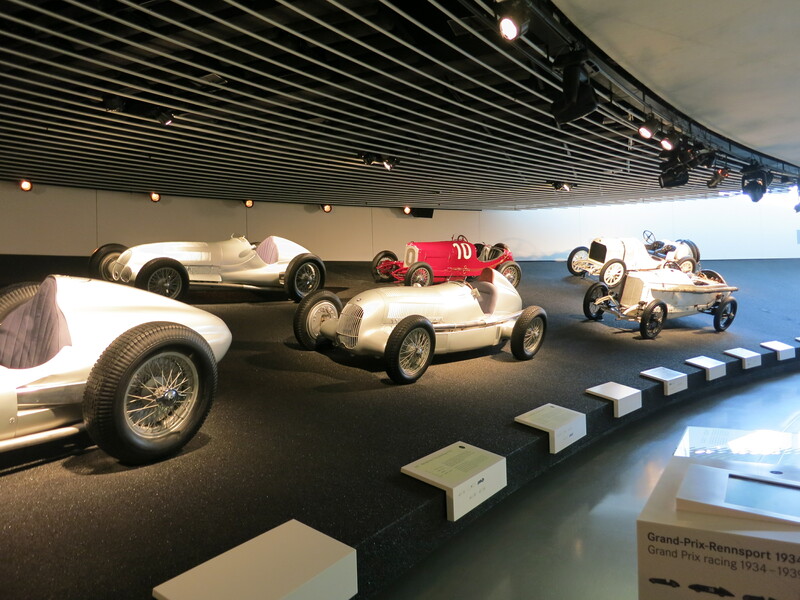 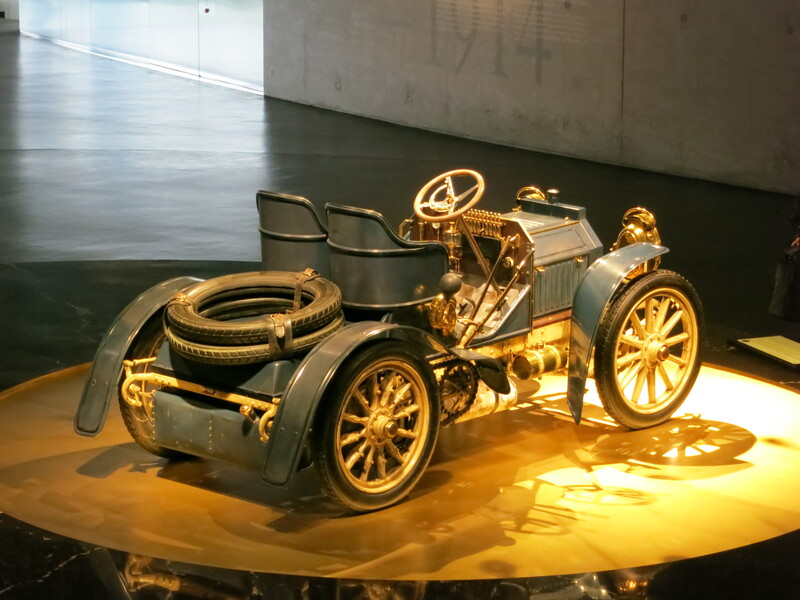 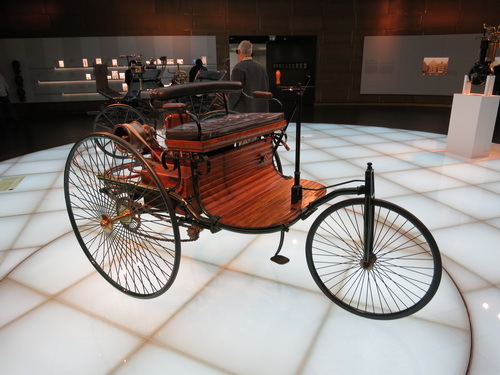 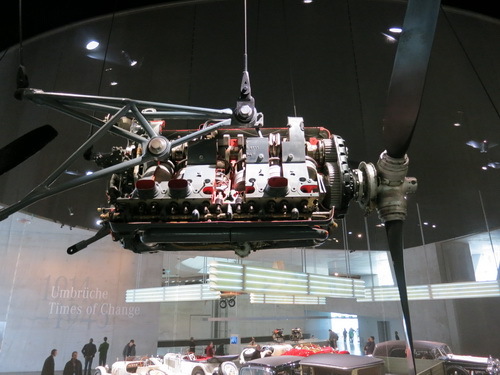 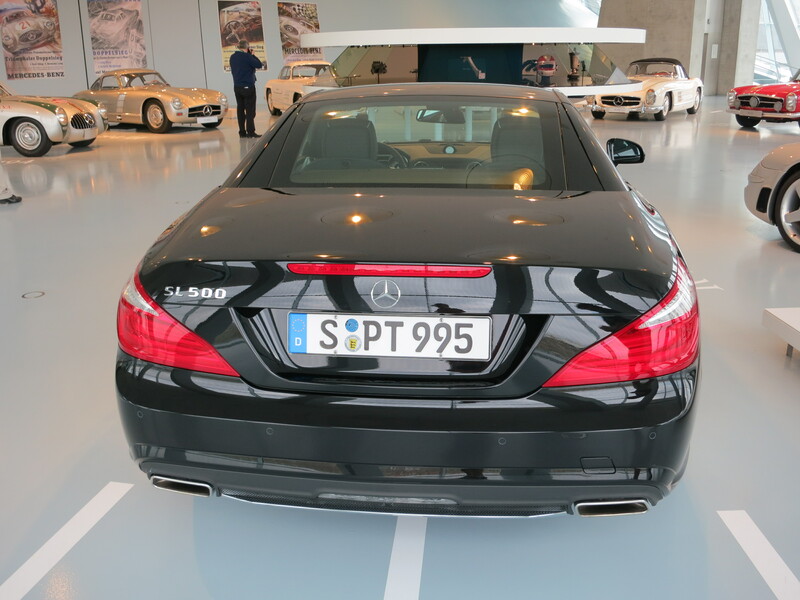 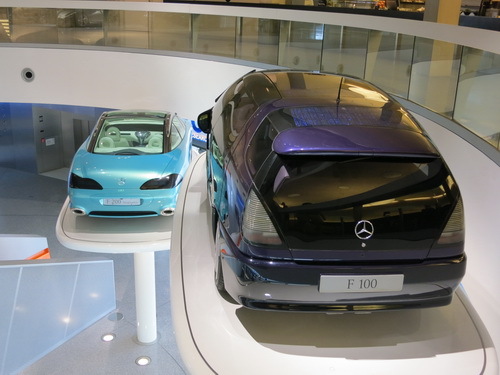 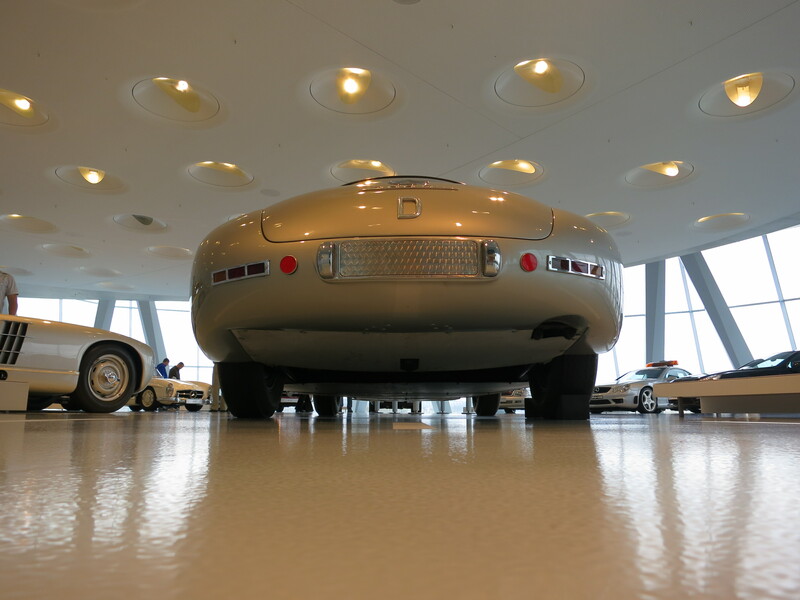 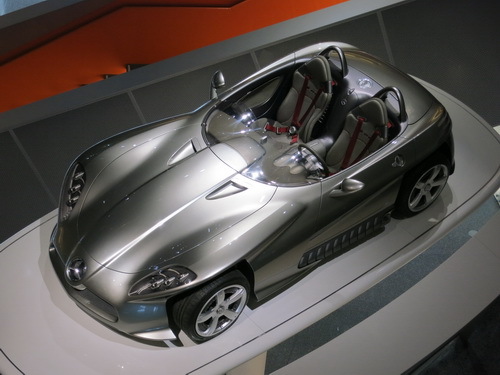 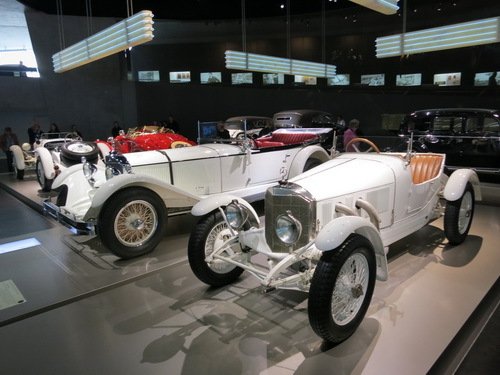 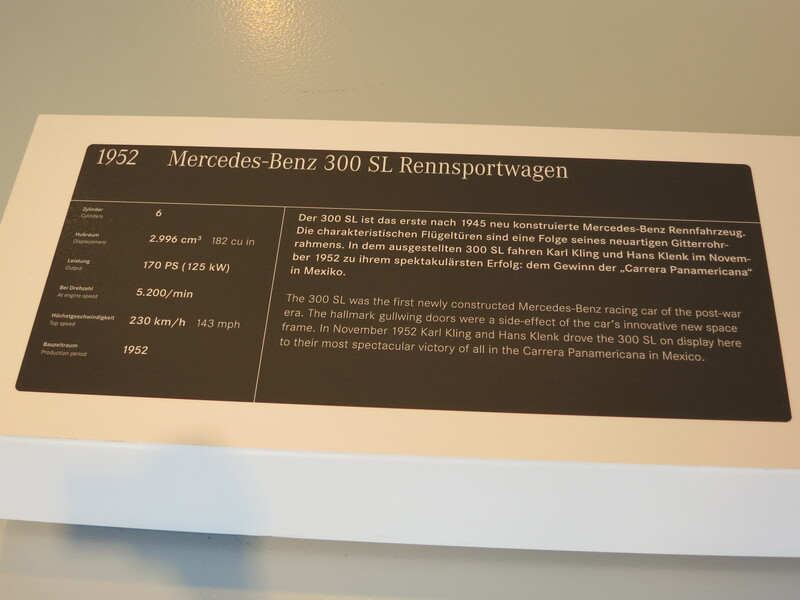 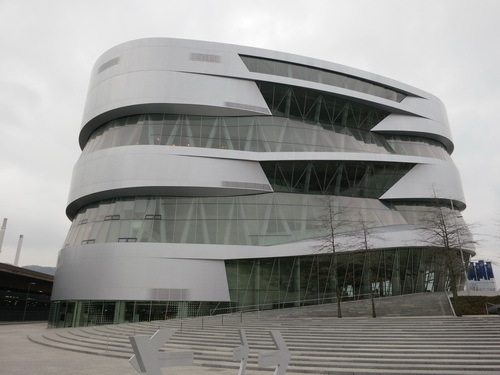 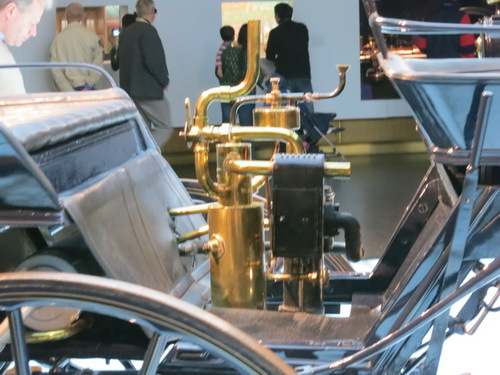 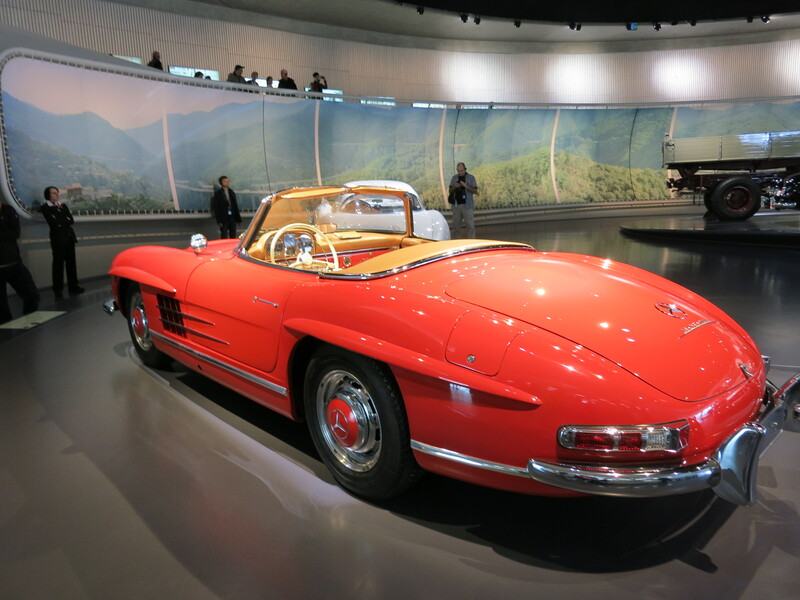 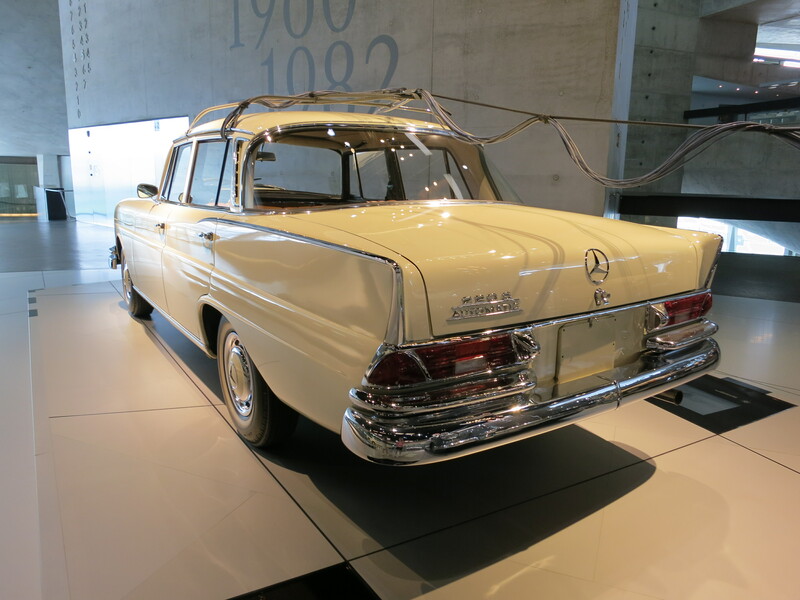 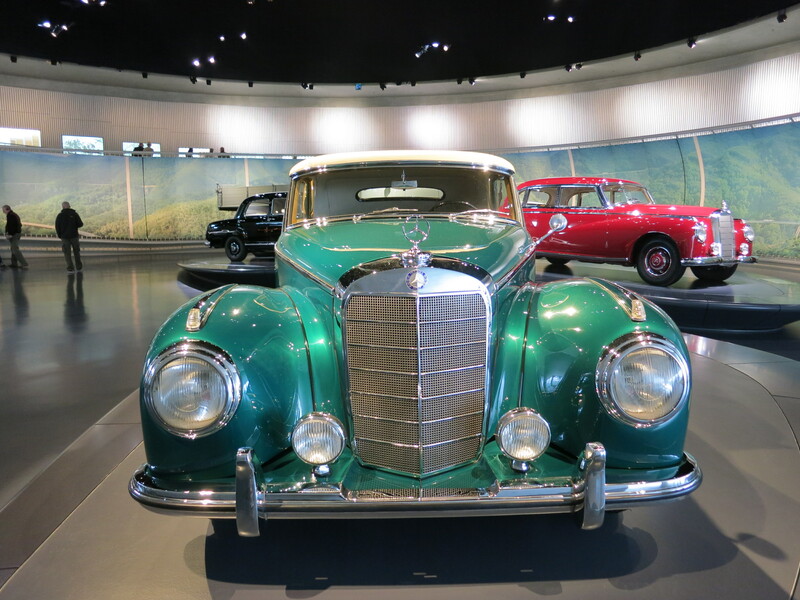 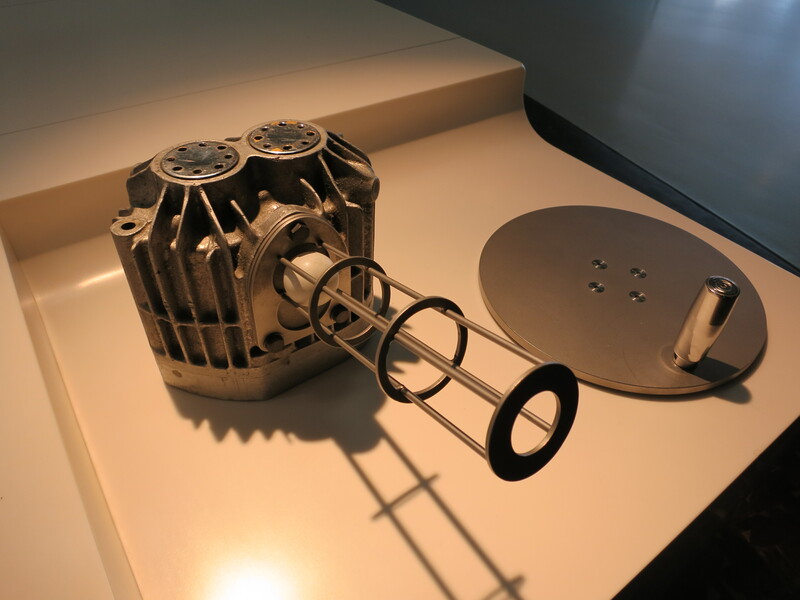 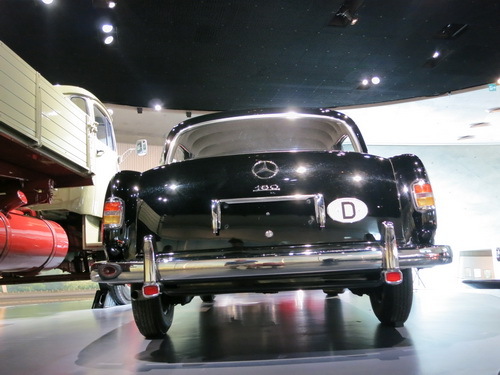 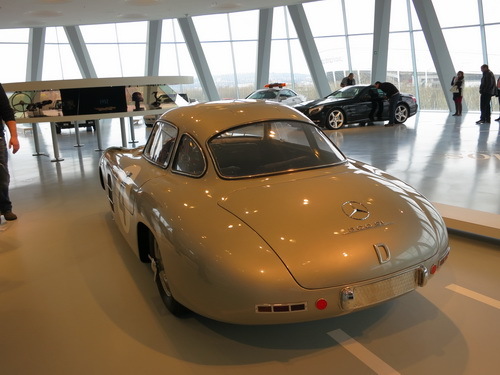 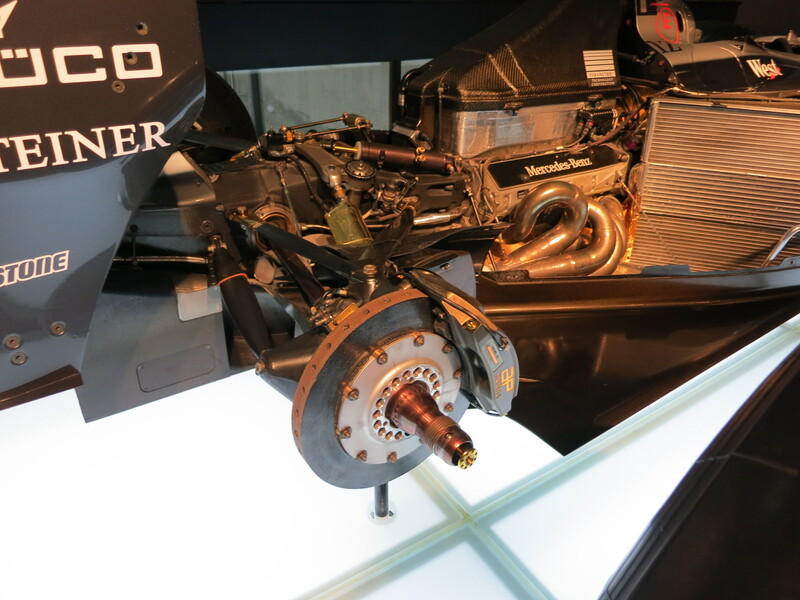 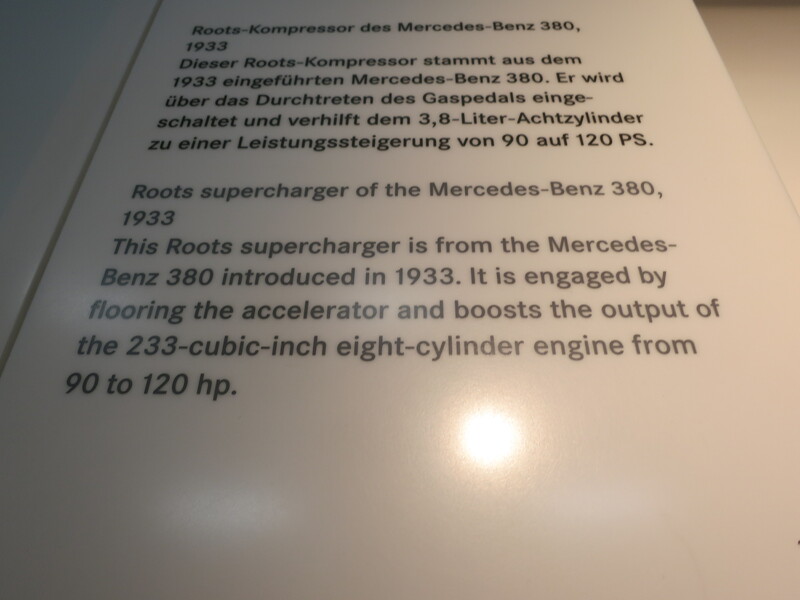 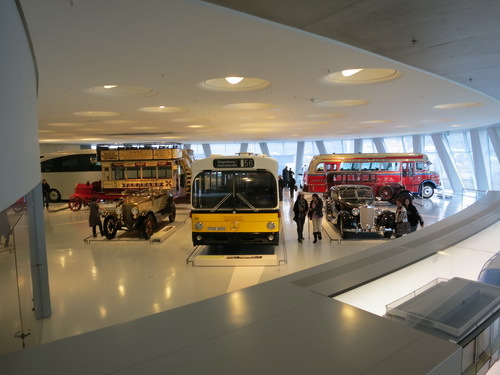 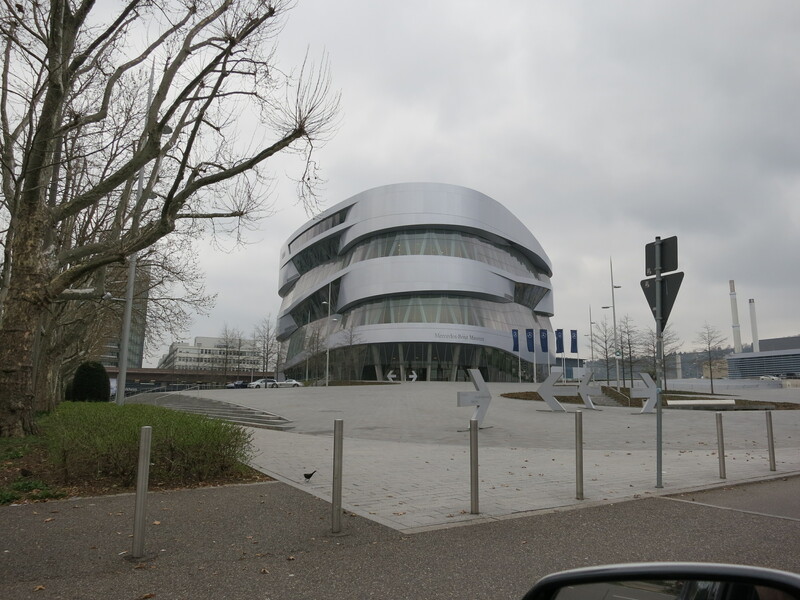 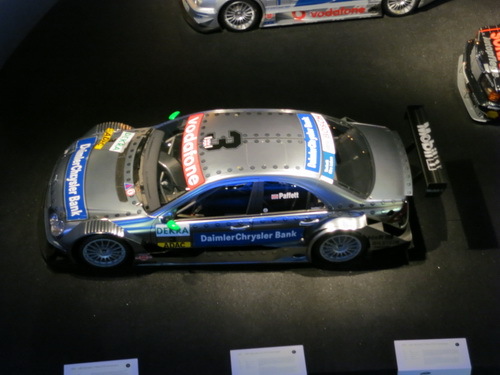 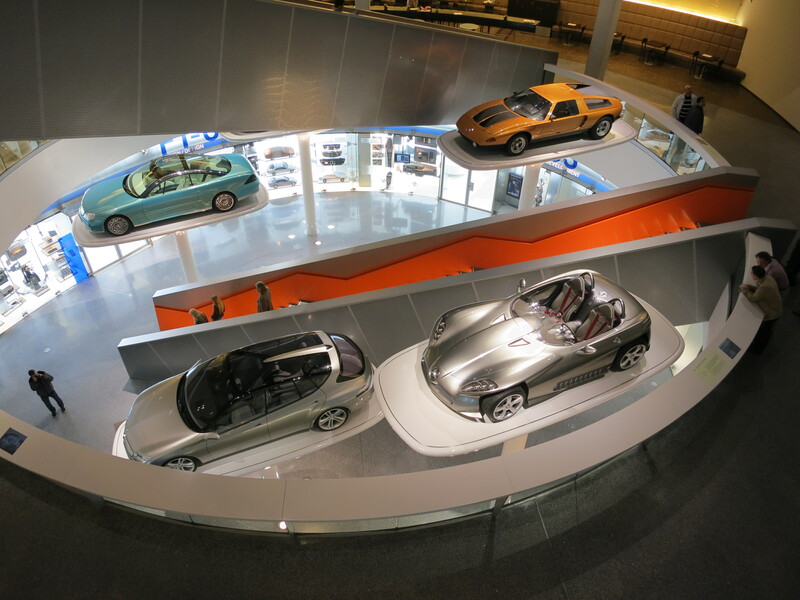 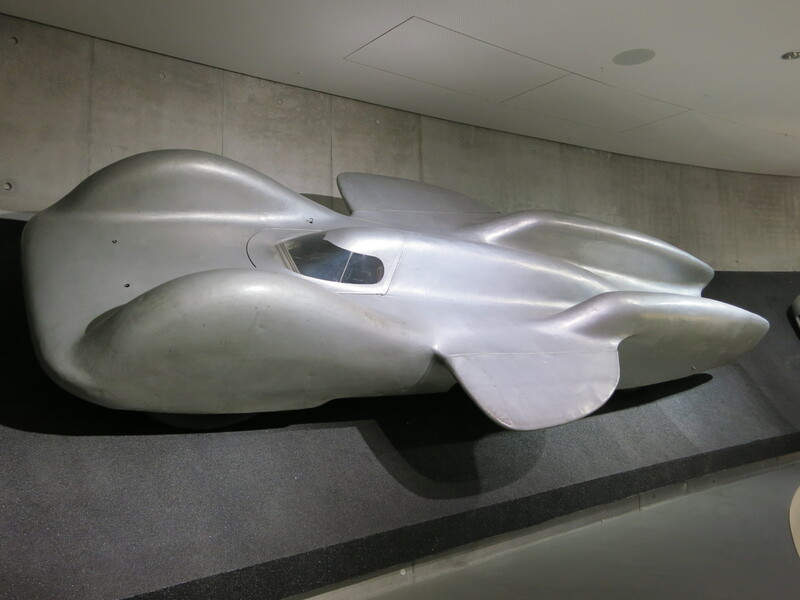 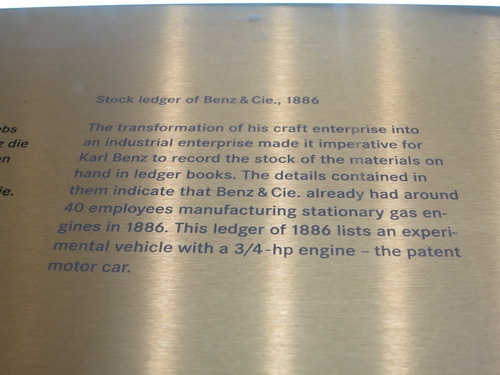 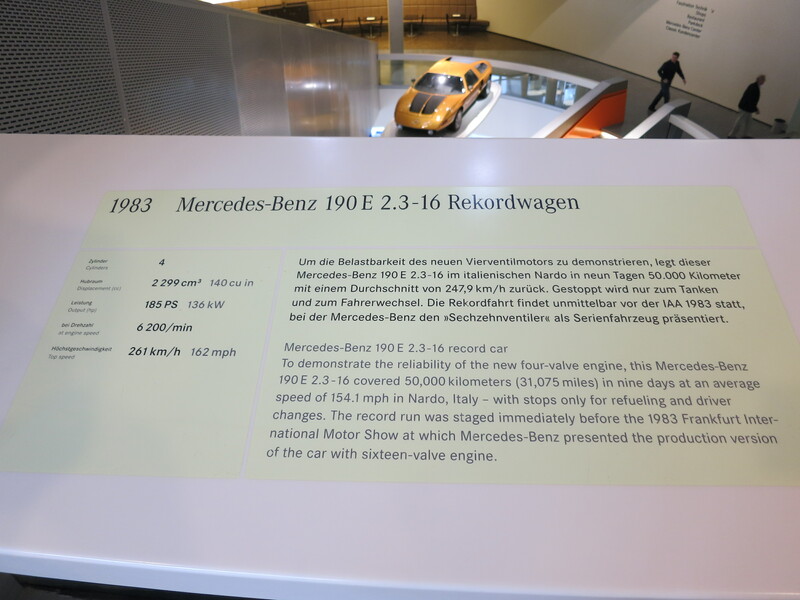 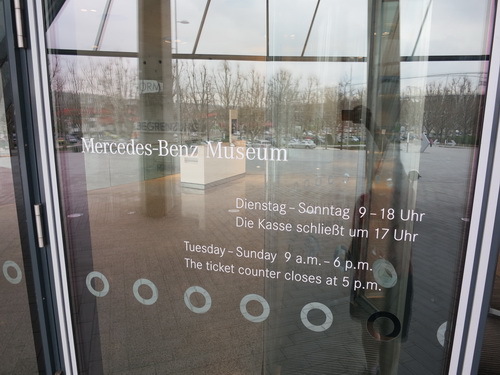 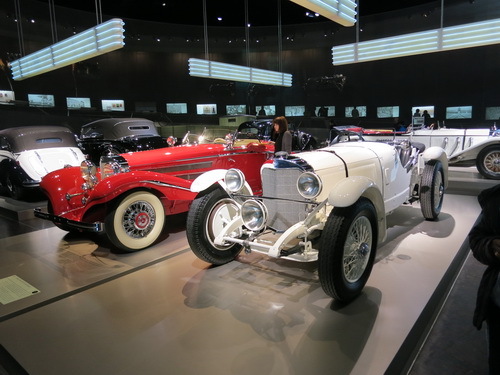 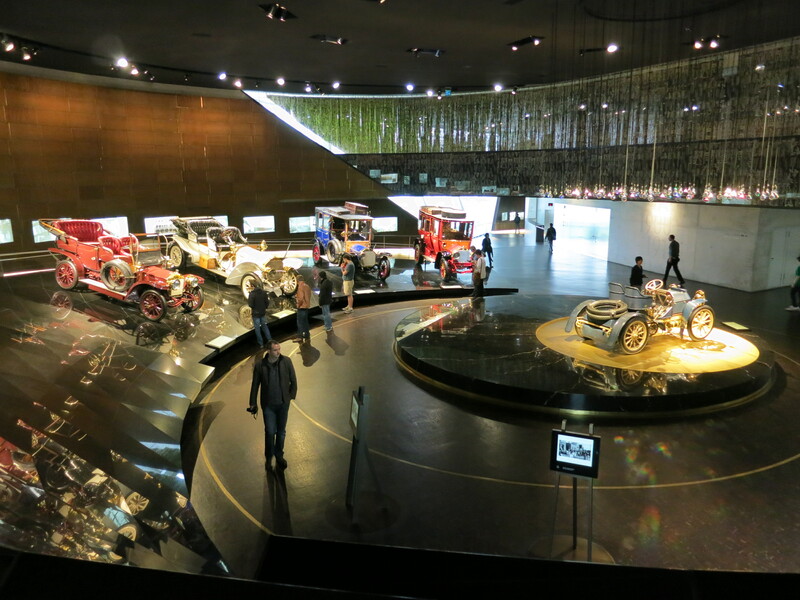 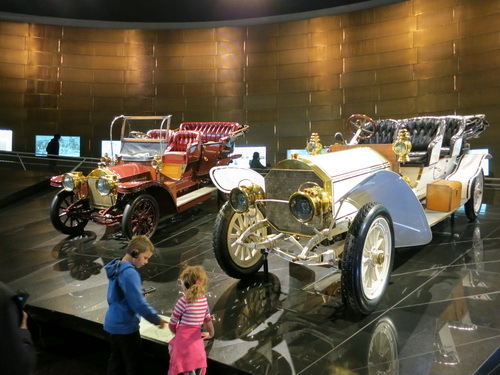 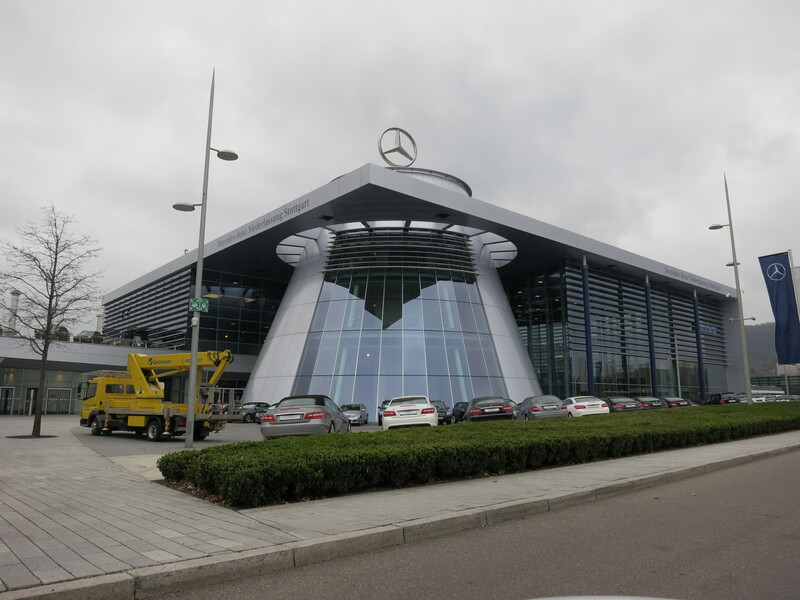 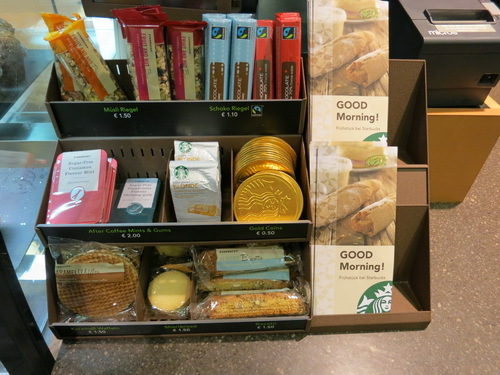 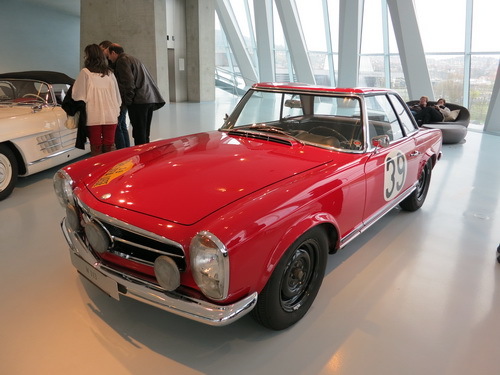 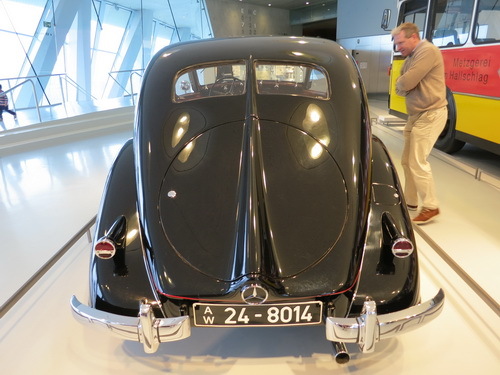 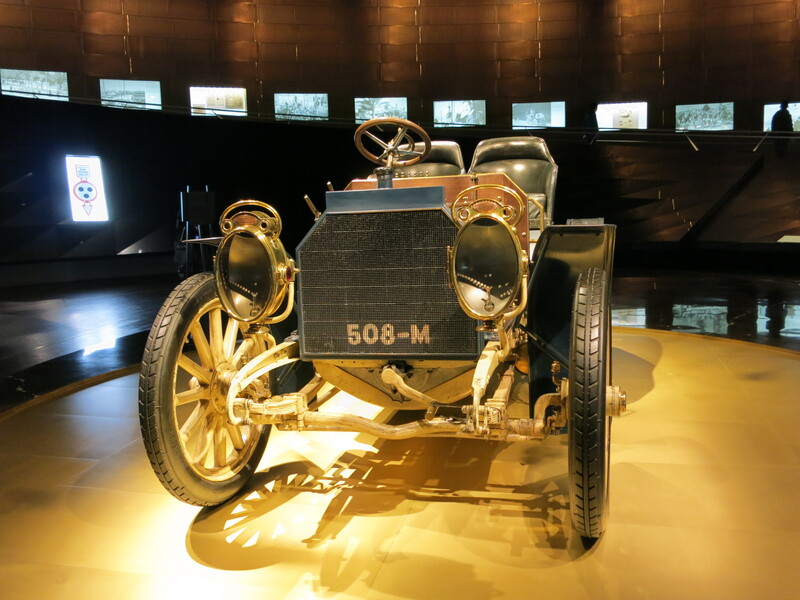 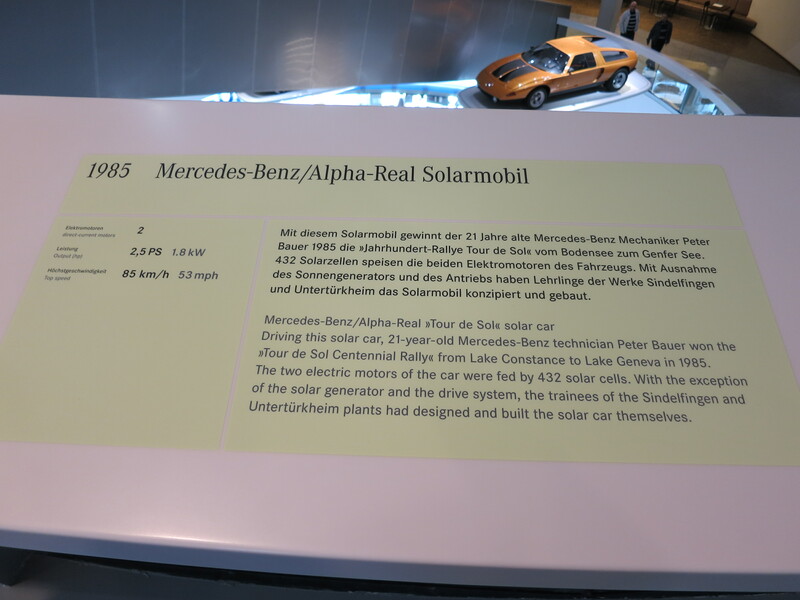 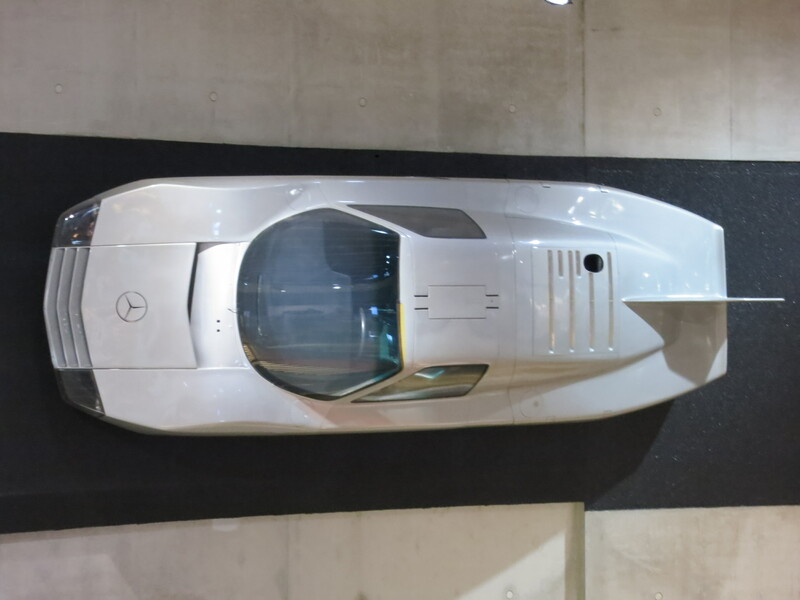 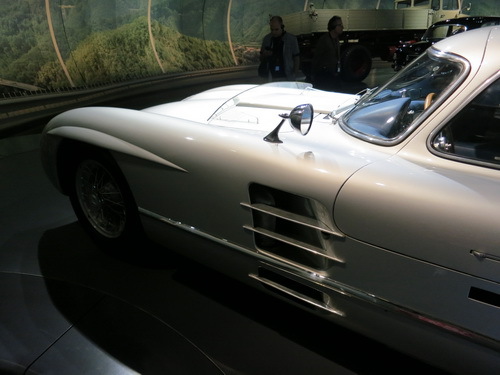 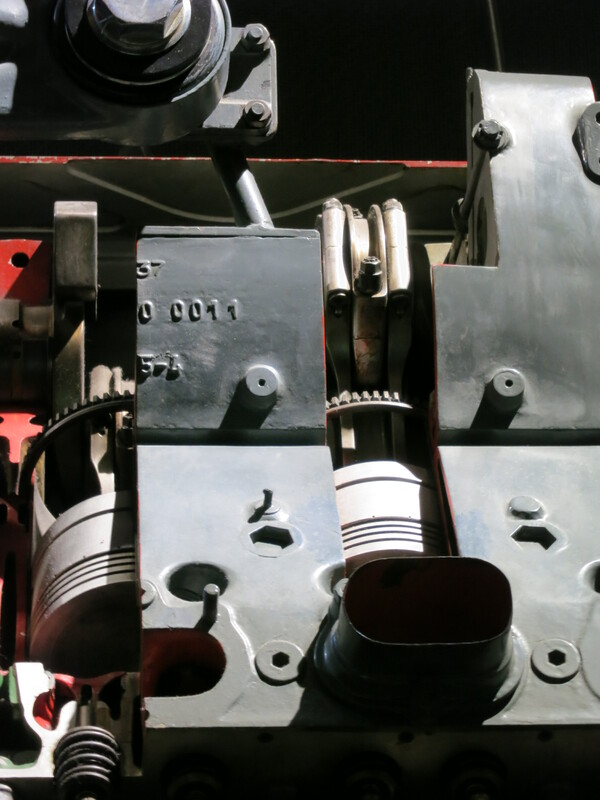 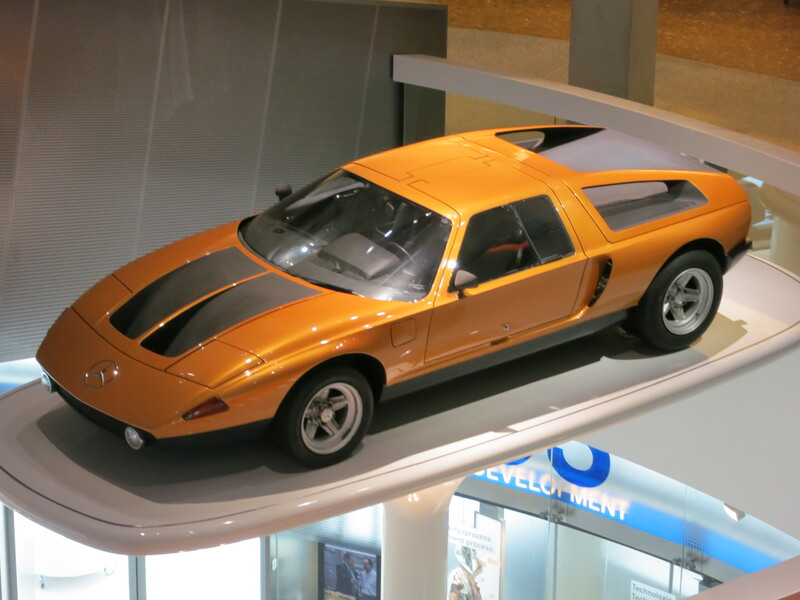 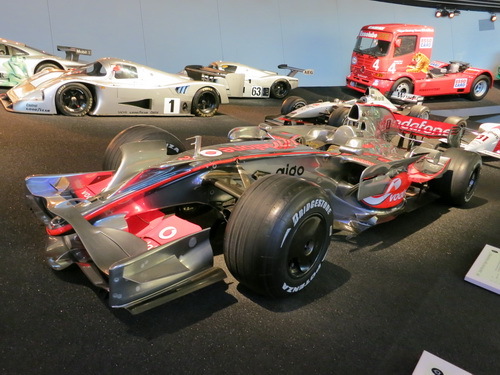 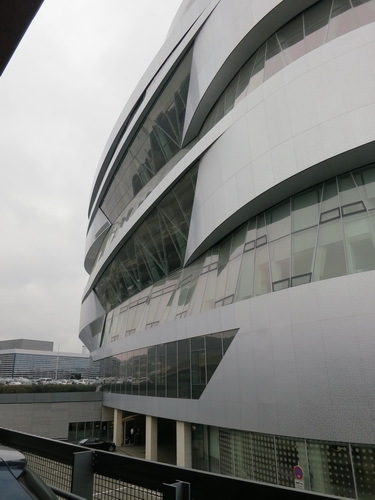 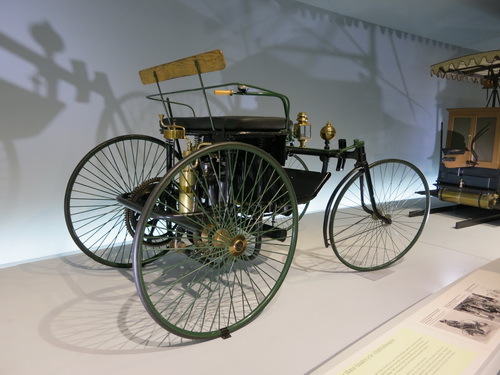 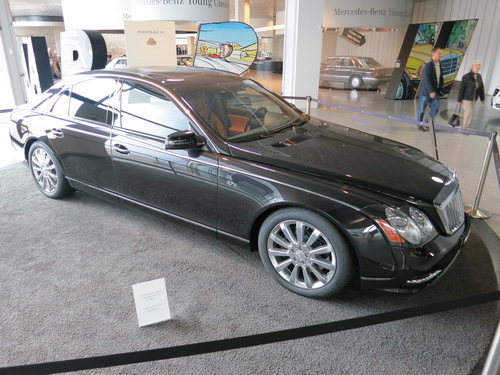 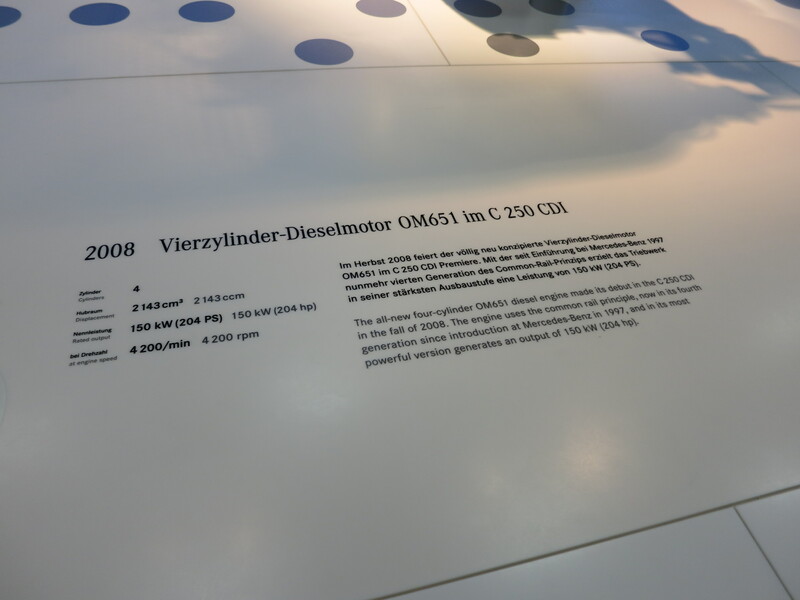 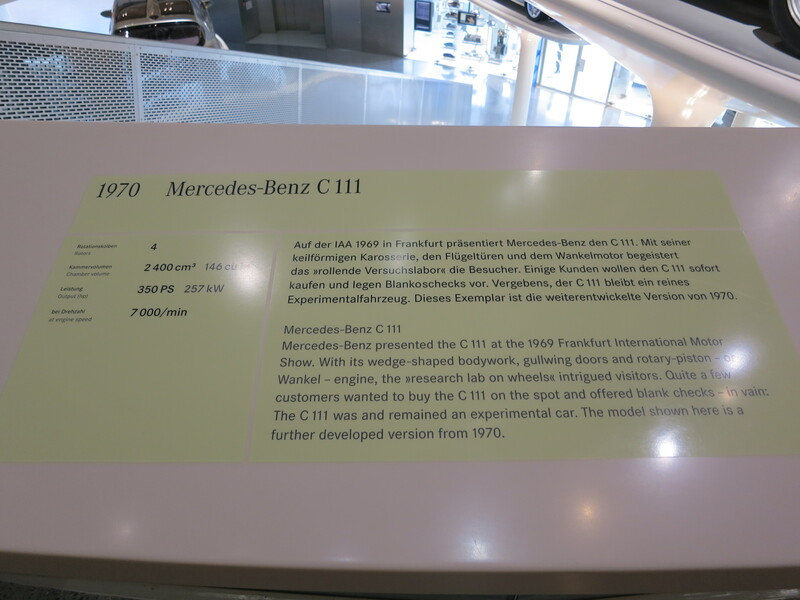 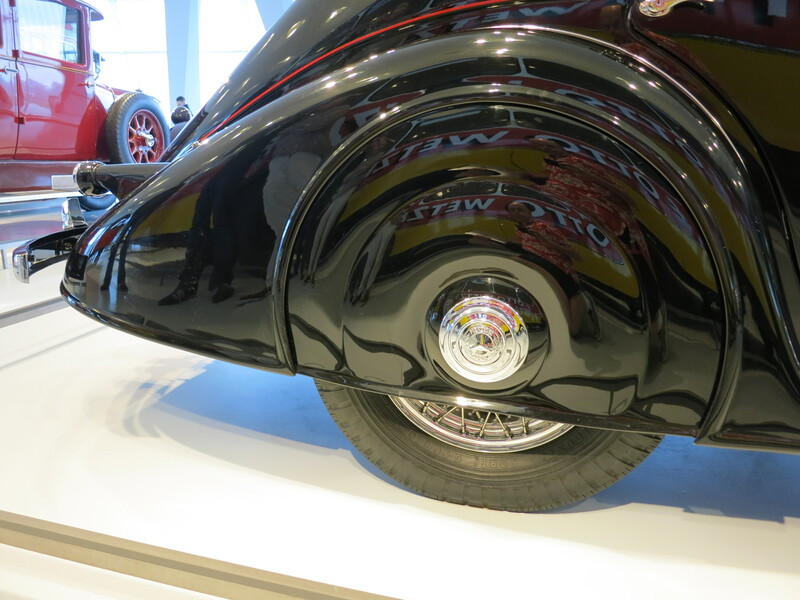 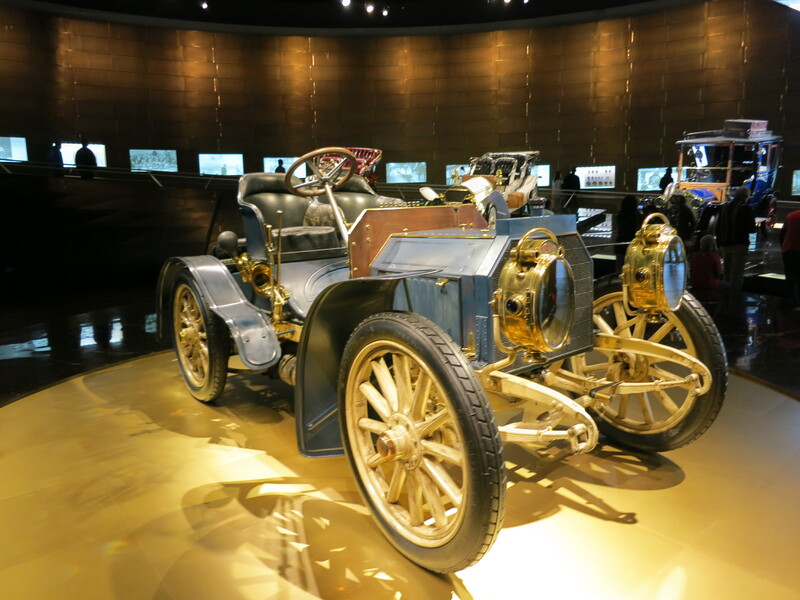 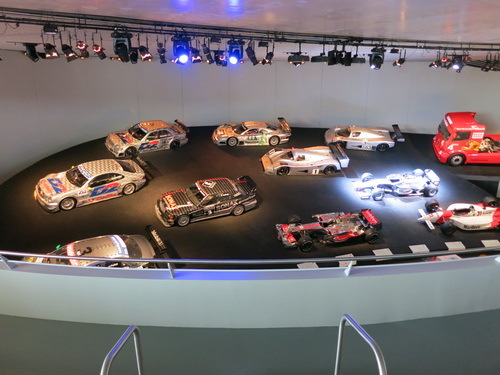 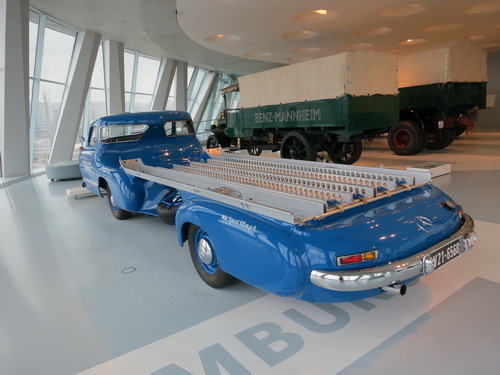 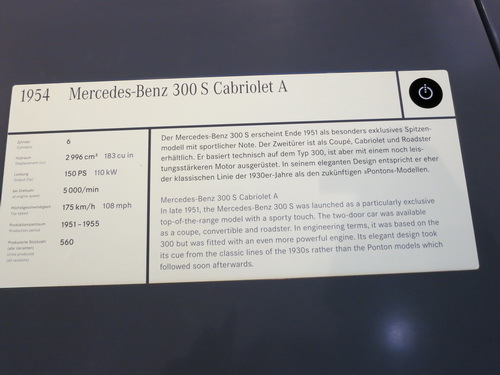 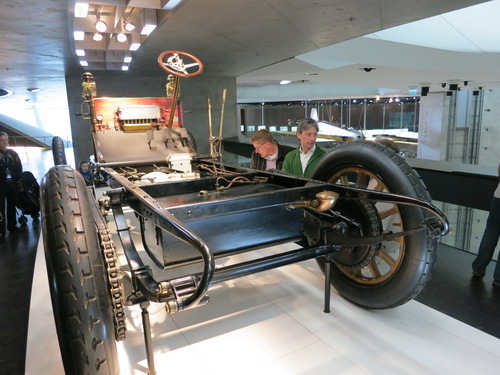 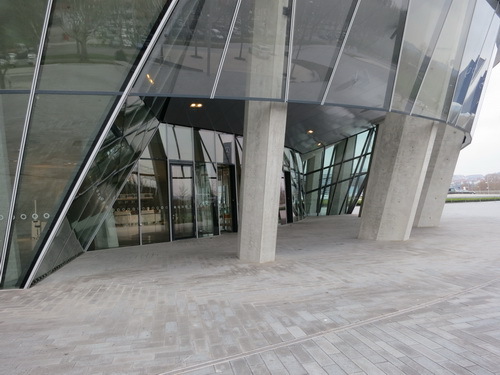 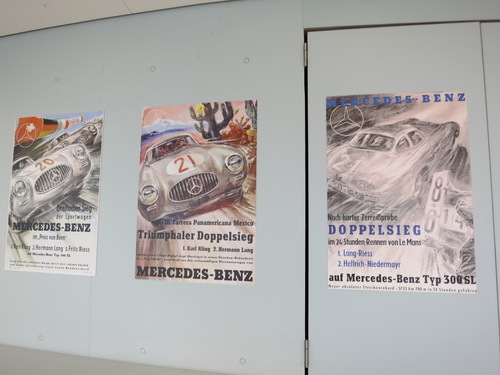 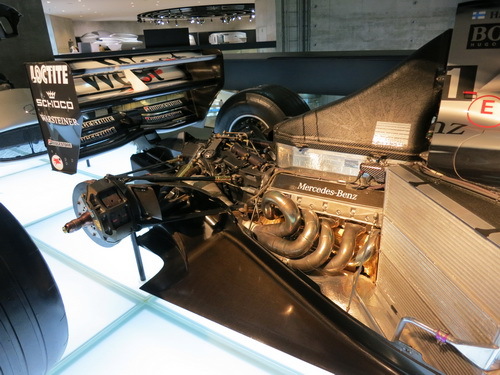 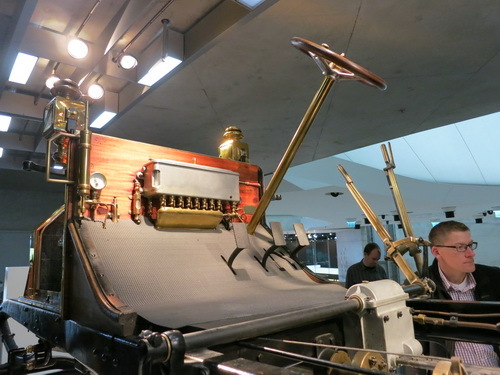 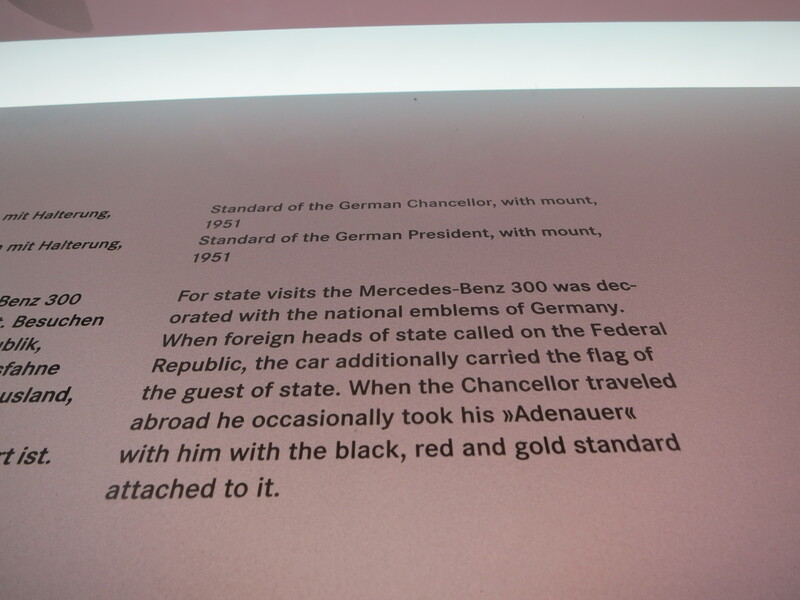 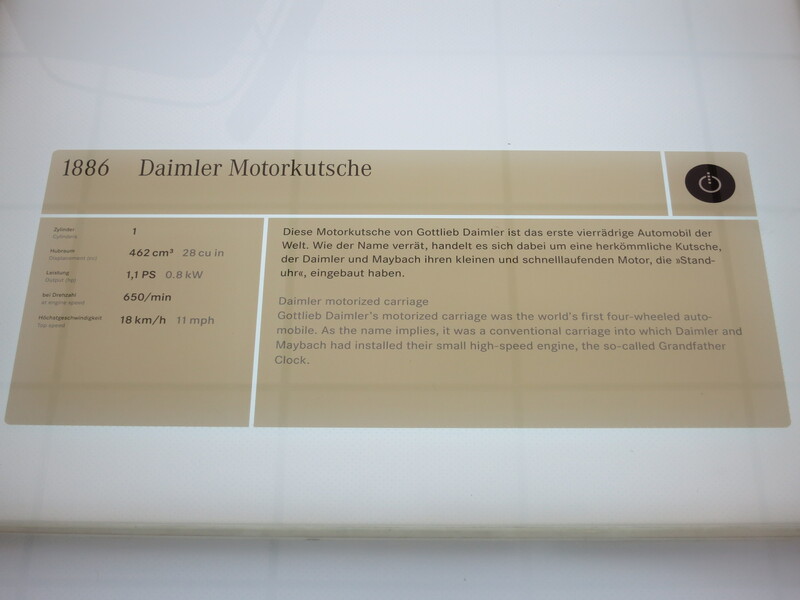 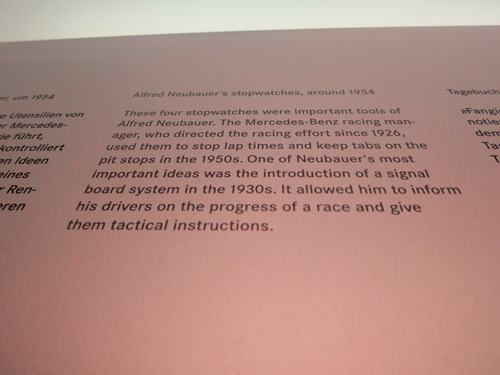 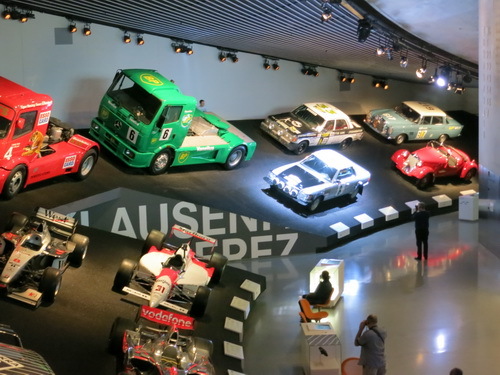 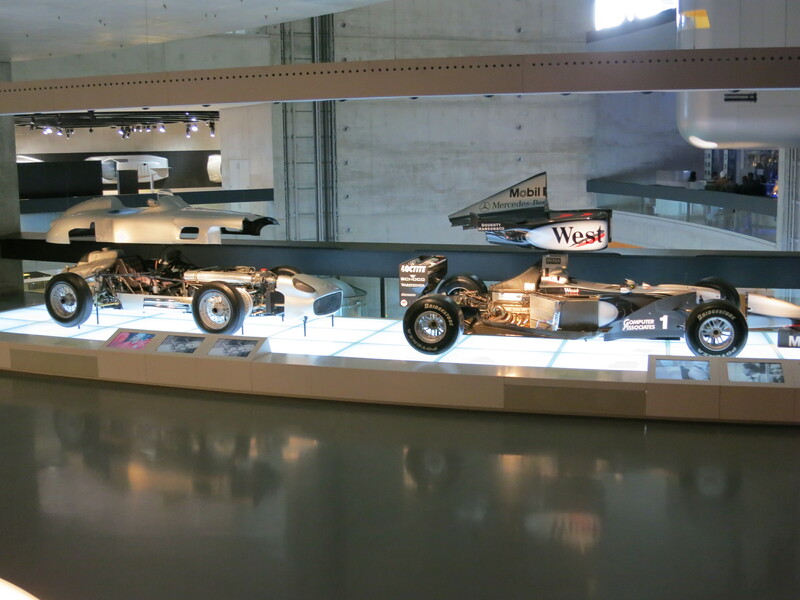 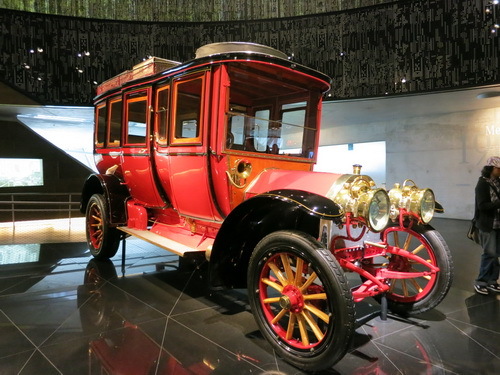 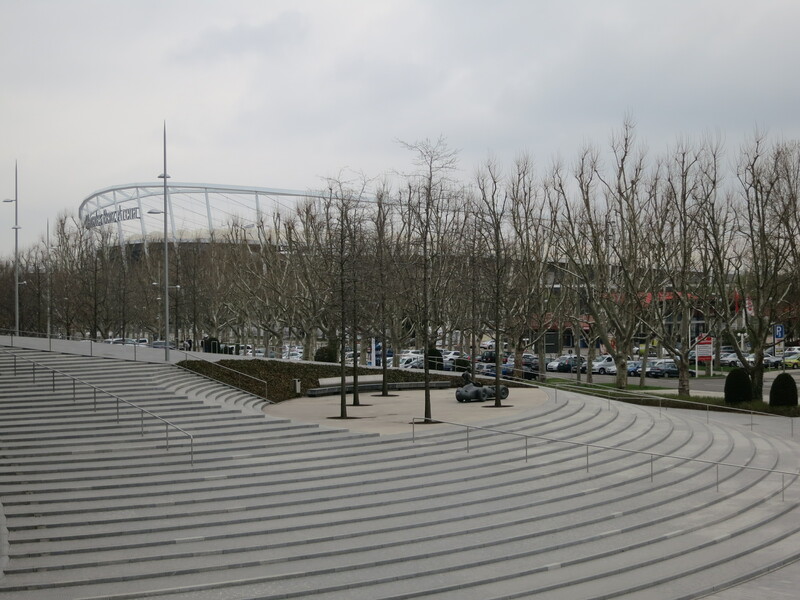 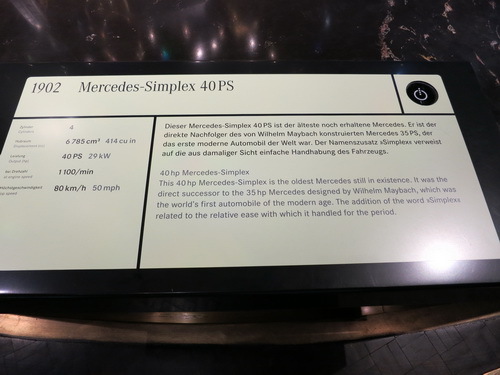 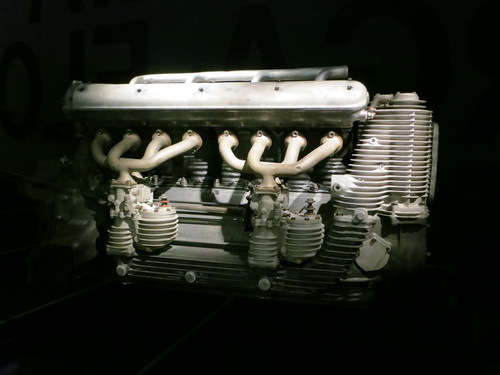 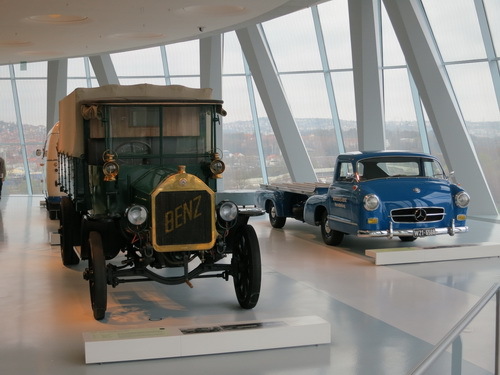 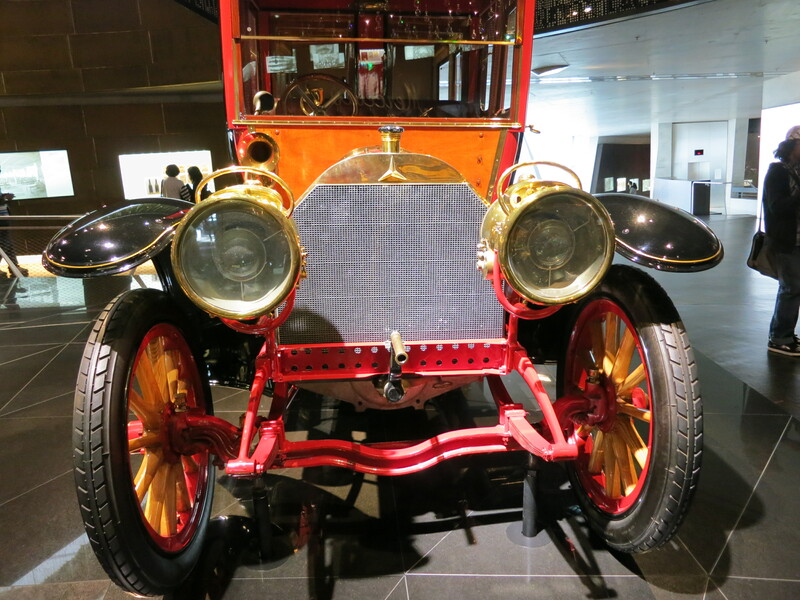 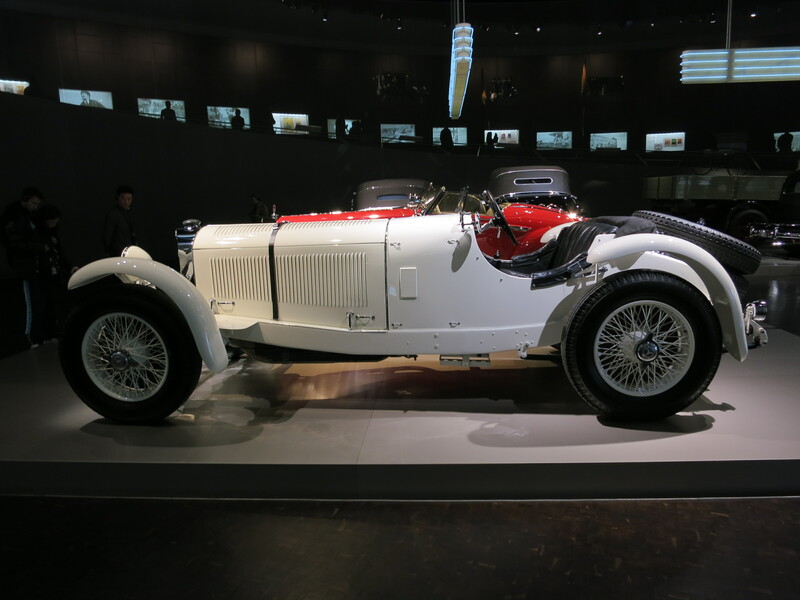 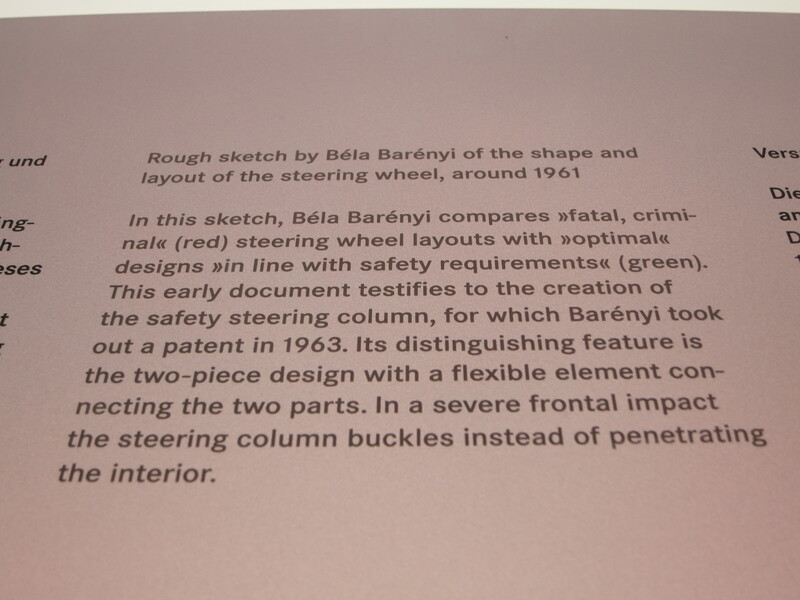 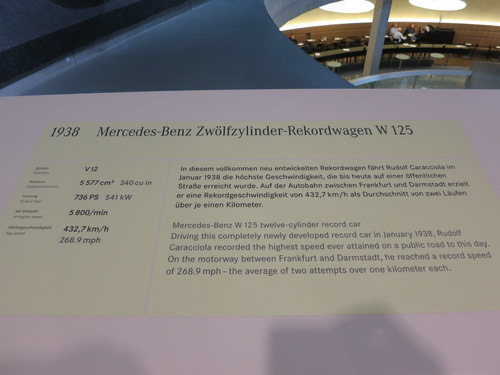 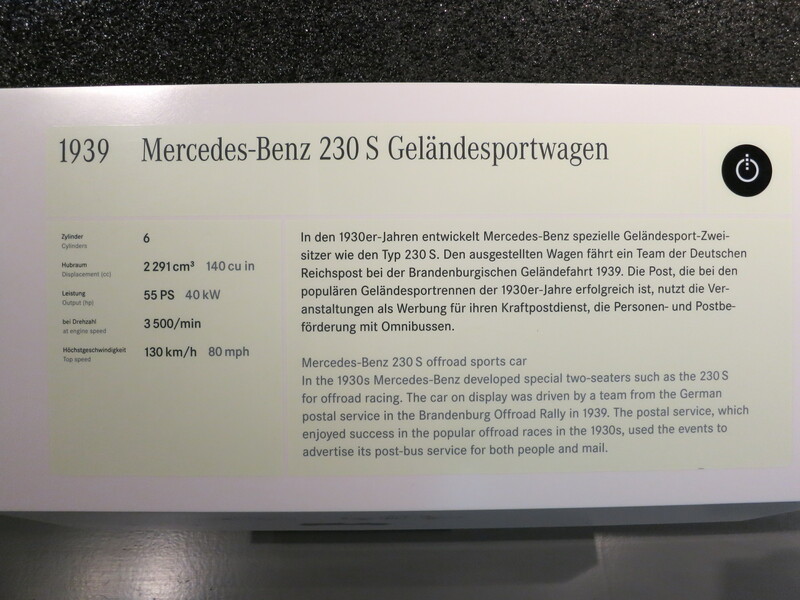 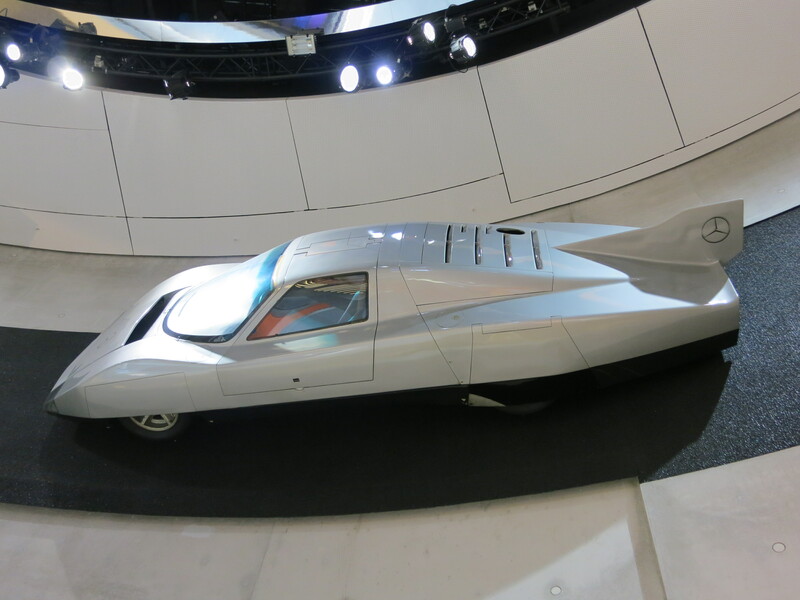 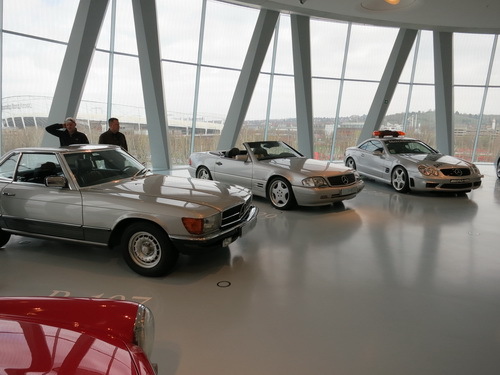 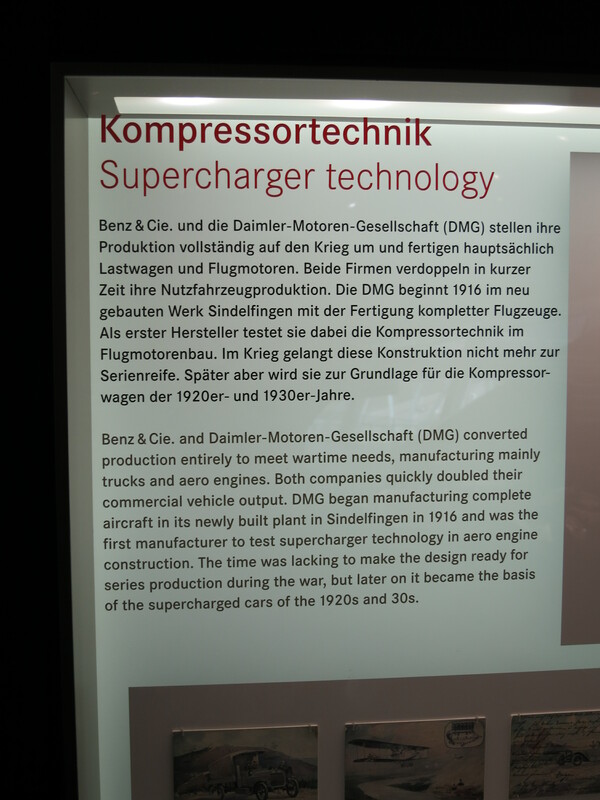 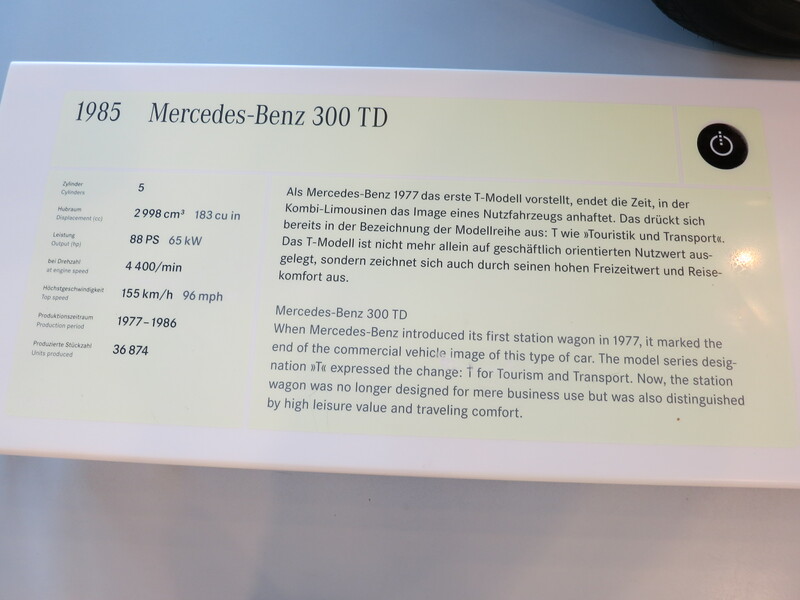 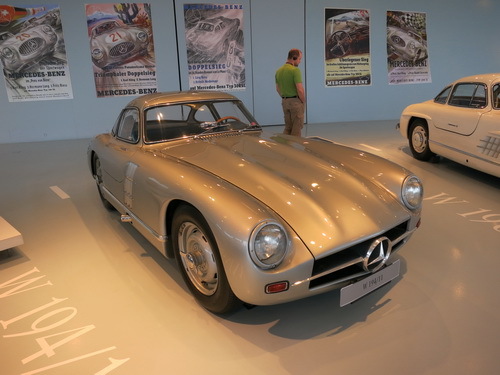 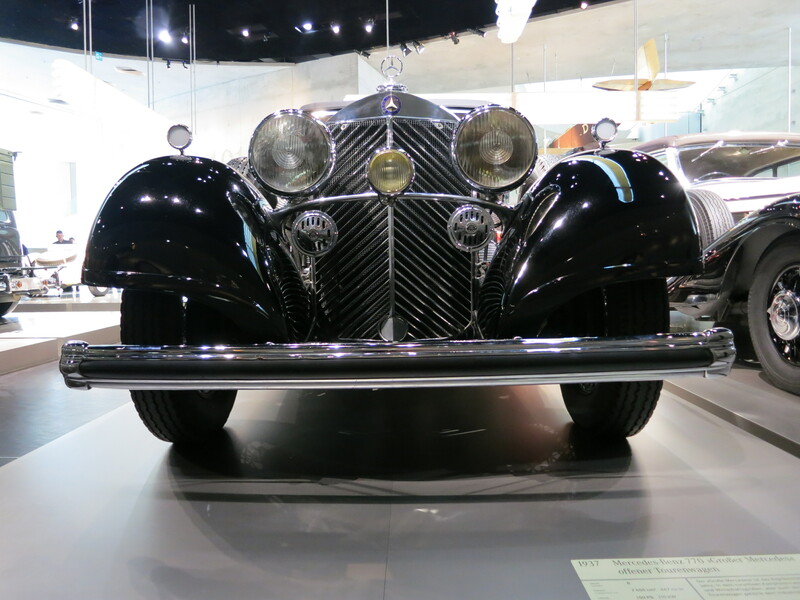 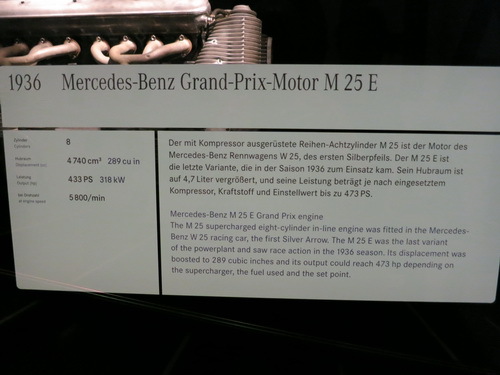 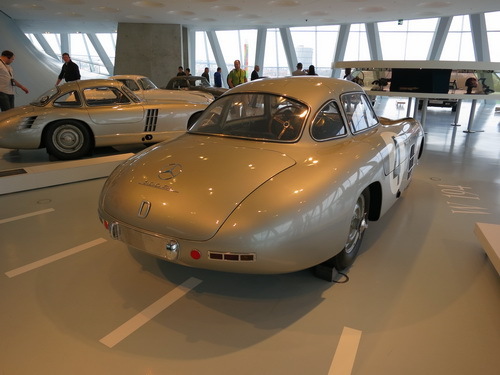 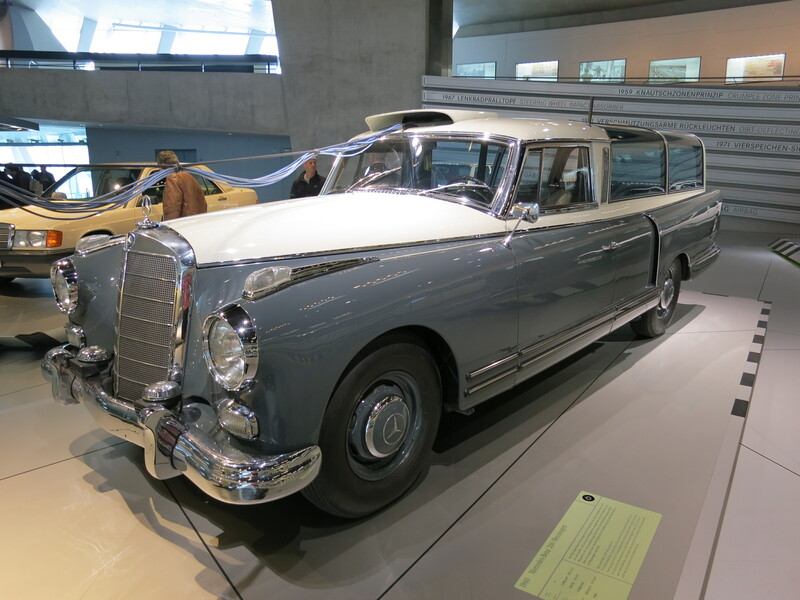 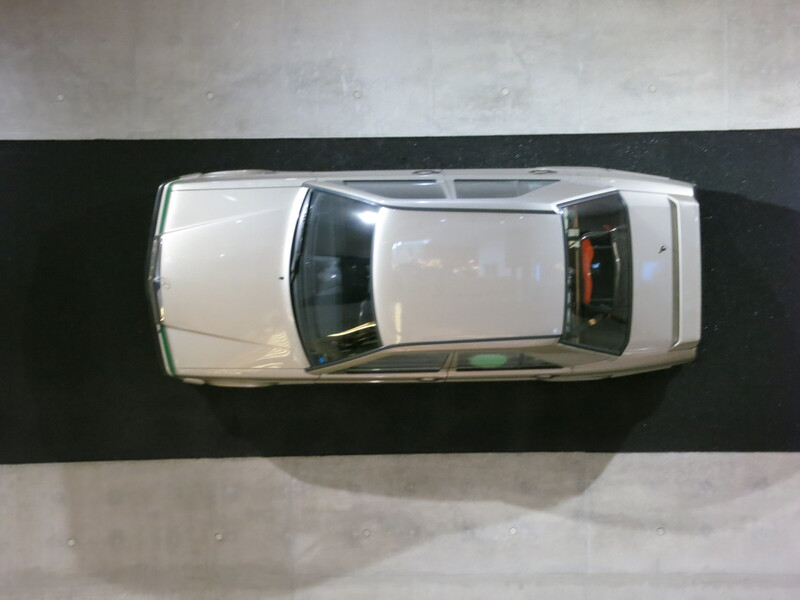 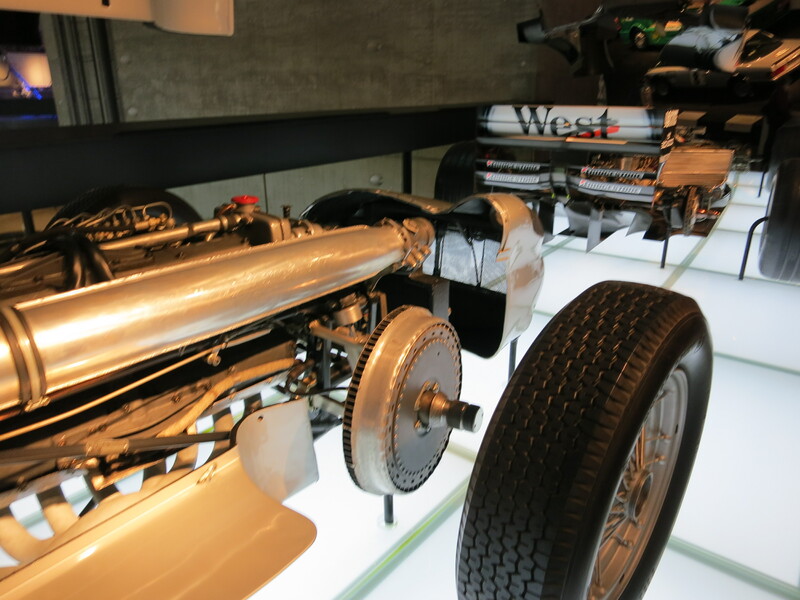 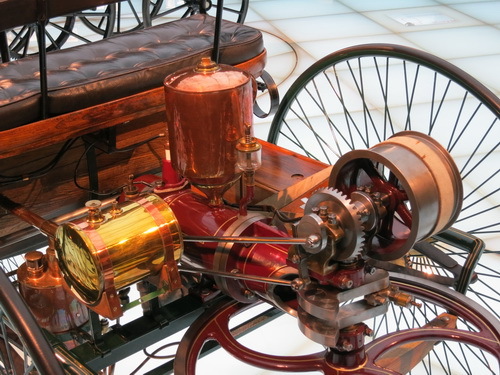 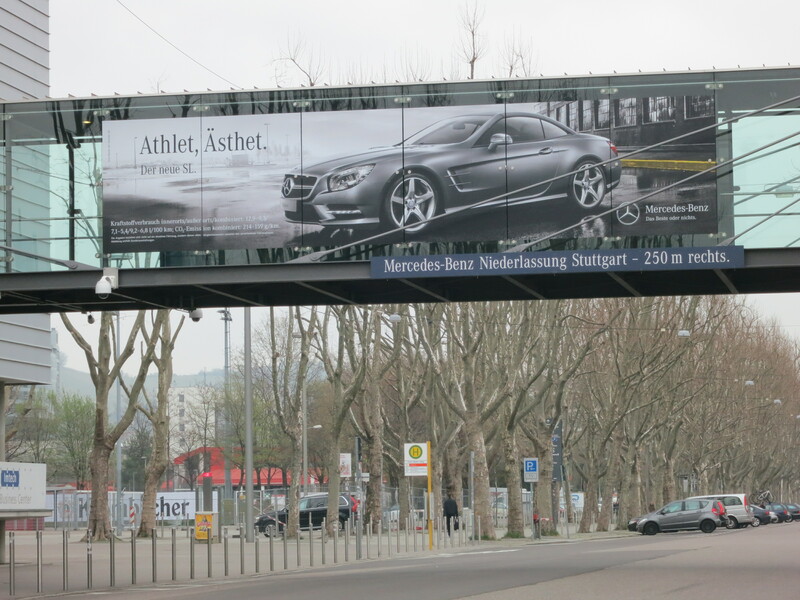 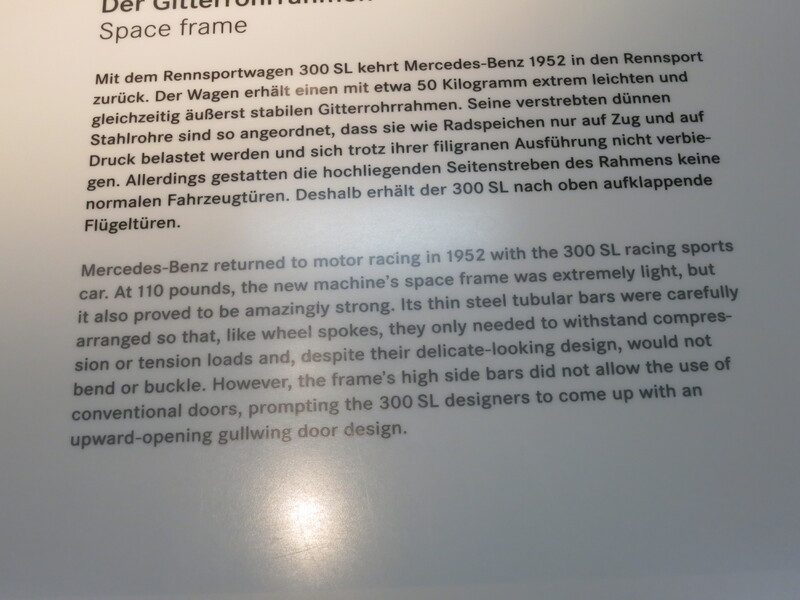 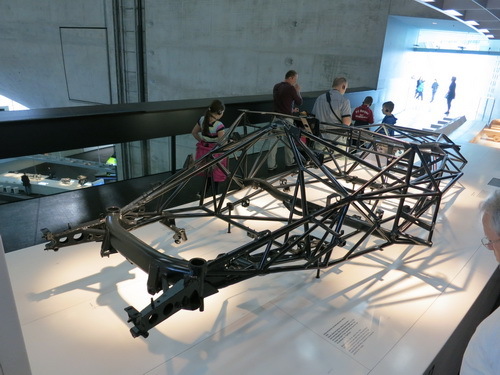 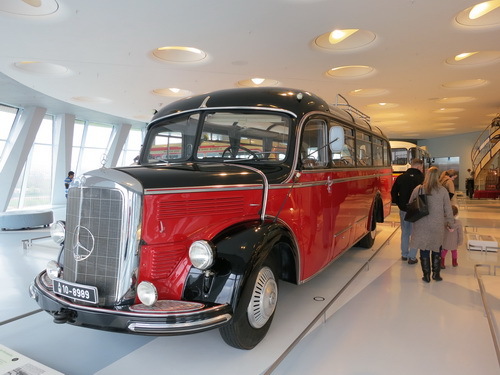 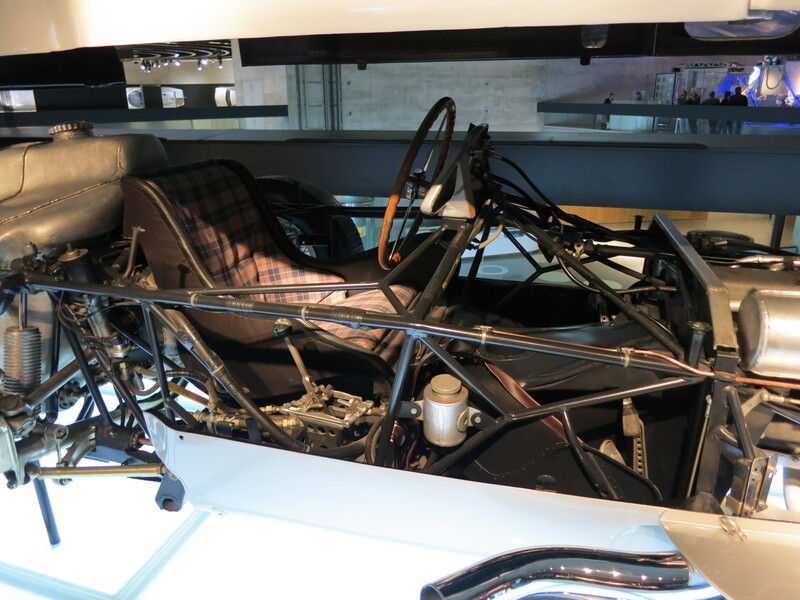 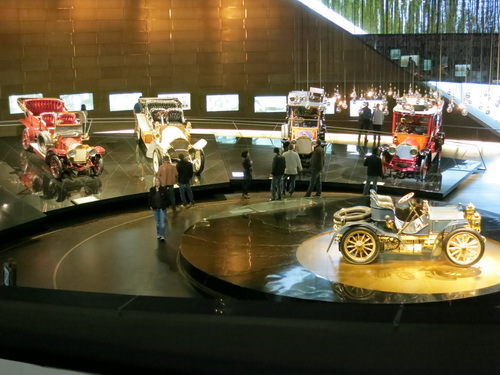 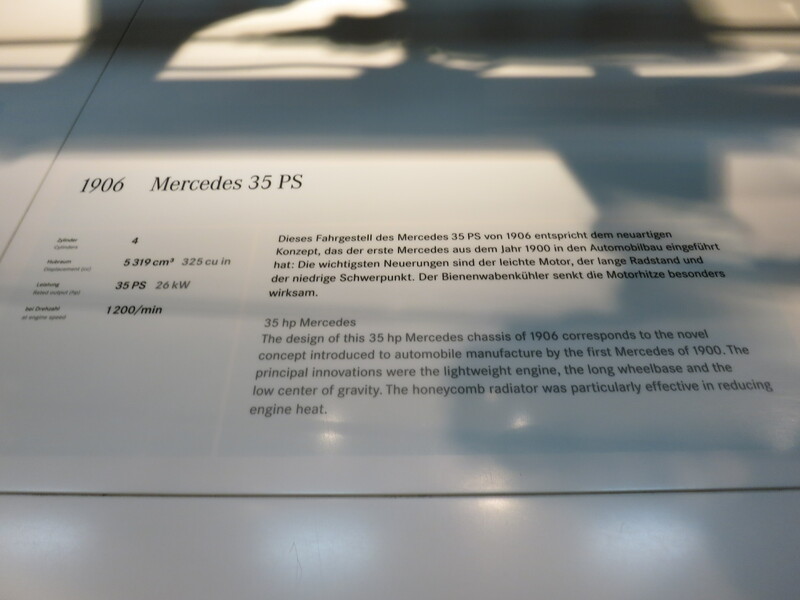 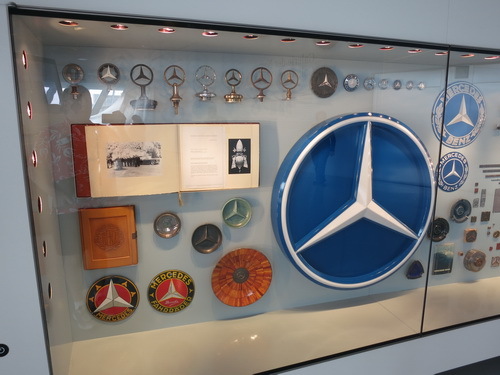 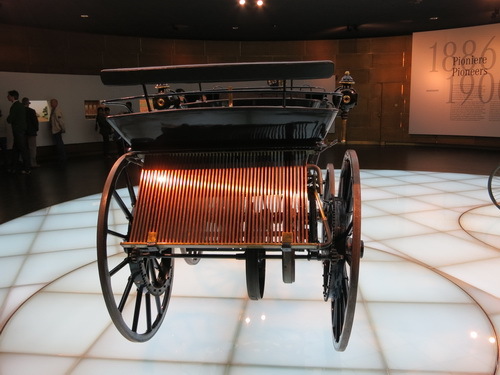 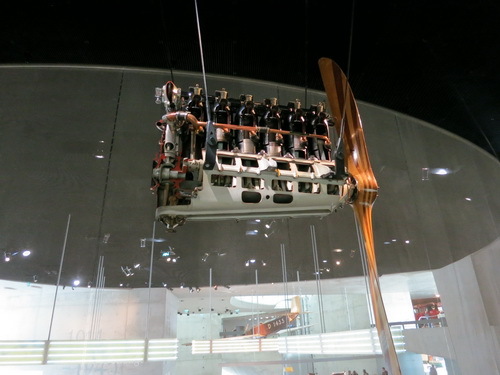 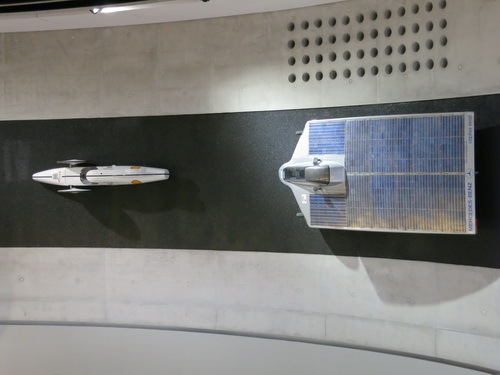 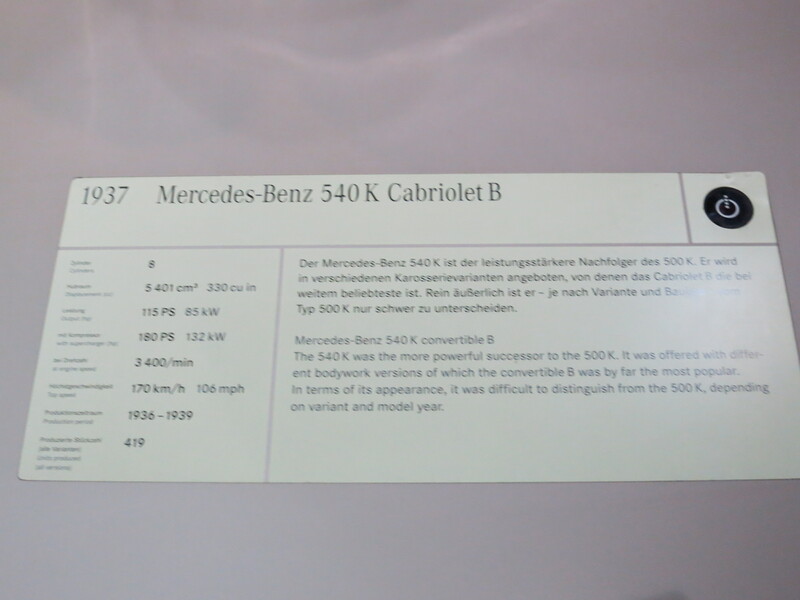 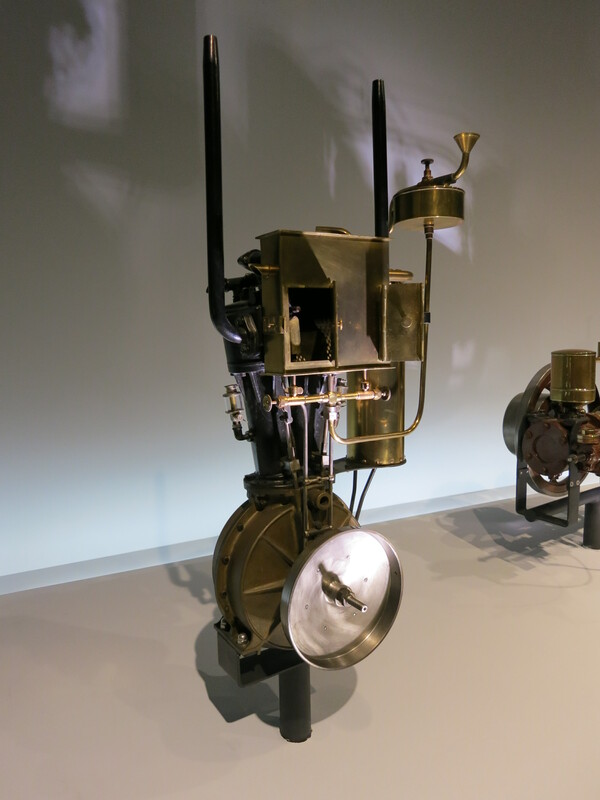 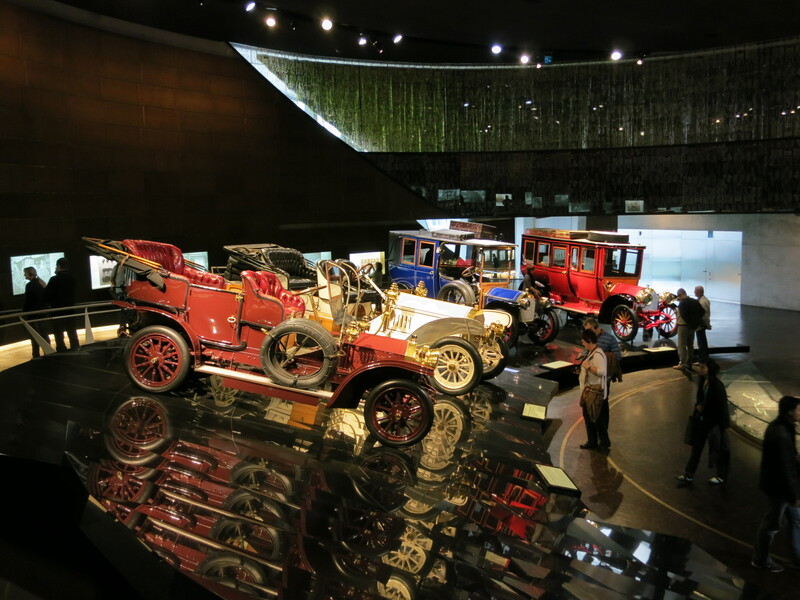 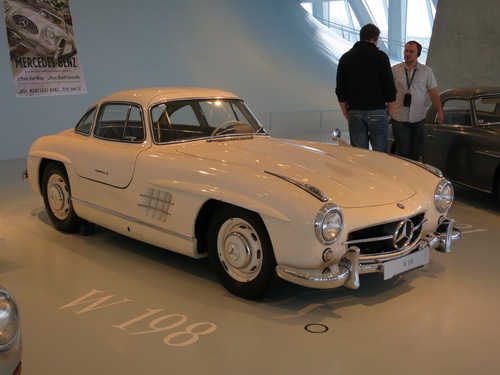 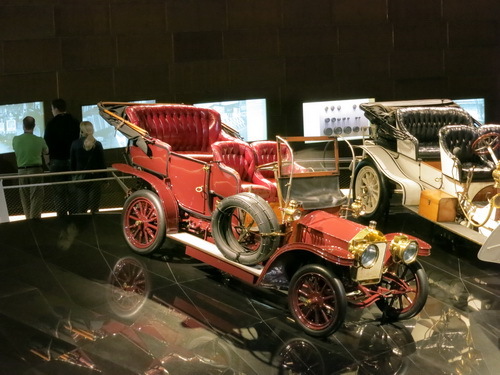 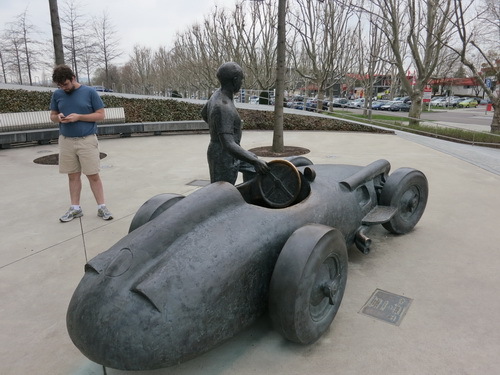 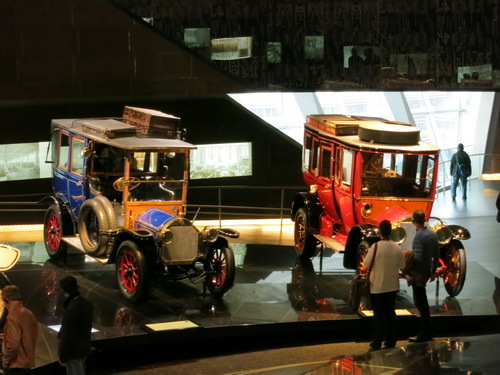 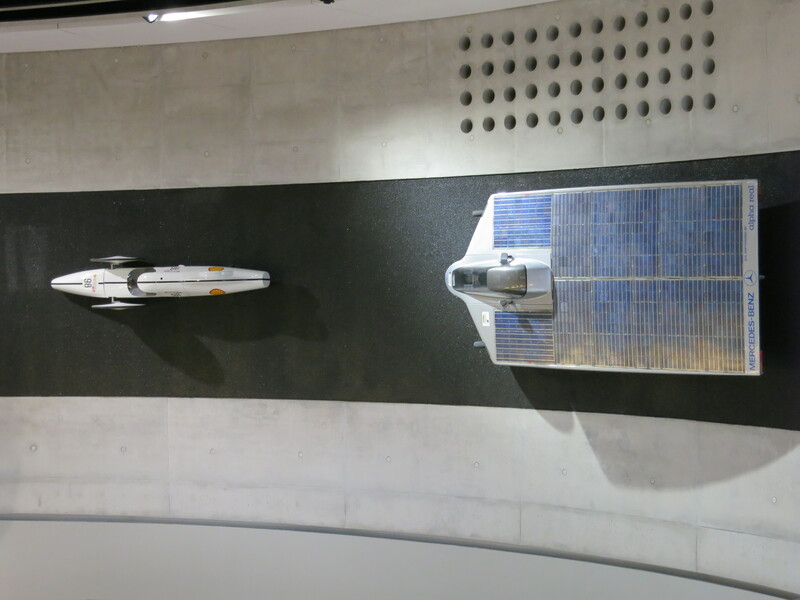 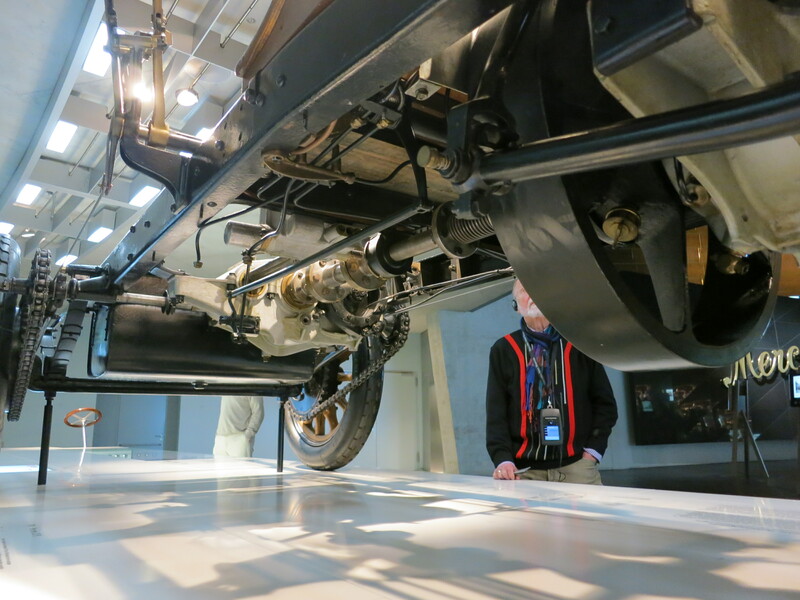 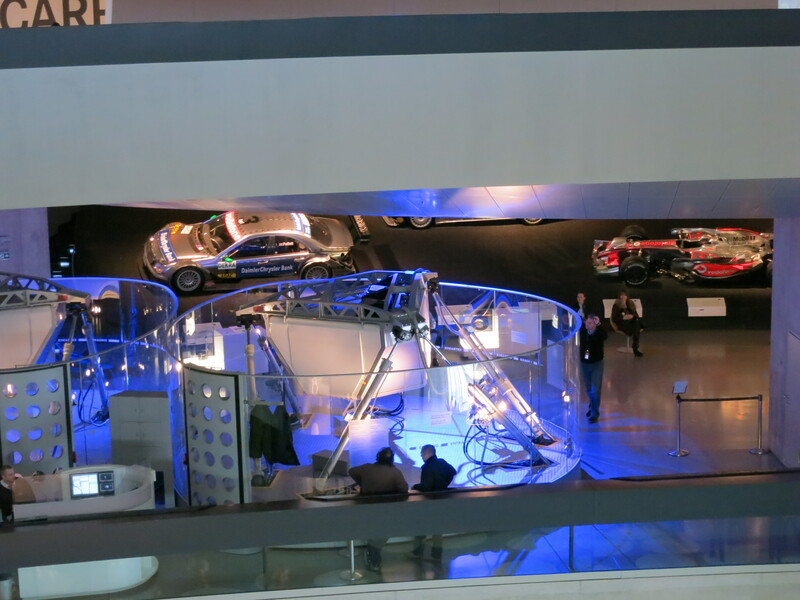 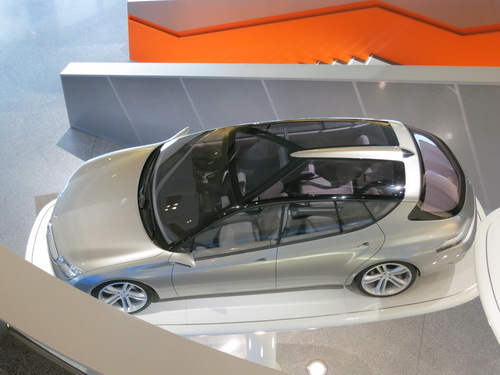 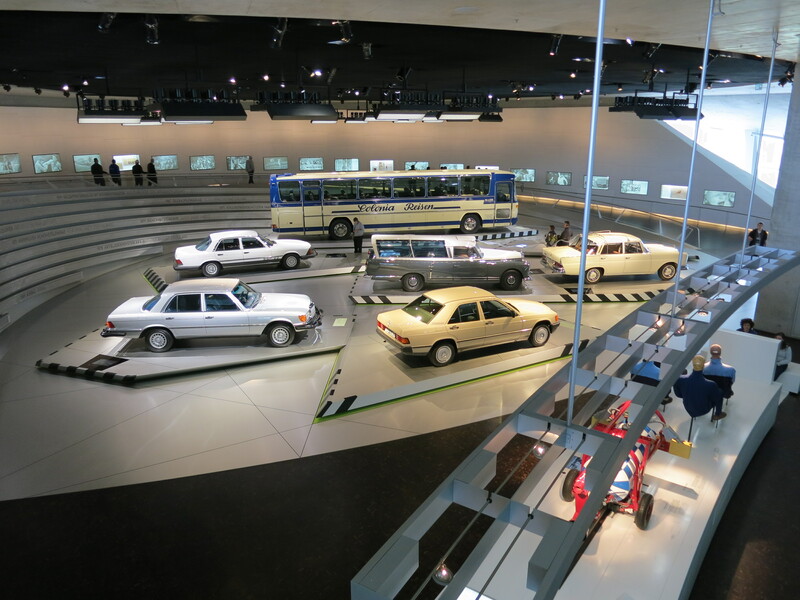 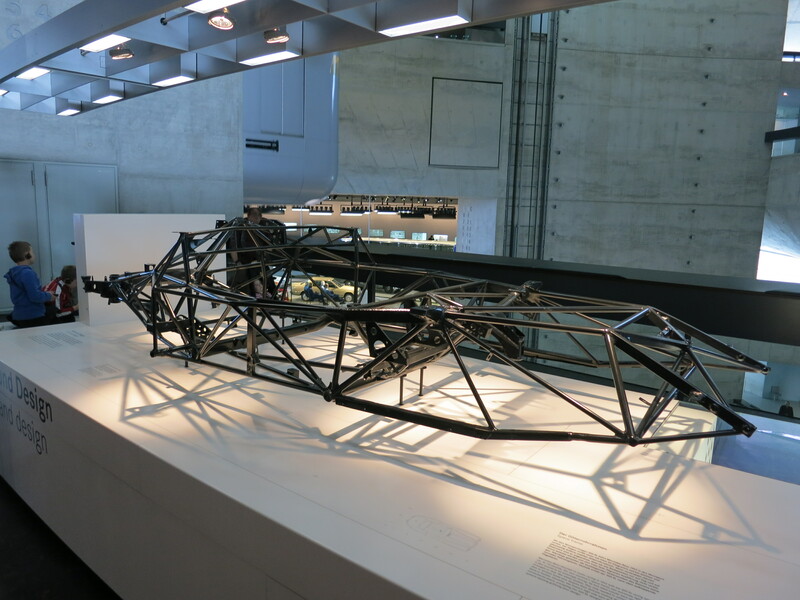 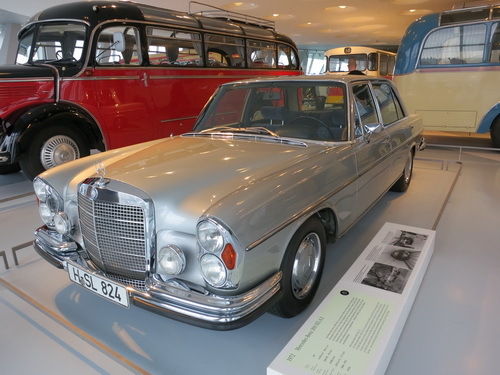 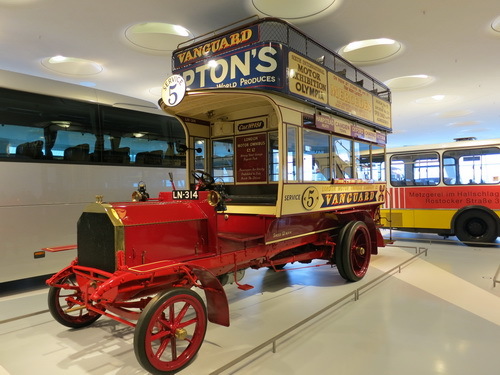 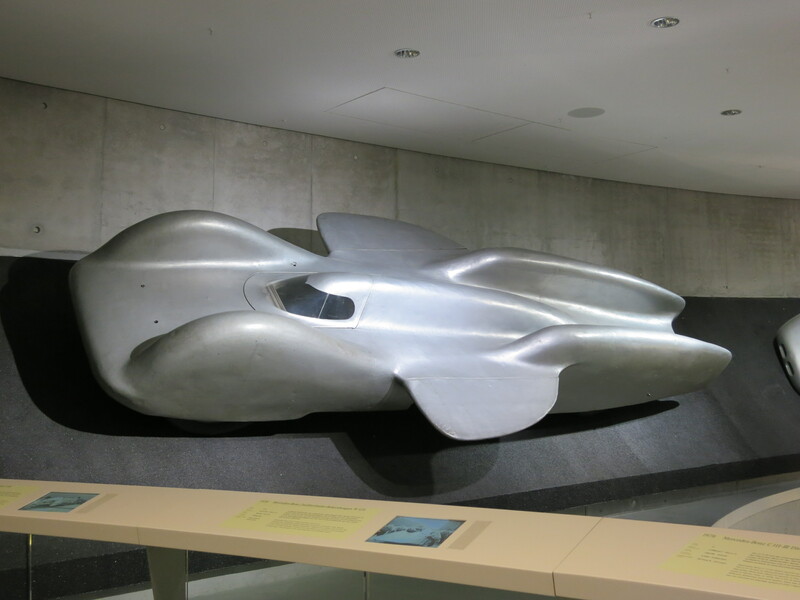 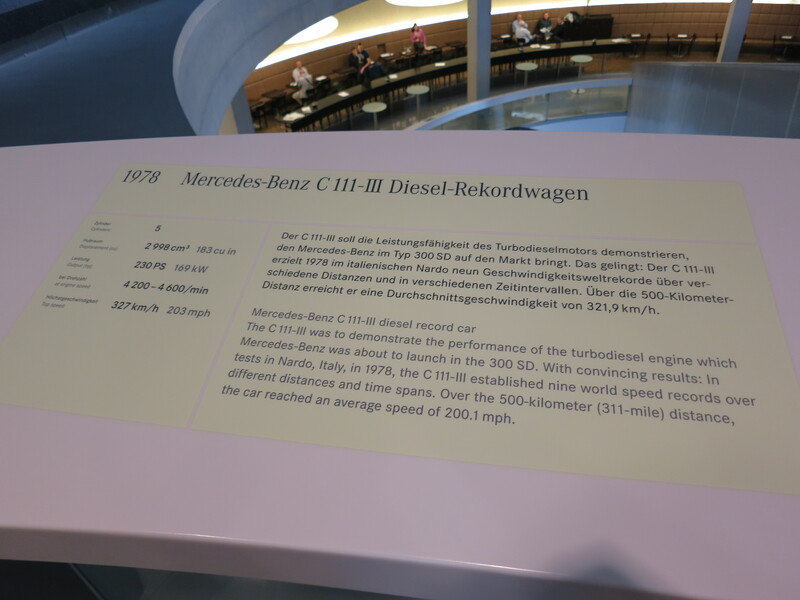 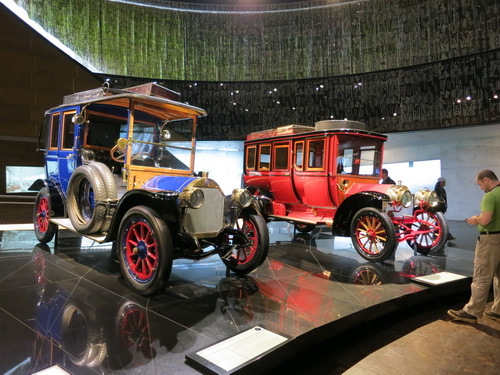 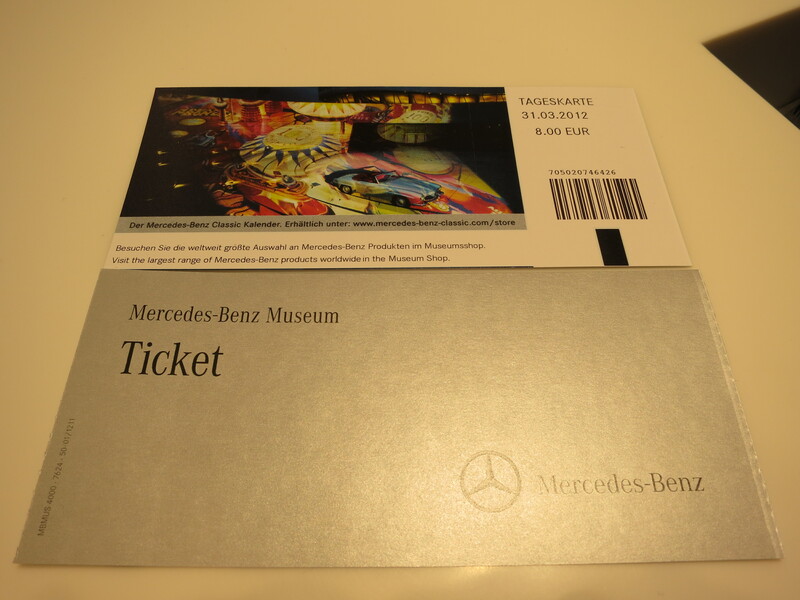 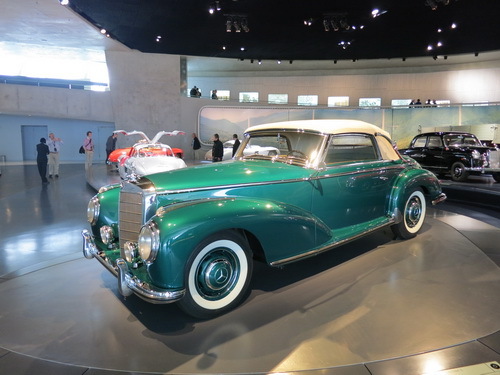 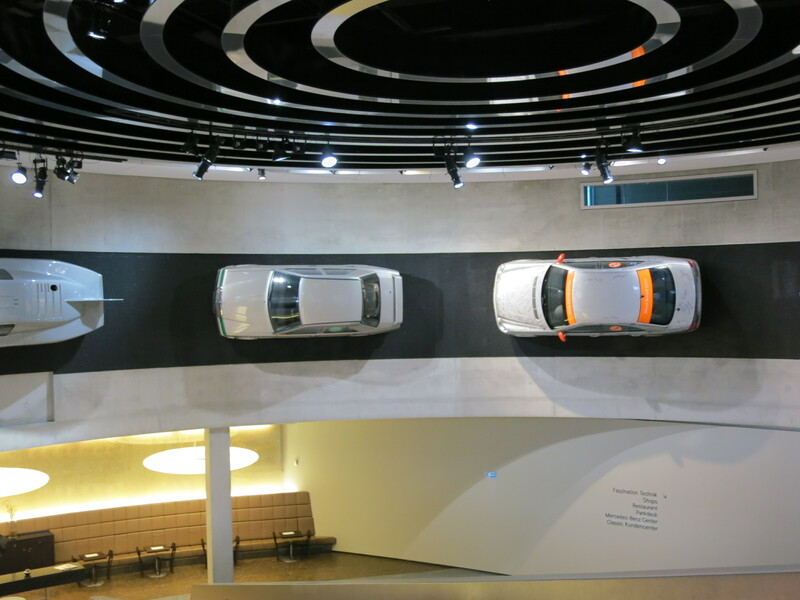 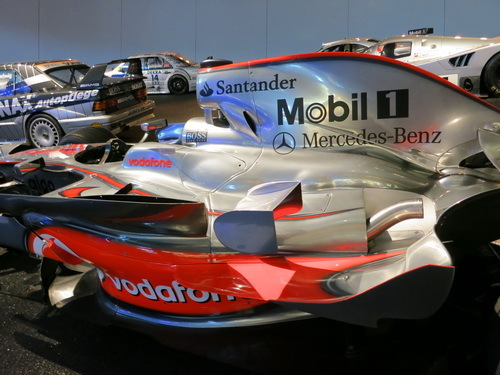 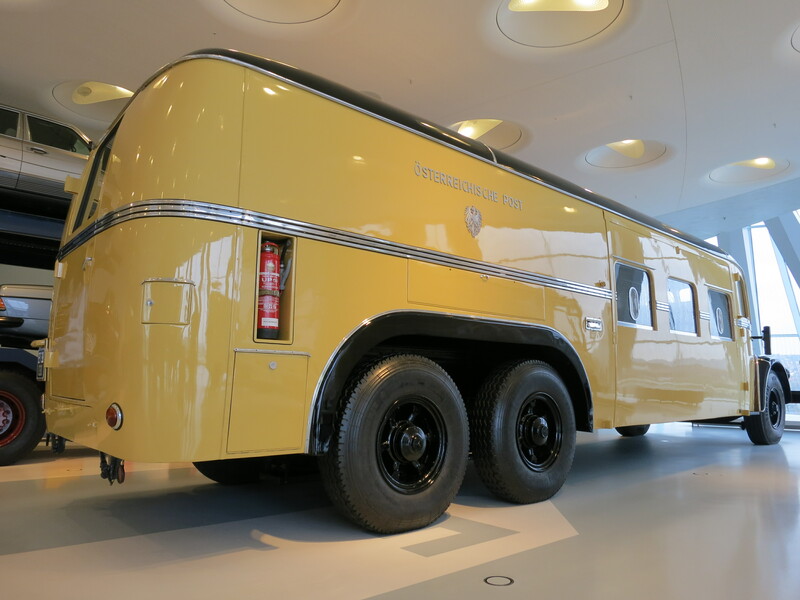 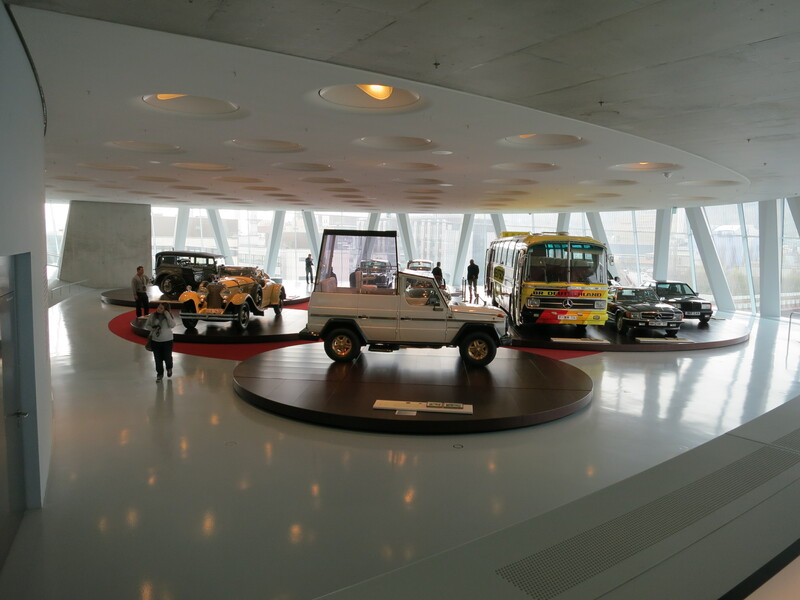 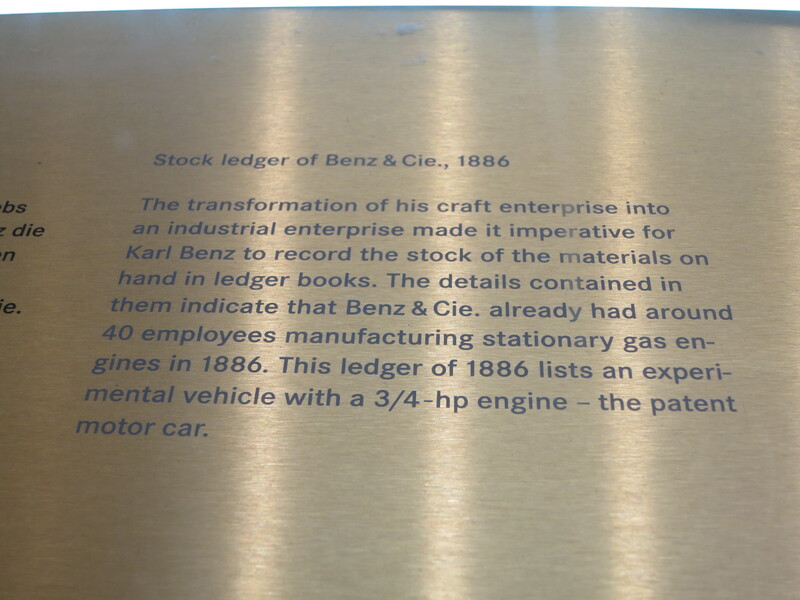 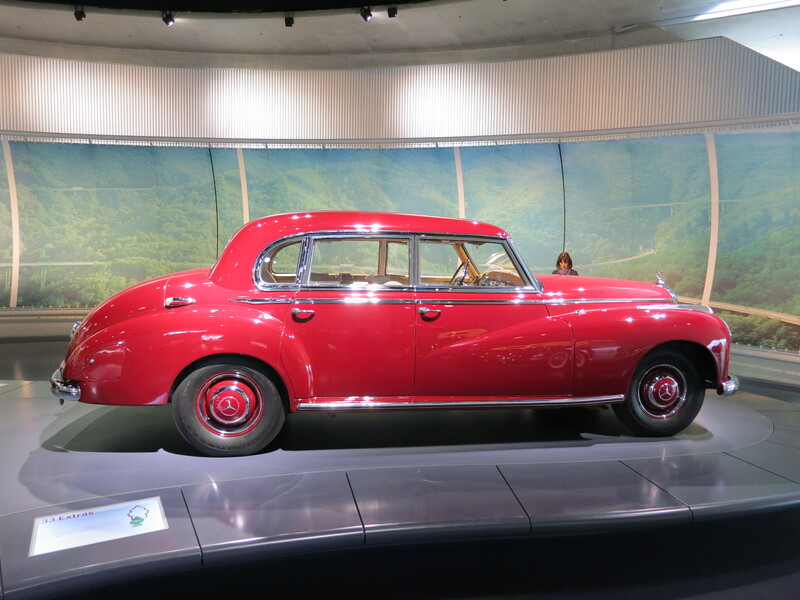 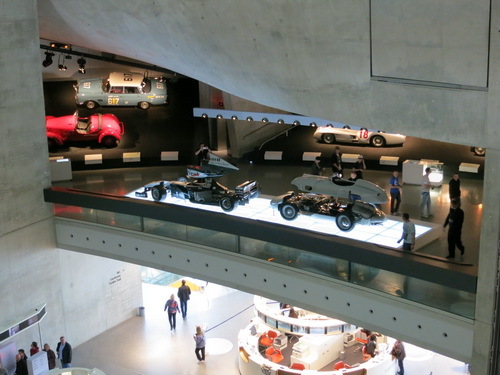 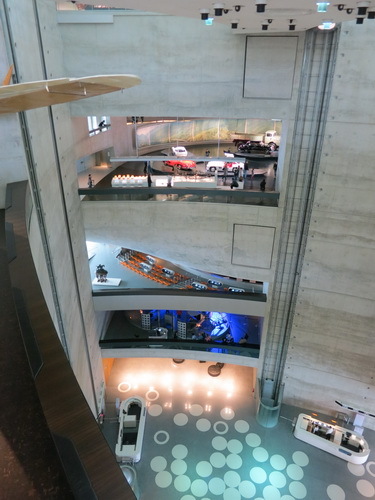 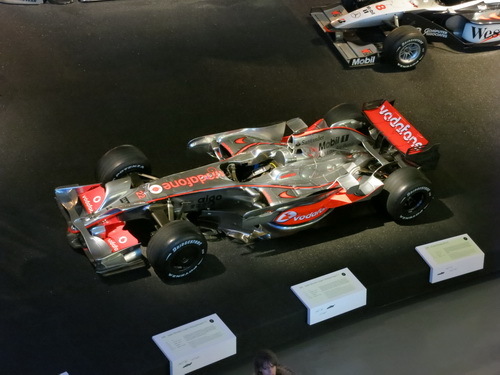 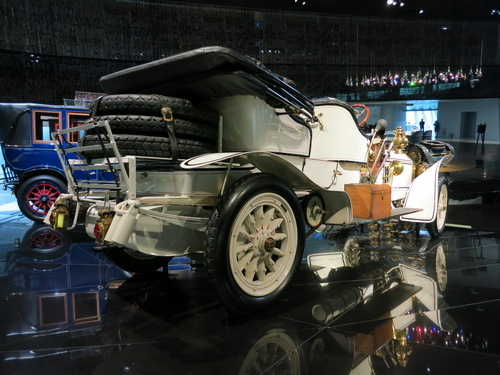 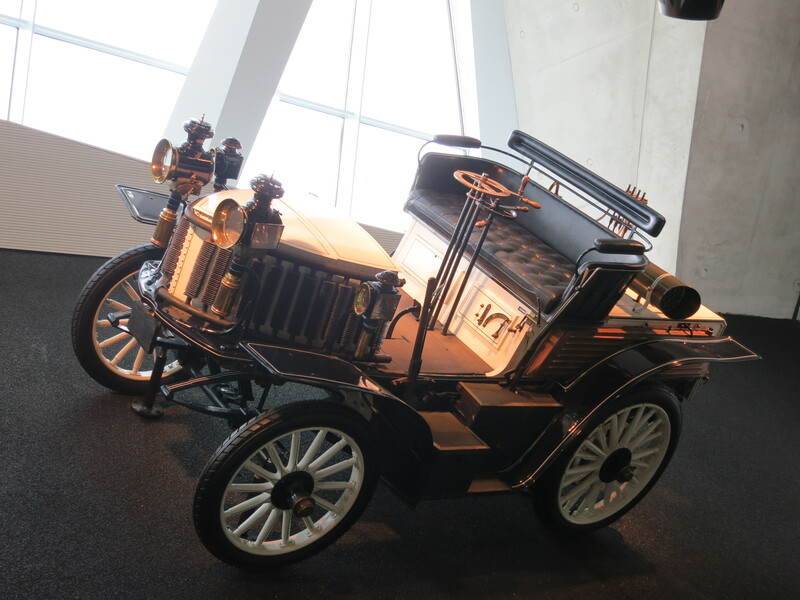 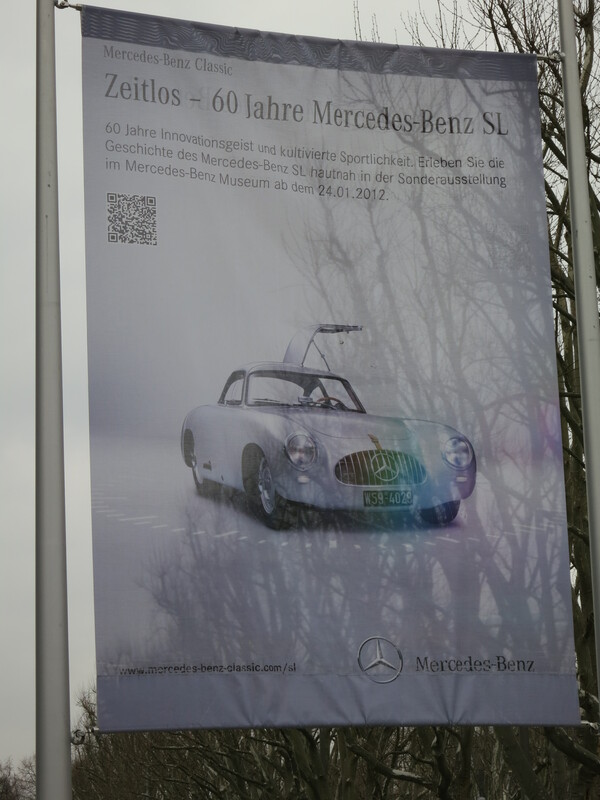 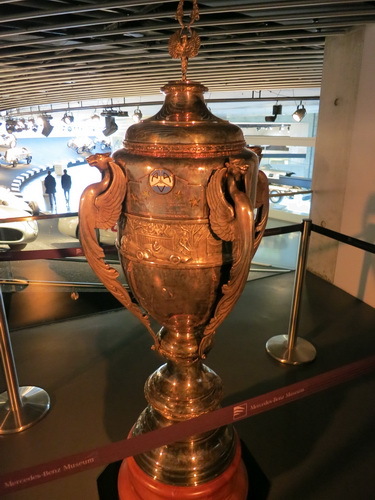 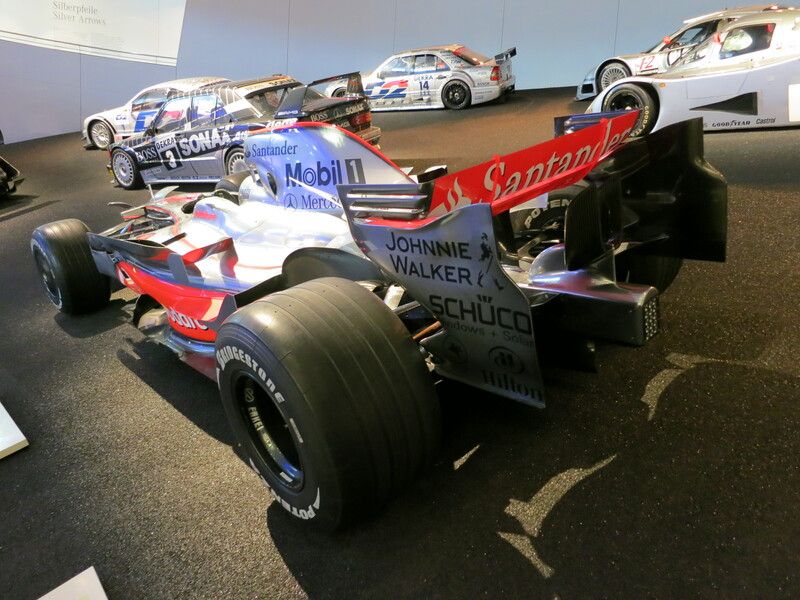 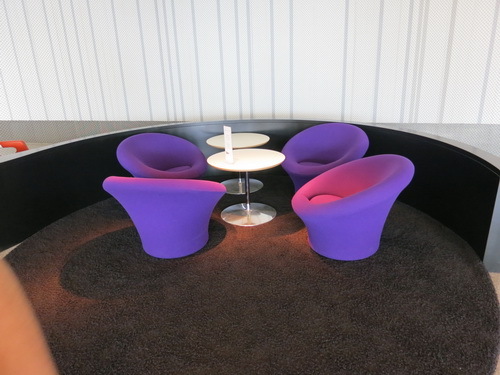 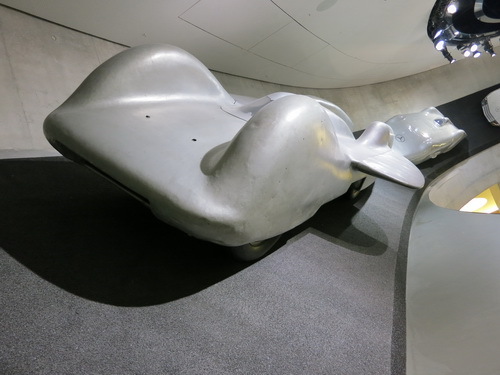 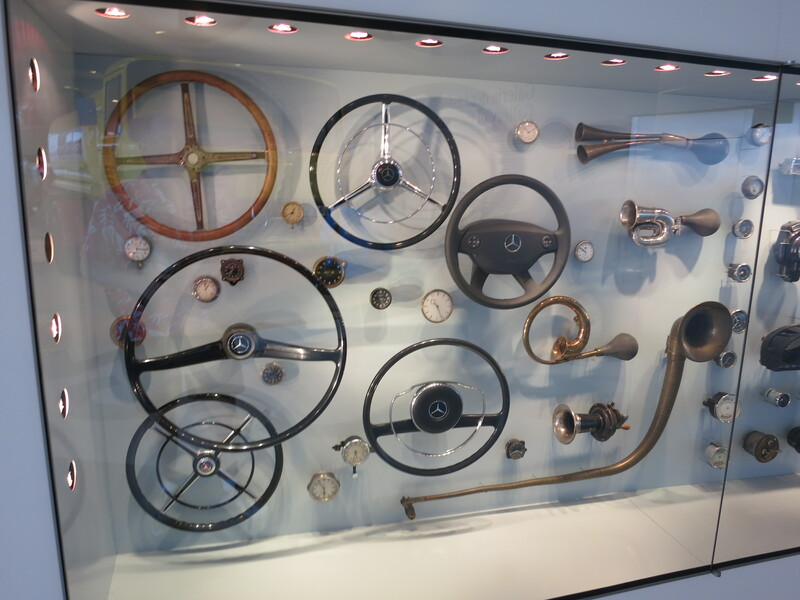 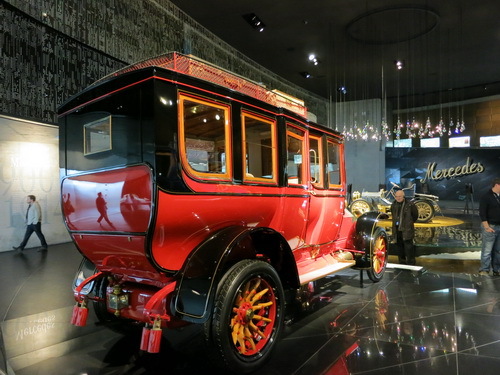 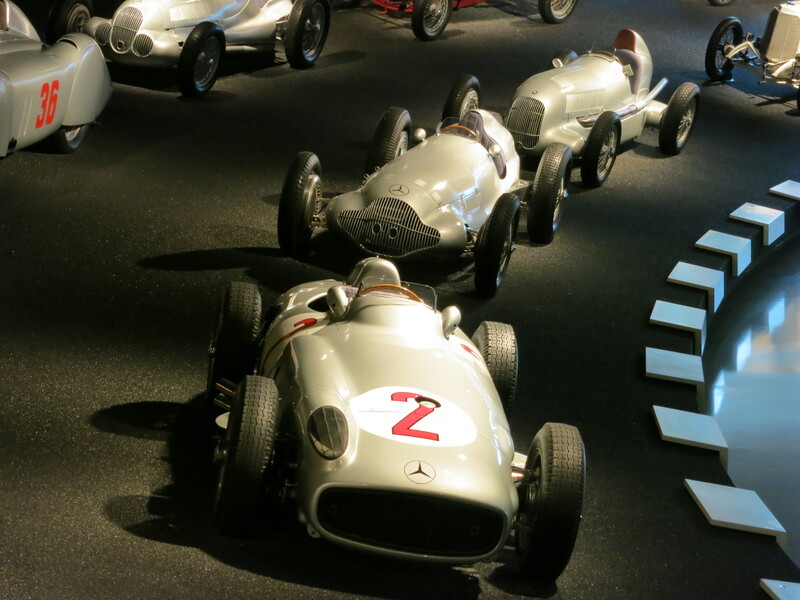 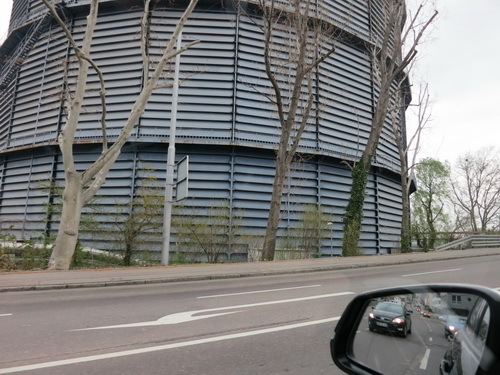 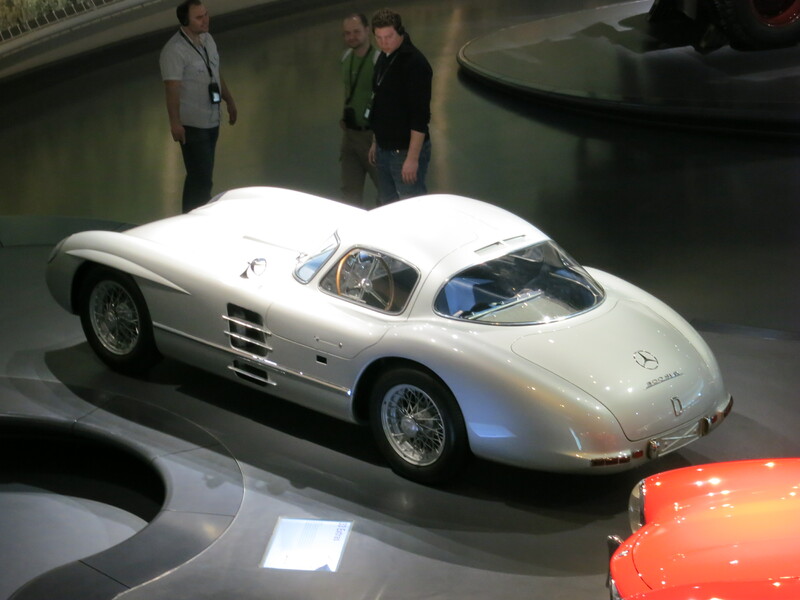 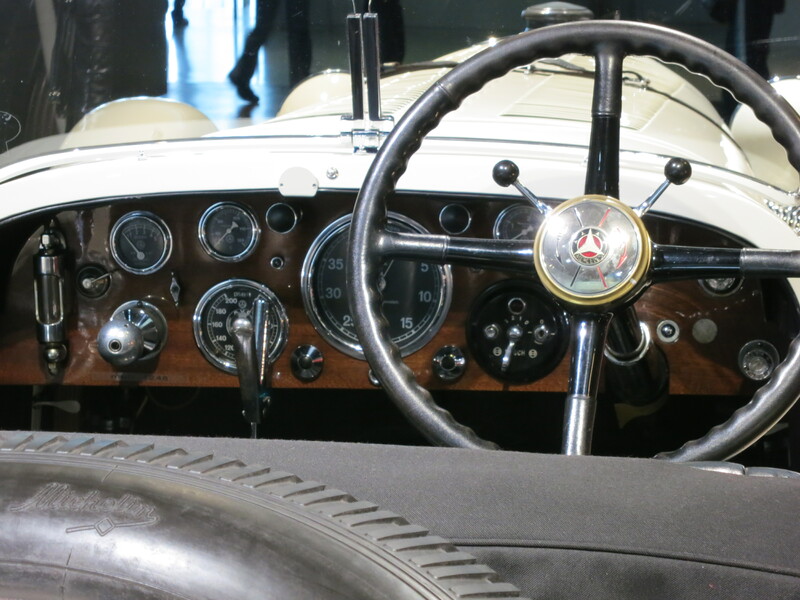 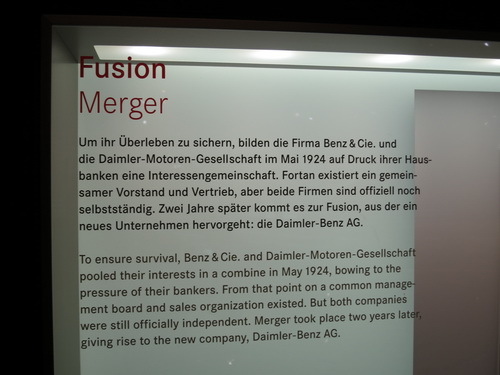 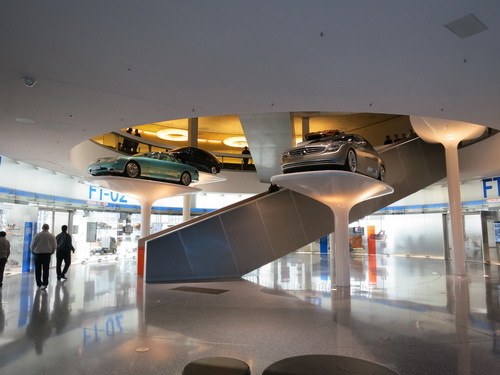 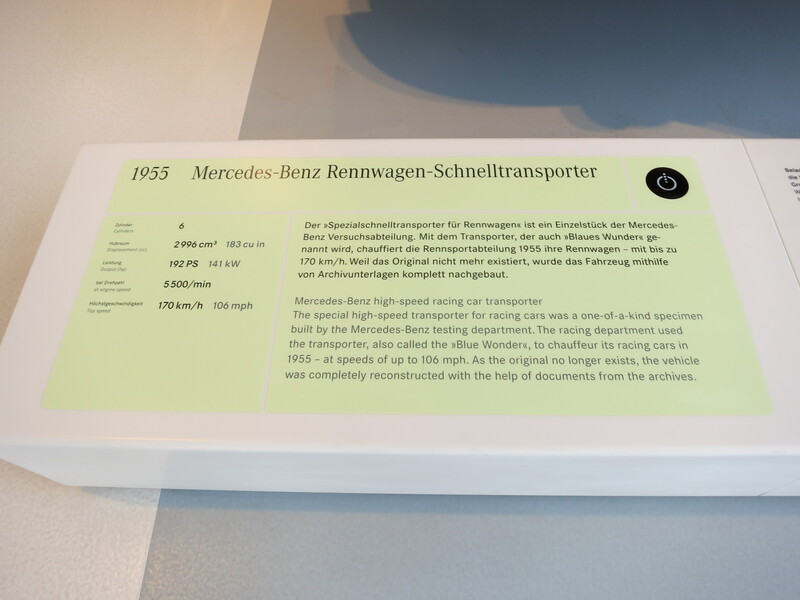 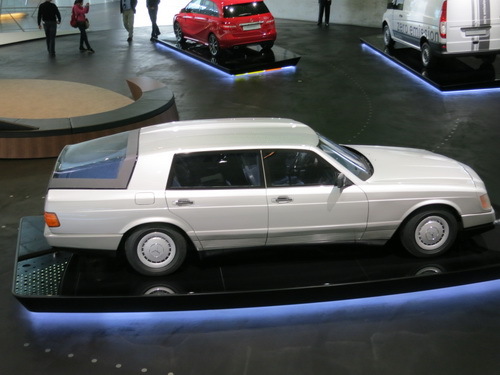 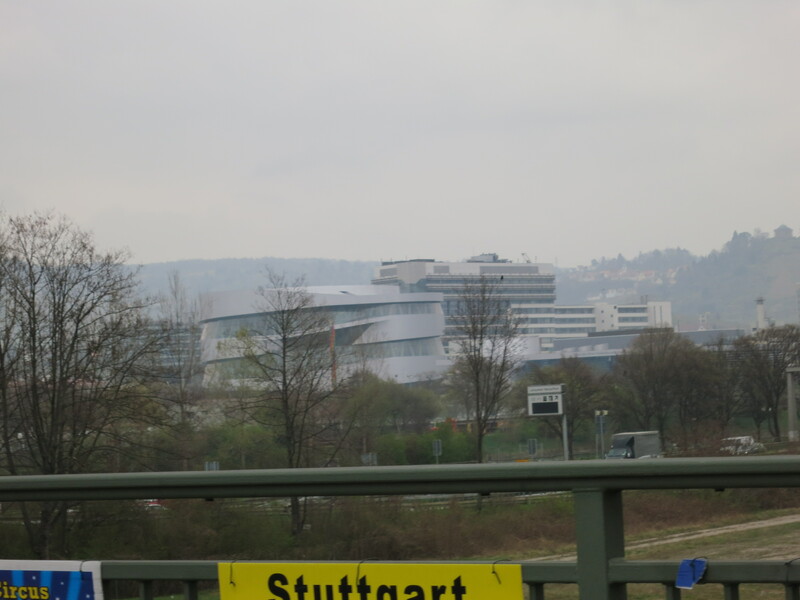 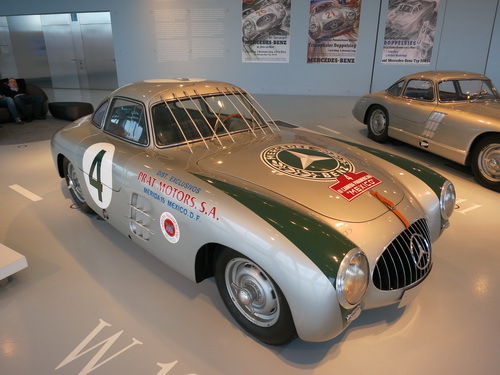 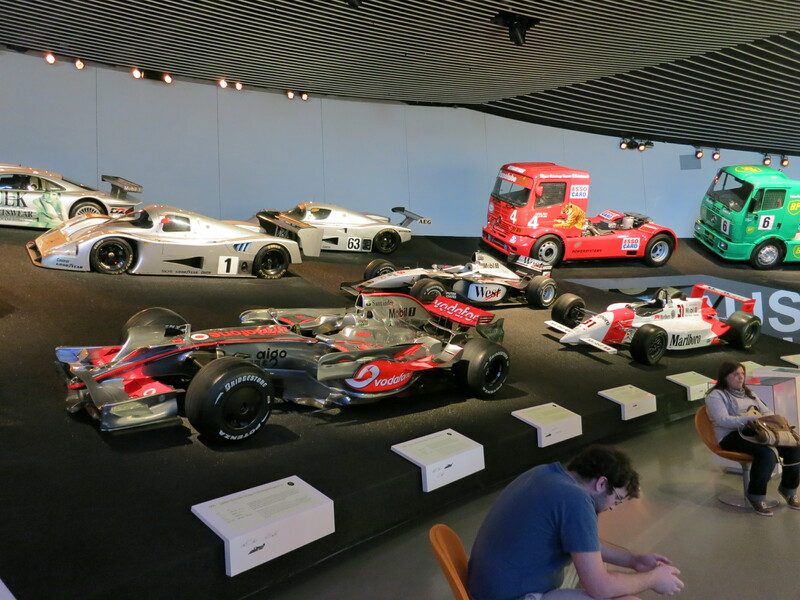 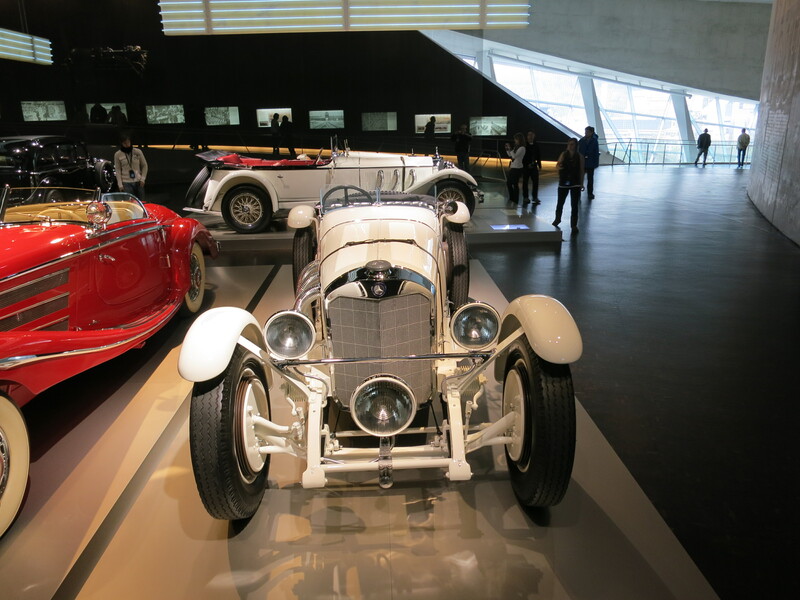 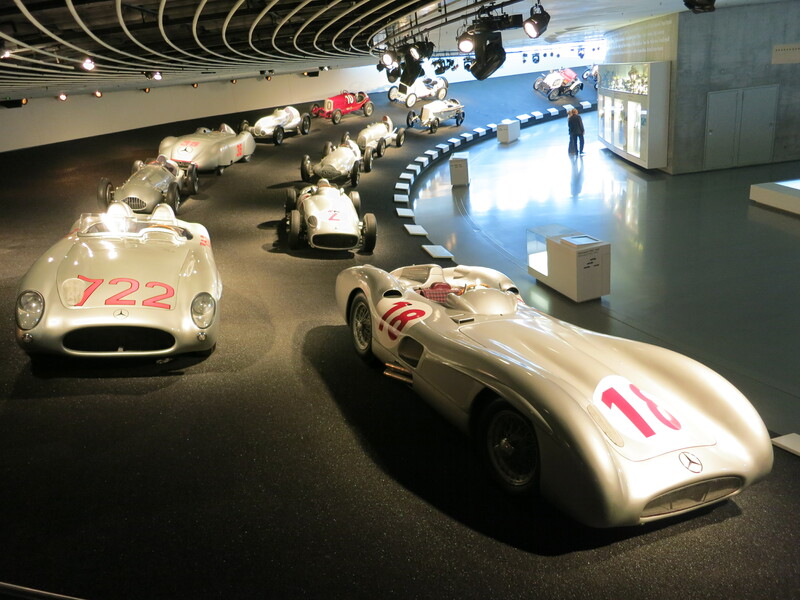 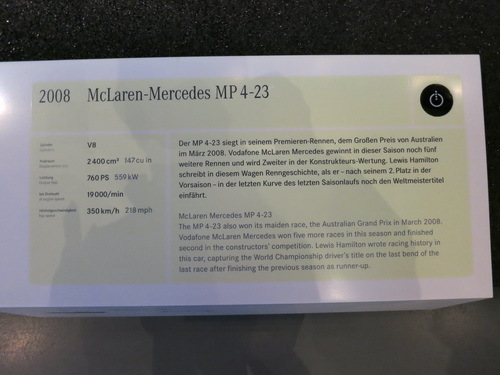 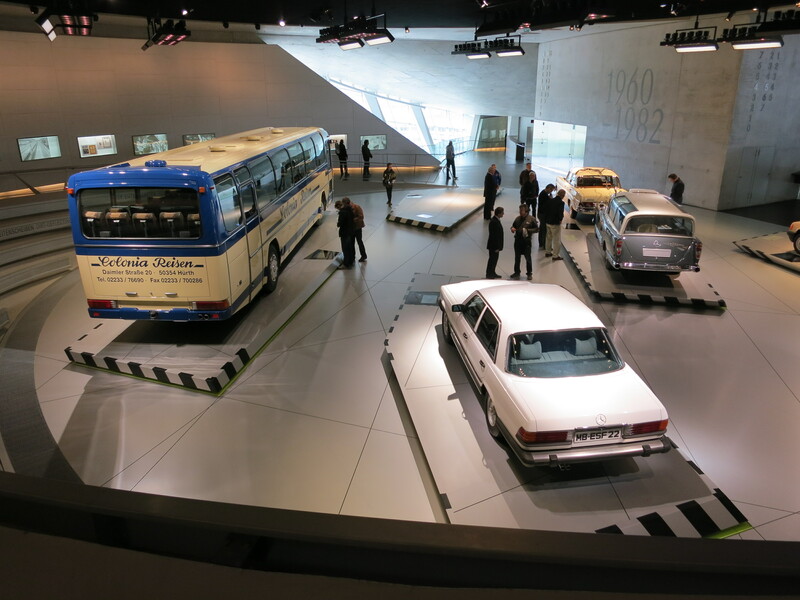 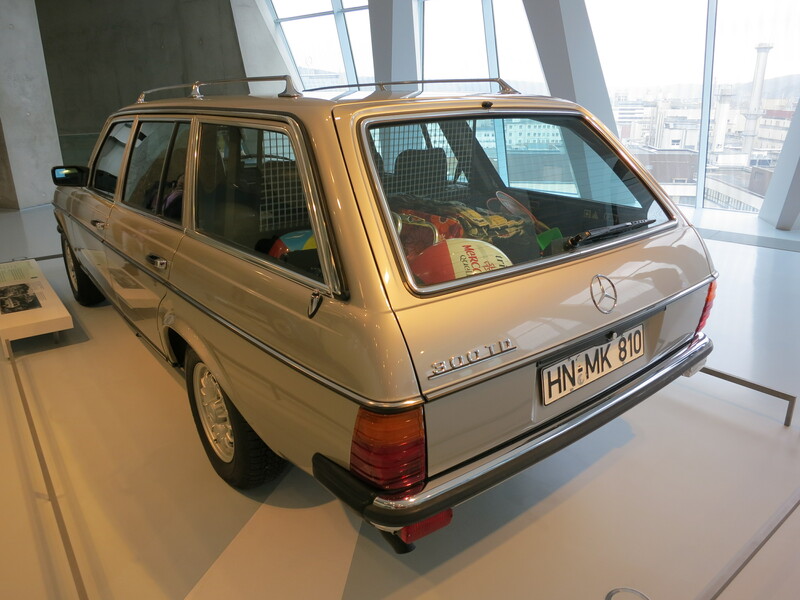 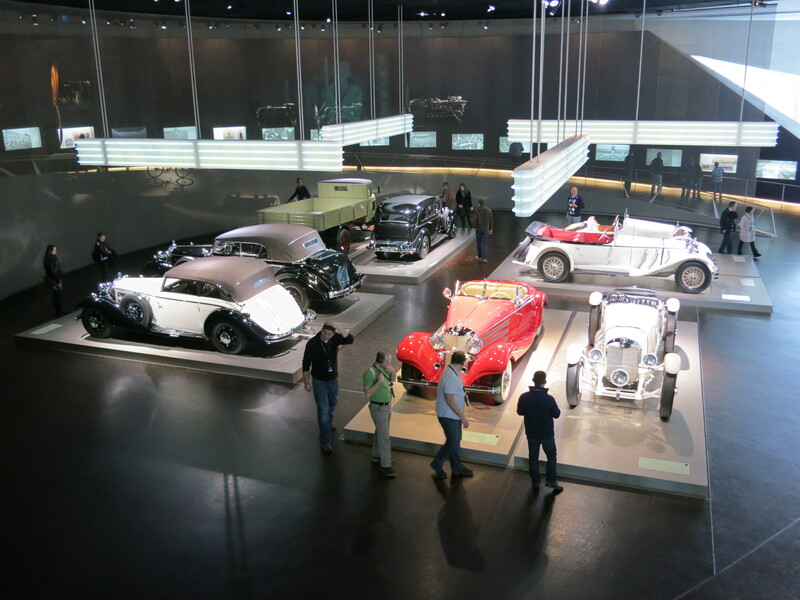 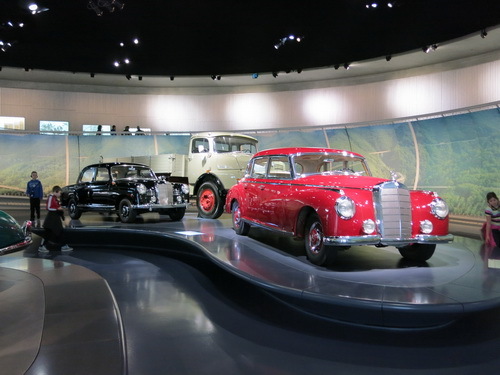 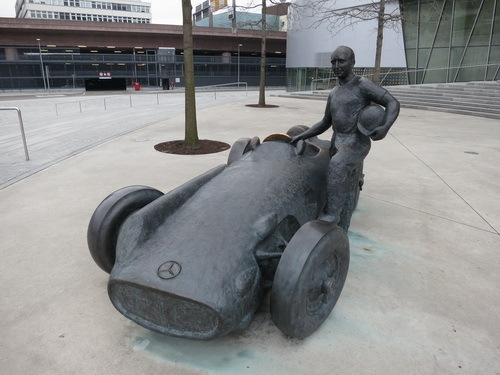 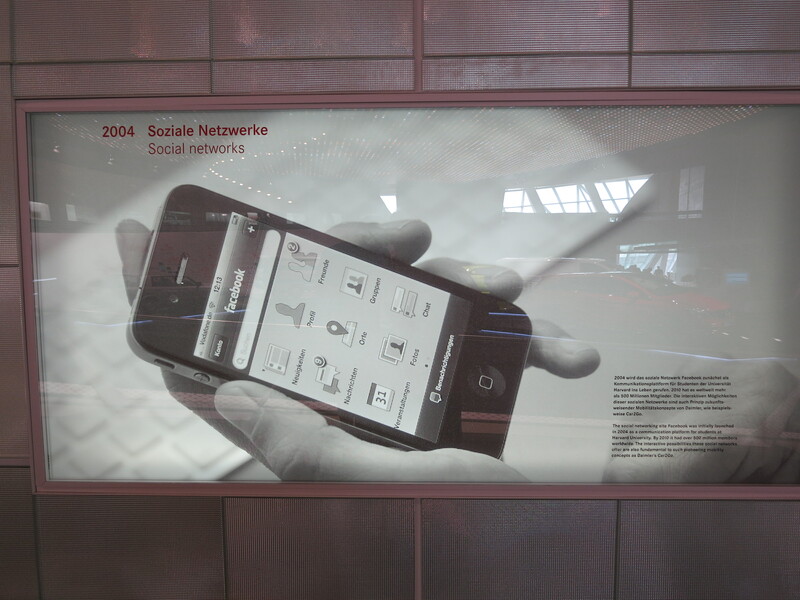 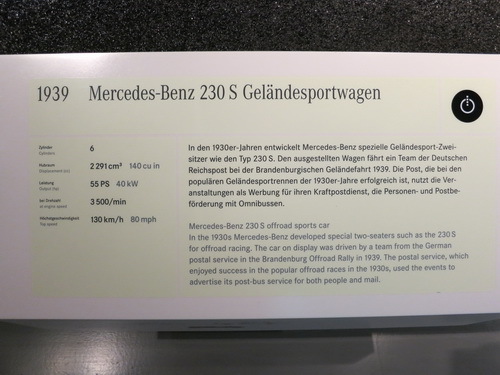 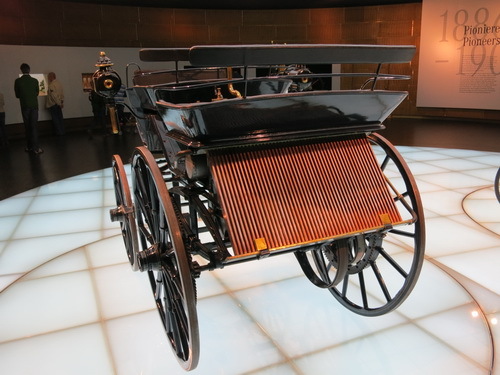 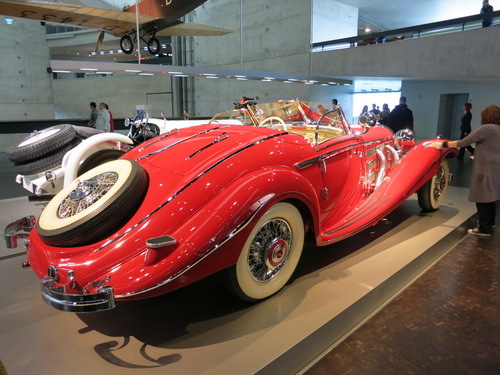 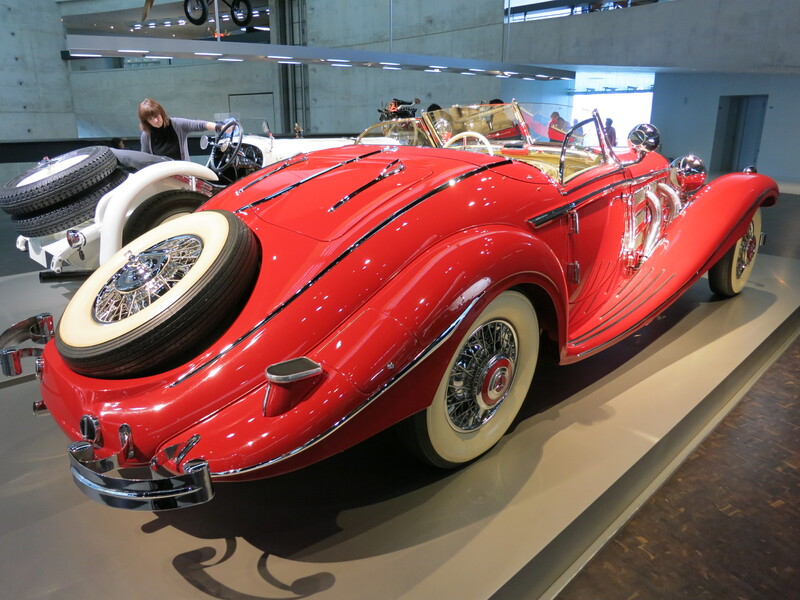 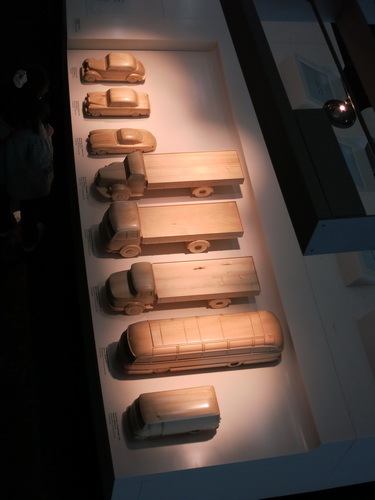 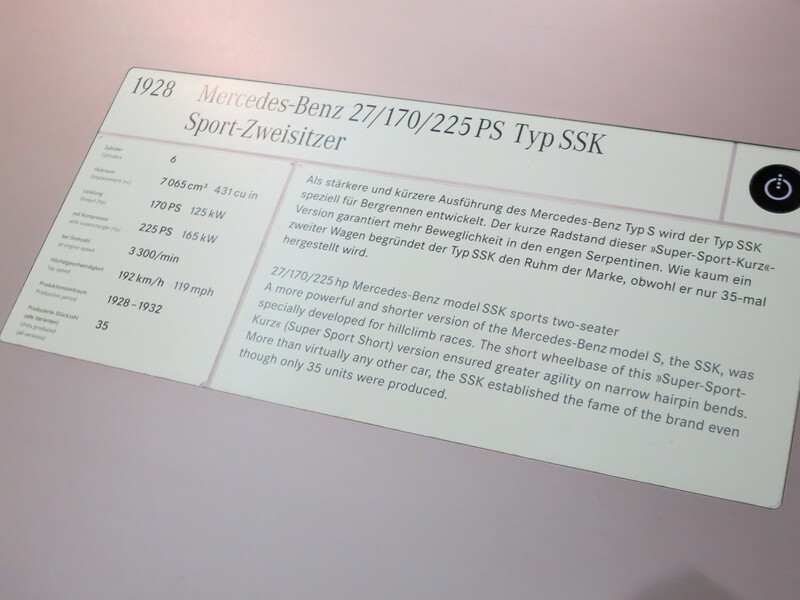 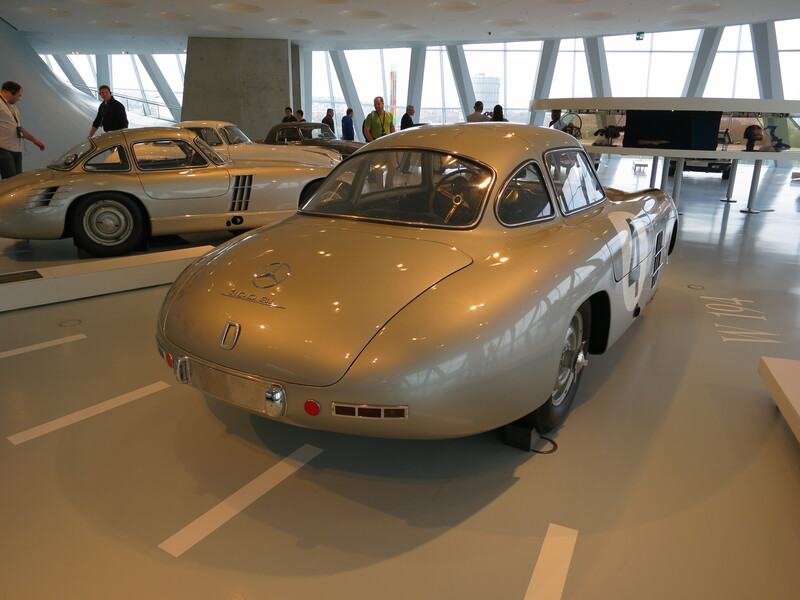 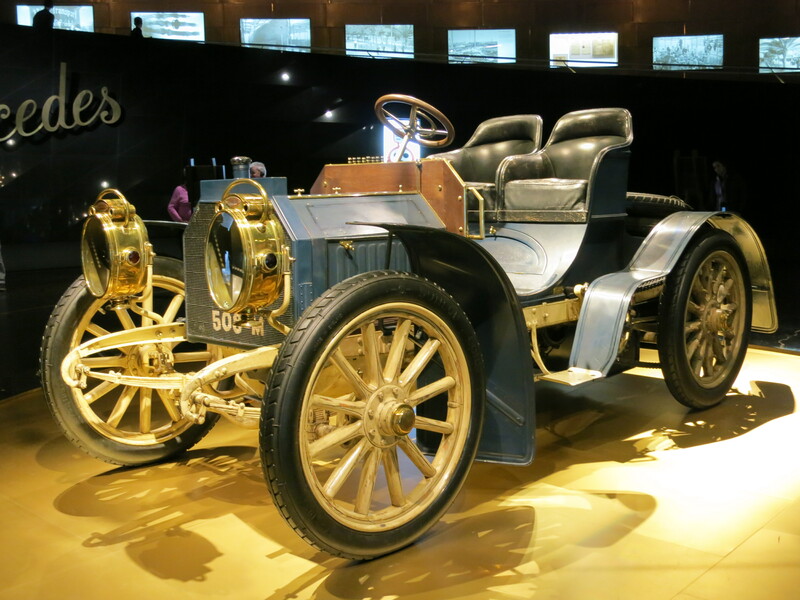 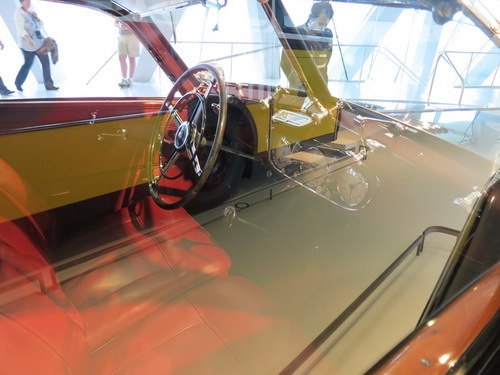 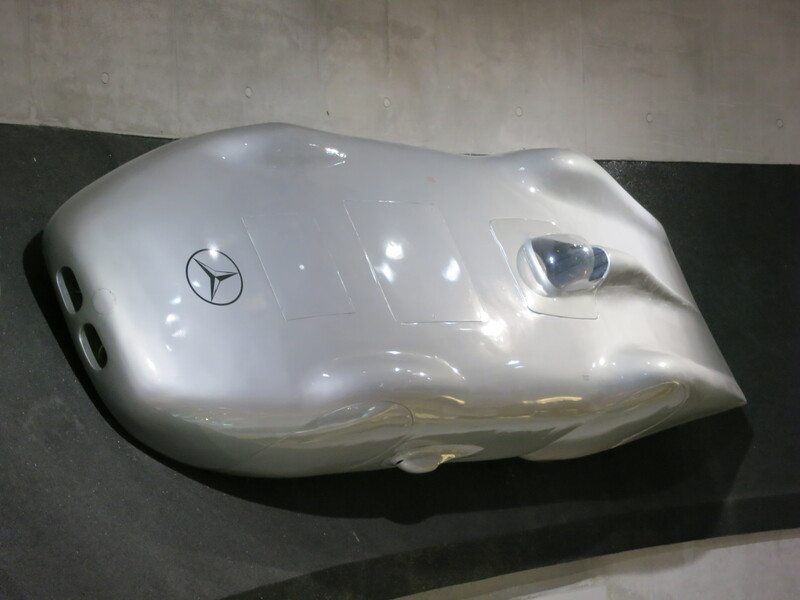 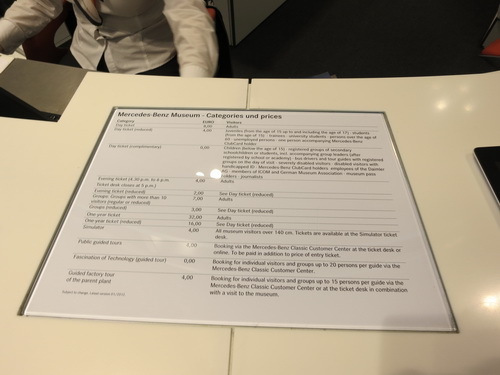 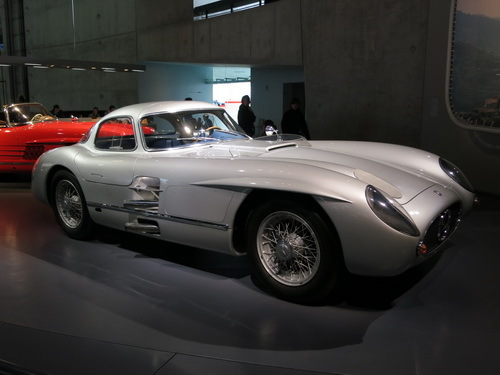 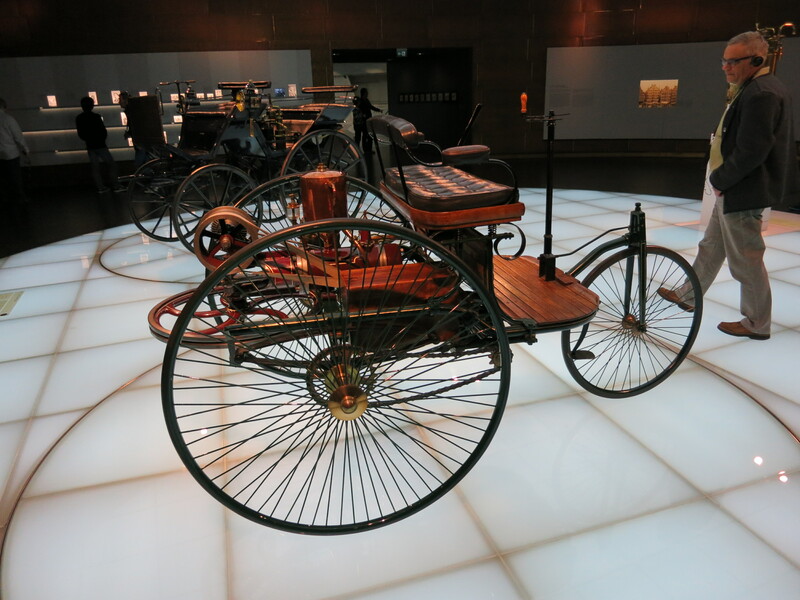 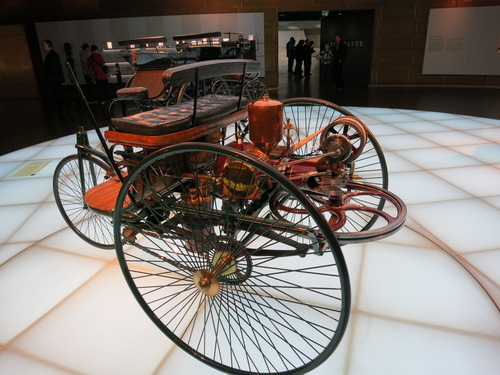 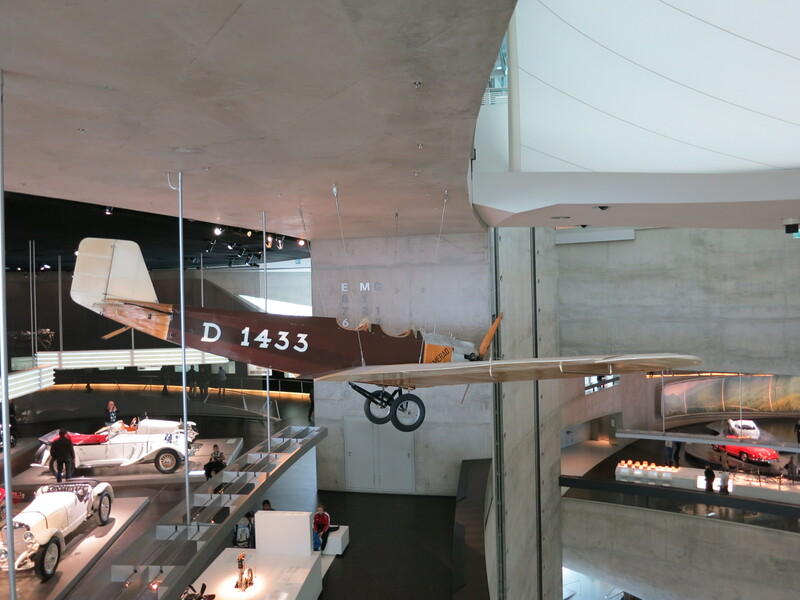 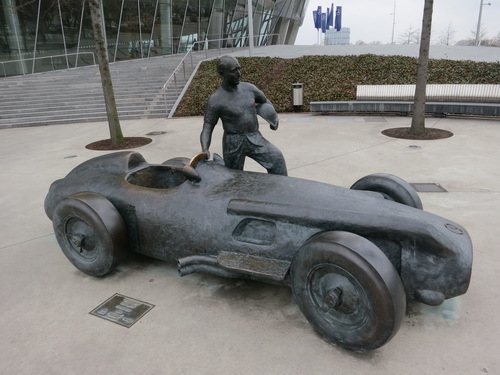 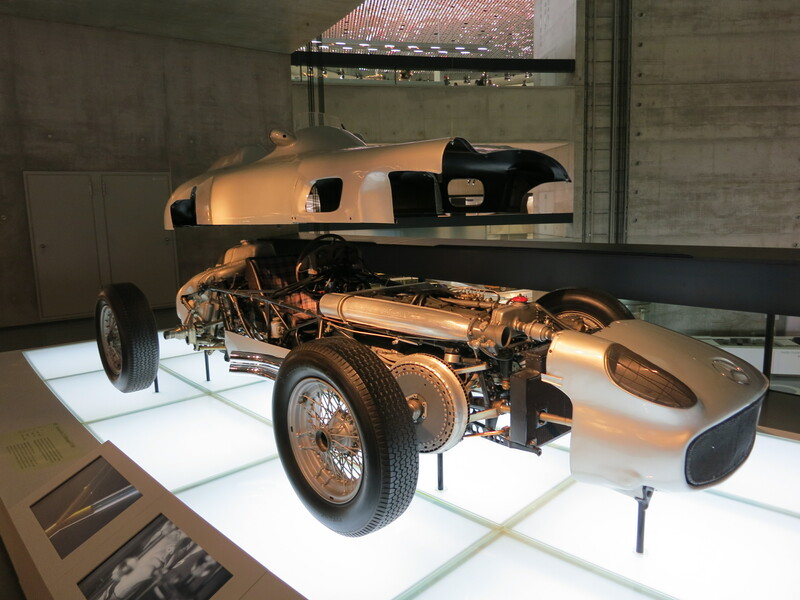 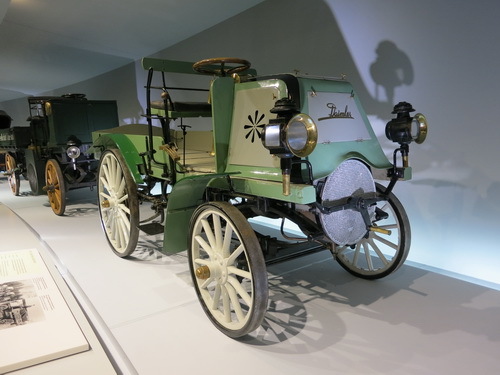 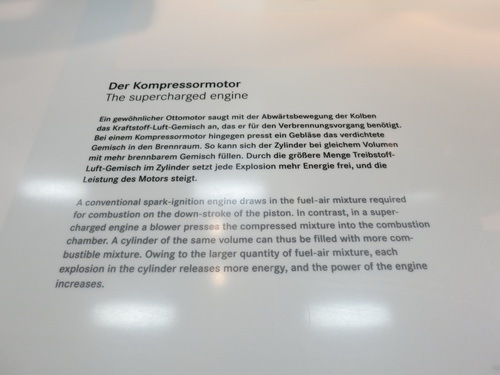 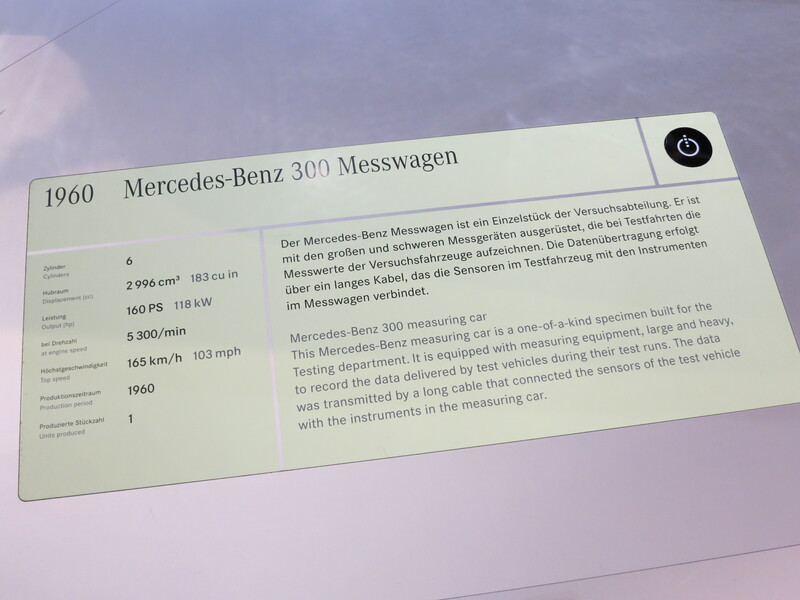 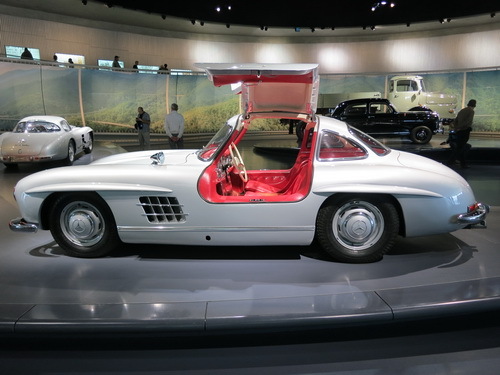 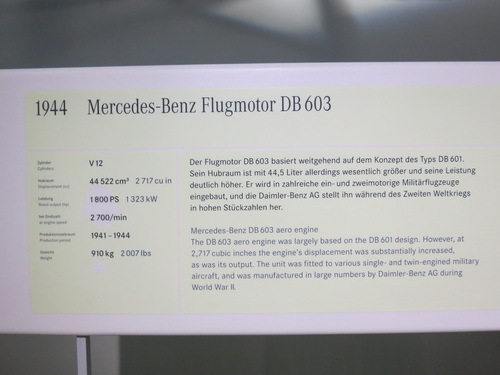 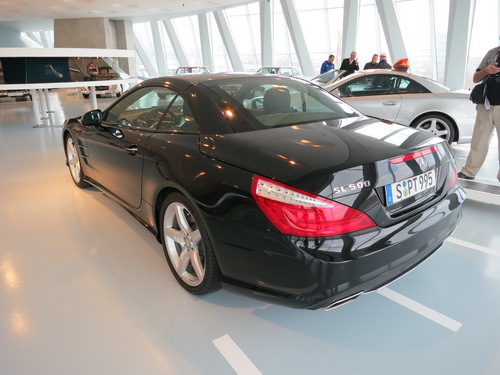 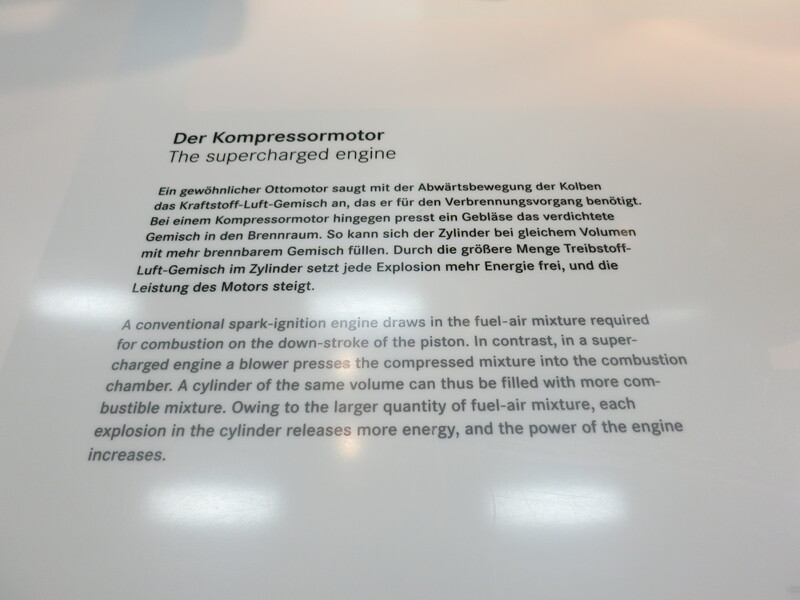 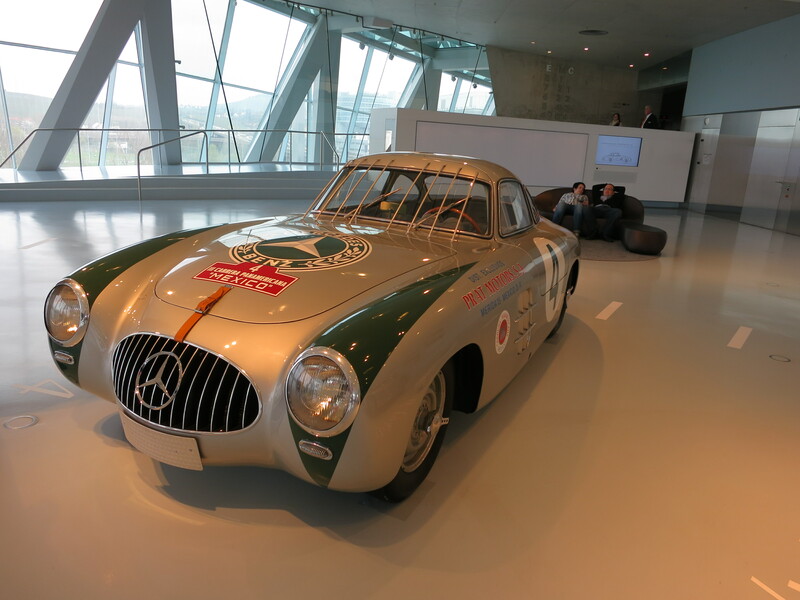 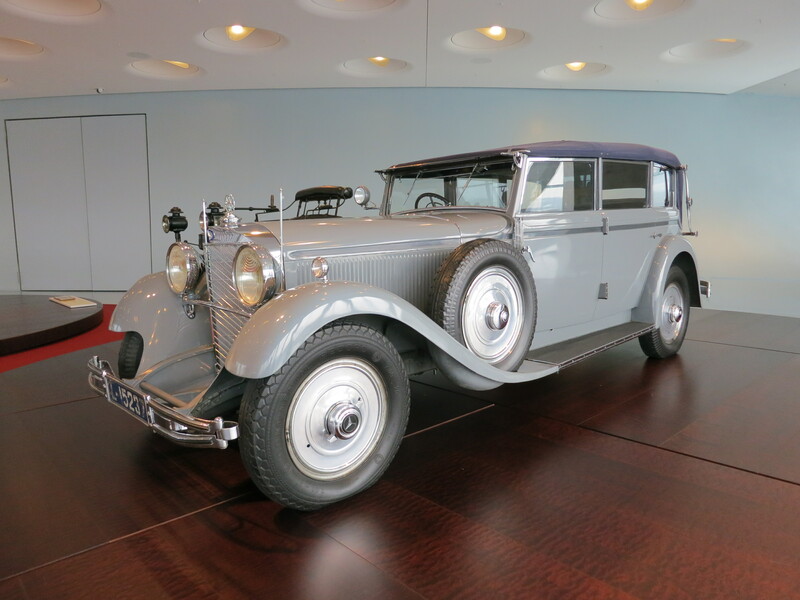 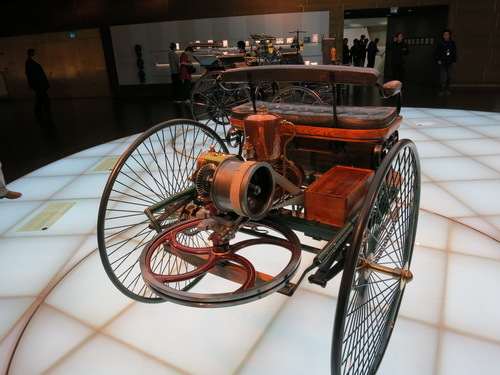 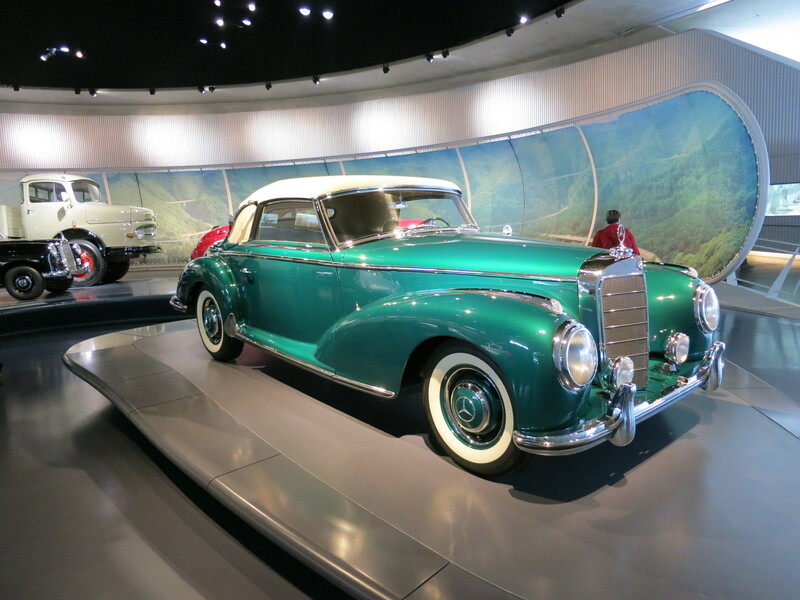 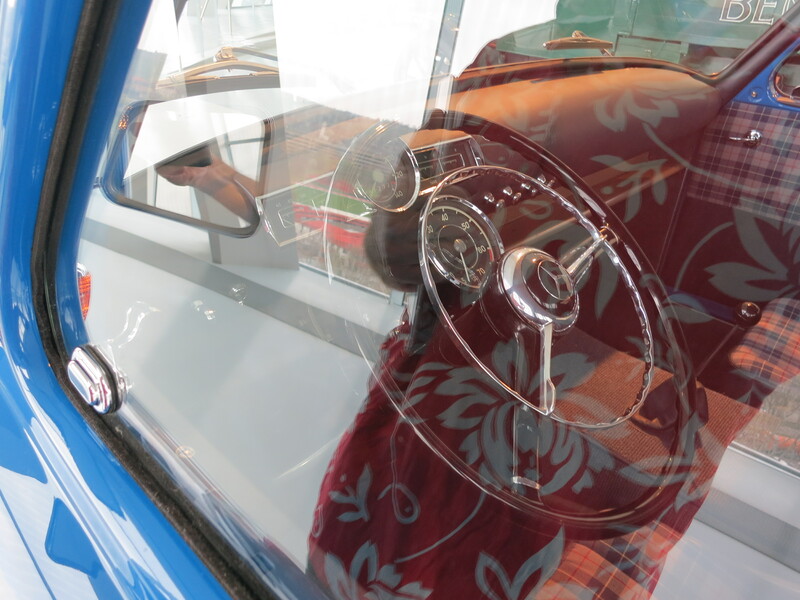 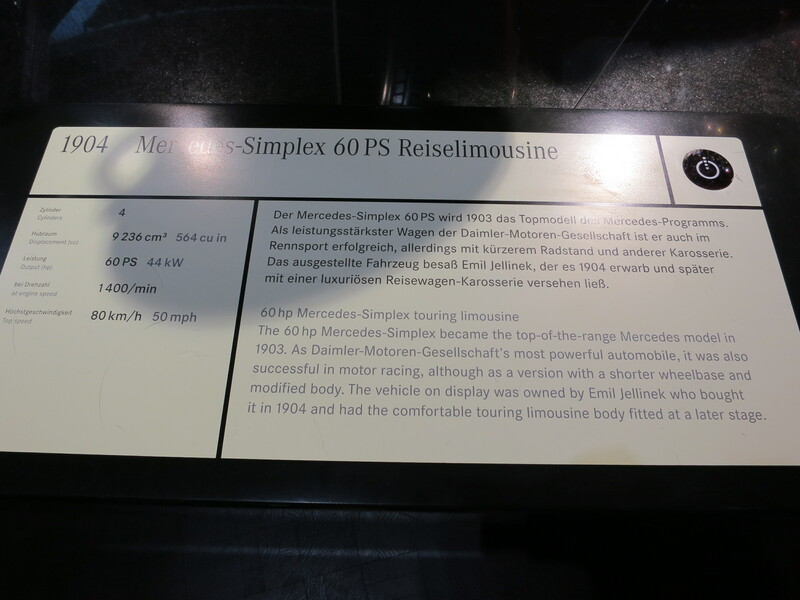 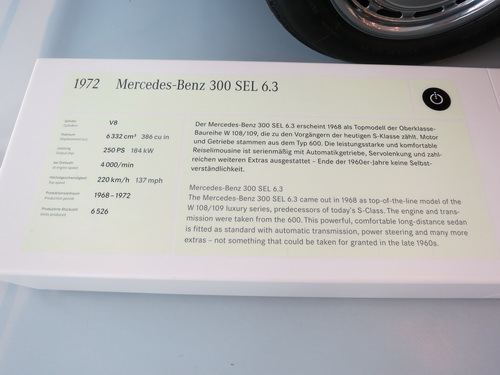 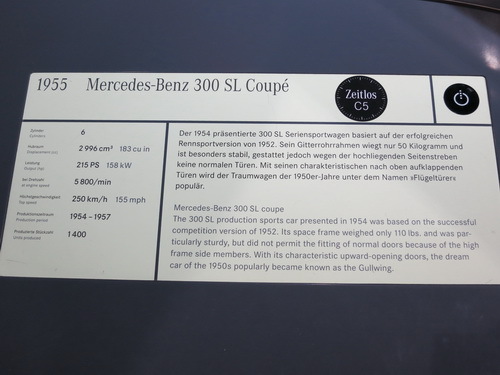 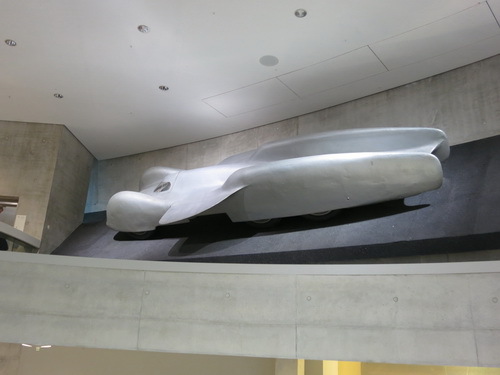 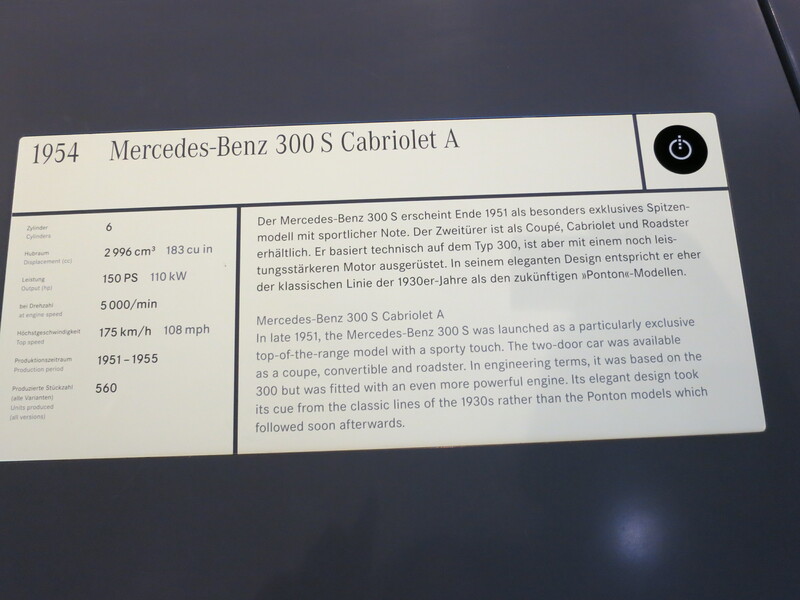 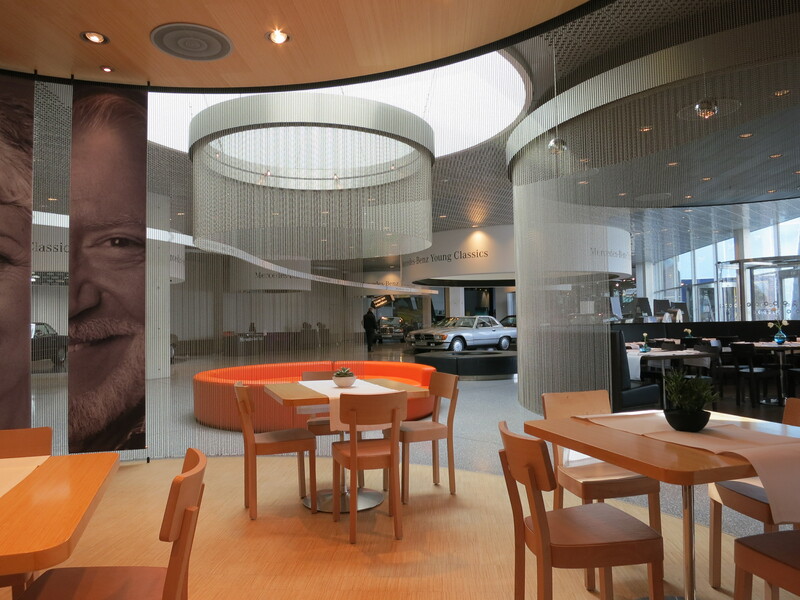 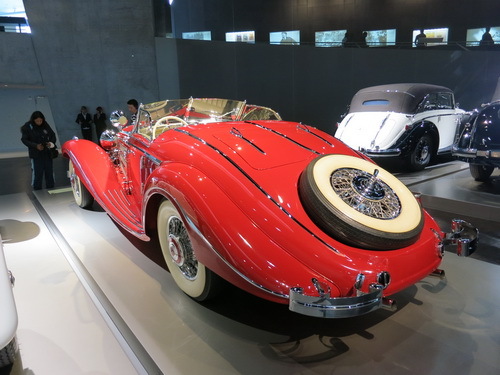 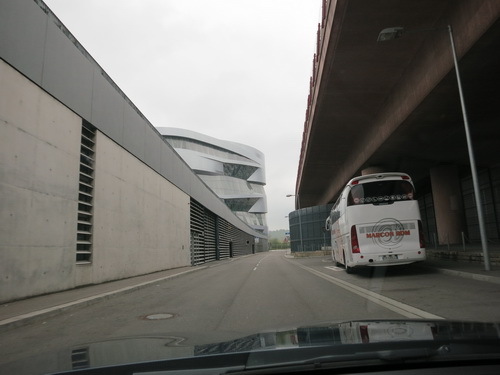 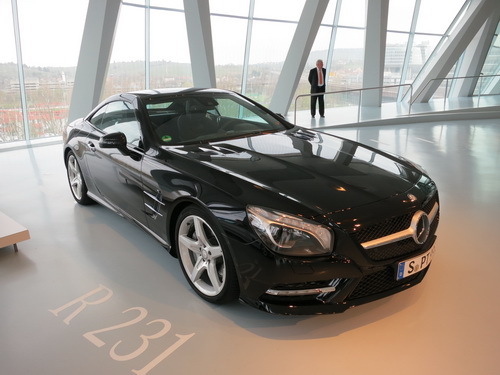 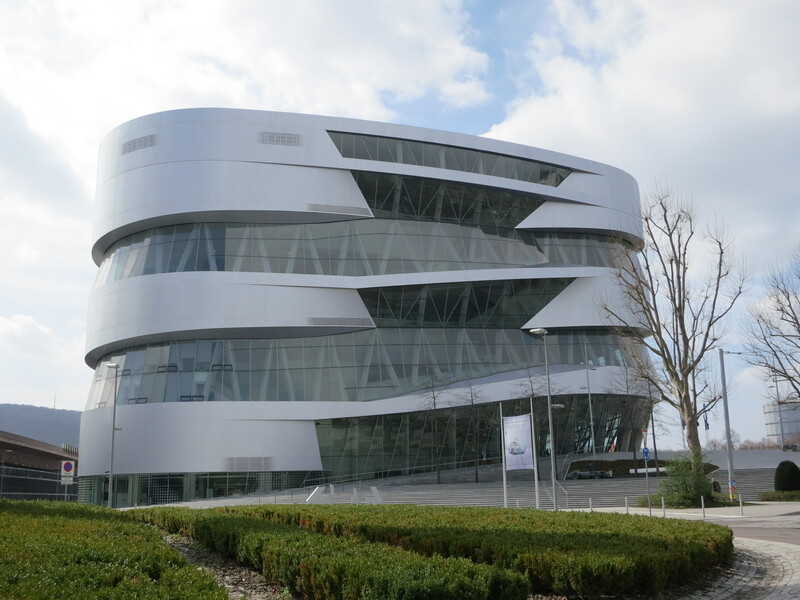 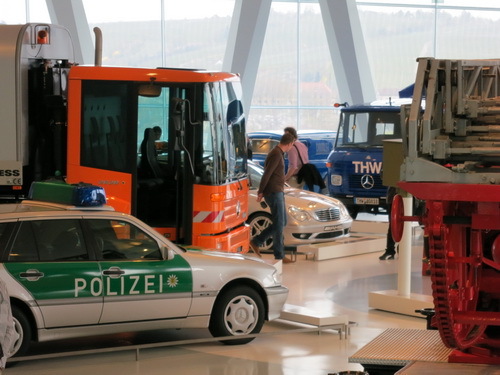 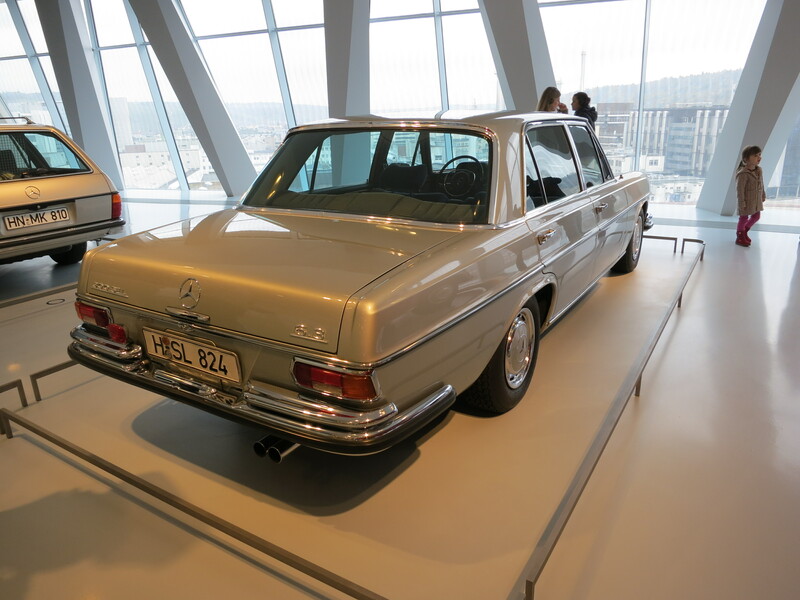 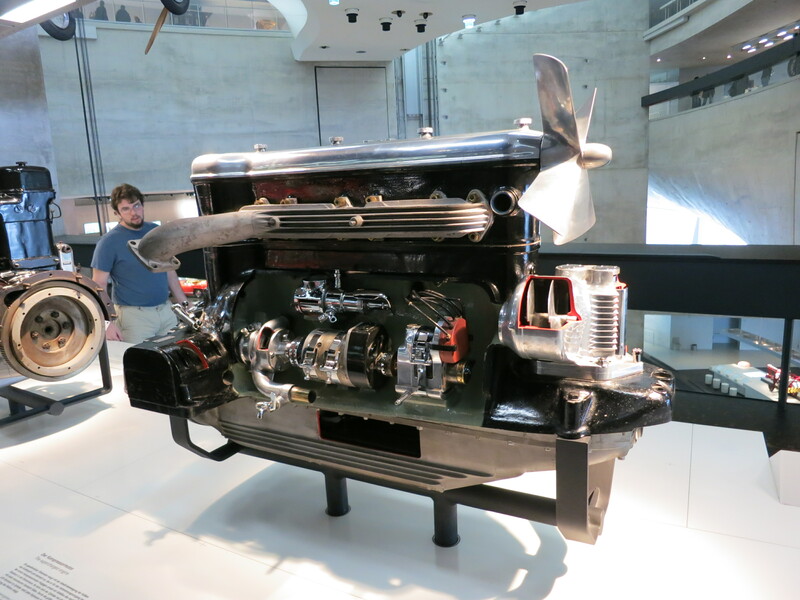 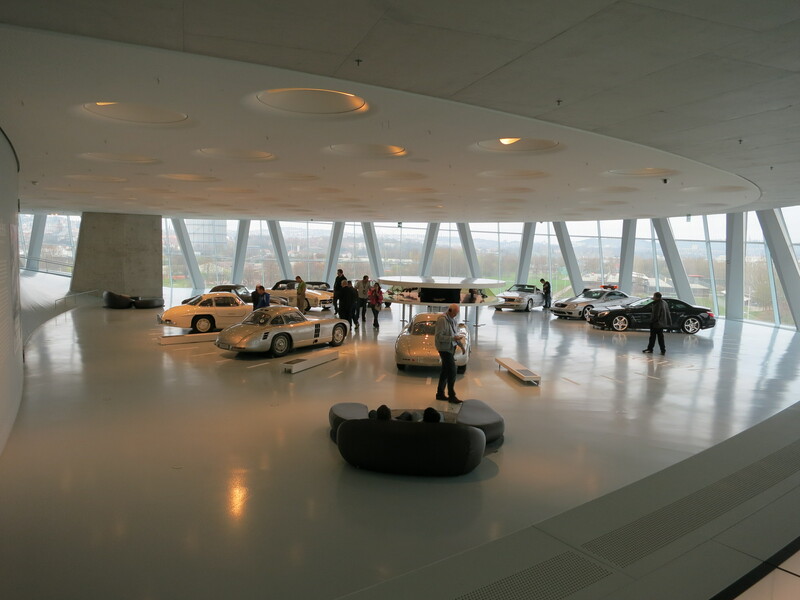 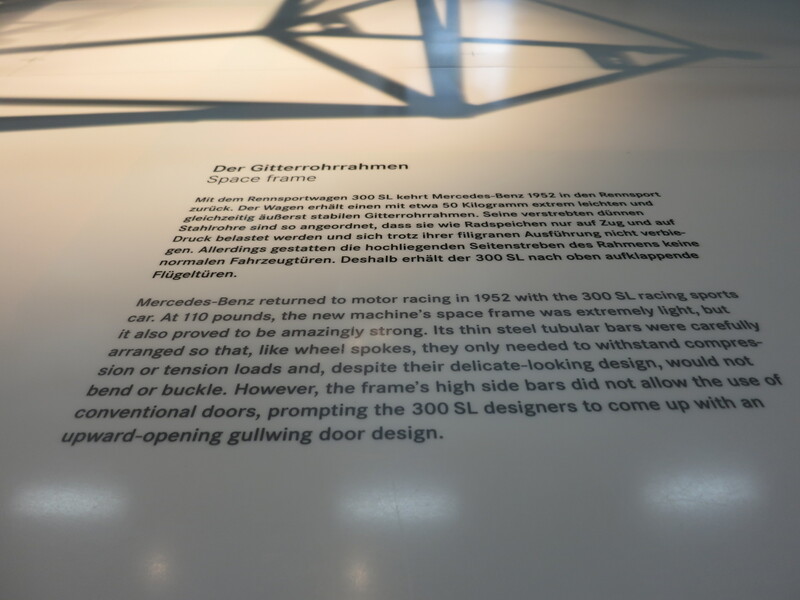 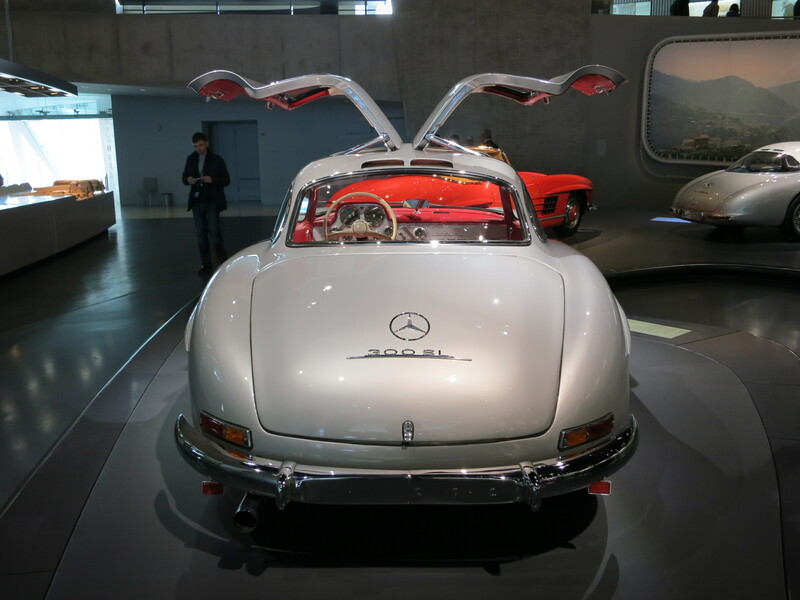 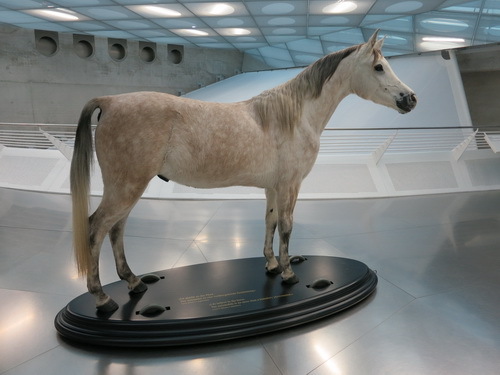 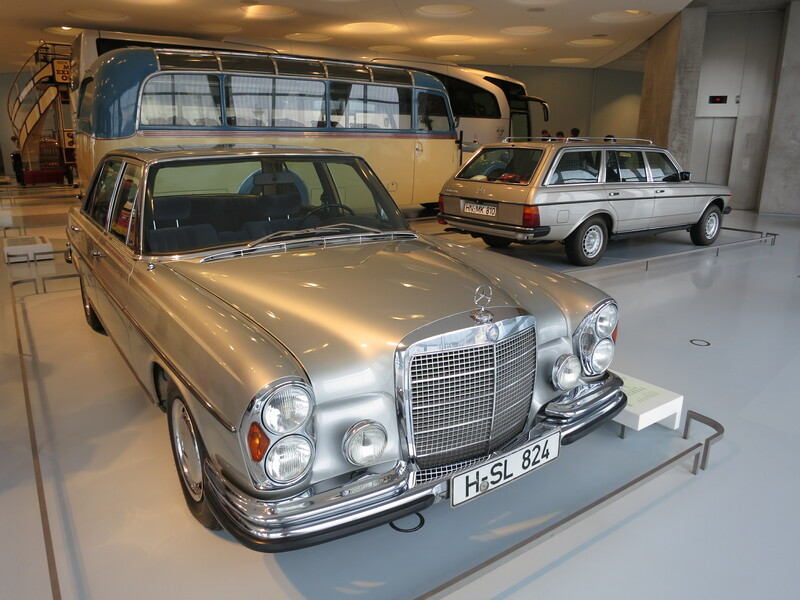 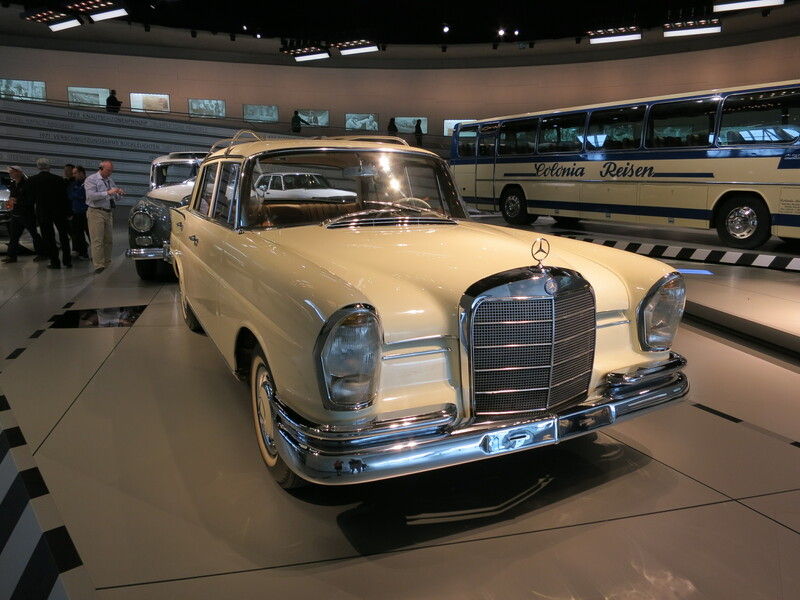 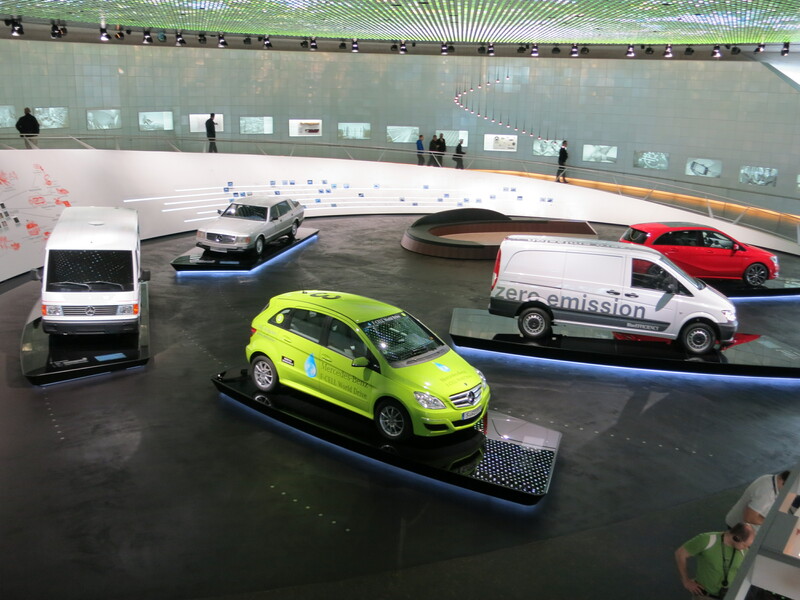 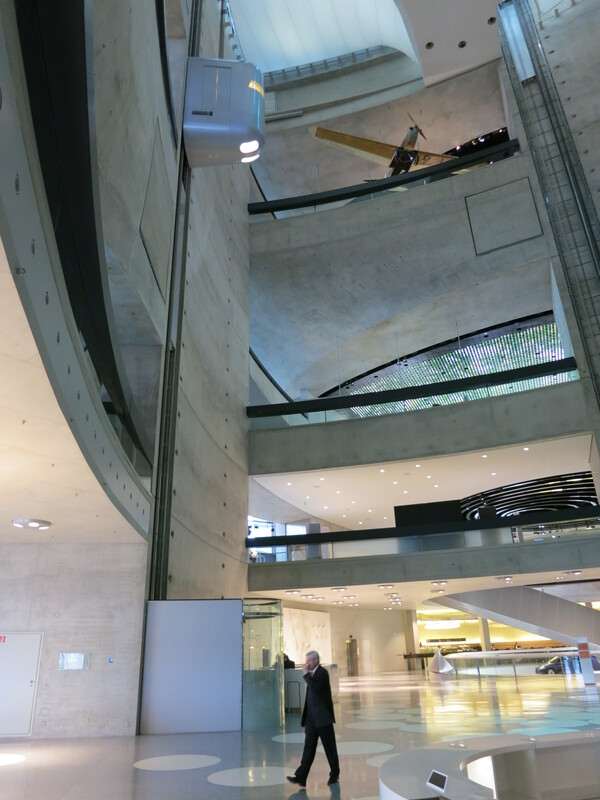 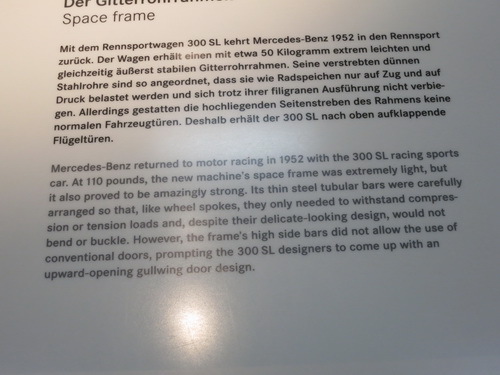 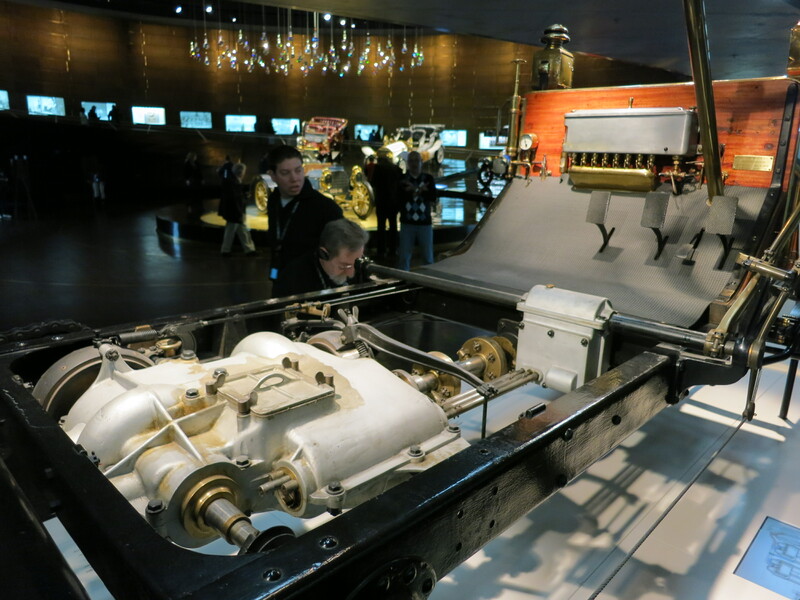 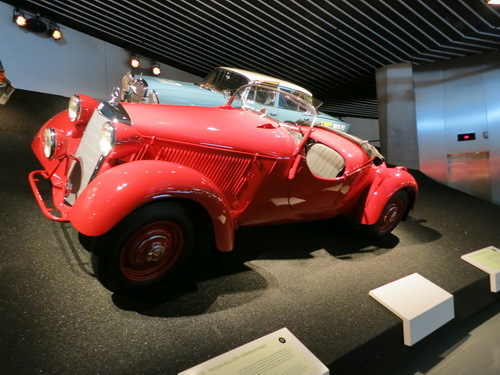 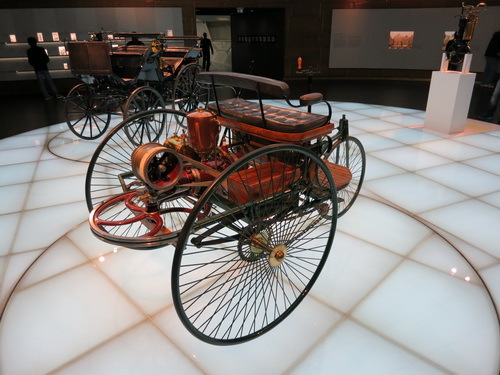 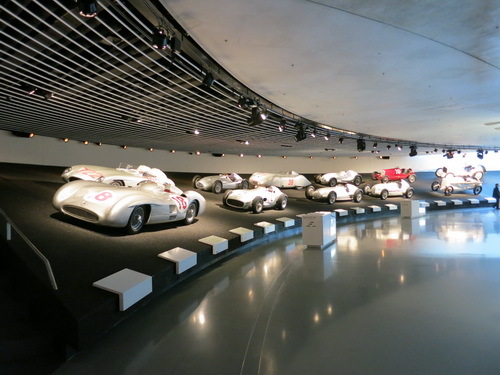 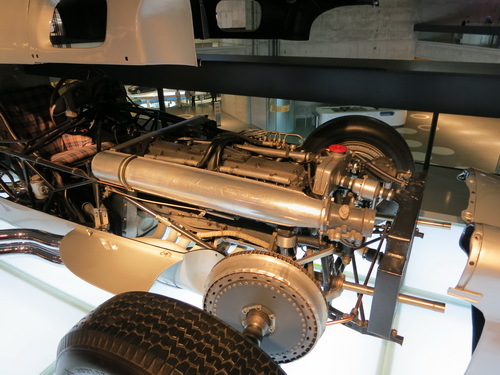 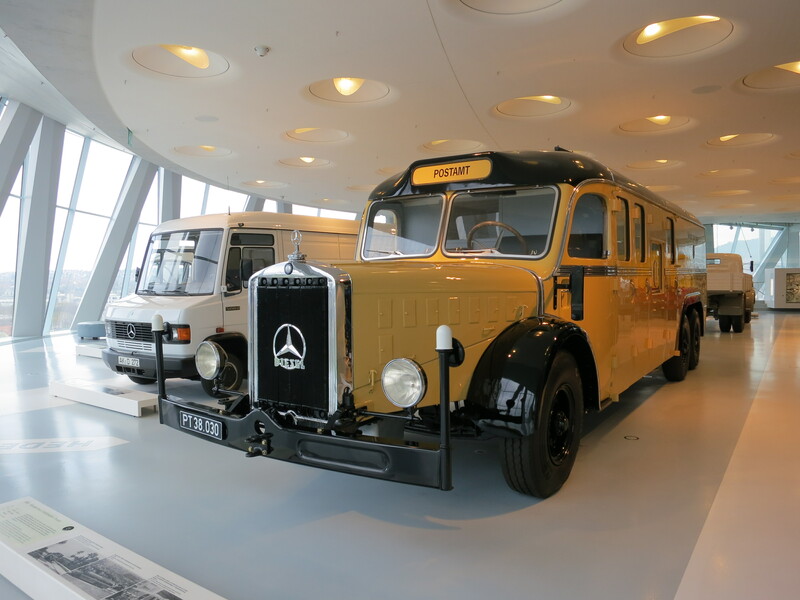 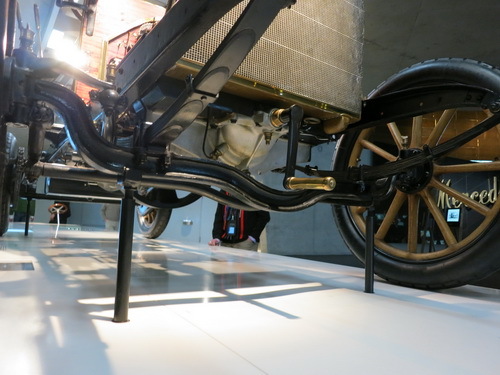 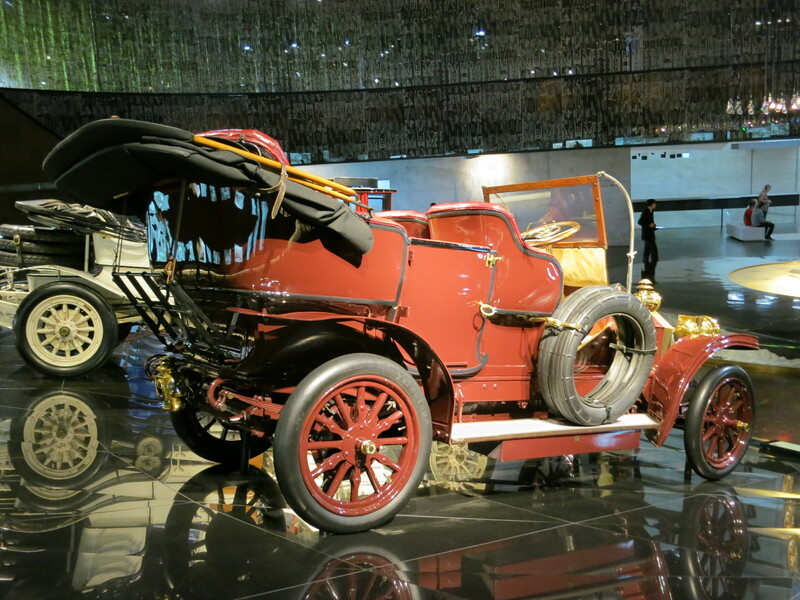 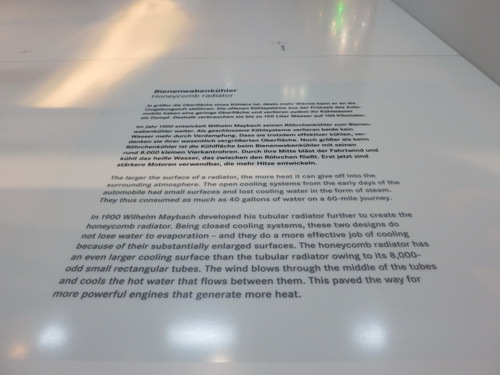 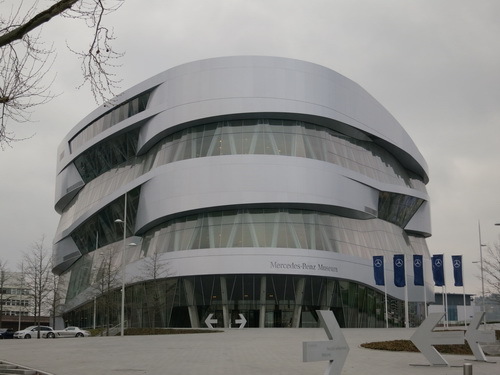 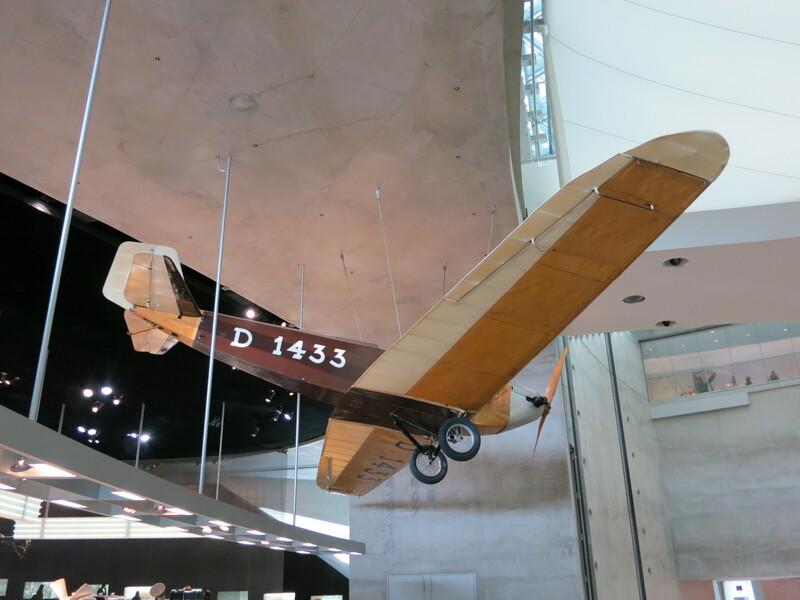 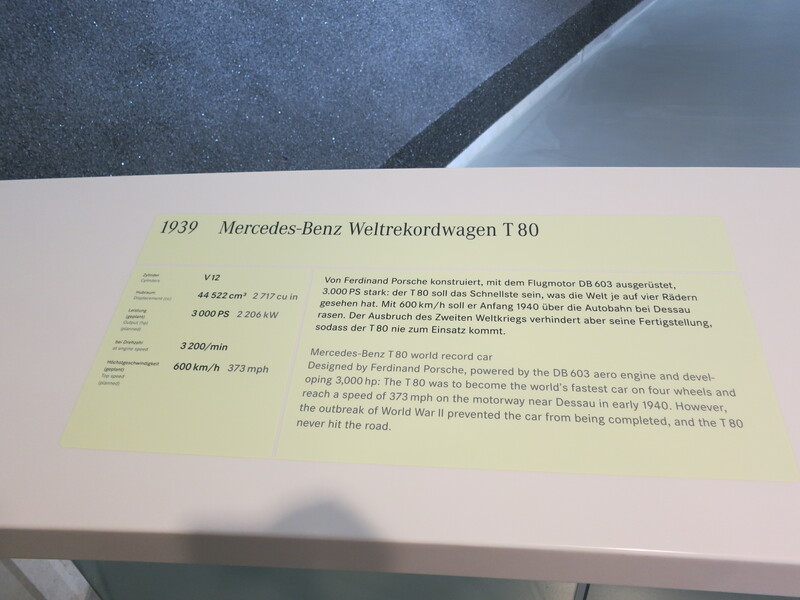 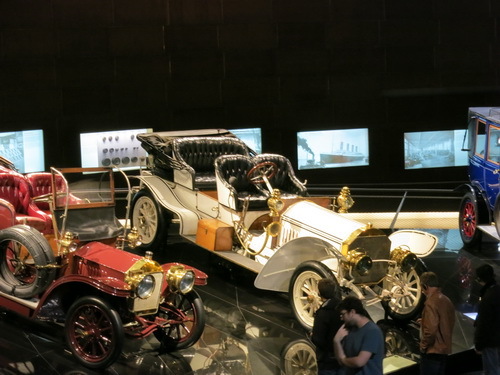 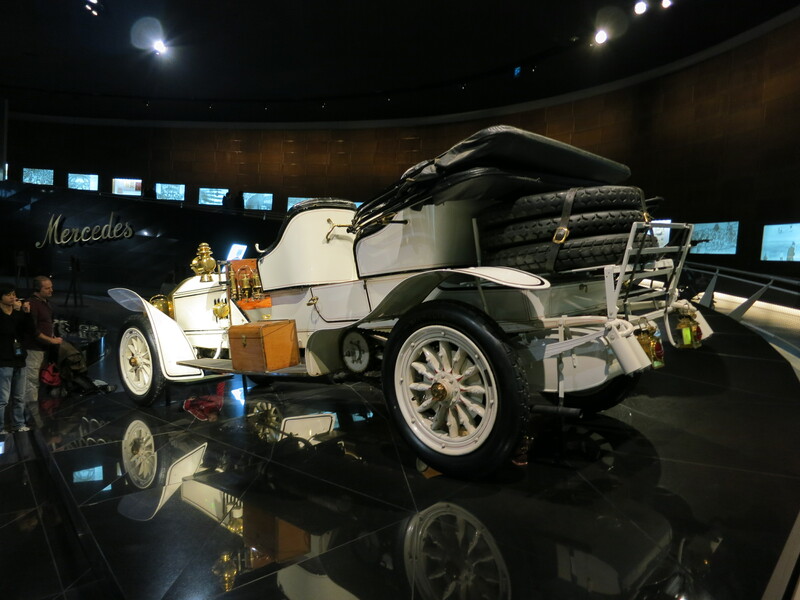 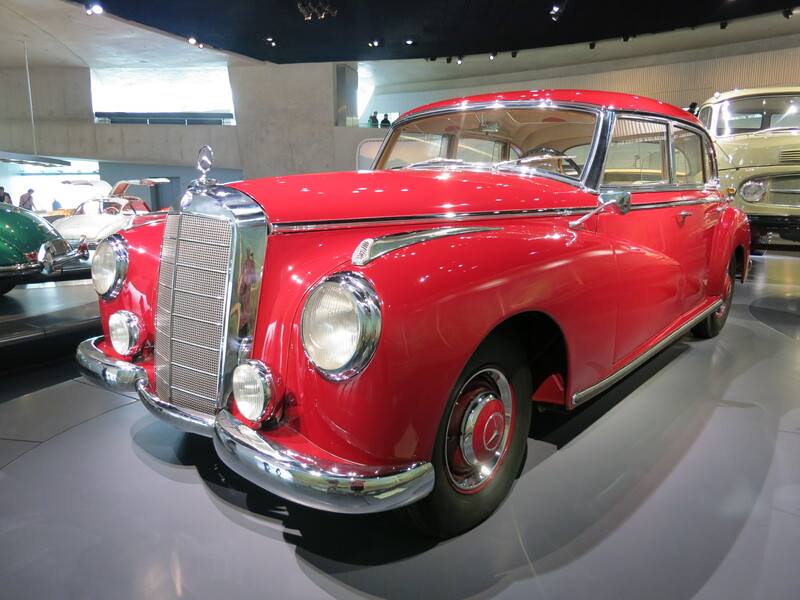 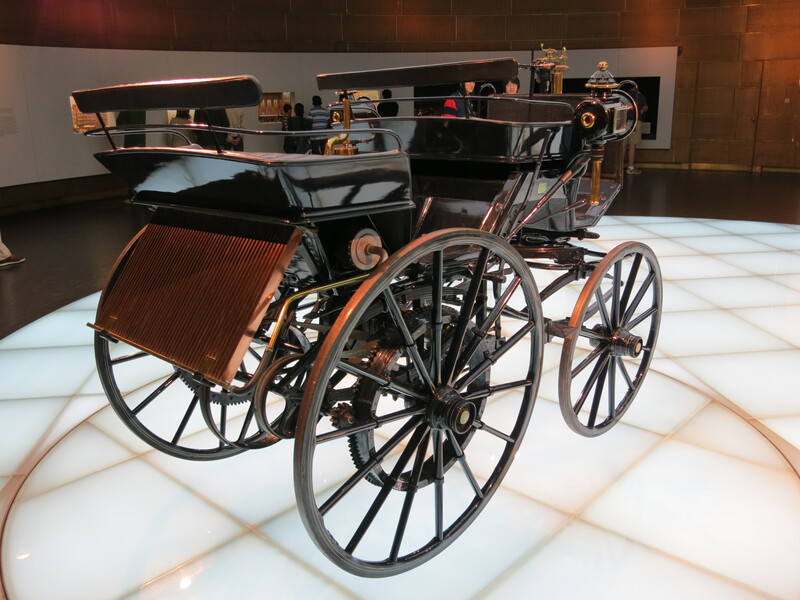 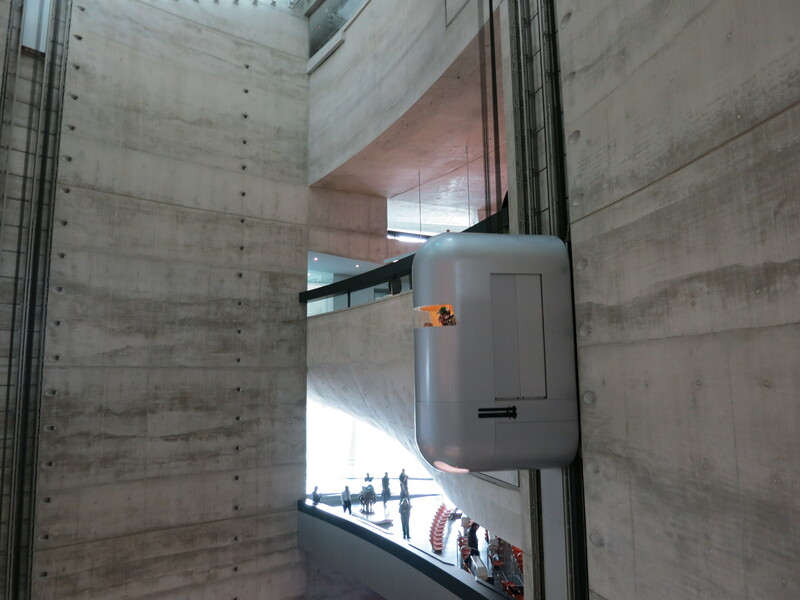 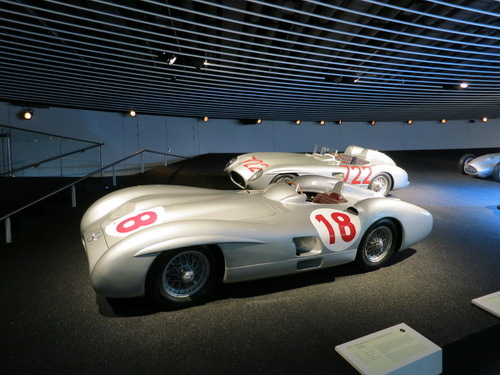 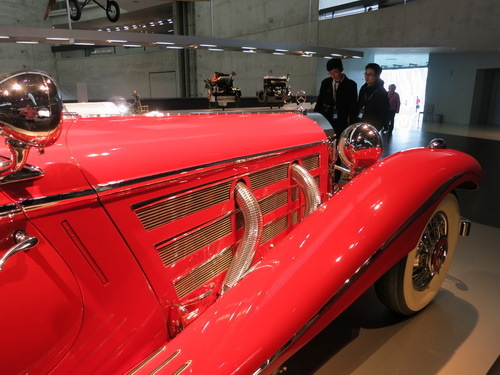 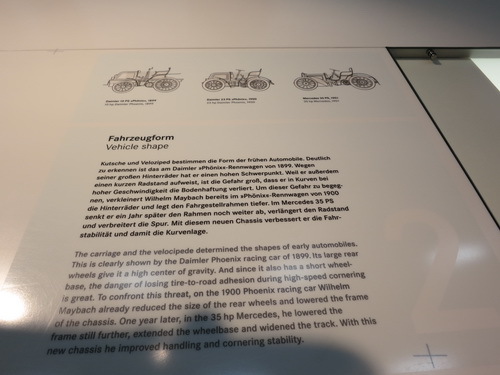 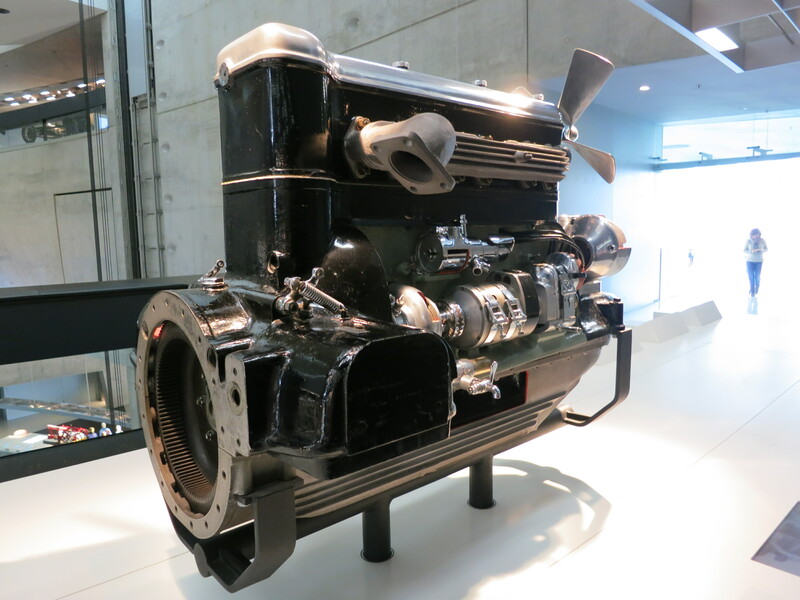 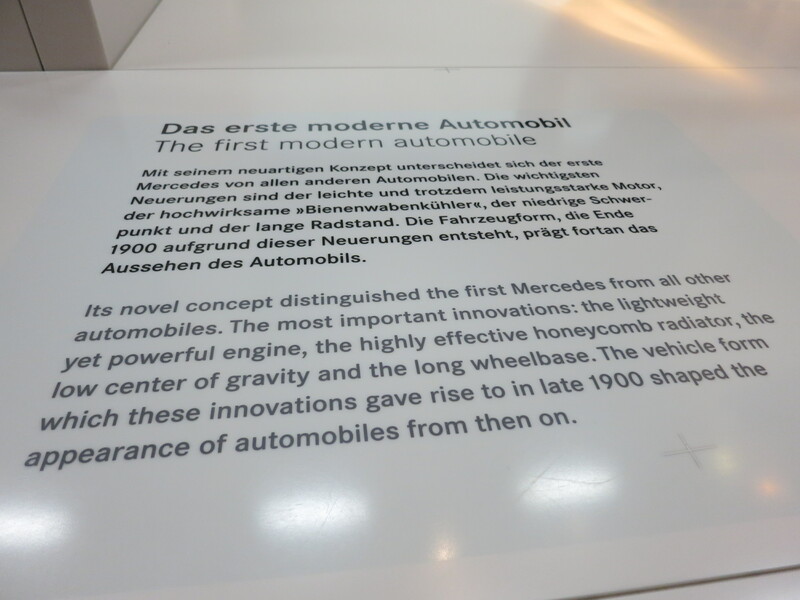 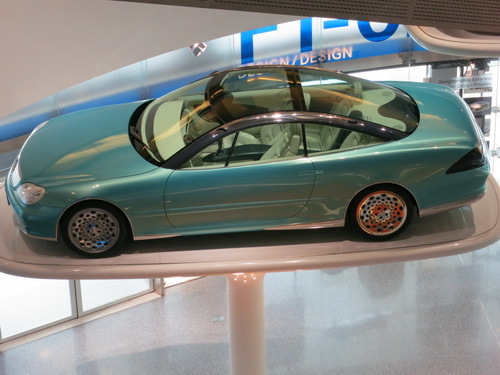 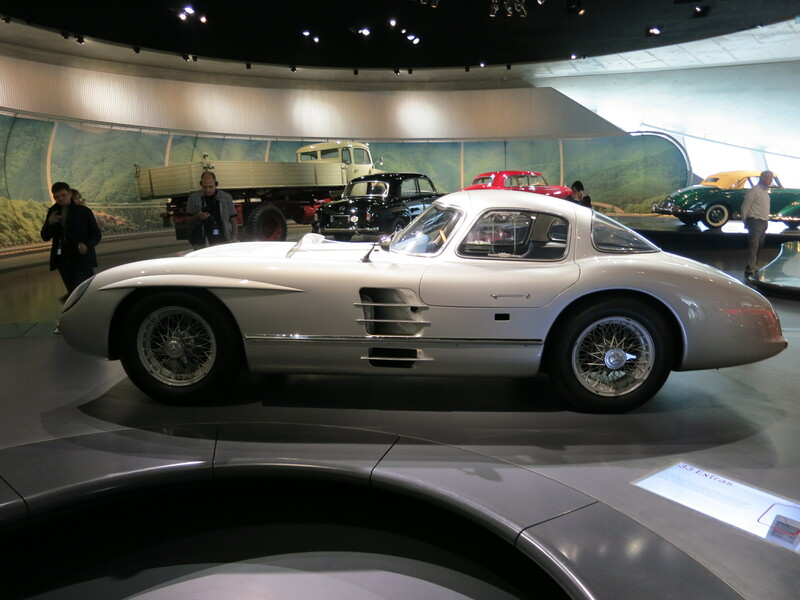 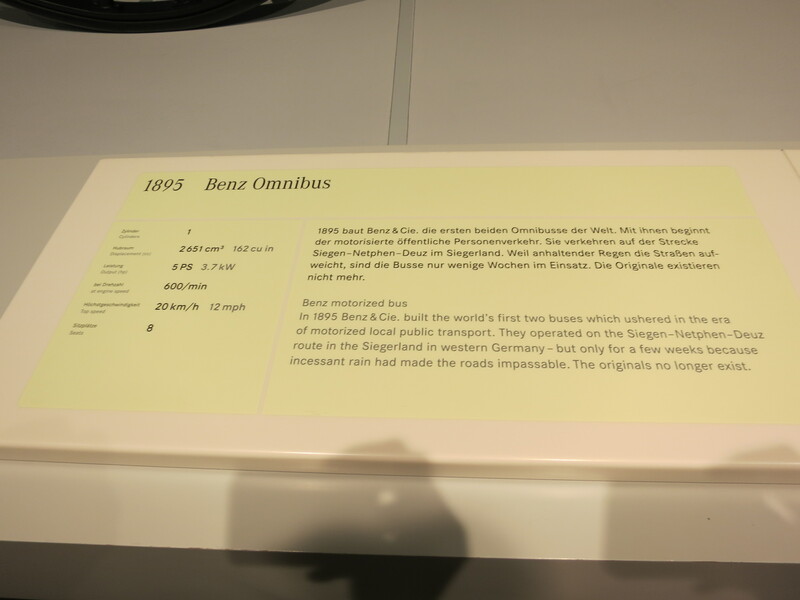 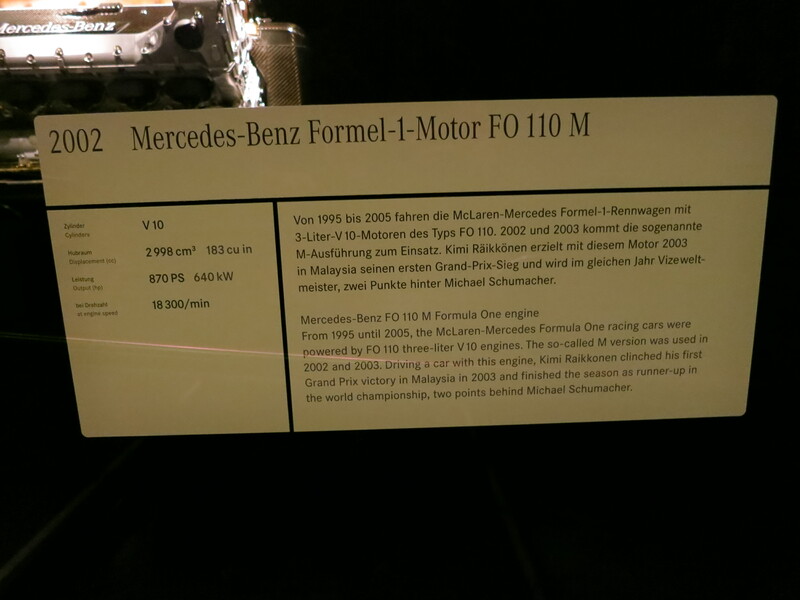 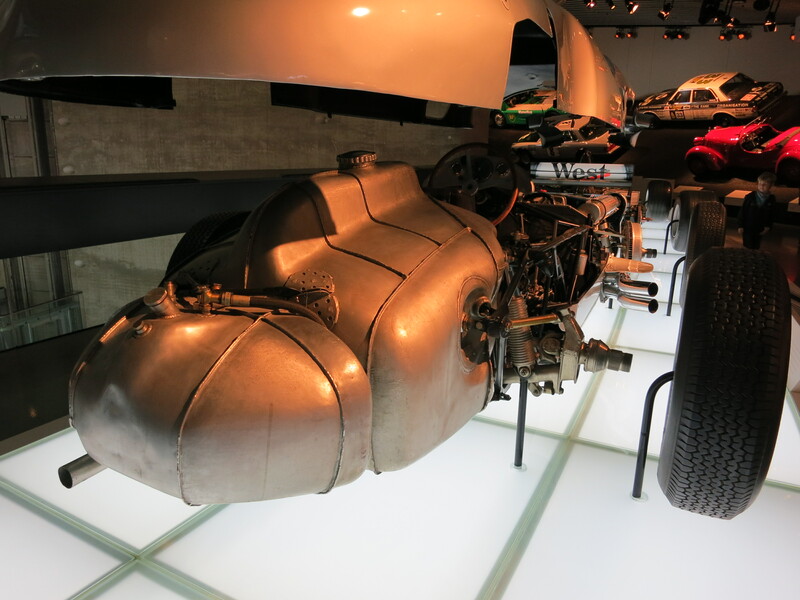 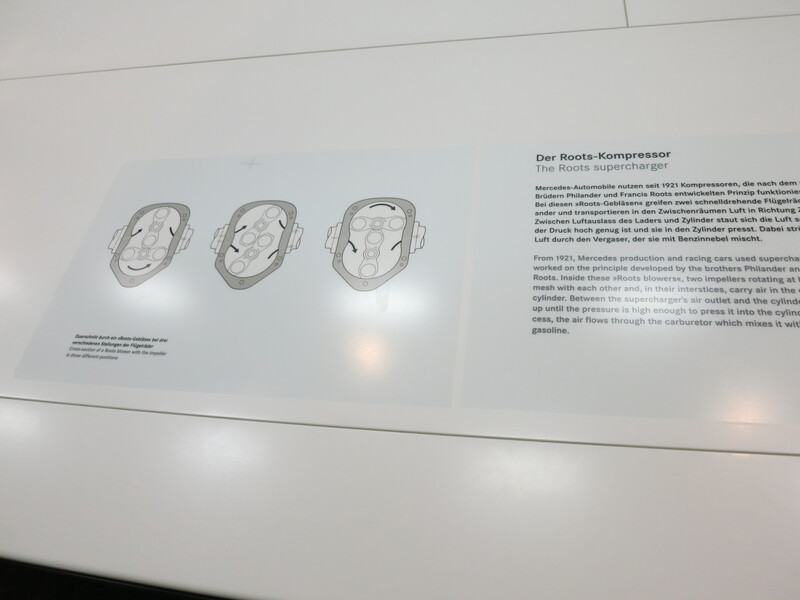 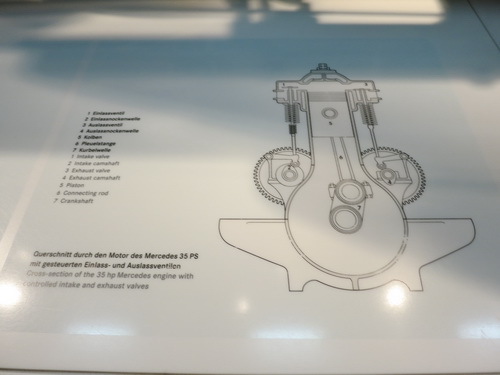 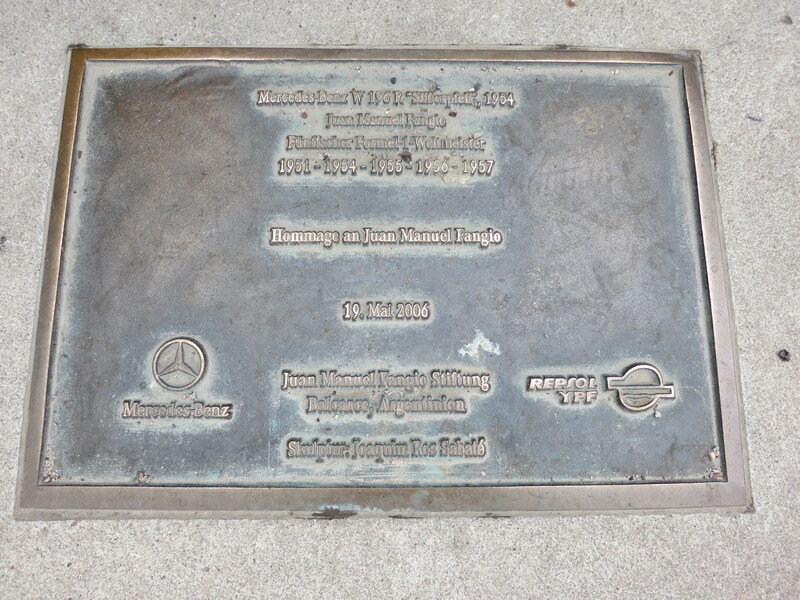 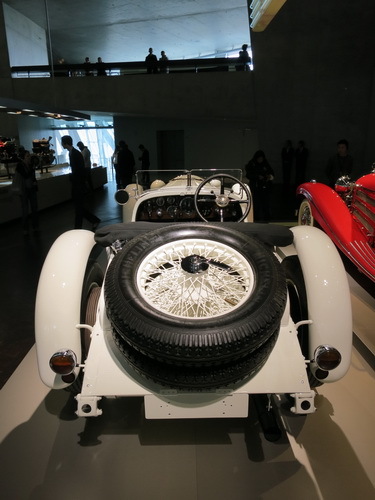 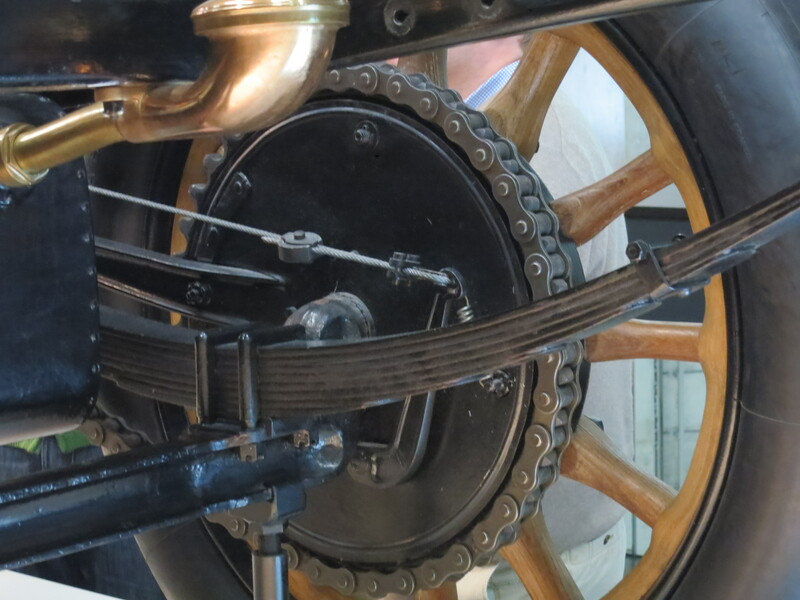 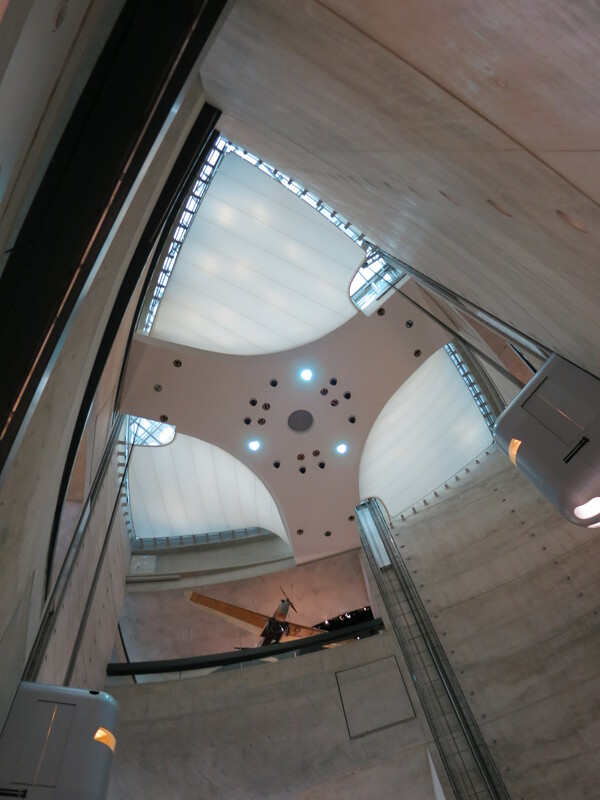 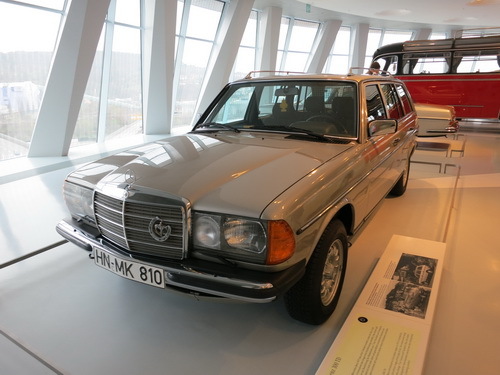 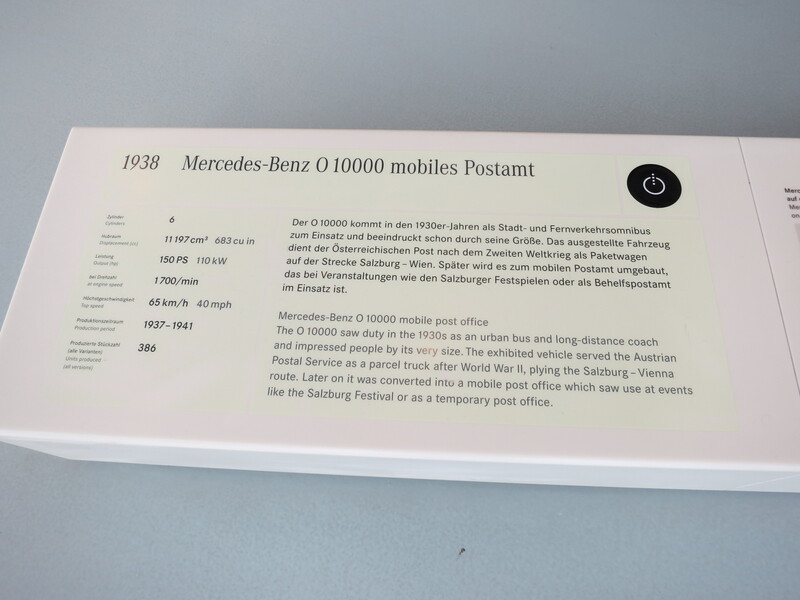 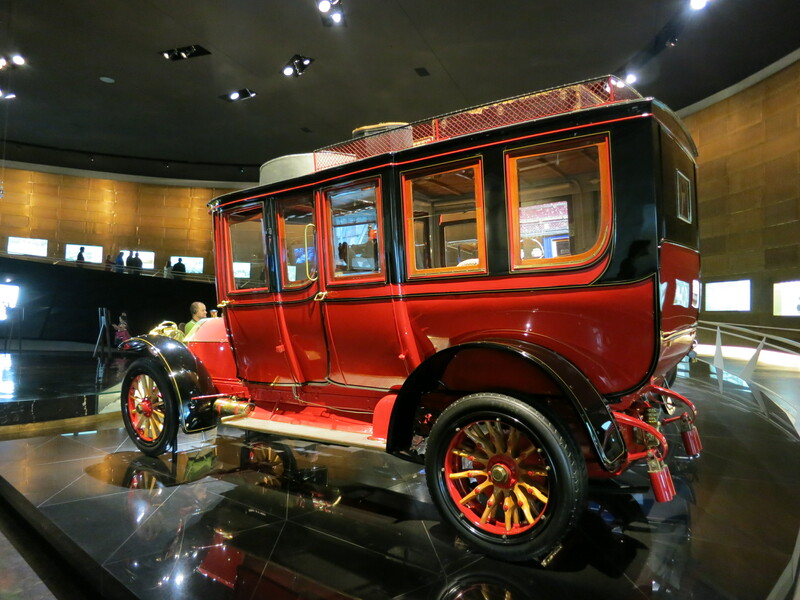 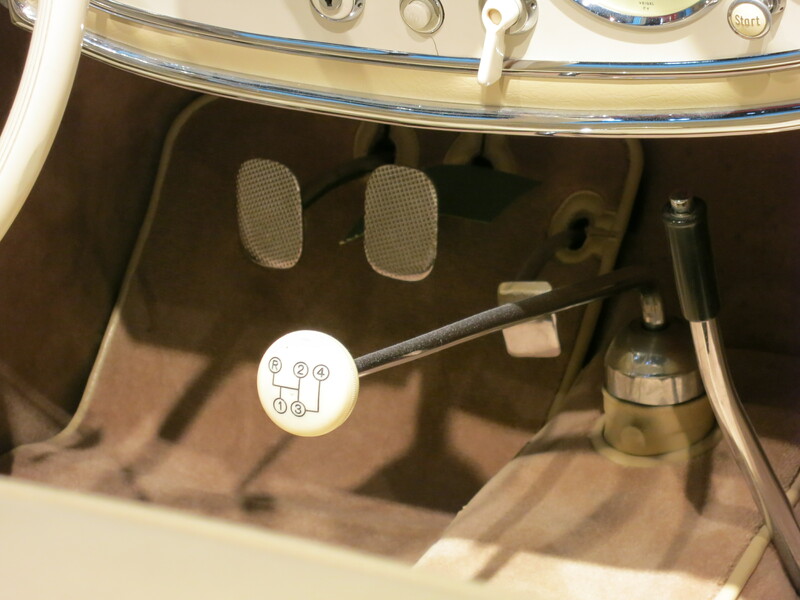 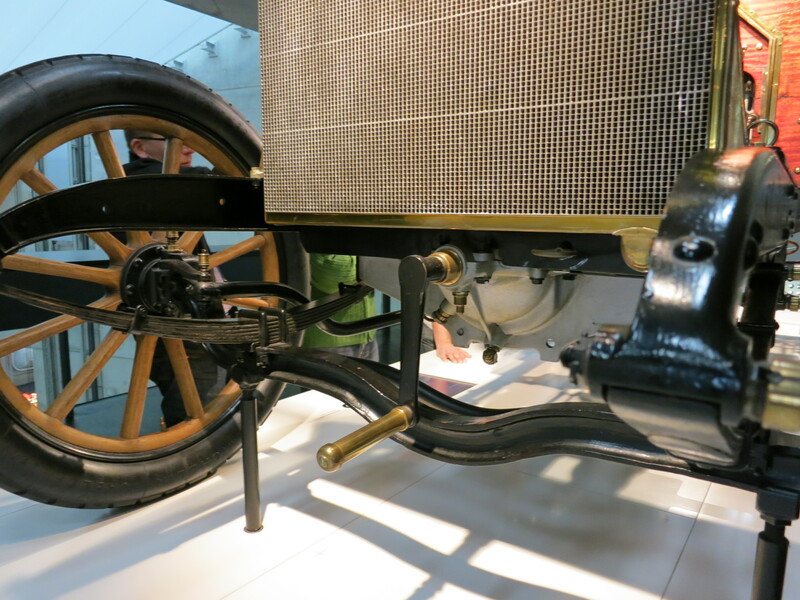 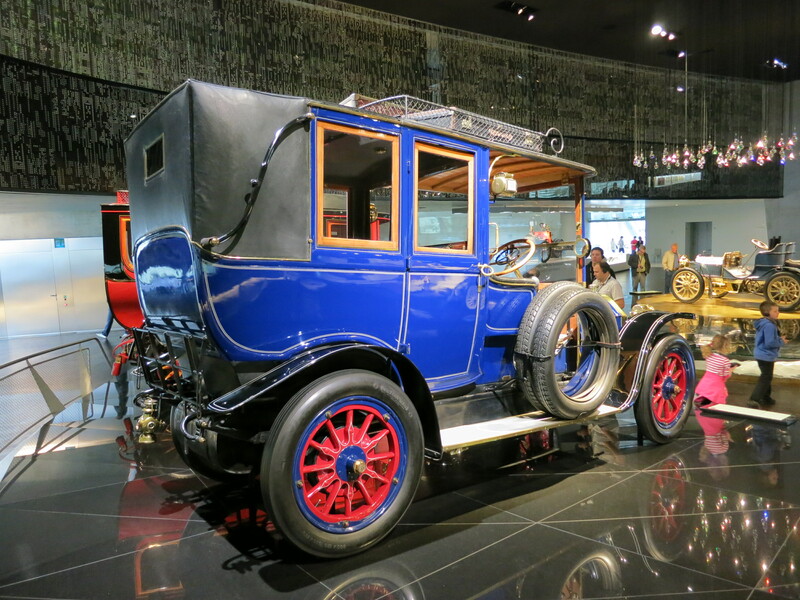 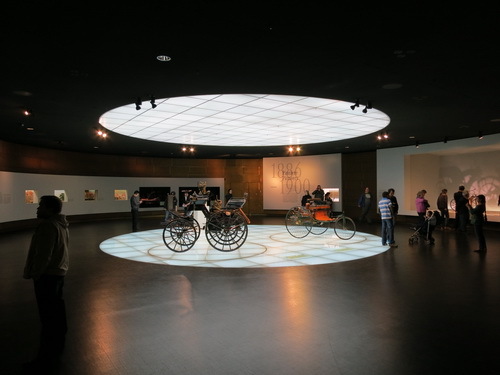 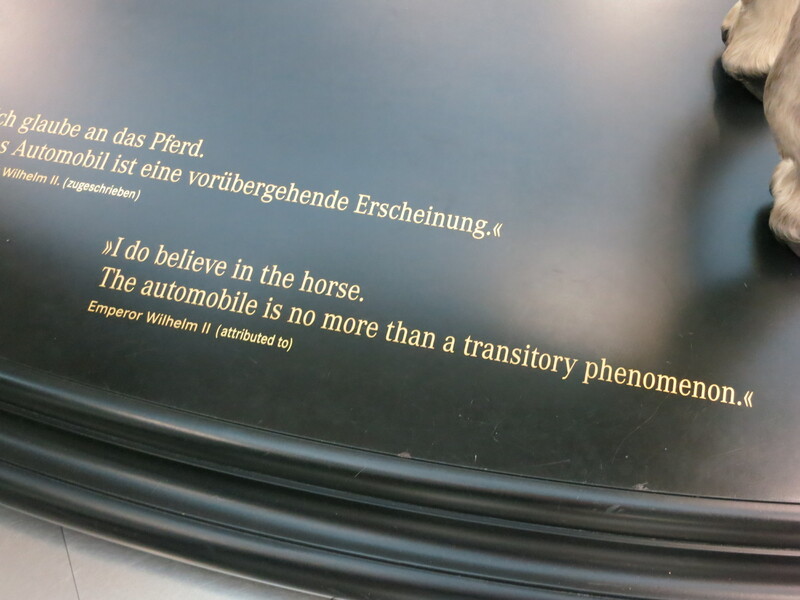 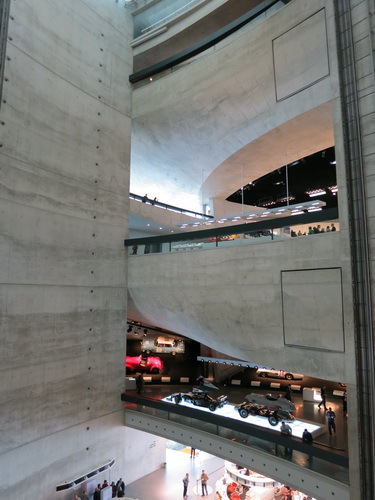 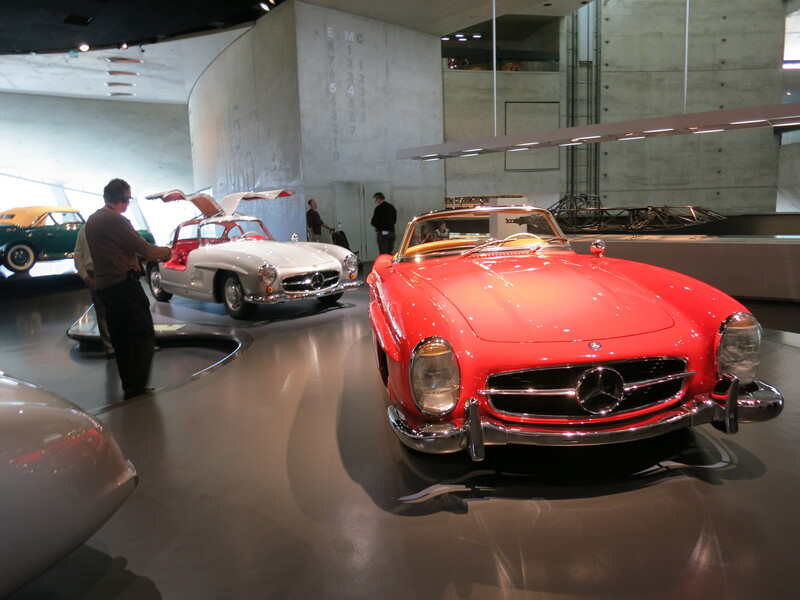 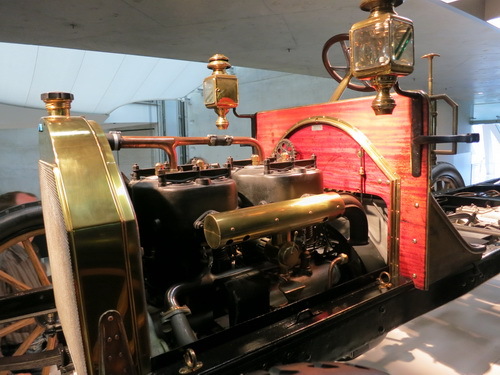 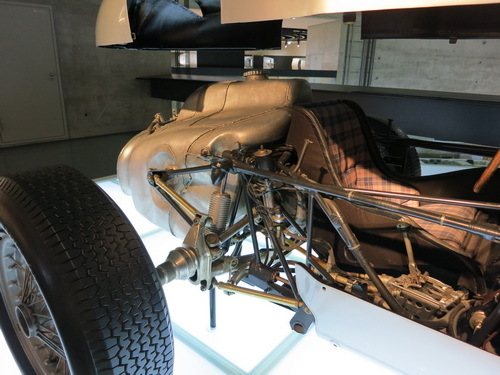 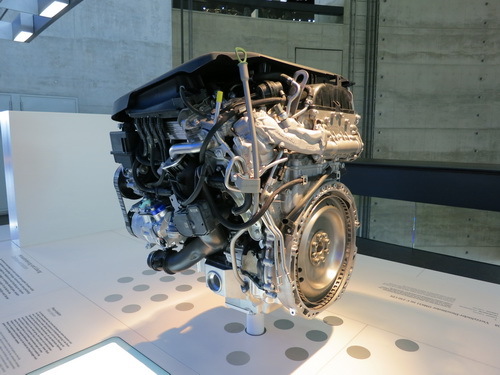 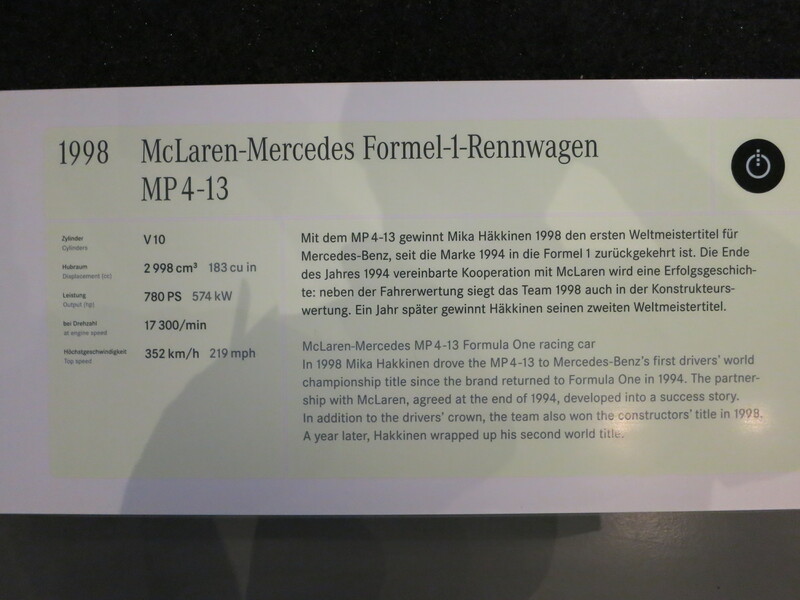 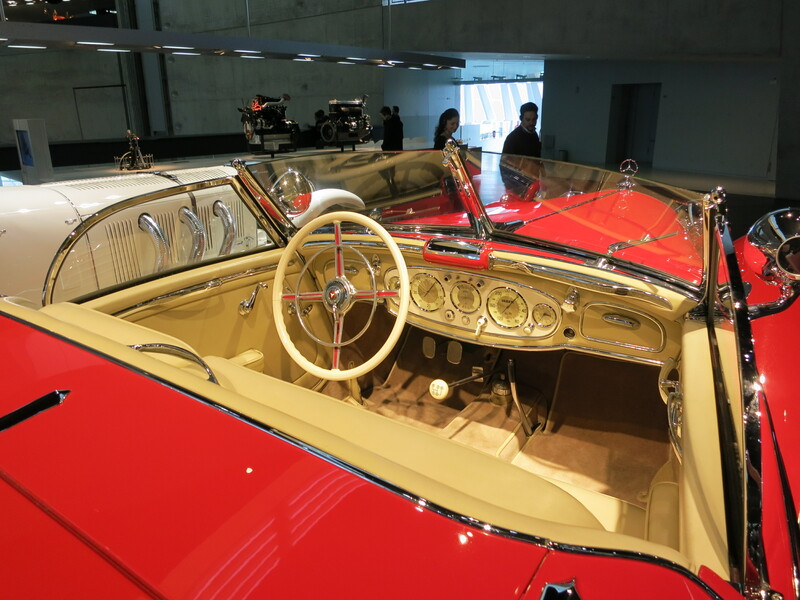 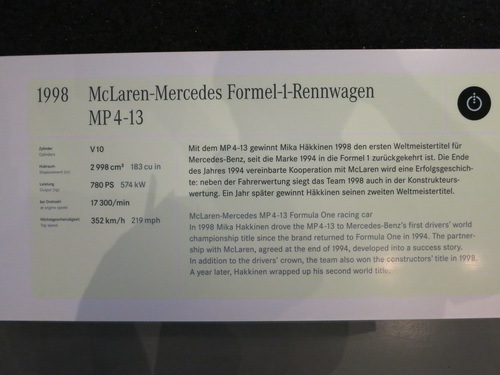 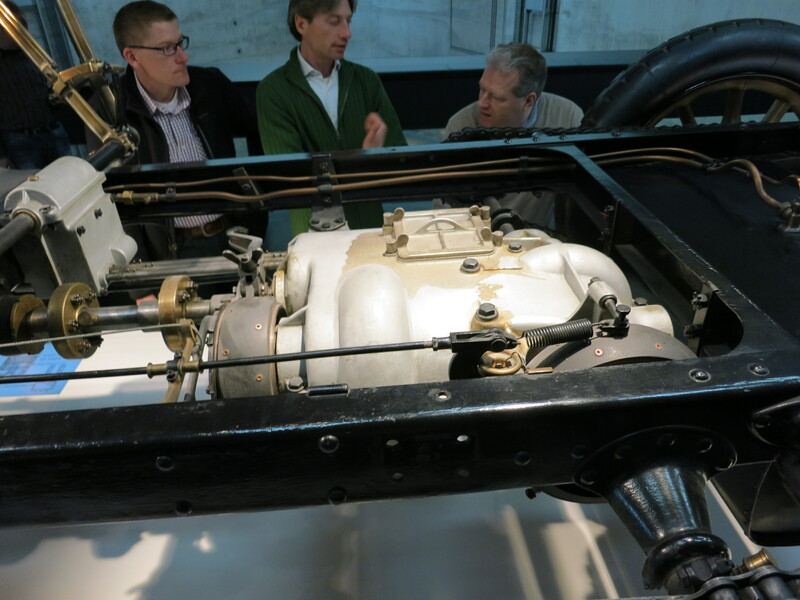 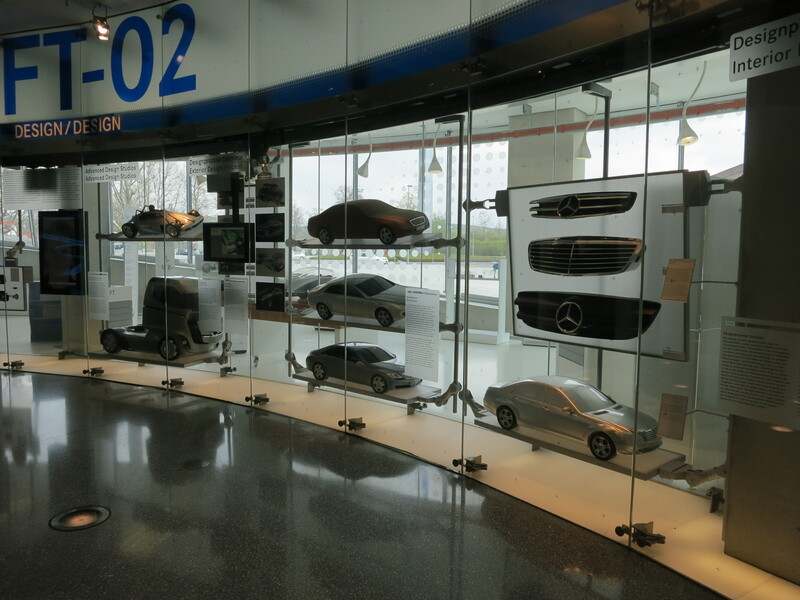 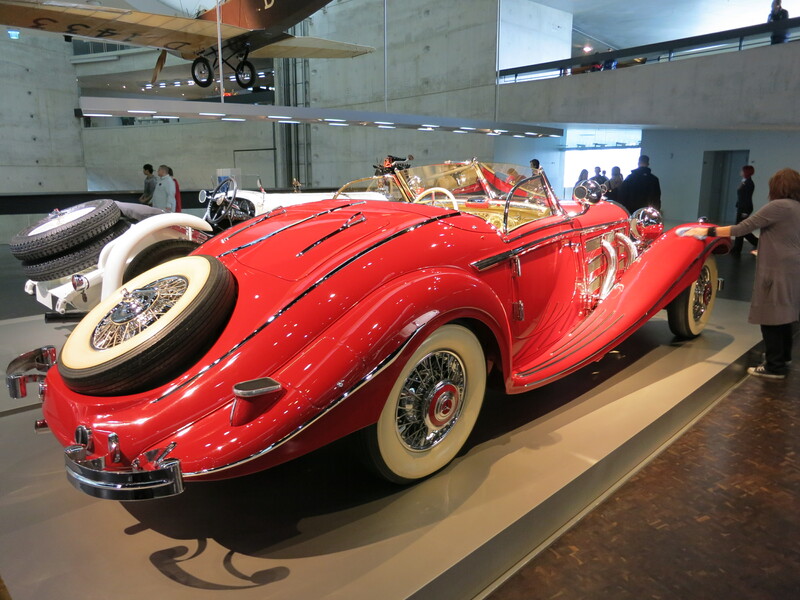 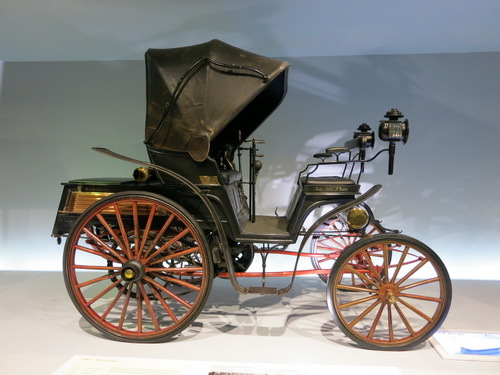 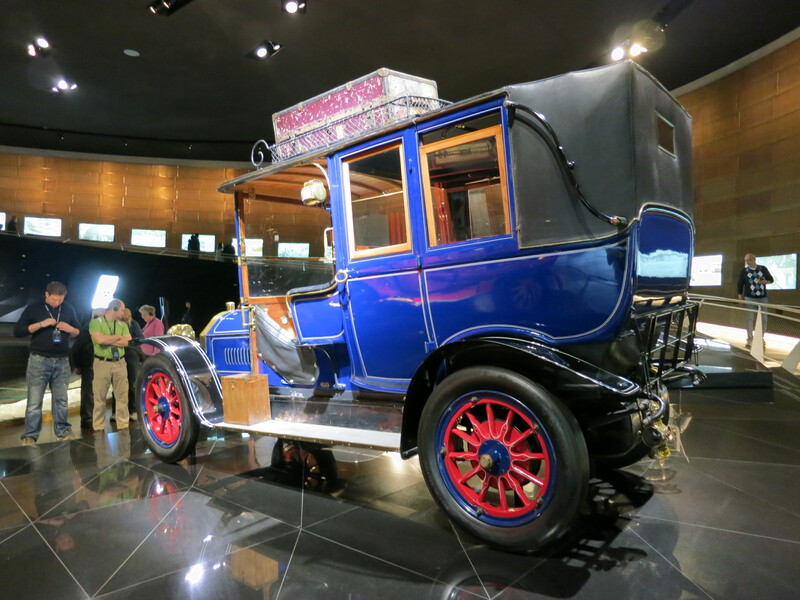 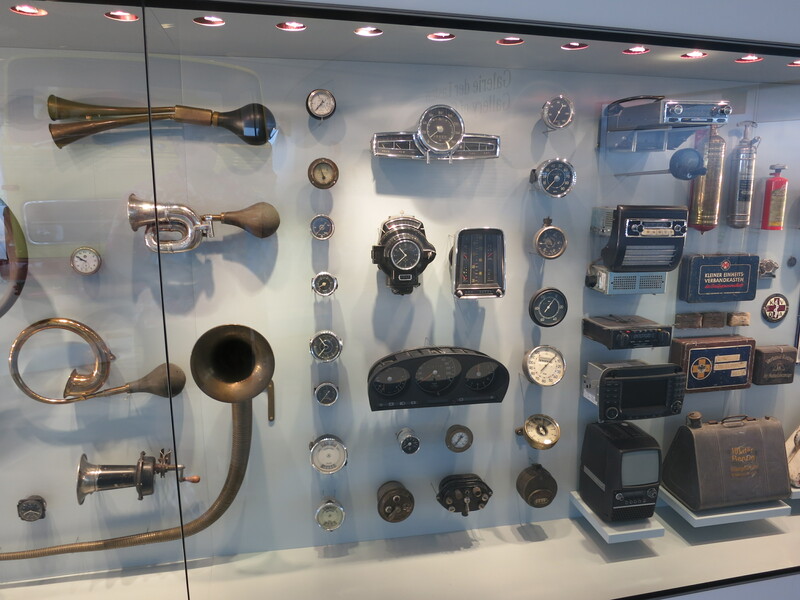 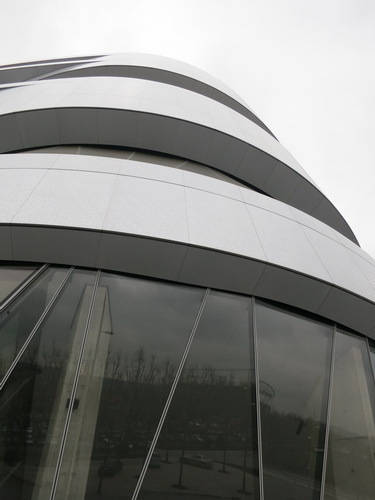 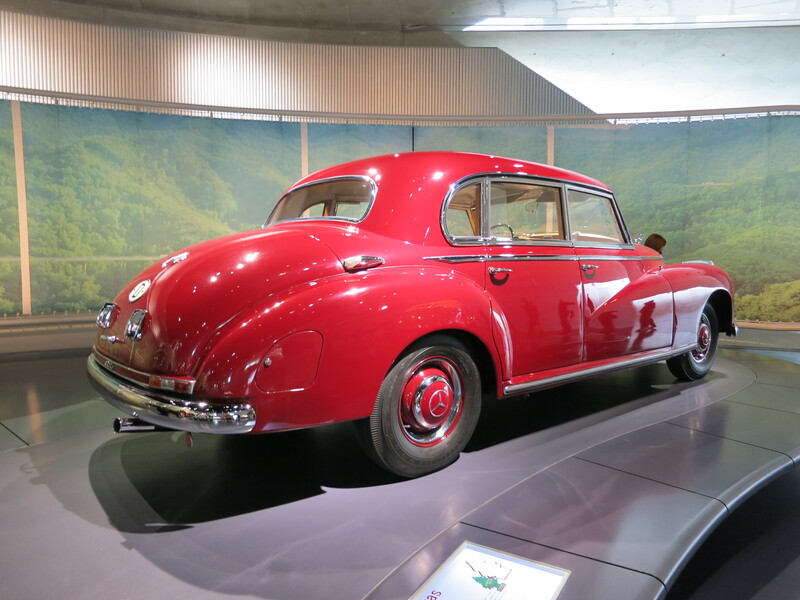 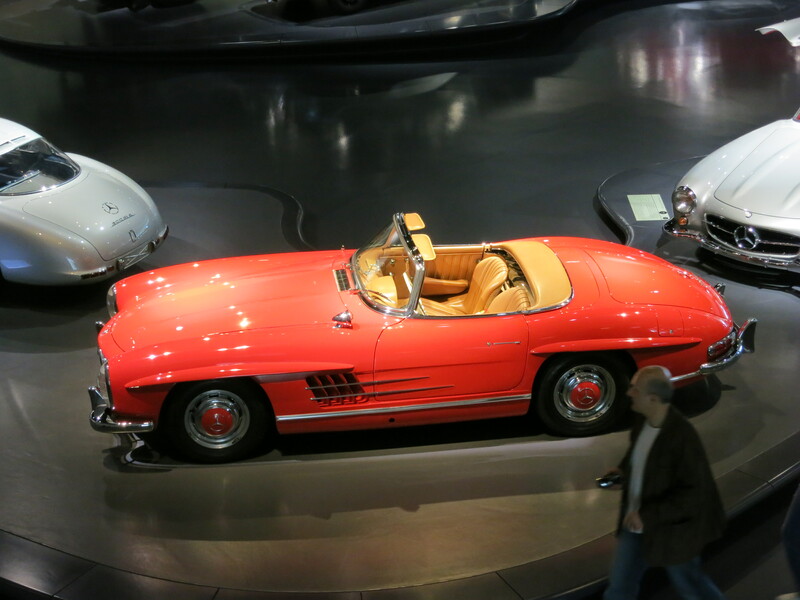 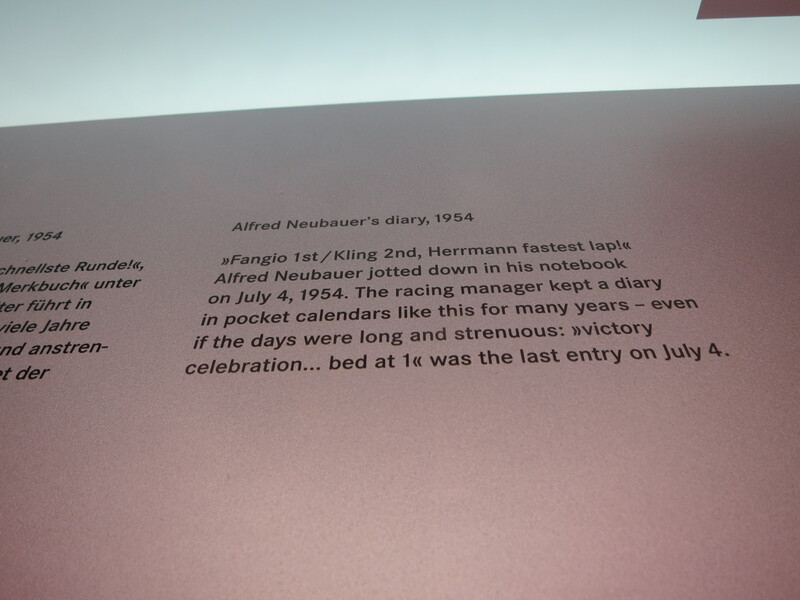 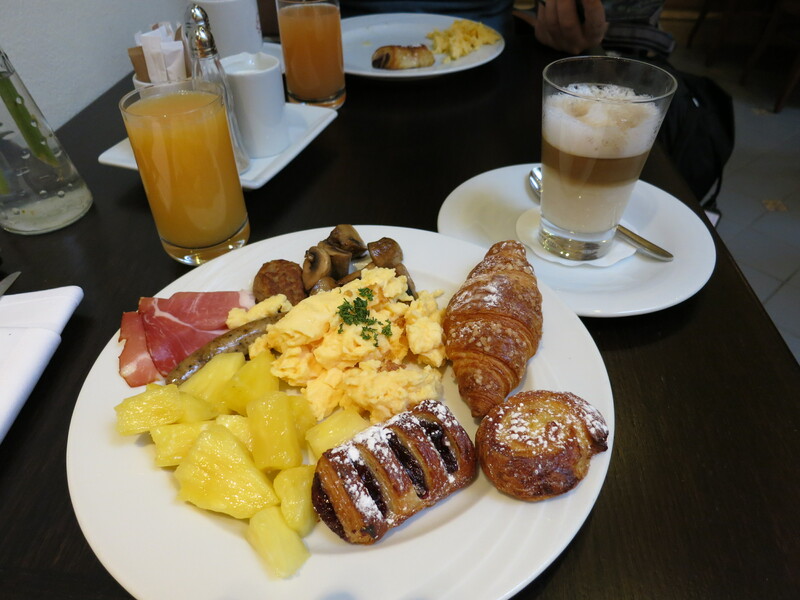 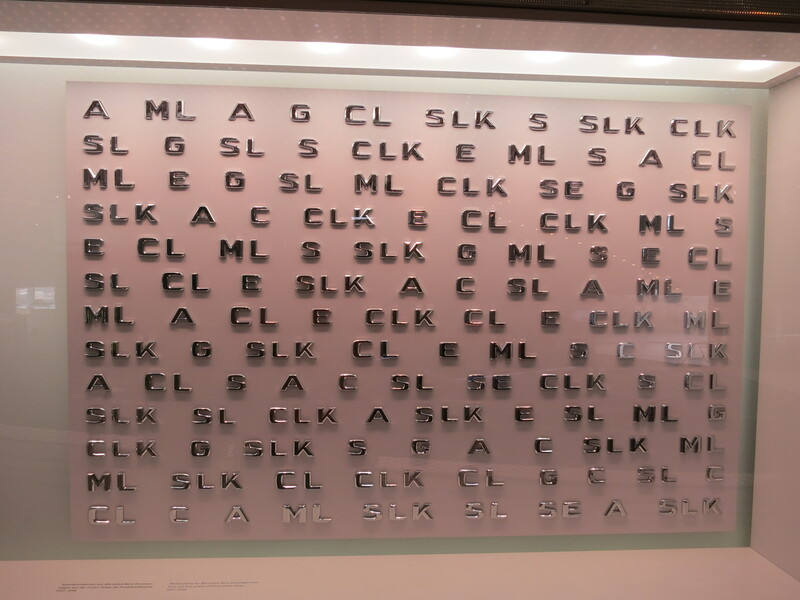 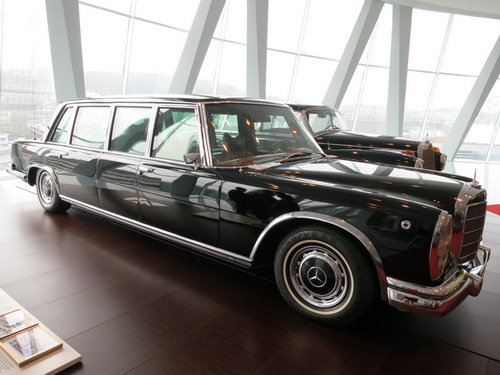 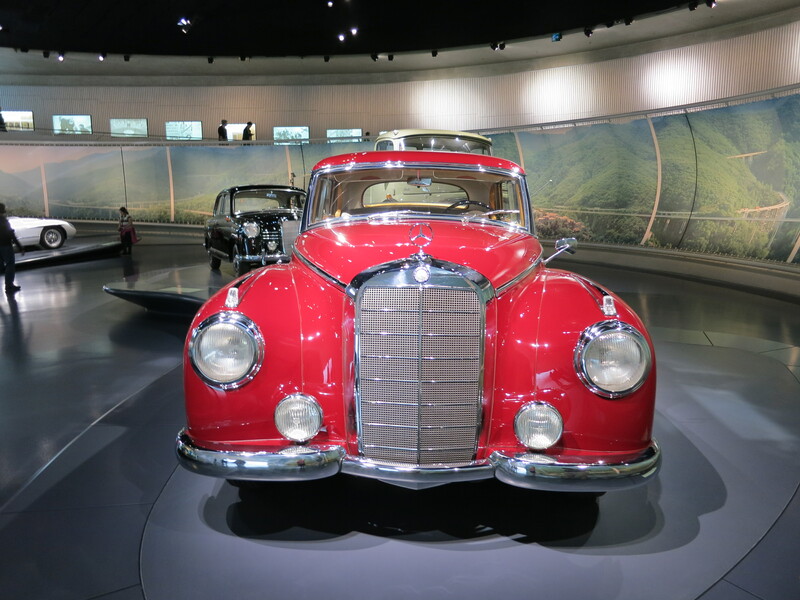 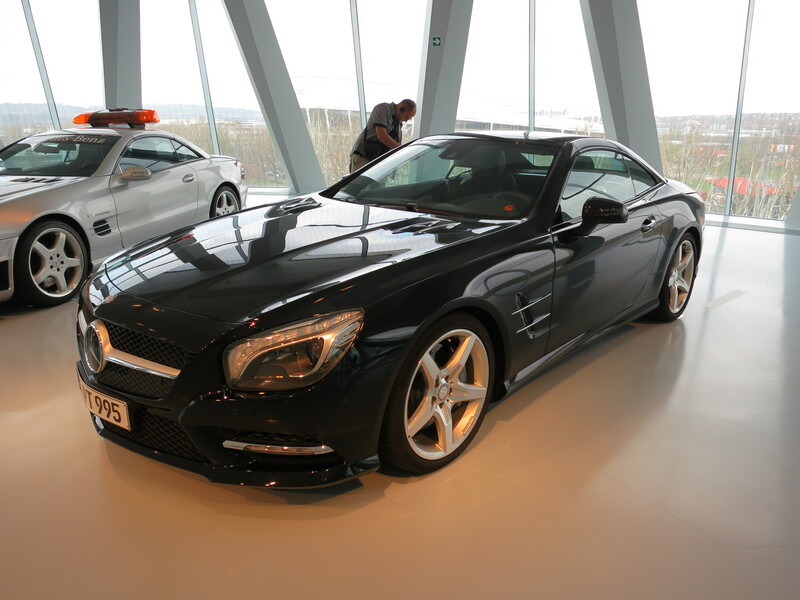 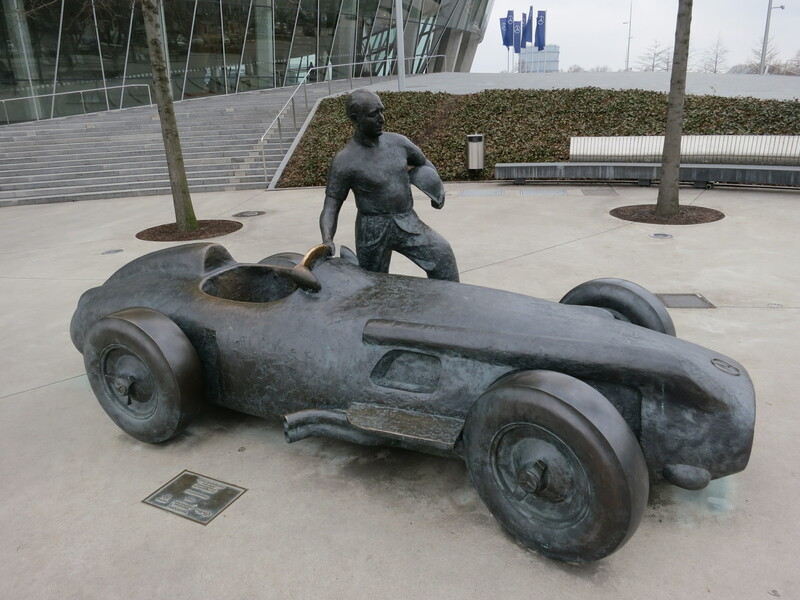 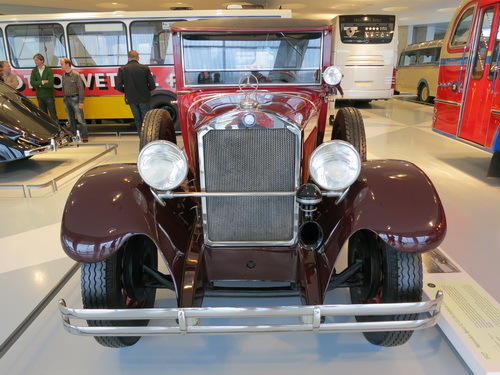 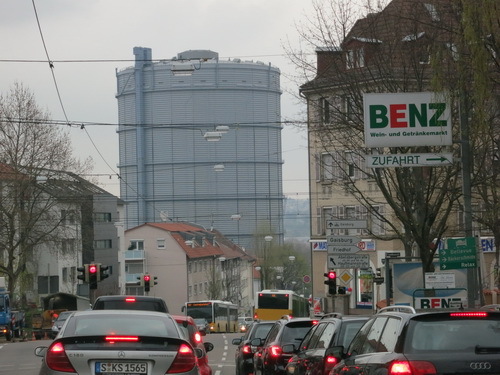 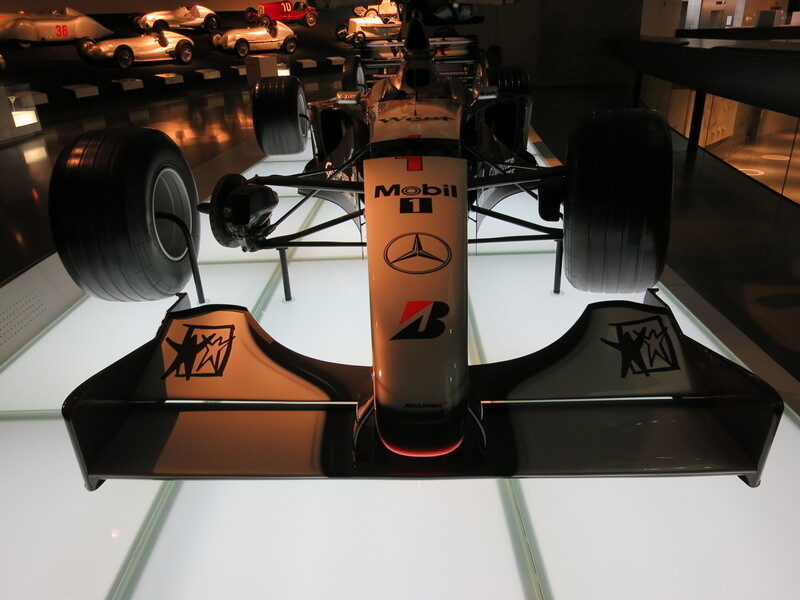 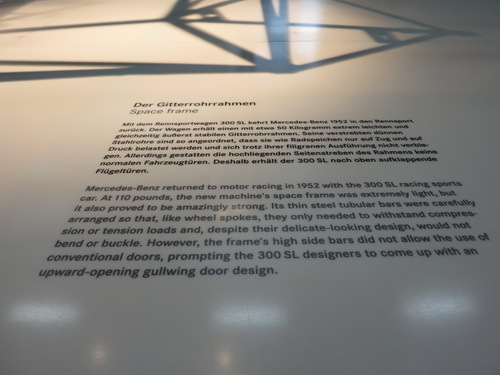 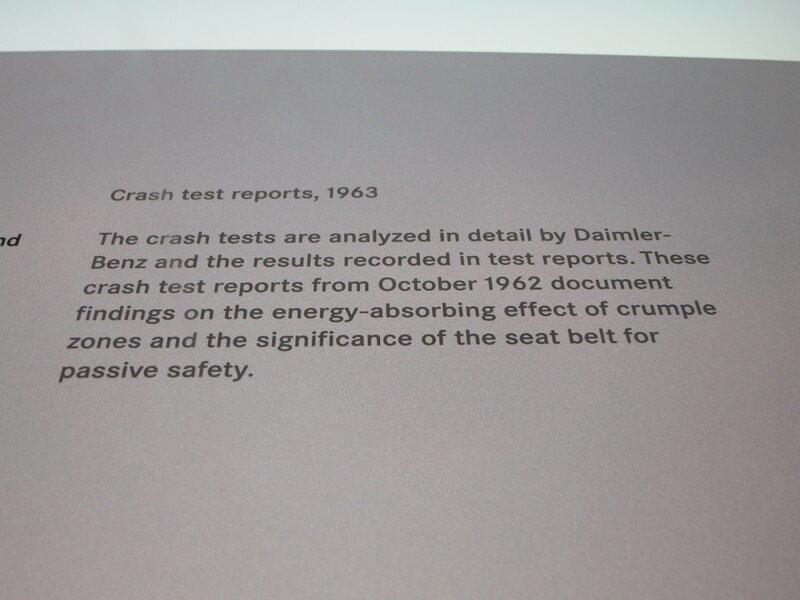 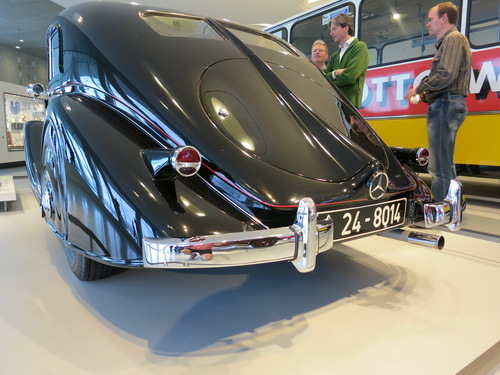 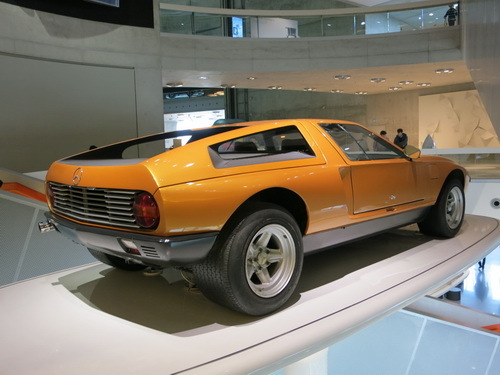 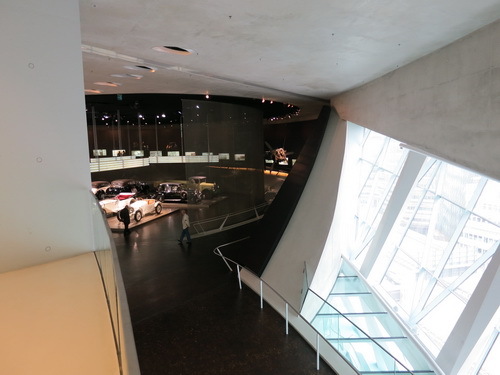 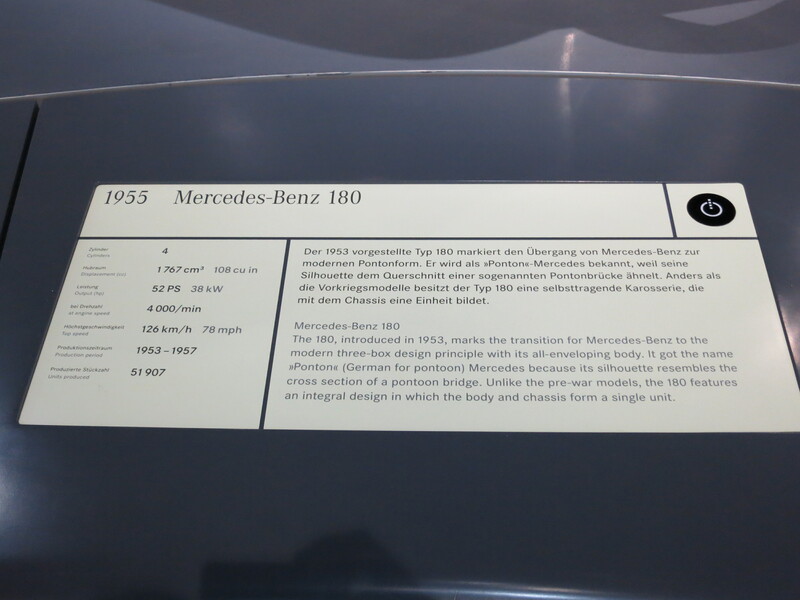 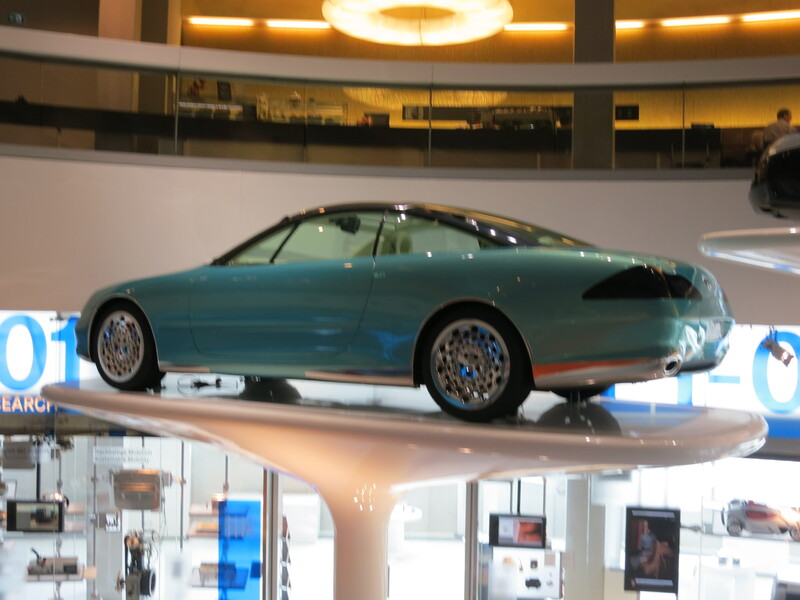 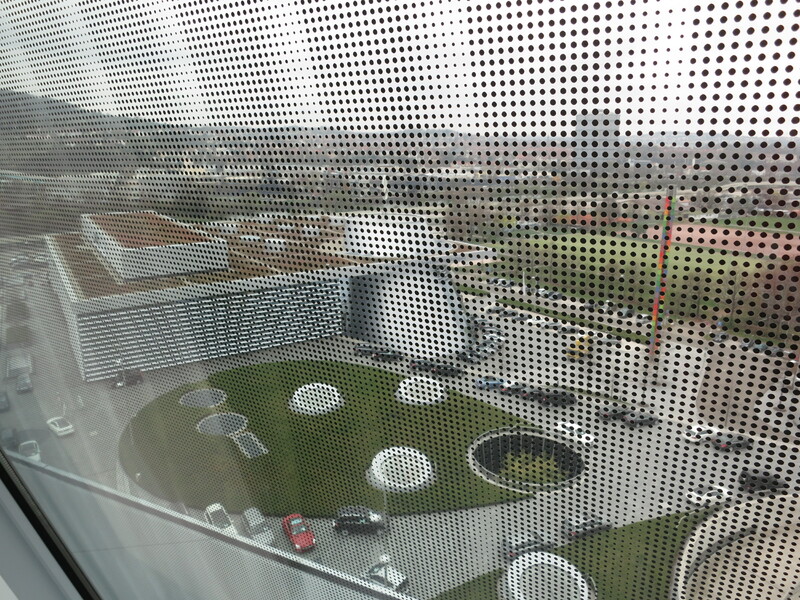 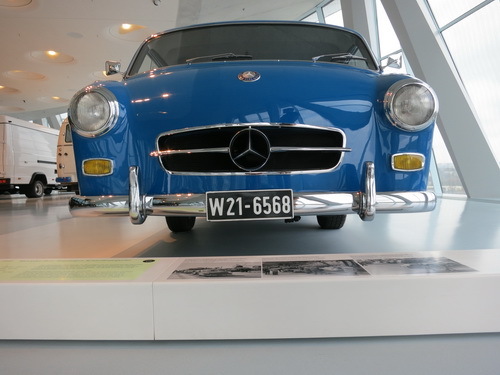 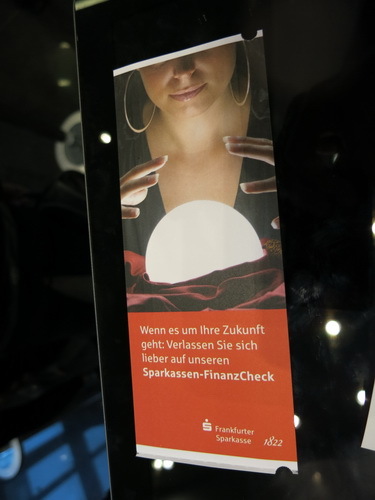 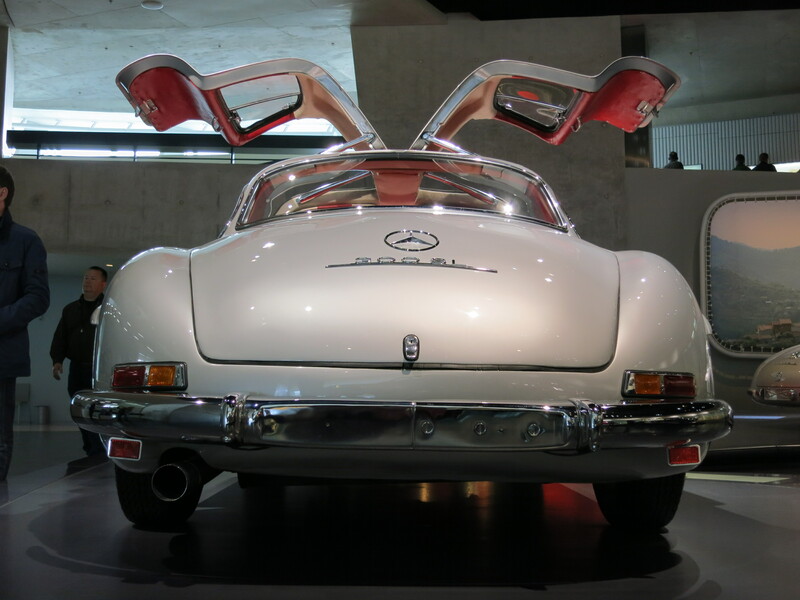 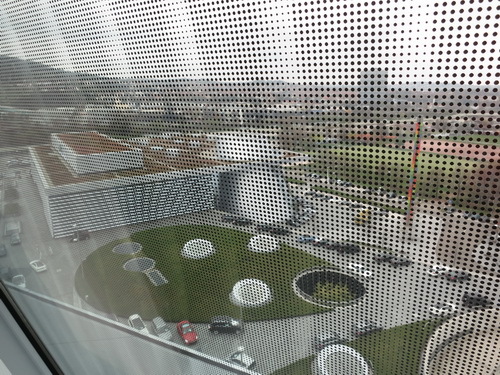 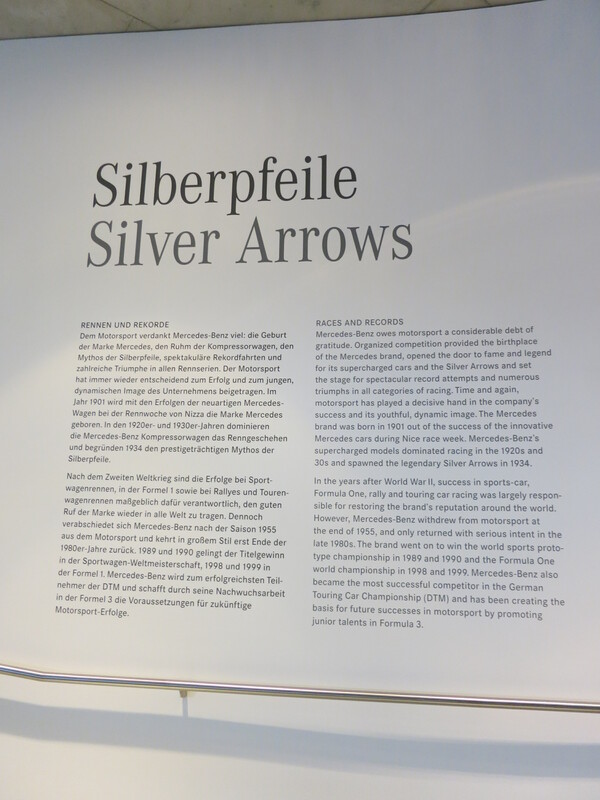 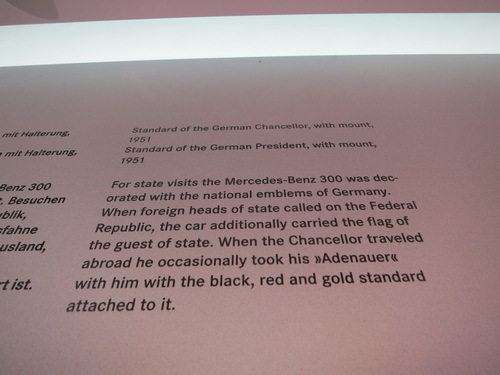 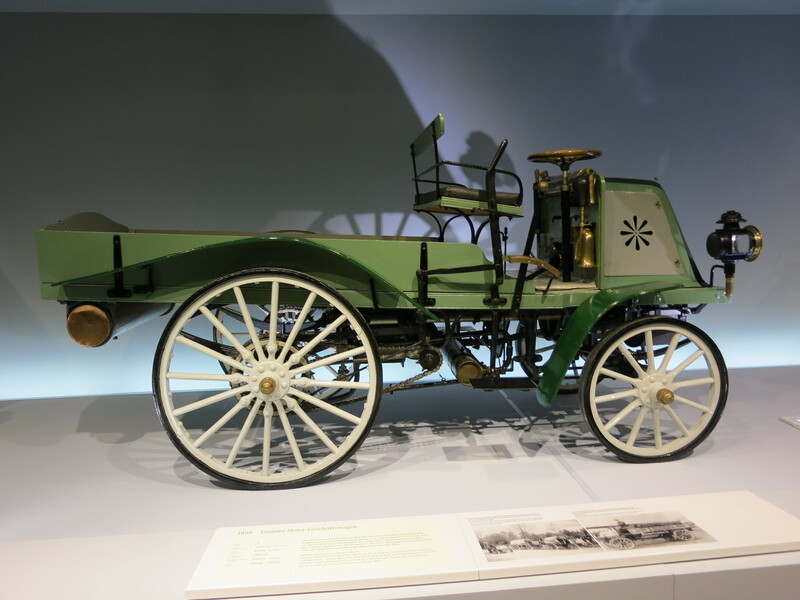 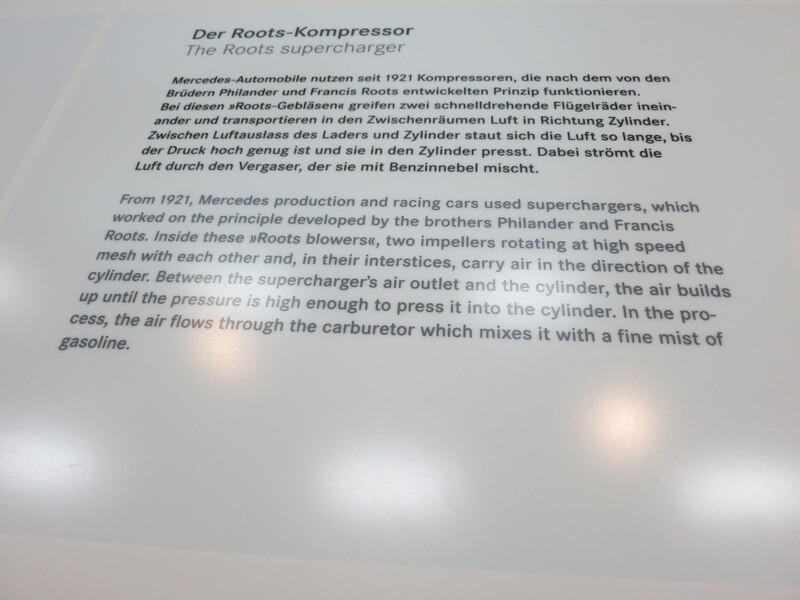 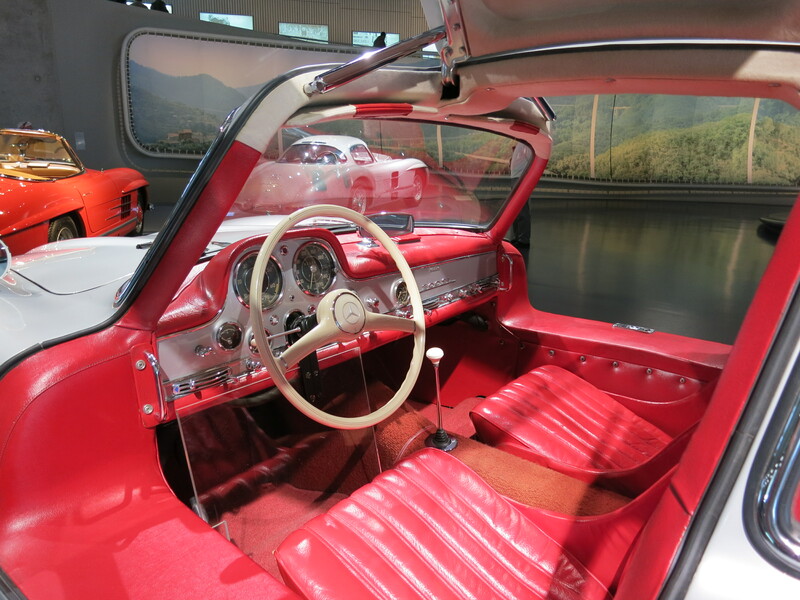 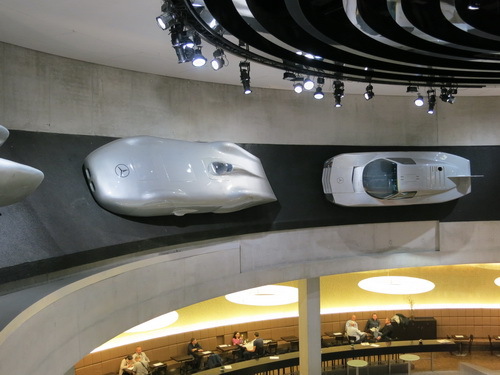 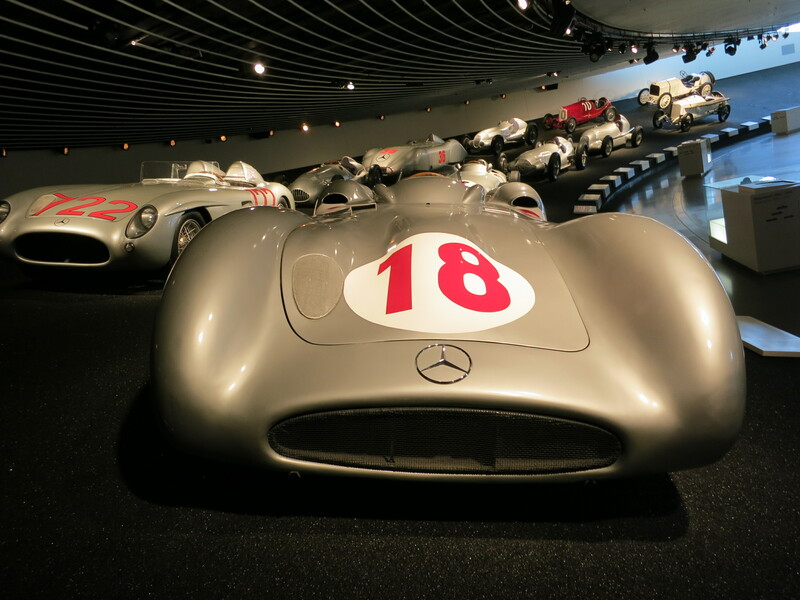 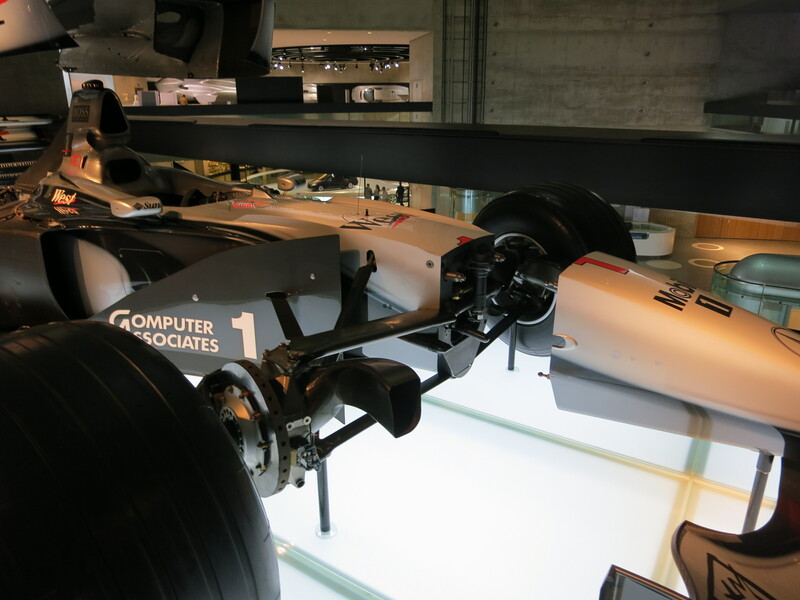 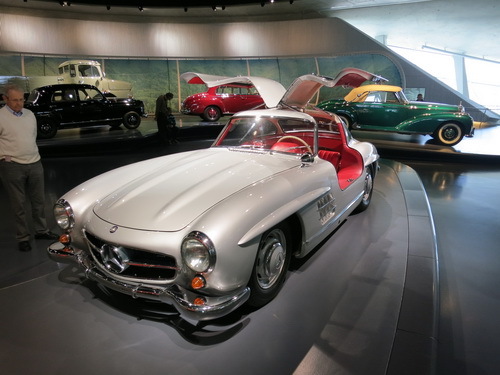 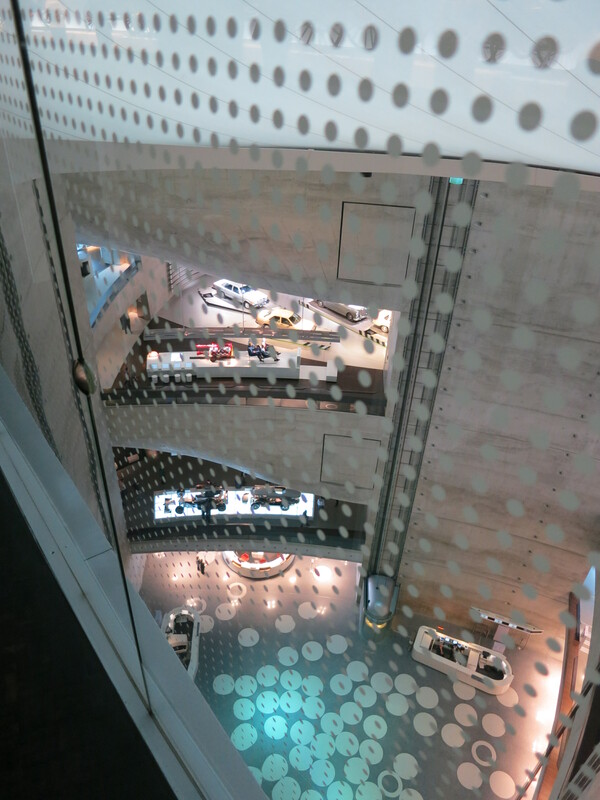 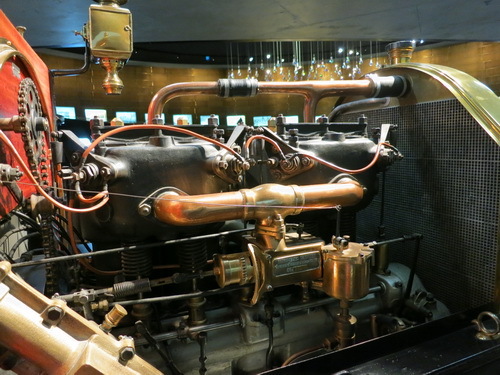 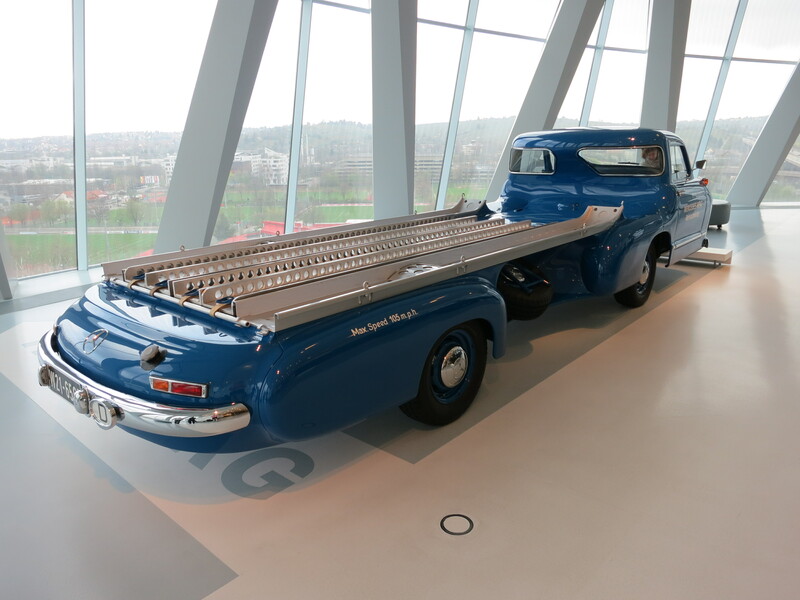 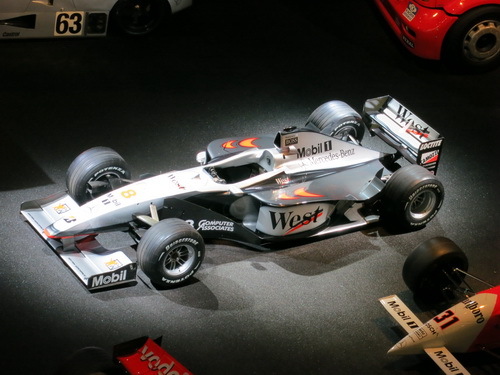 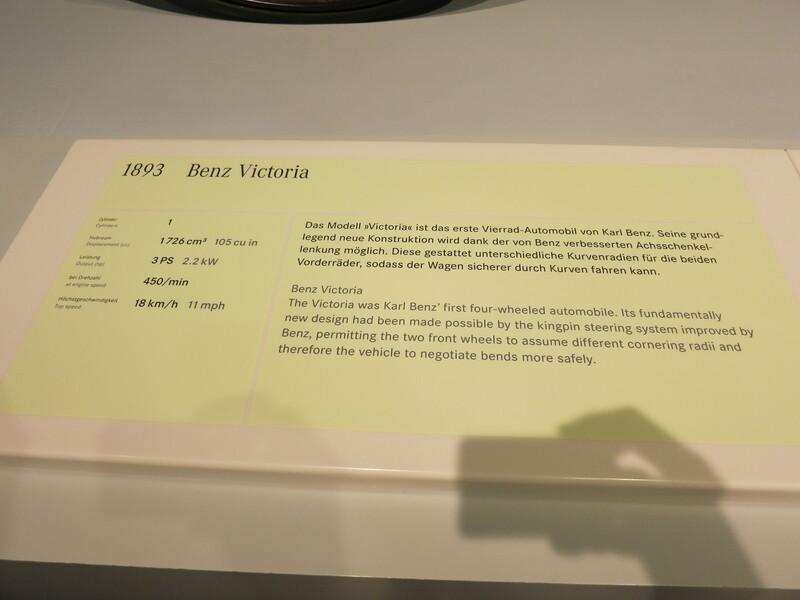 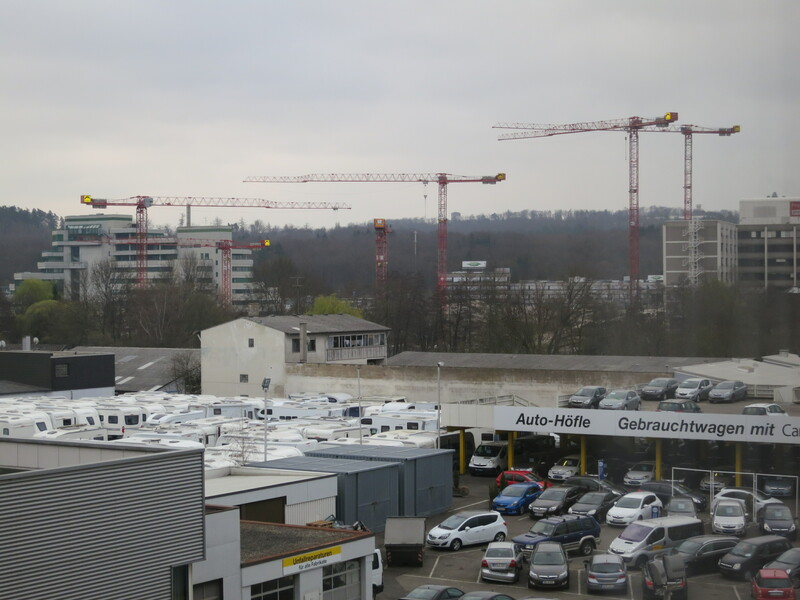 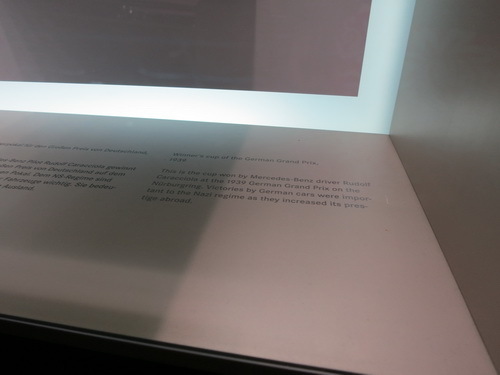 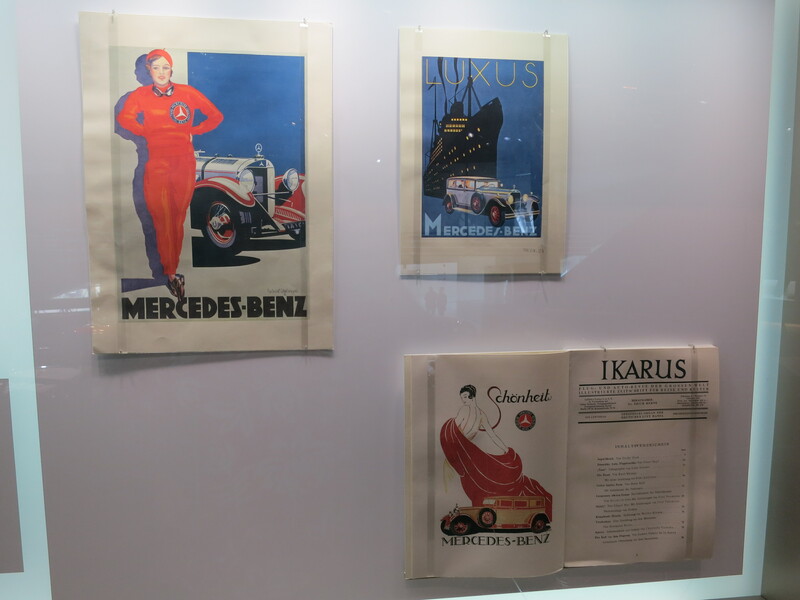 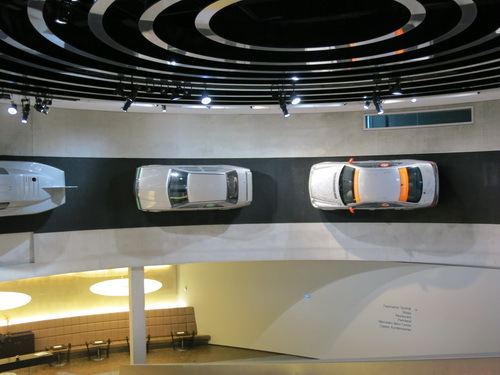 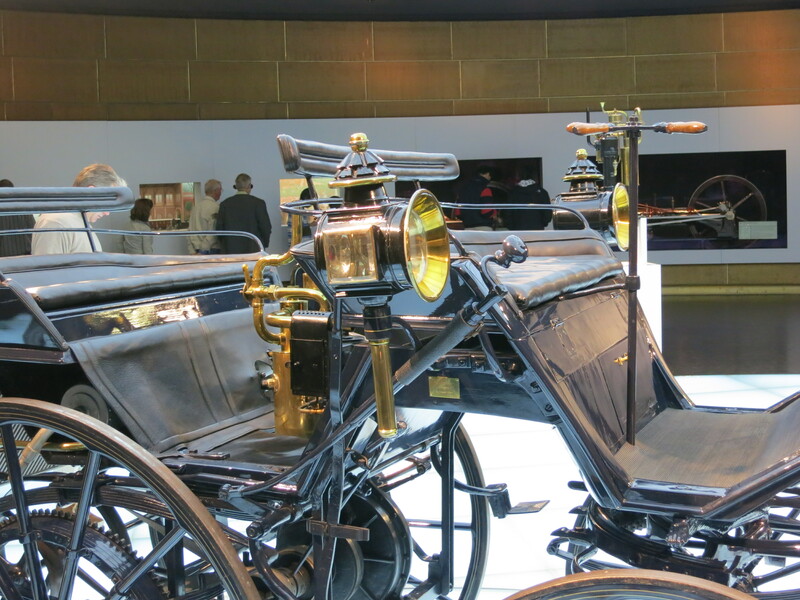 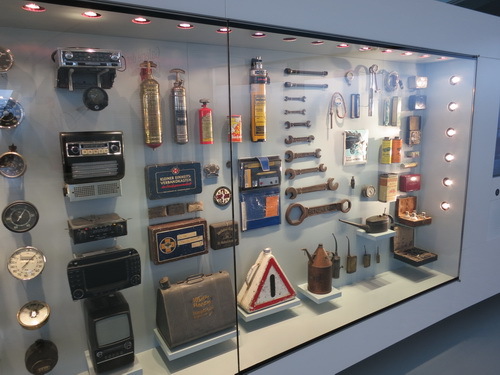 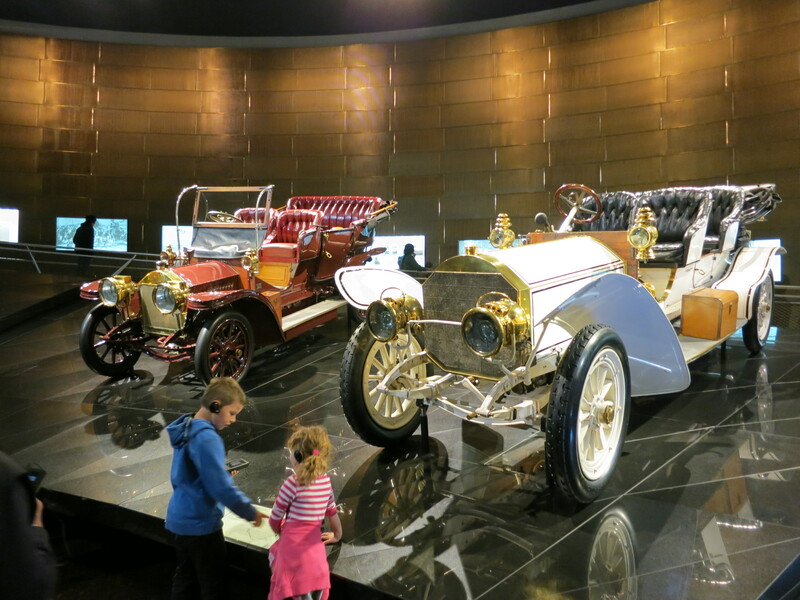 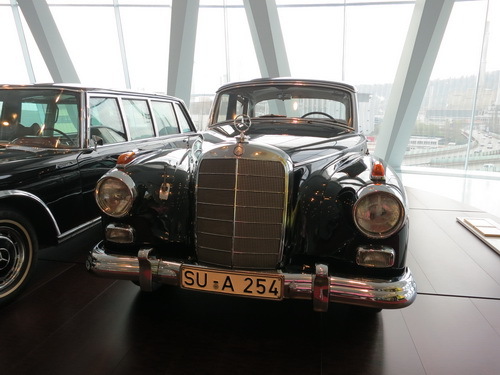 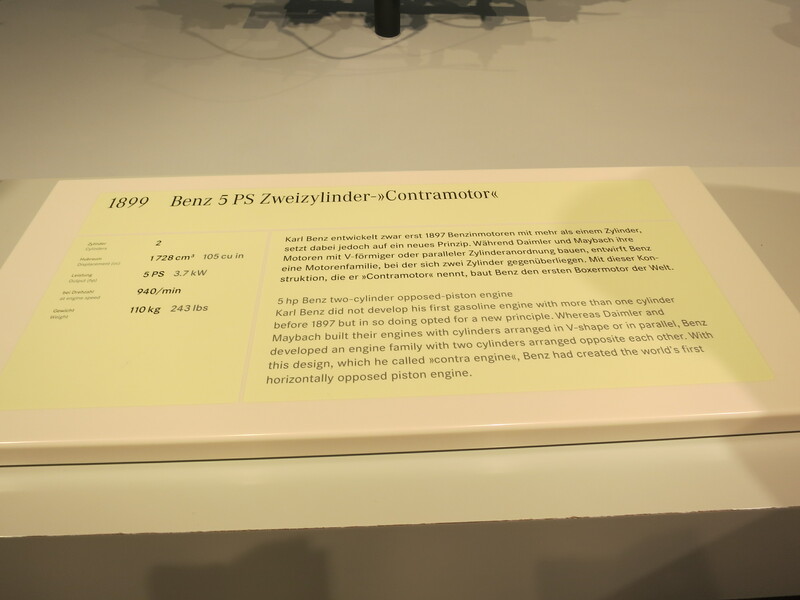 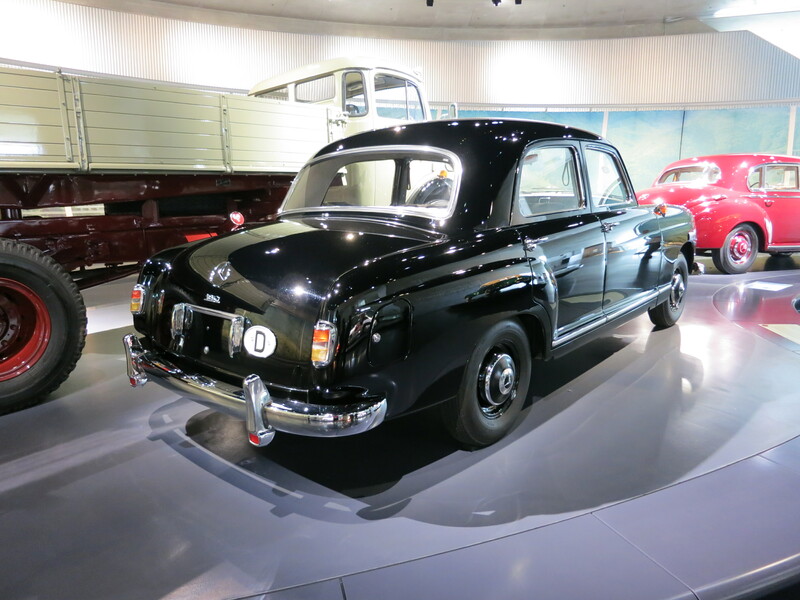 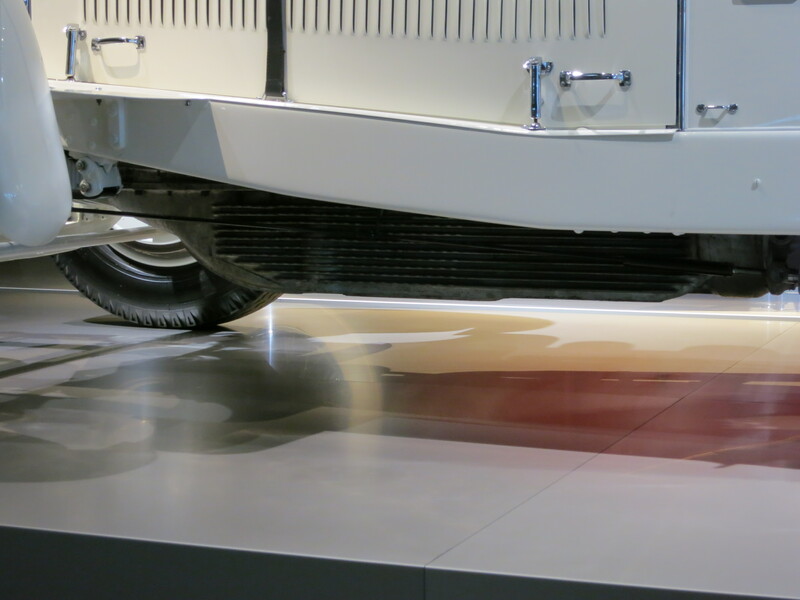 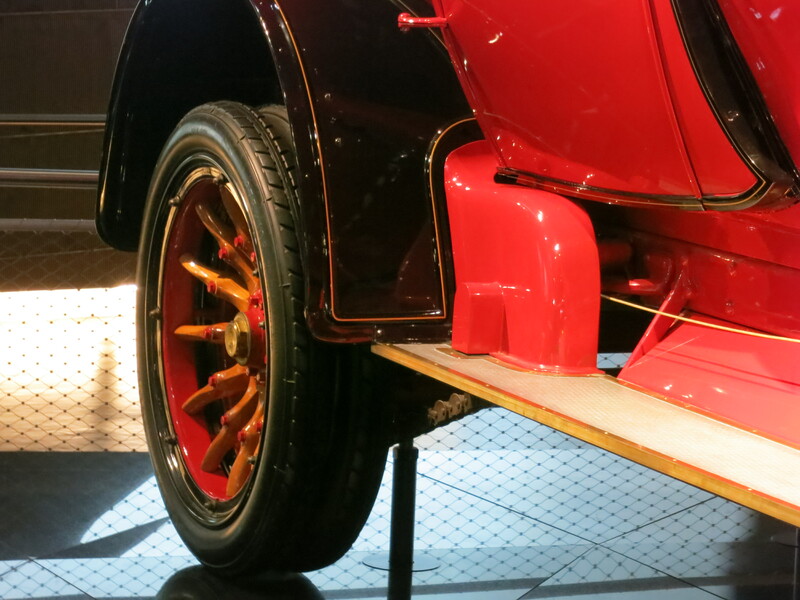 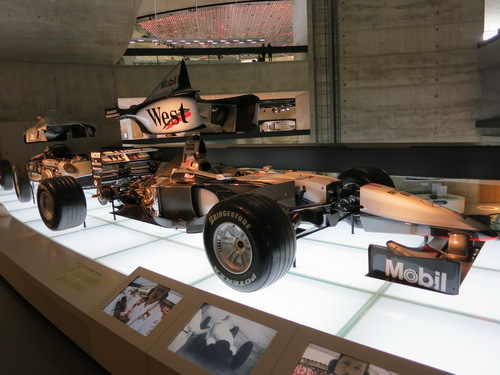 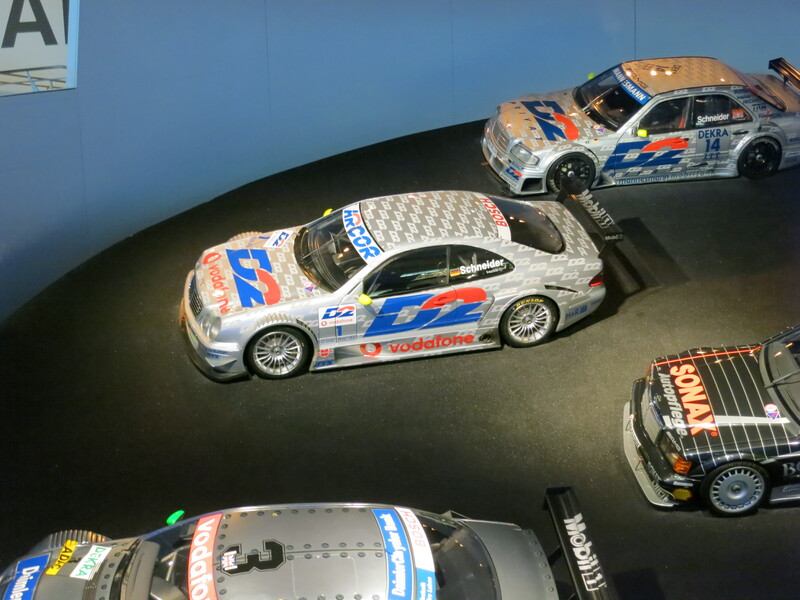 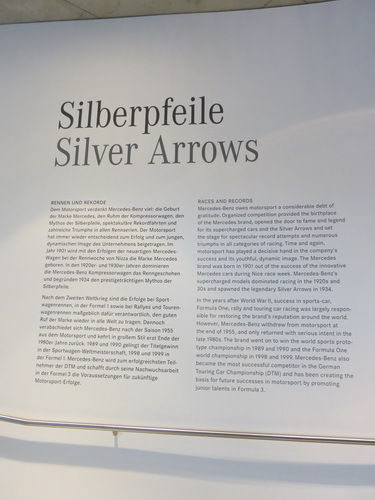 We got up early for breakfast and then drove the ~30 minutes to the Mercedes-Benz Museum on the outskirts of Stuttgart. Arriving just before 10:00 a.m., we spent almost exactly 3 hours -- the collection was endlessly fascinating. 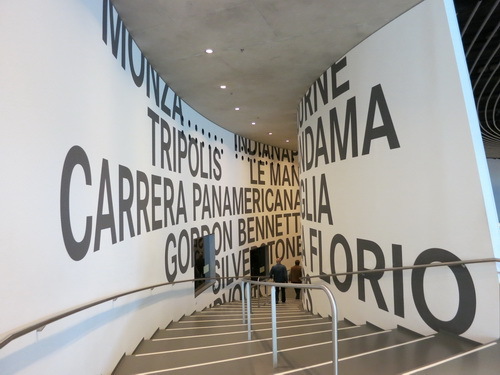 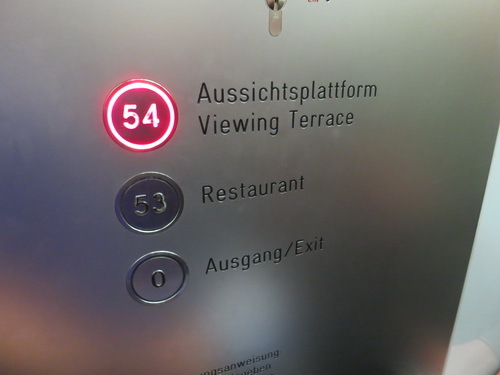 You take an elevator ride up to the 7th floor and then slowly make your way down. 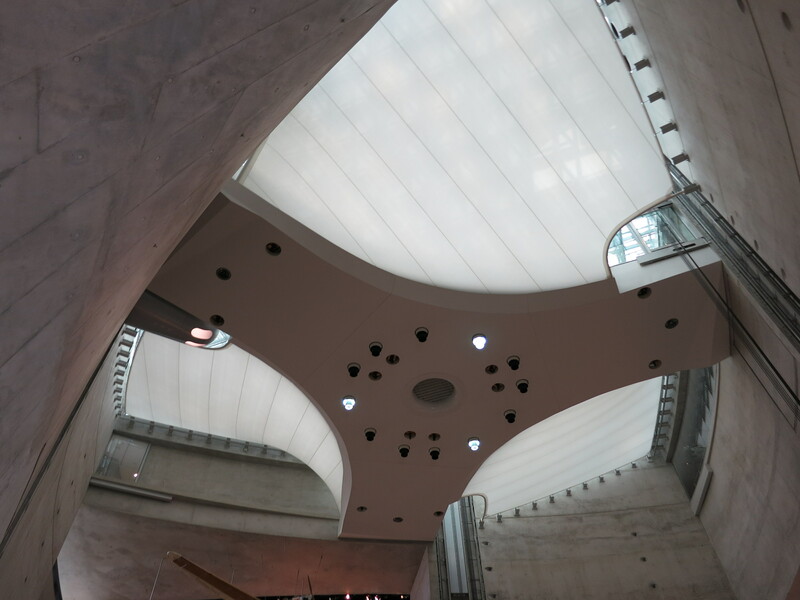 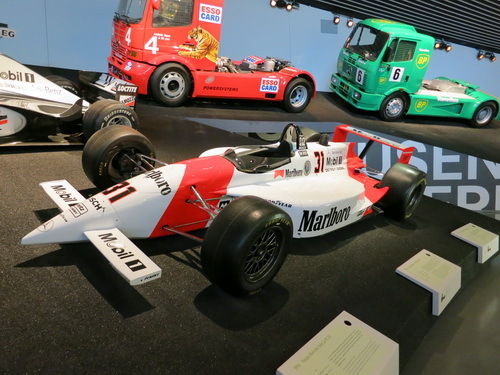 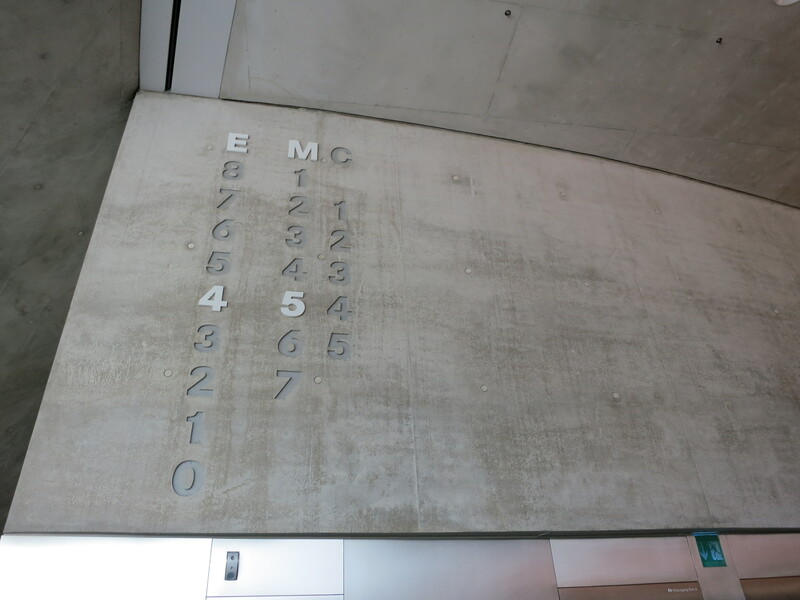 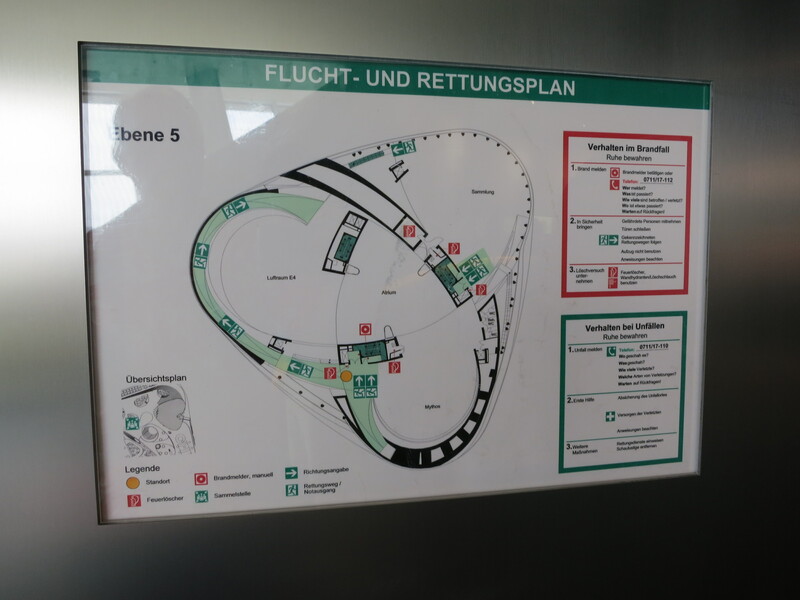 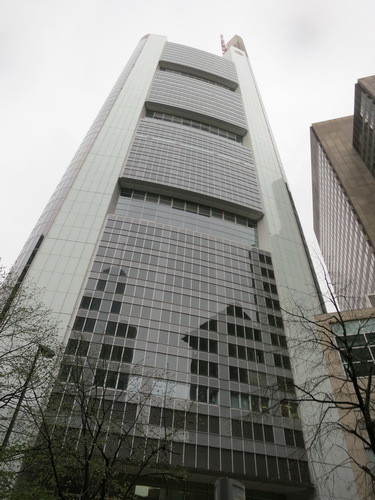 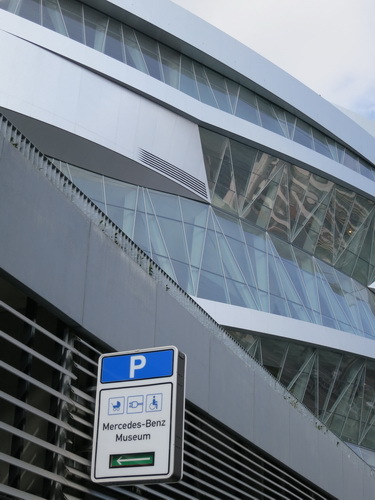 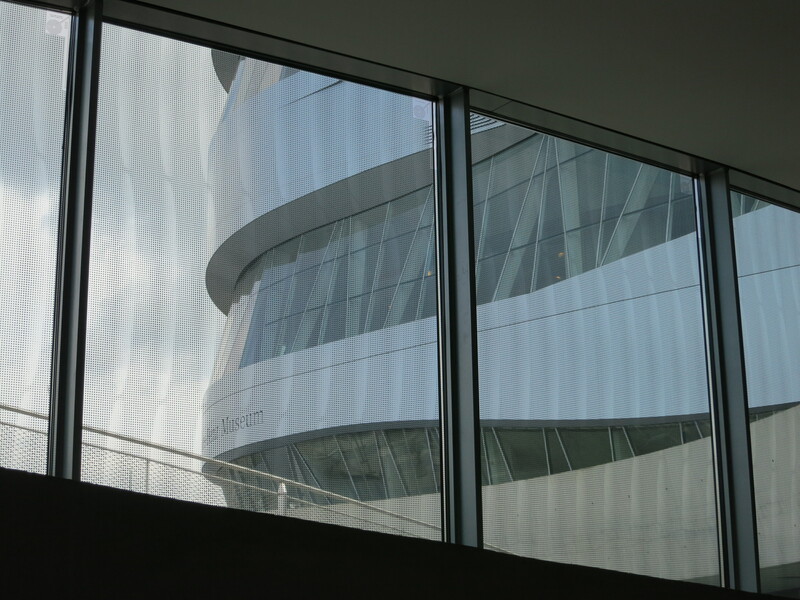 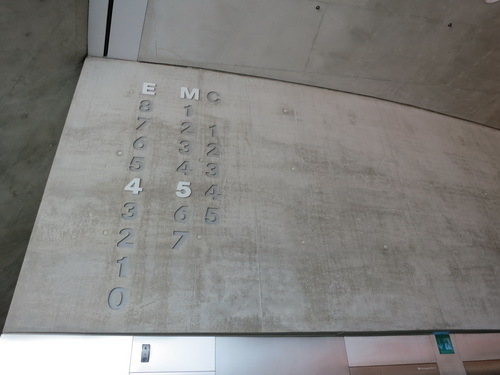 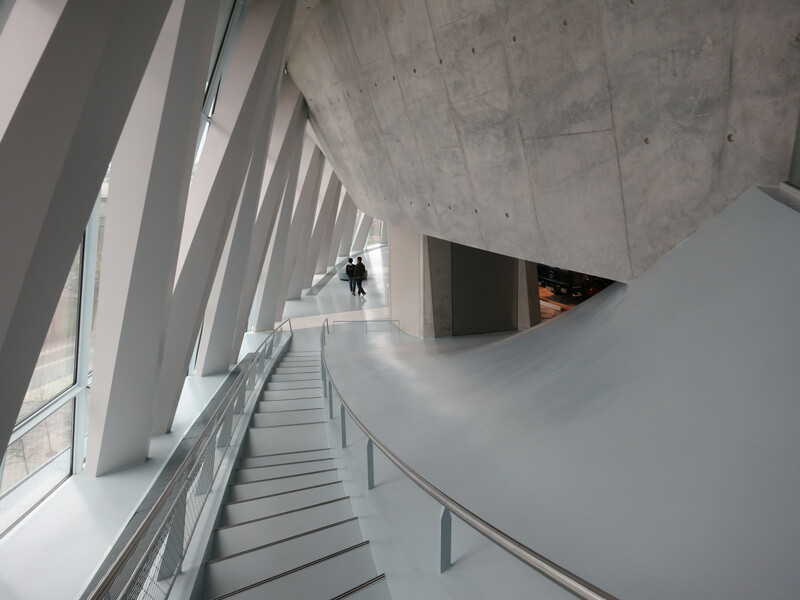 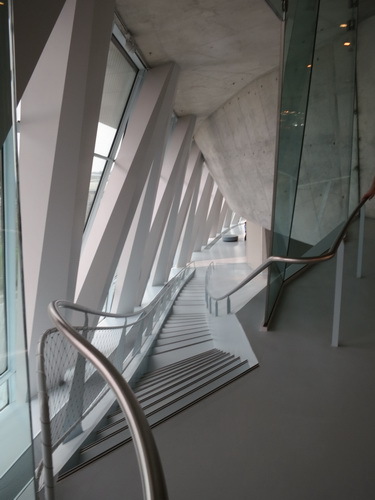 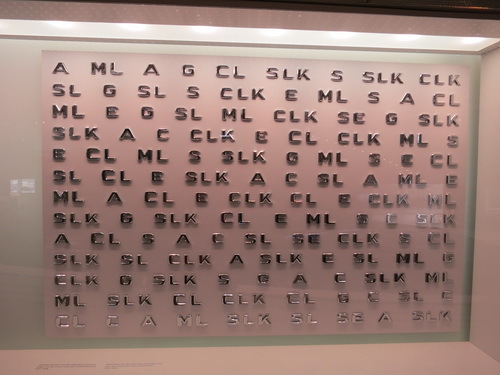 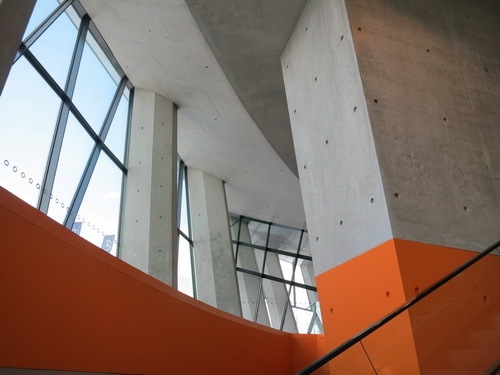 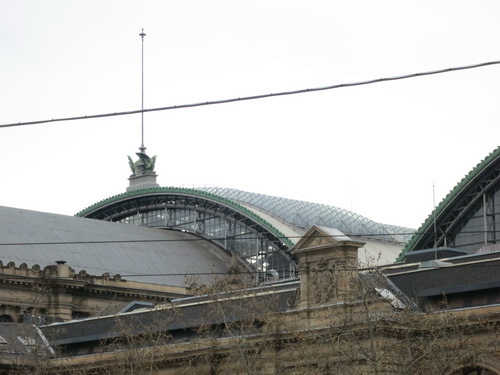 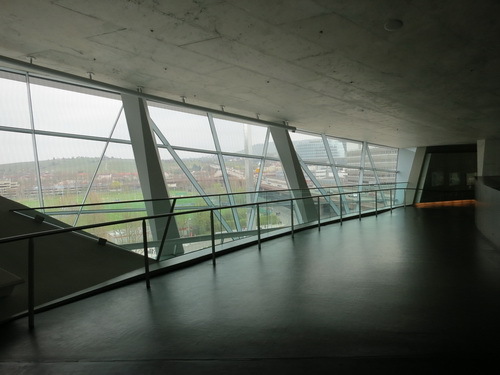 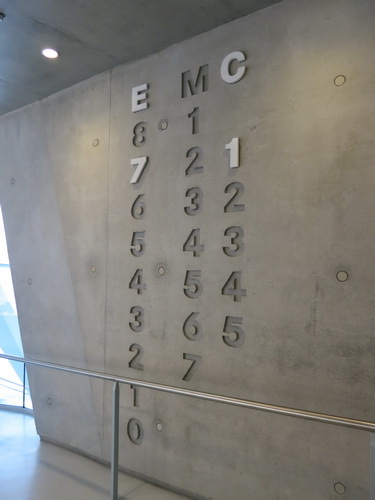 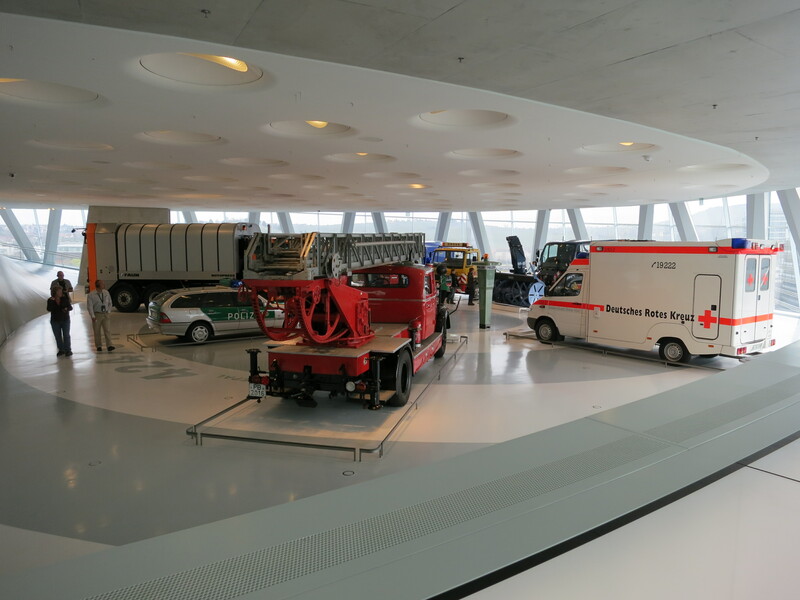 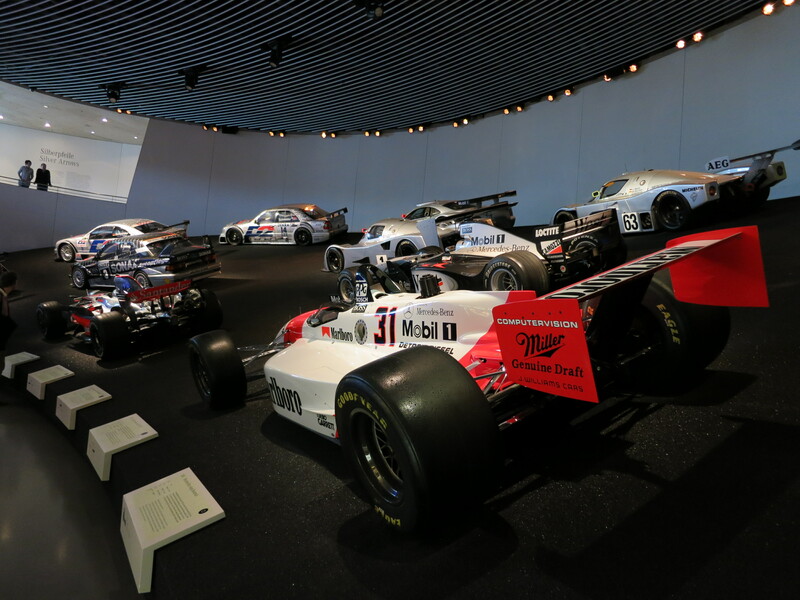 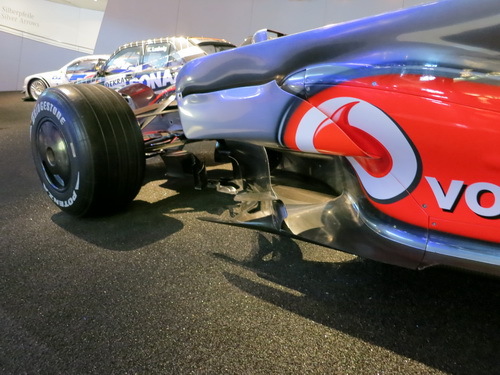 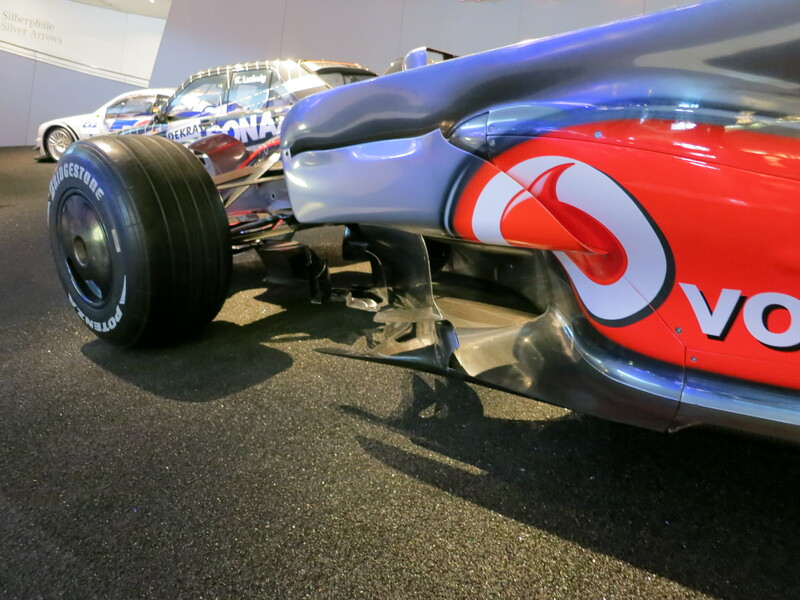 Each floor typically has three "lobes": one devoted to passenger vehicles, one to commercial vehicles, and one to racing vehicles. 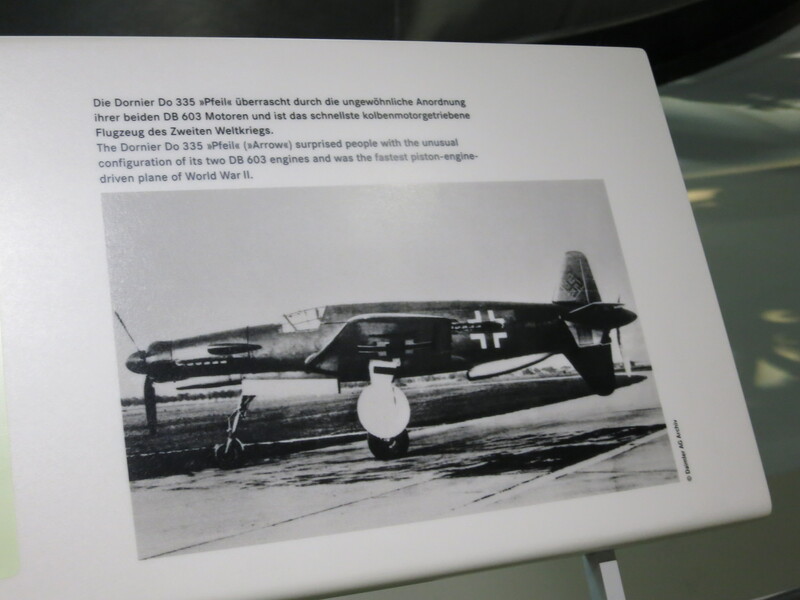 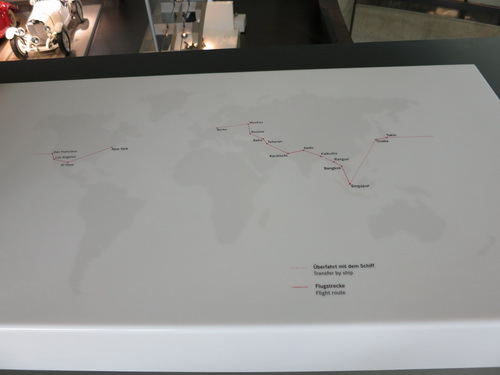 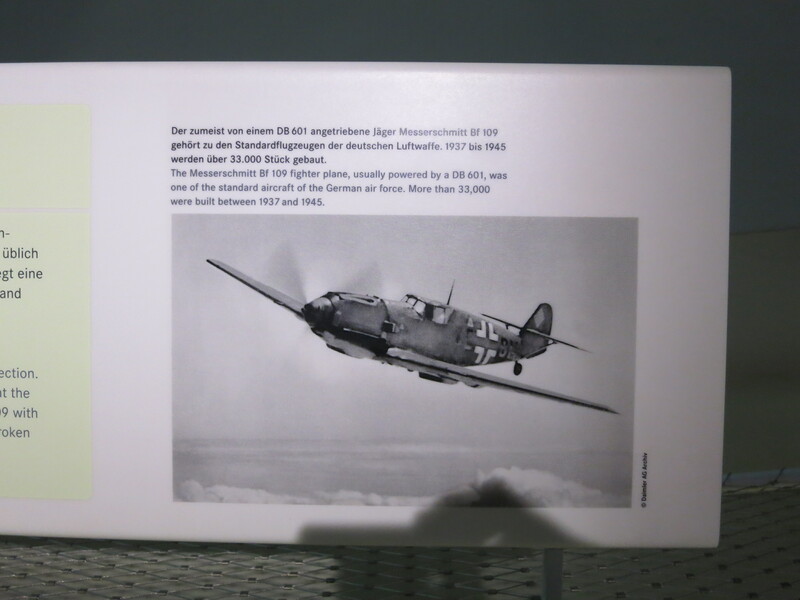 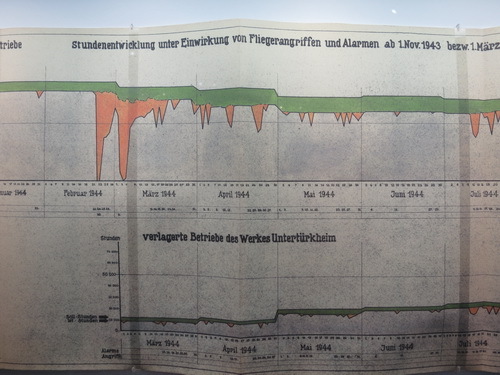 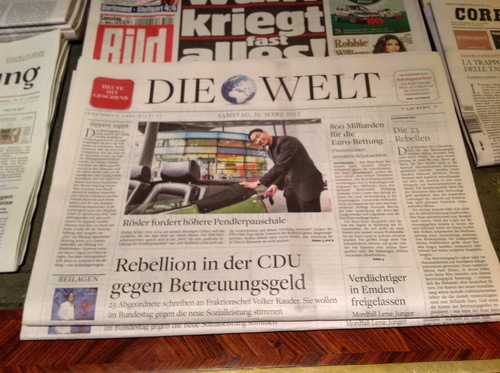 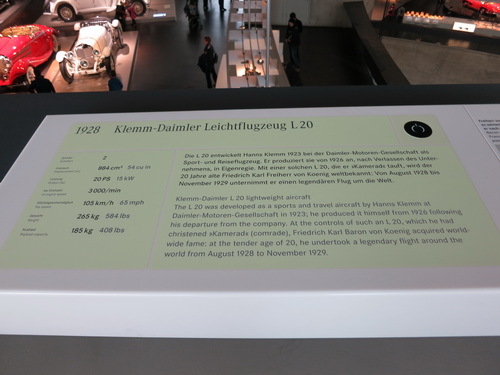 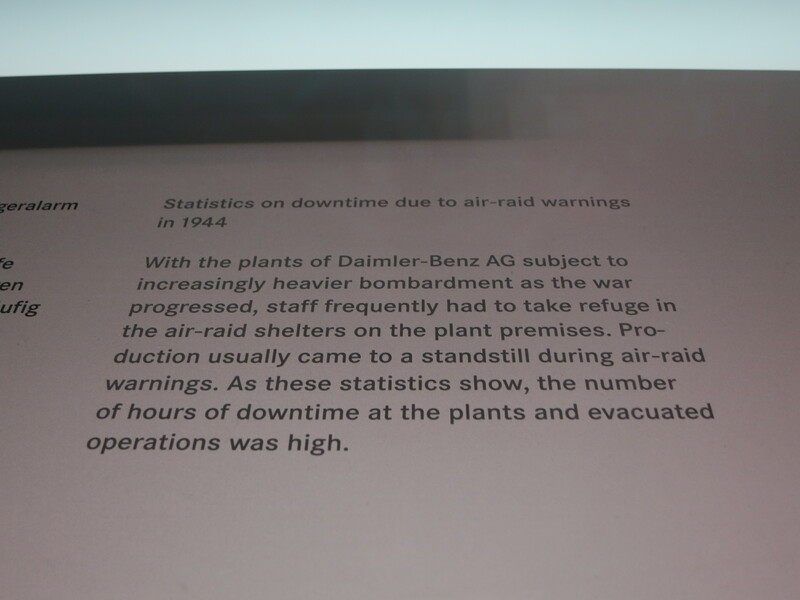 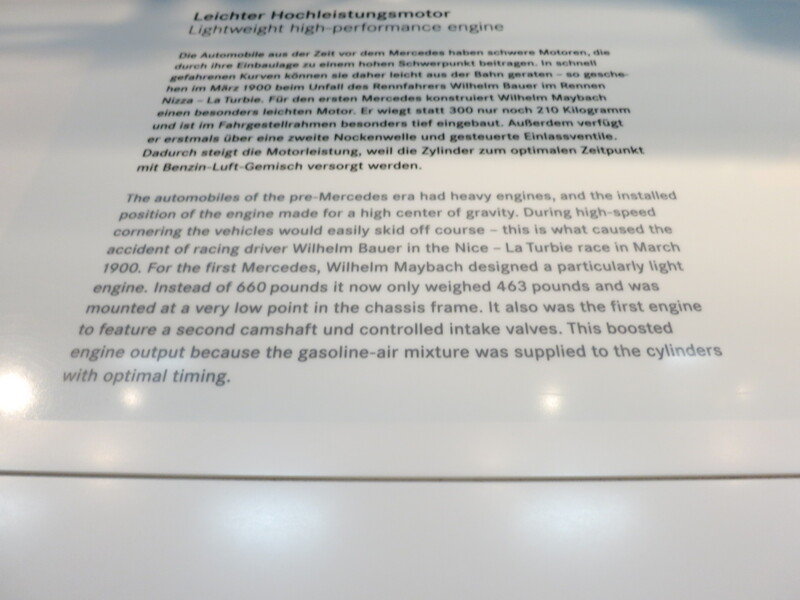 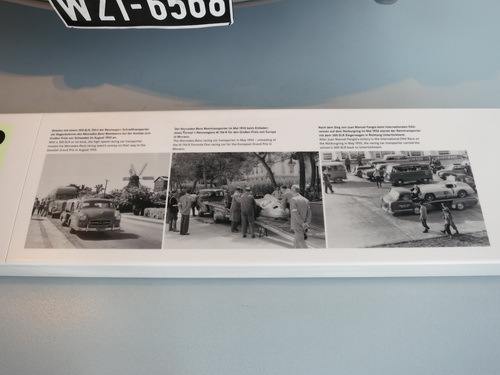 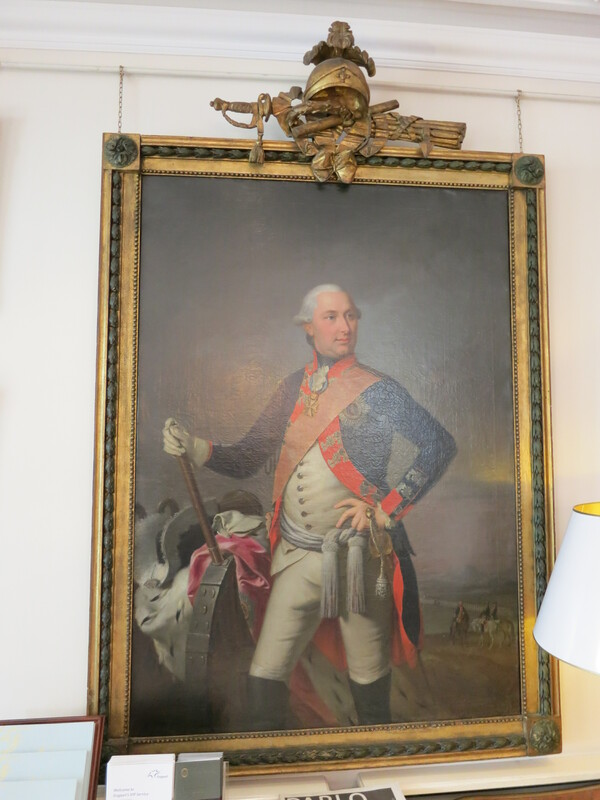 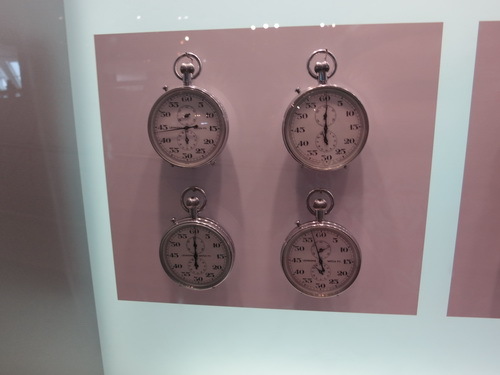 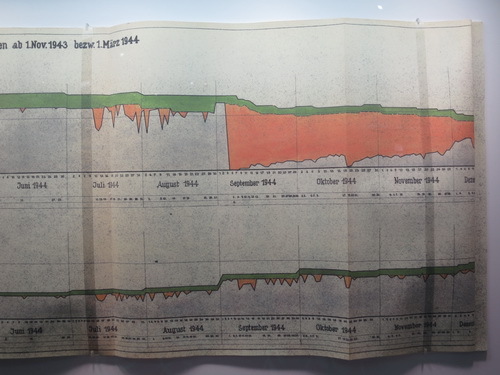 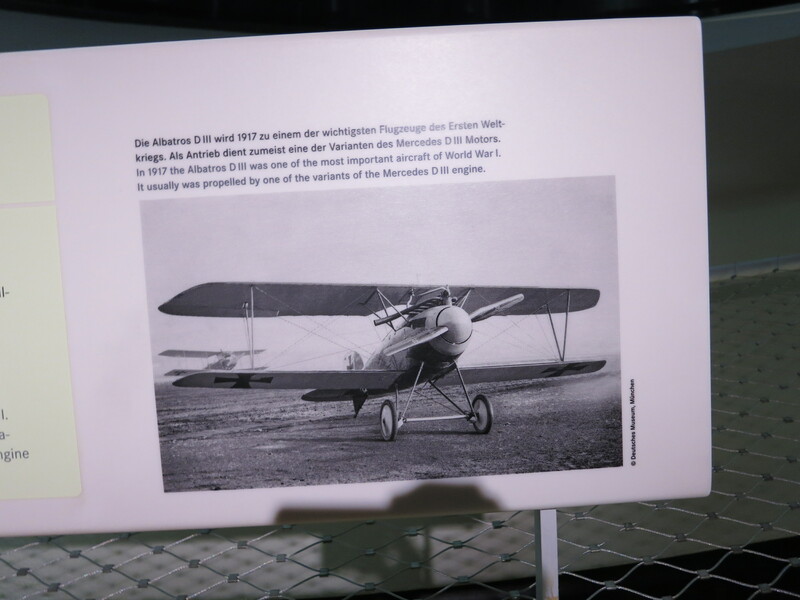 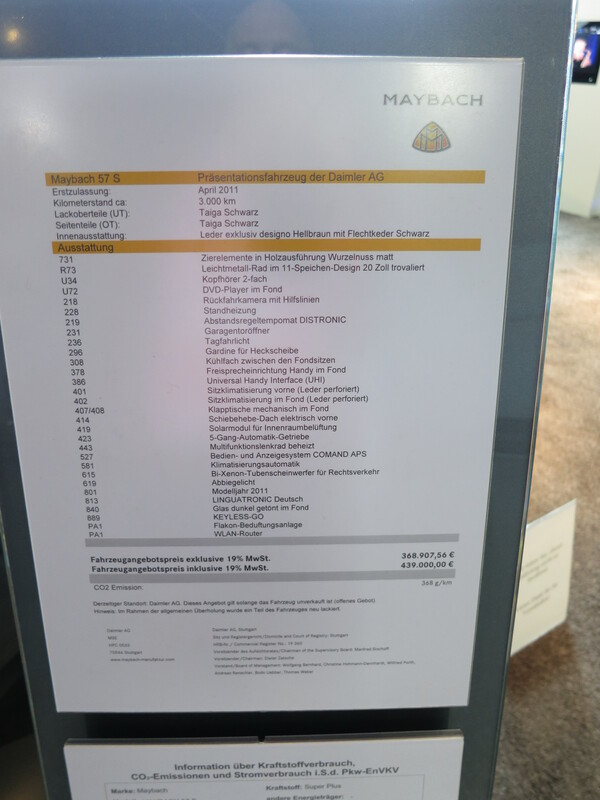 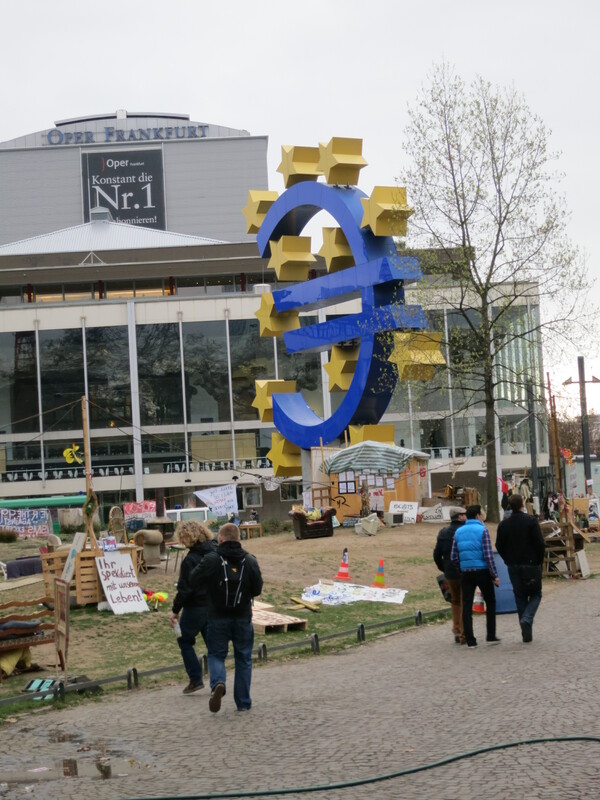 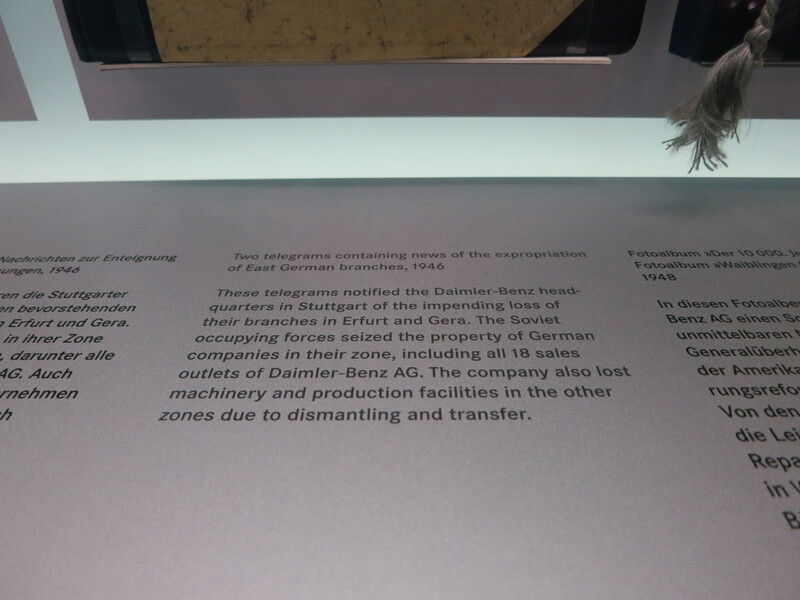 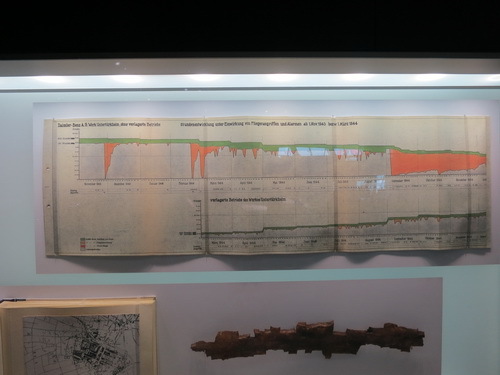 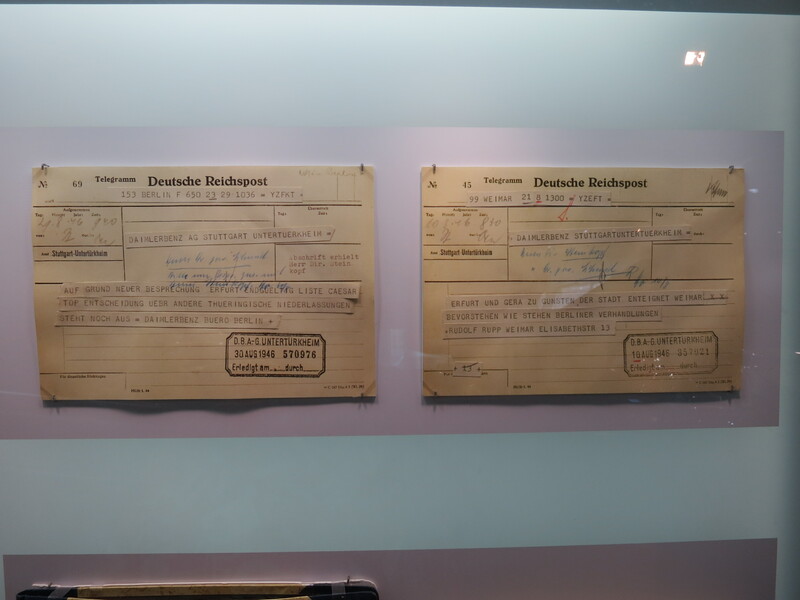 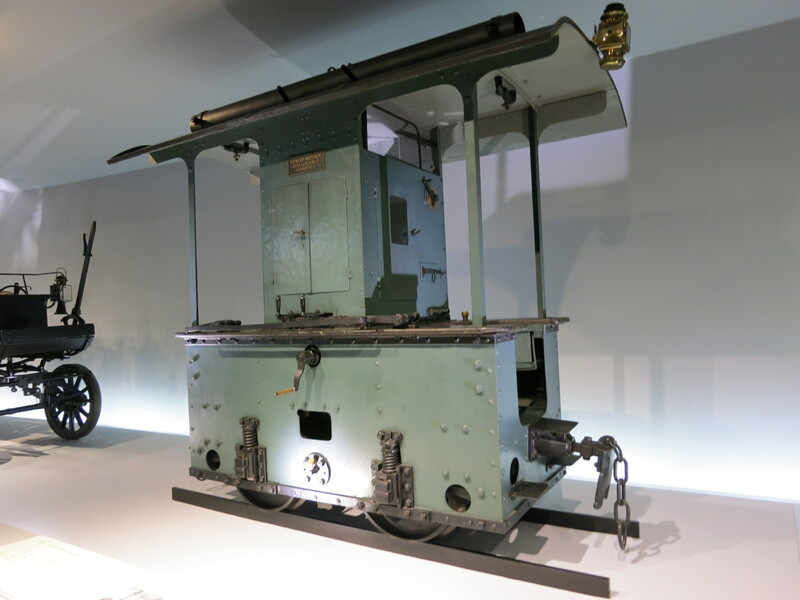 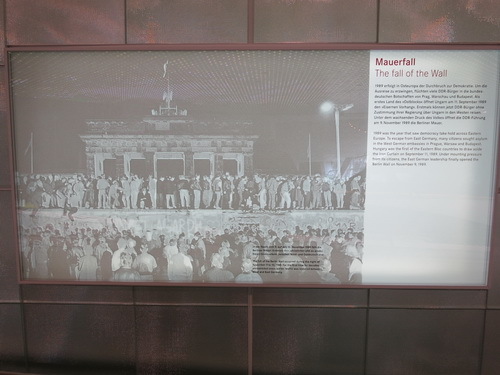 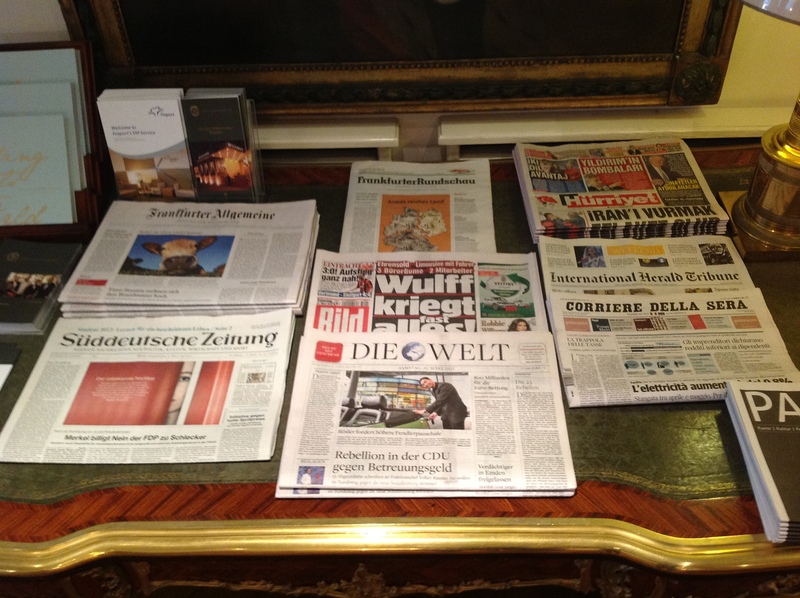 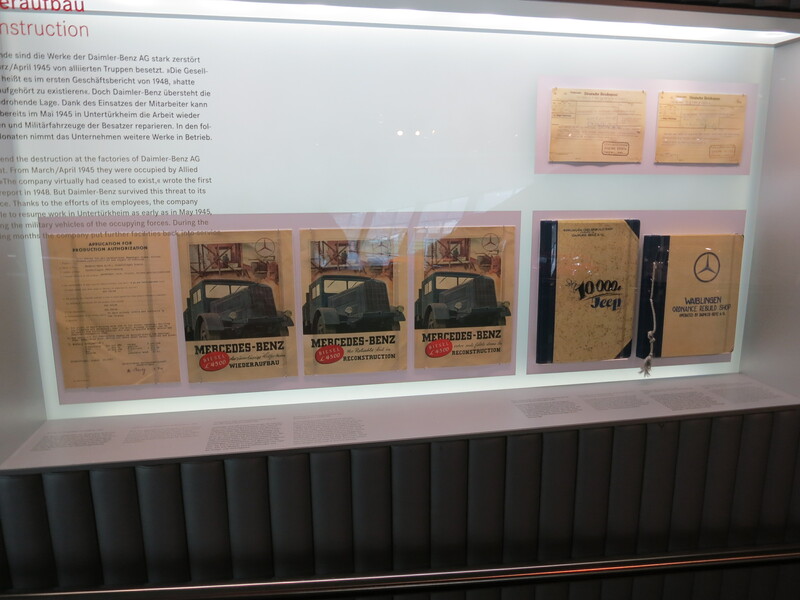 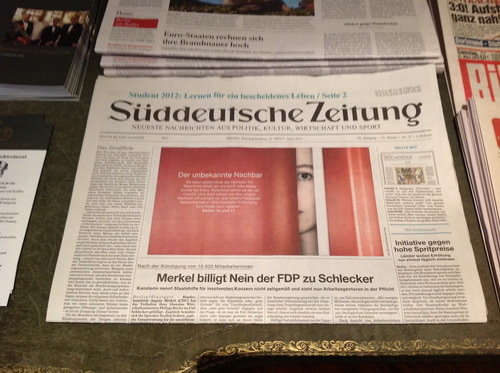 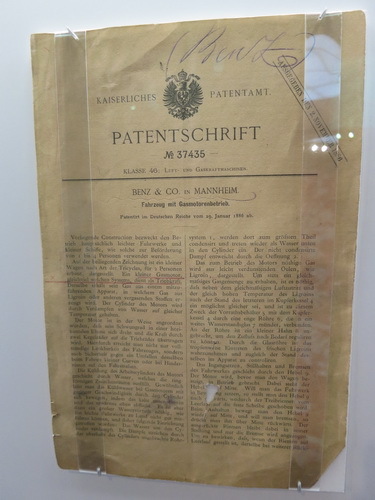 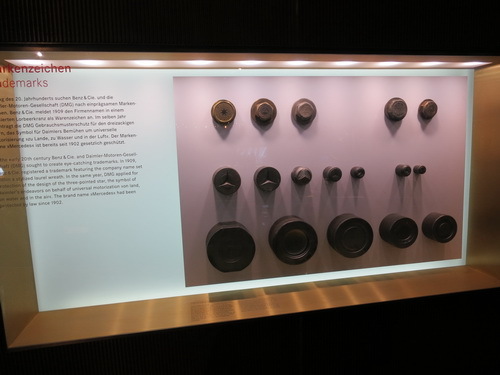 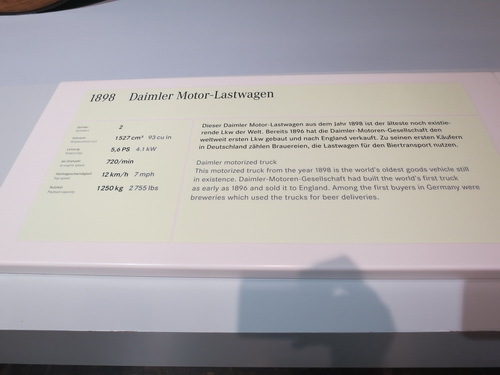 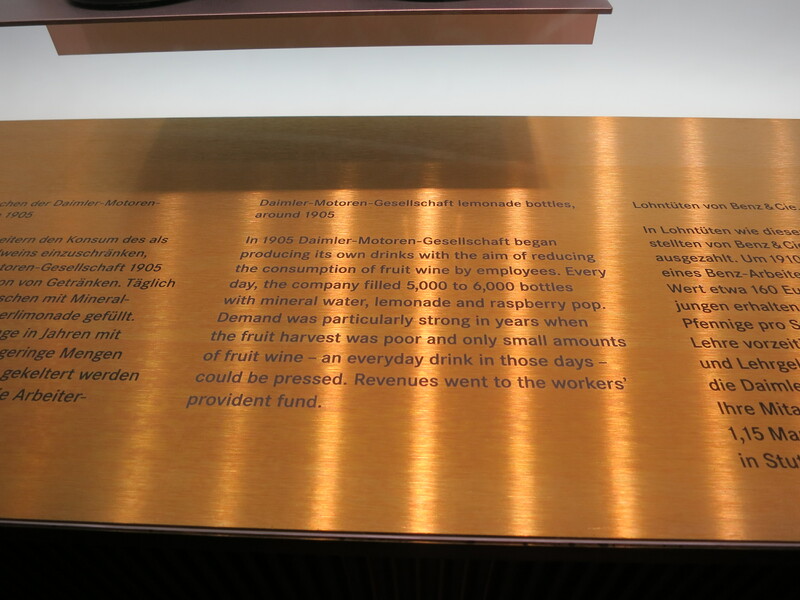 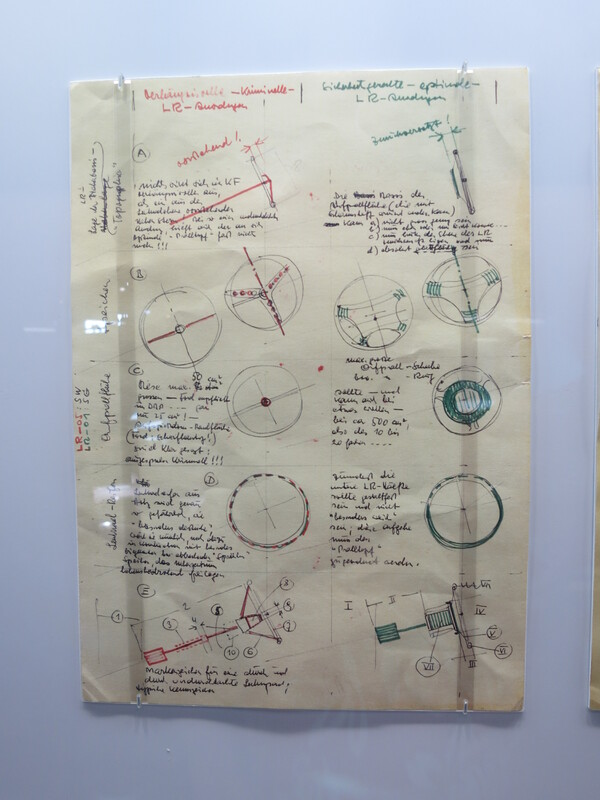 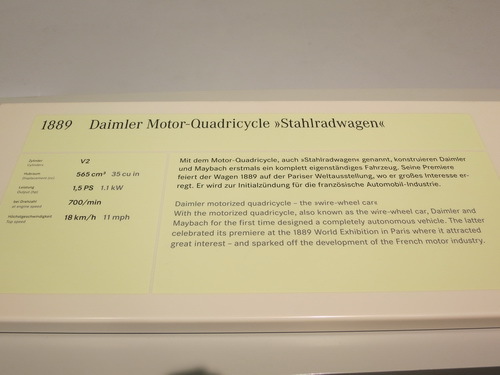 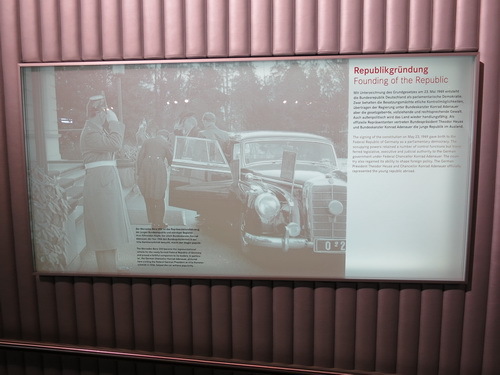 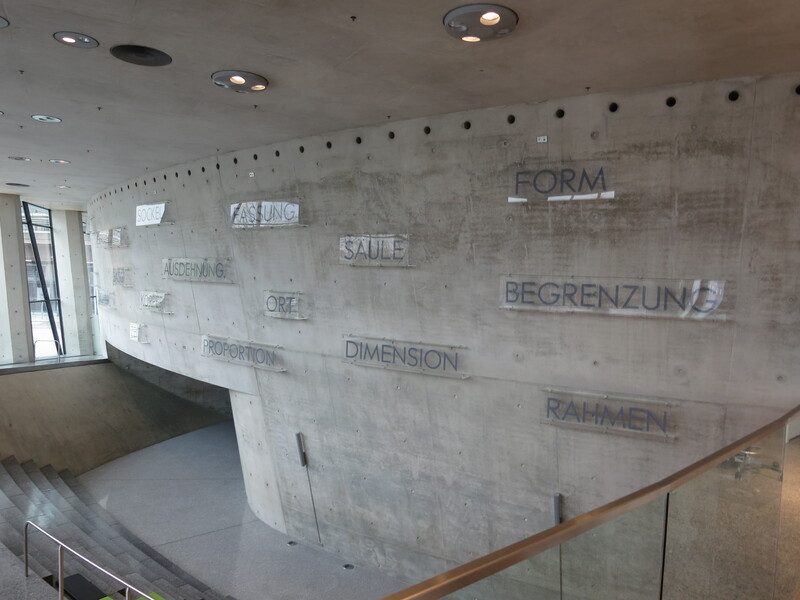 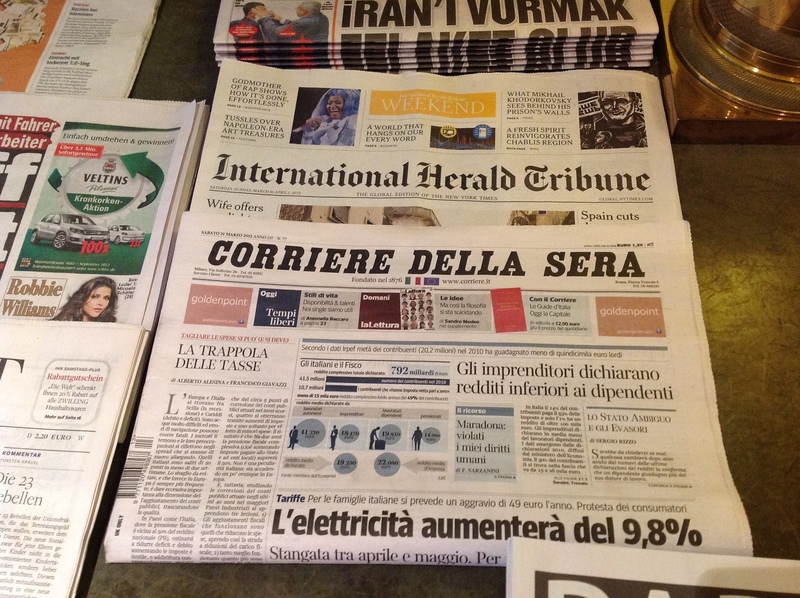 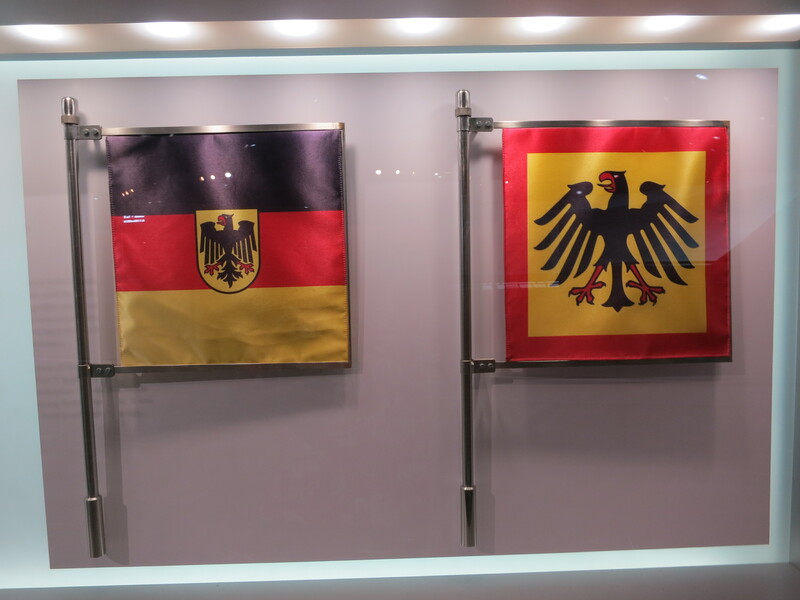 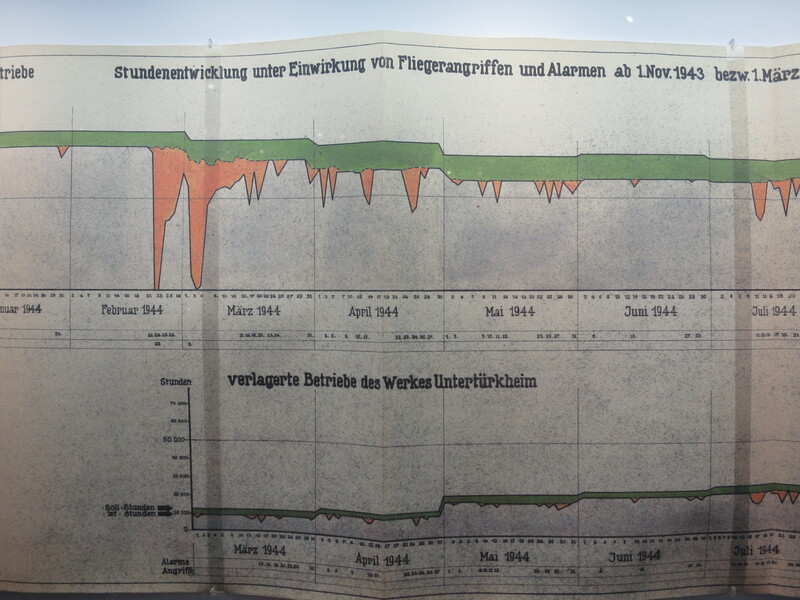 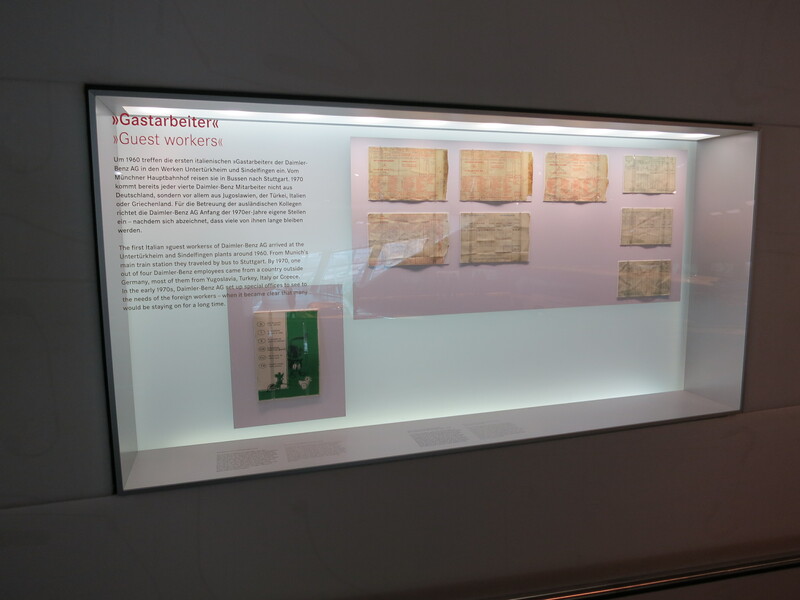 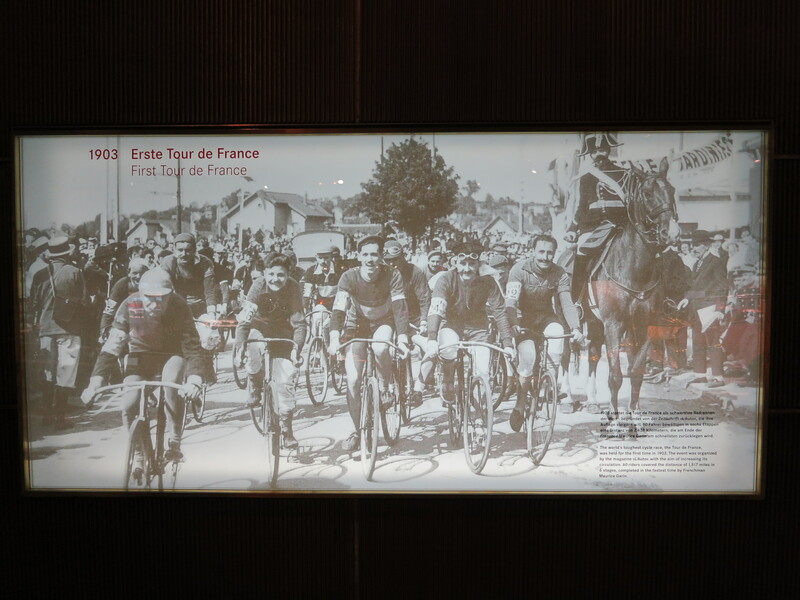 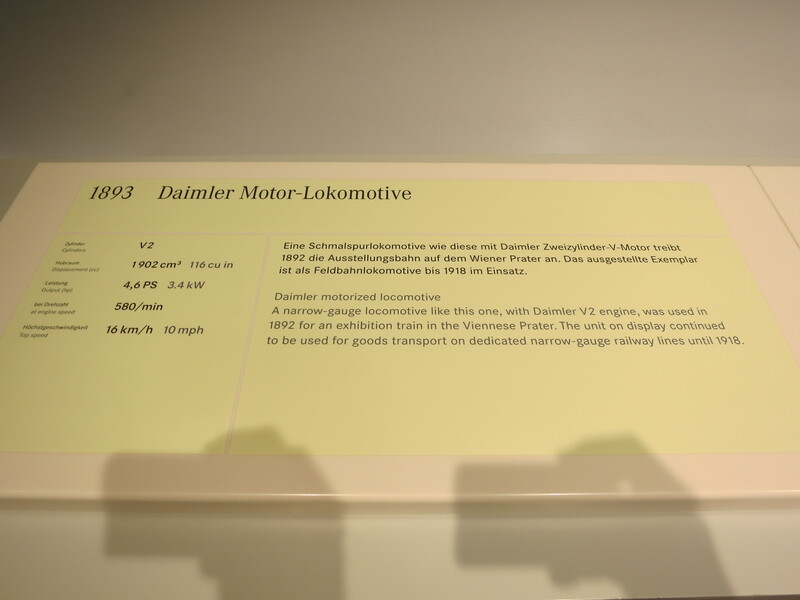 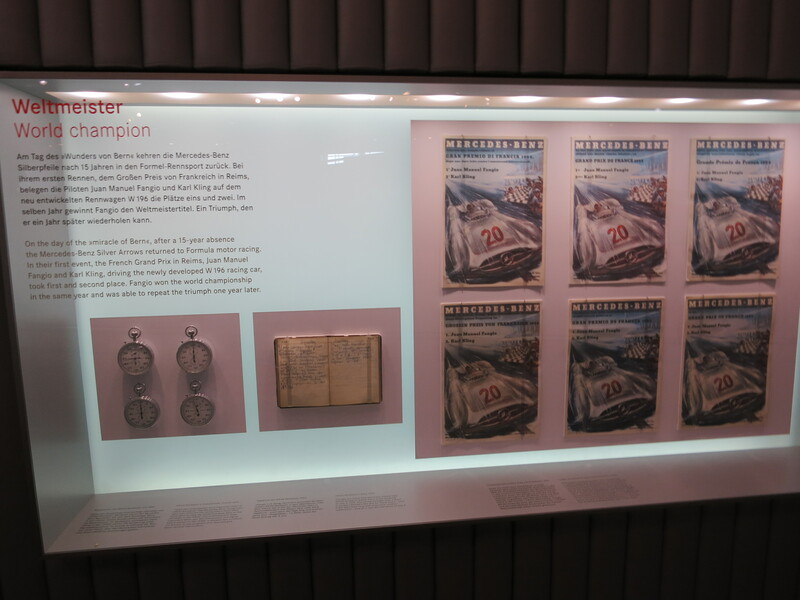 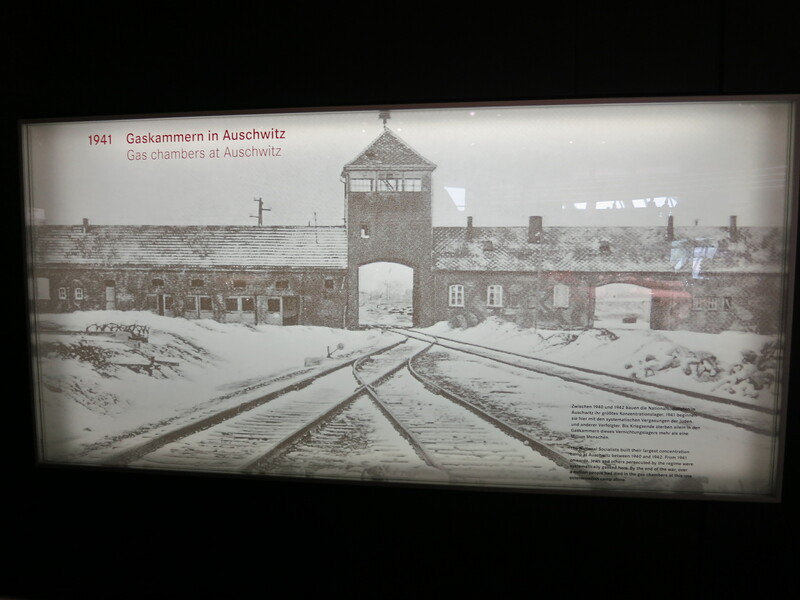 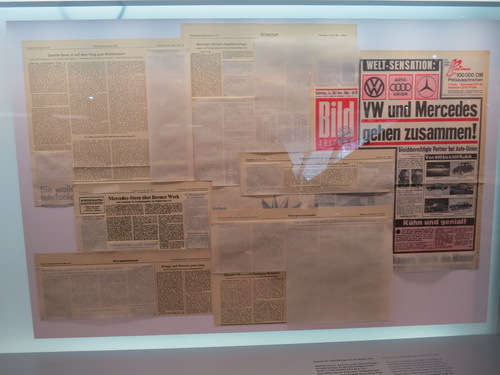 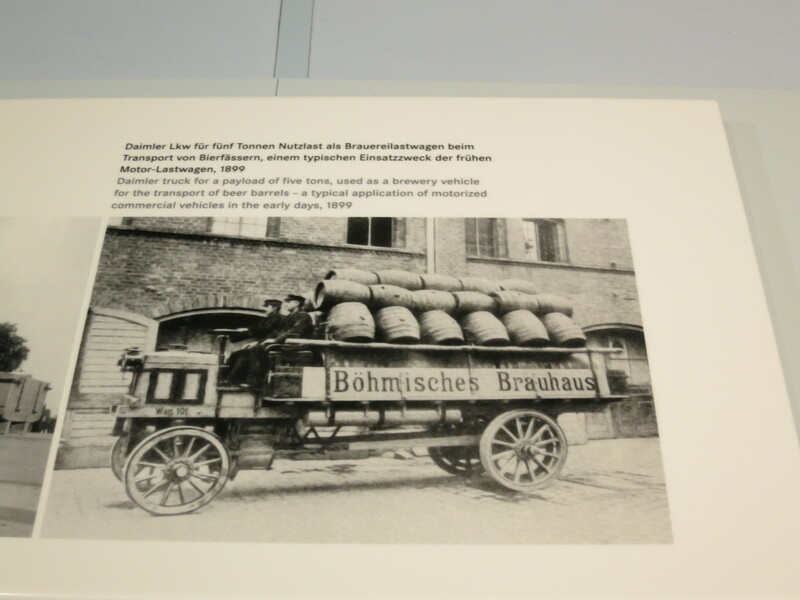 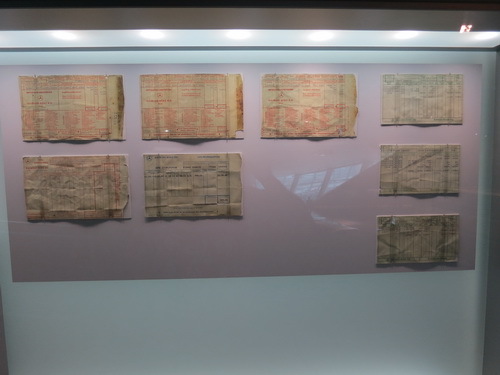 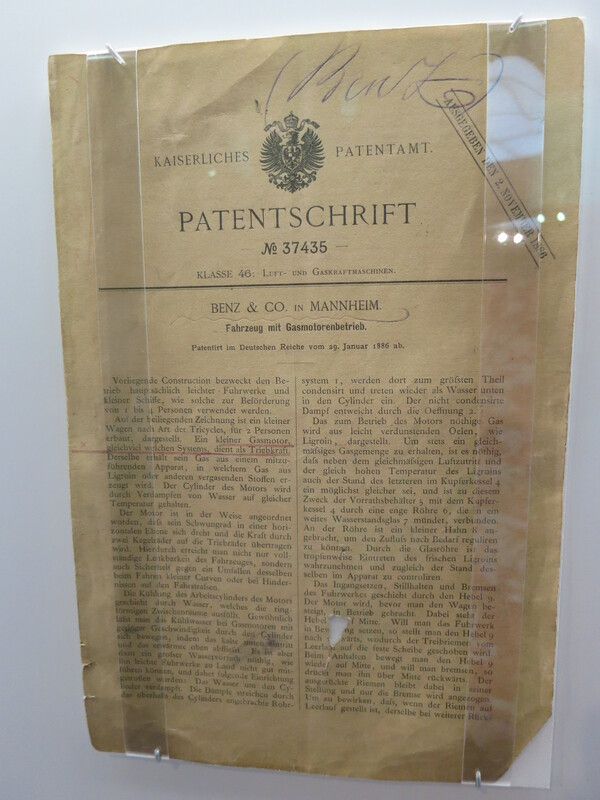 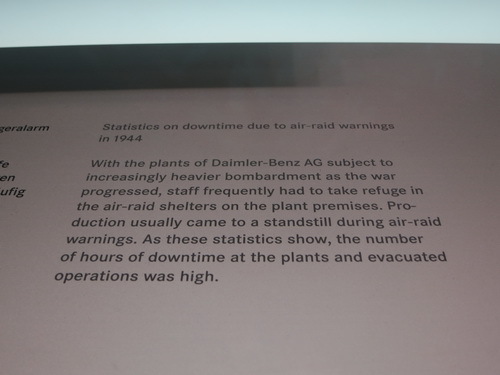 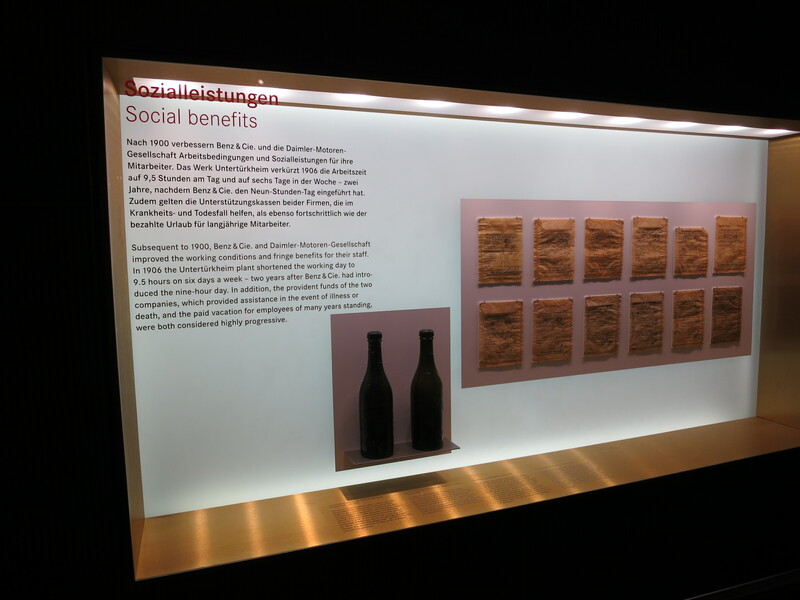 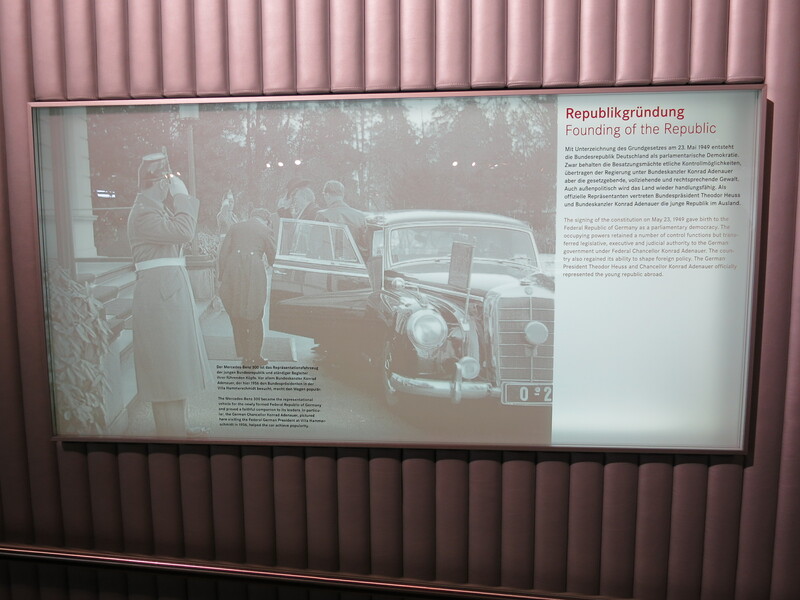 When you walk down the ramp between floors you encounter a sequential set of historical displayes that provide context for what was going on in Germany and around the world. 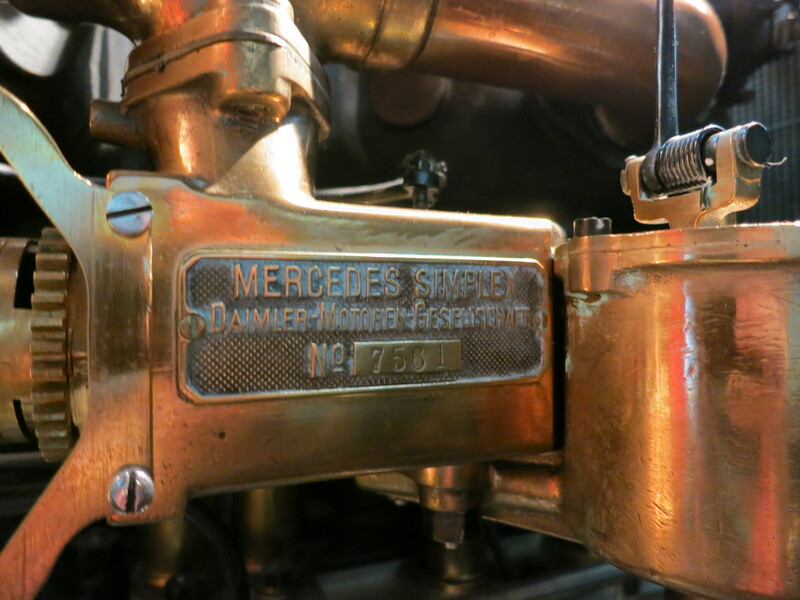 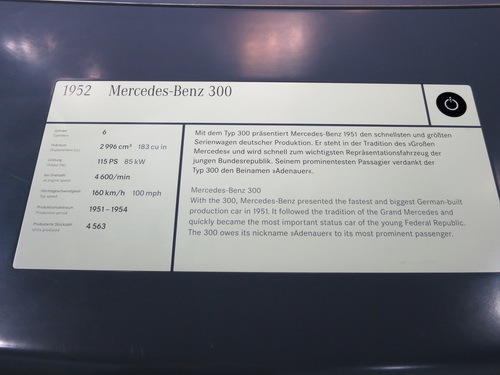 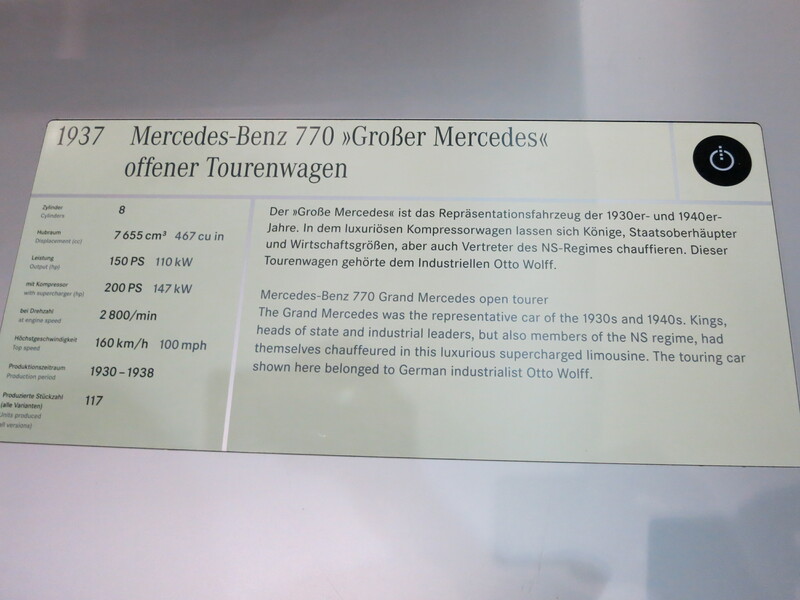 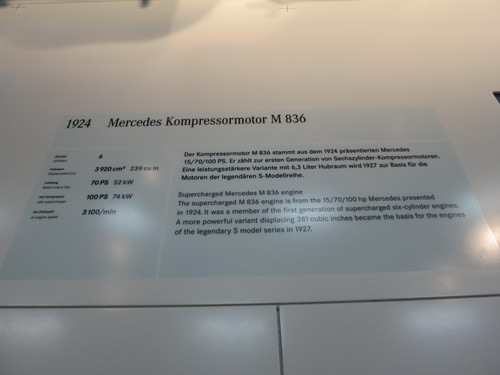 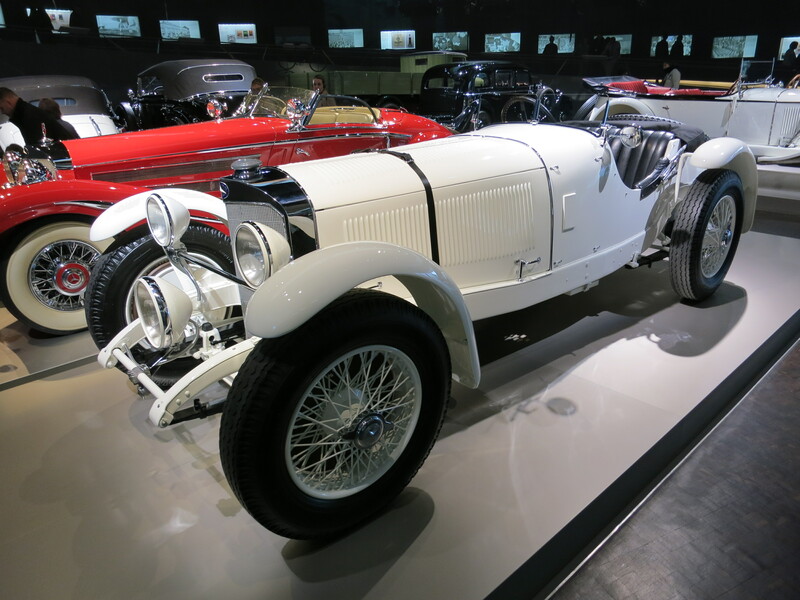 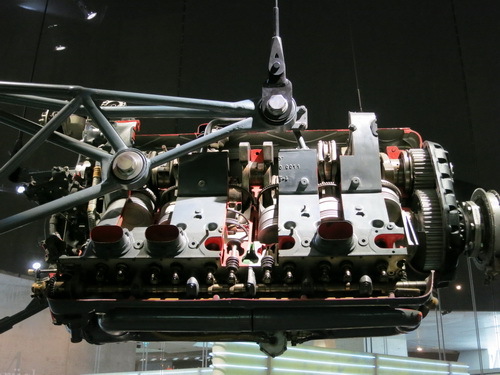 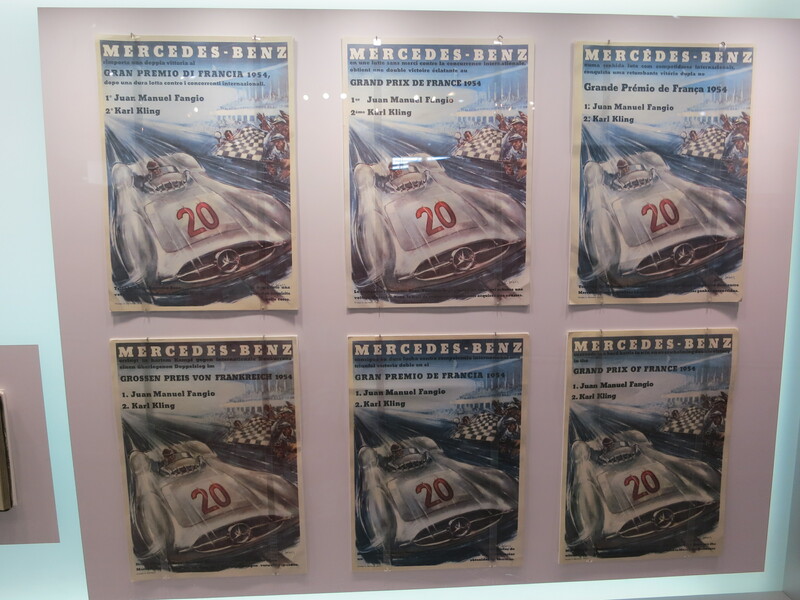 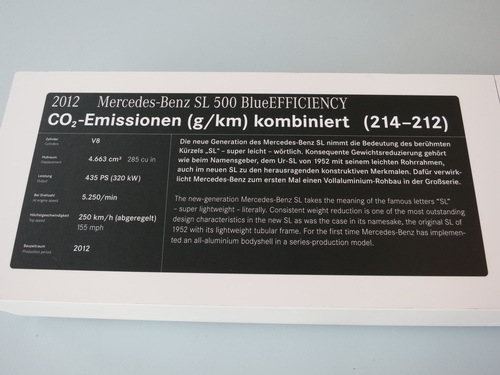 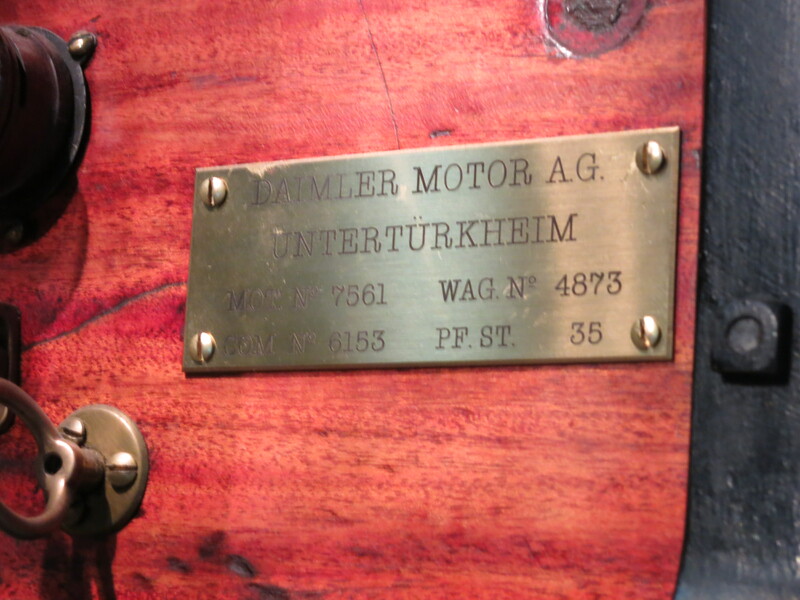 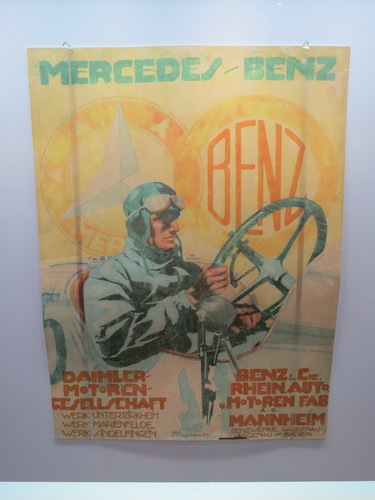 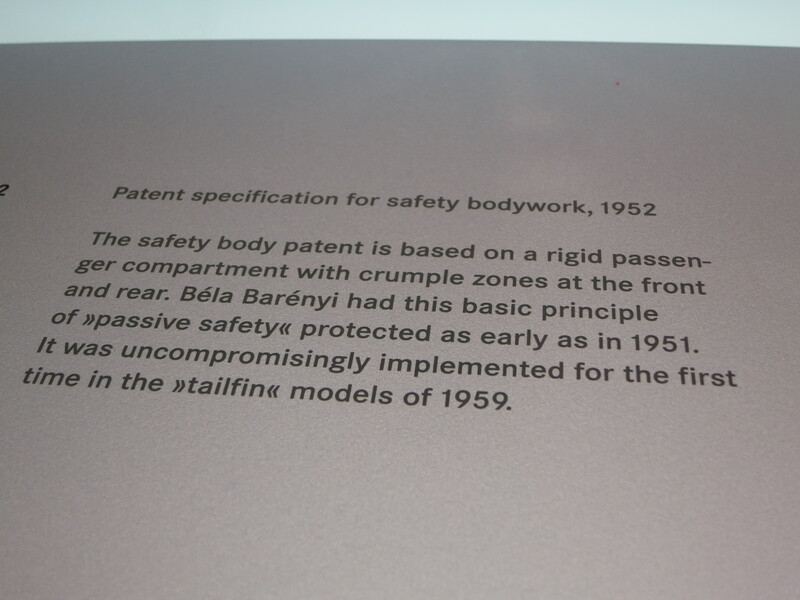 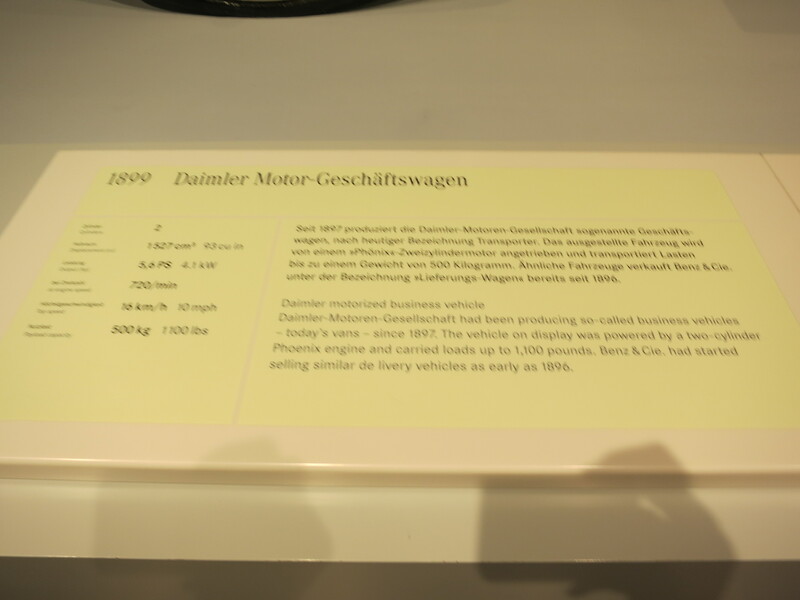 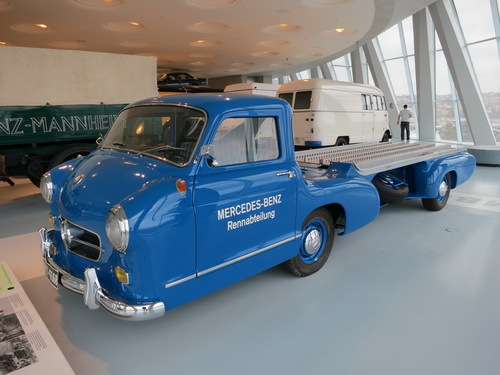 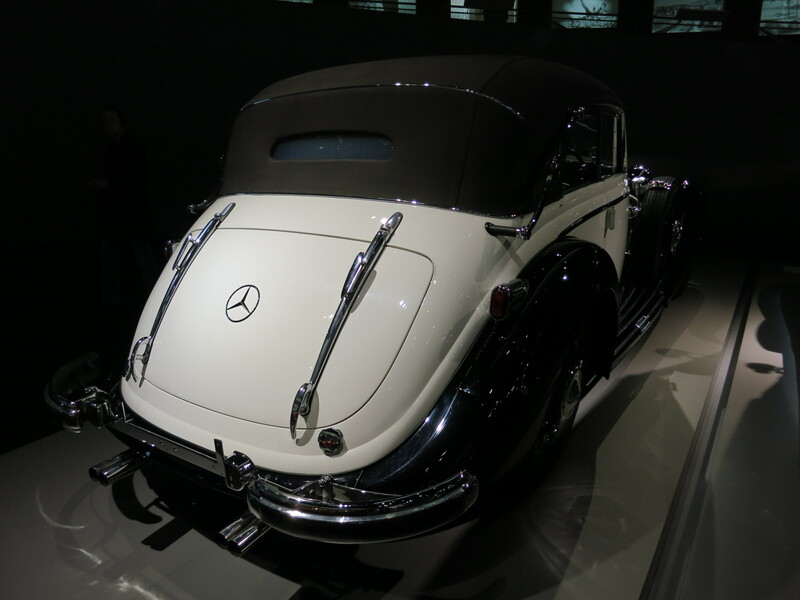 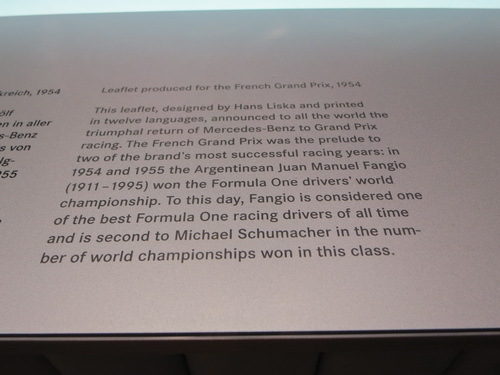 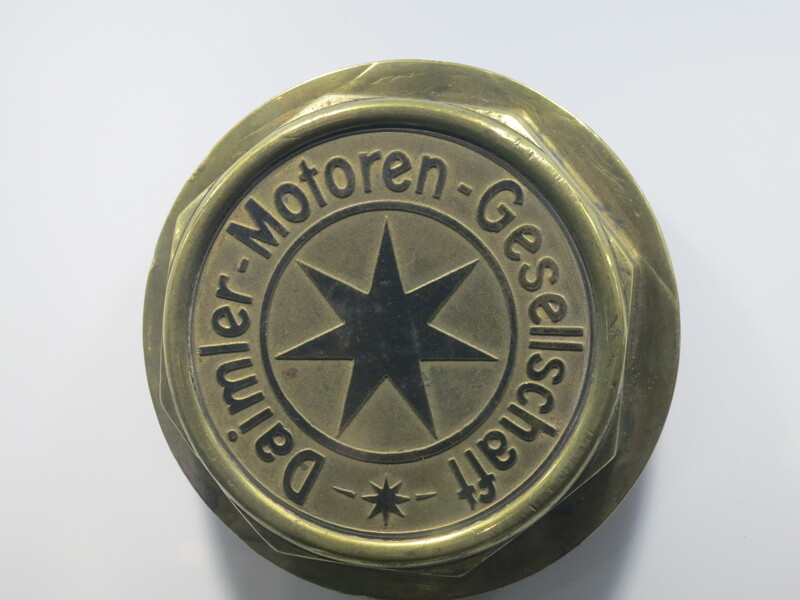 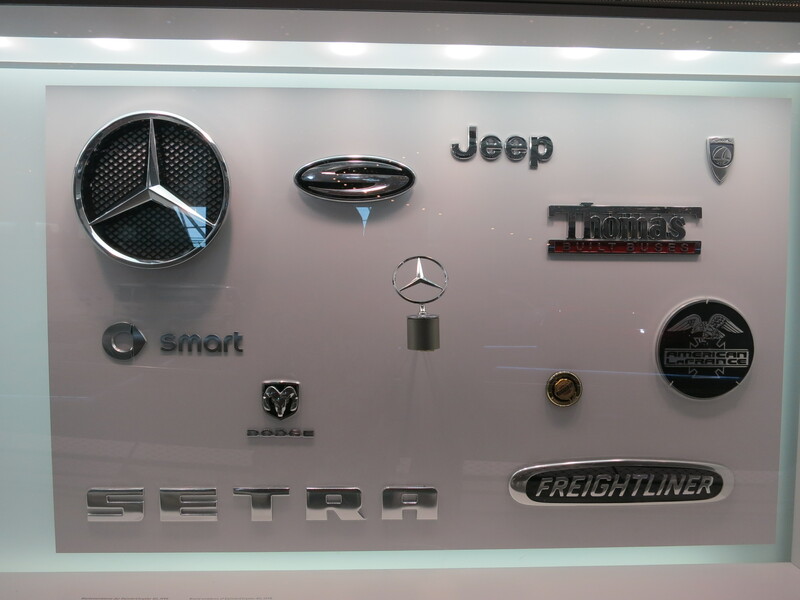 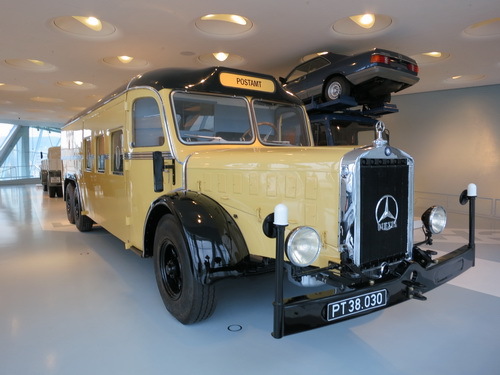 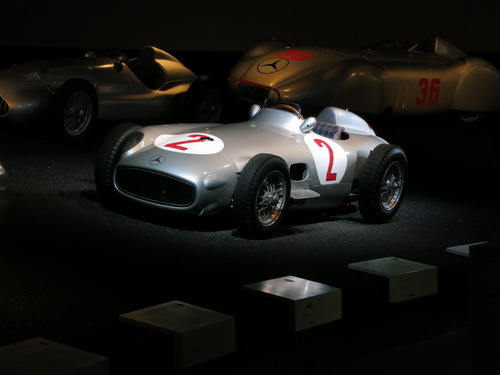 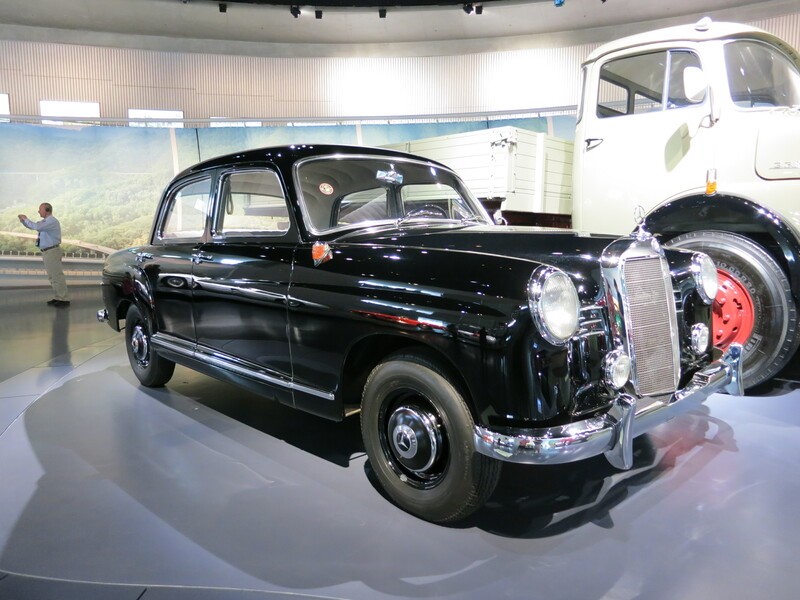 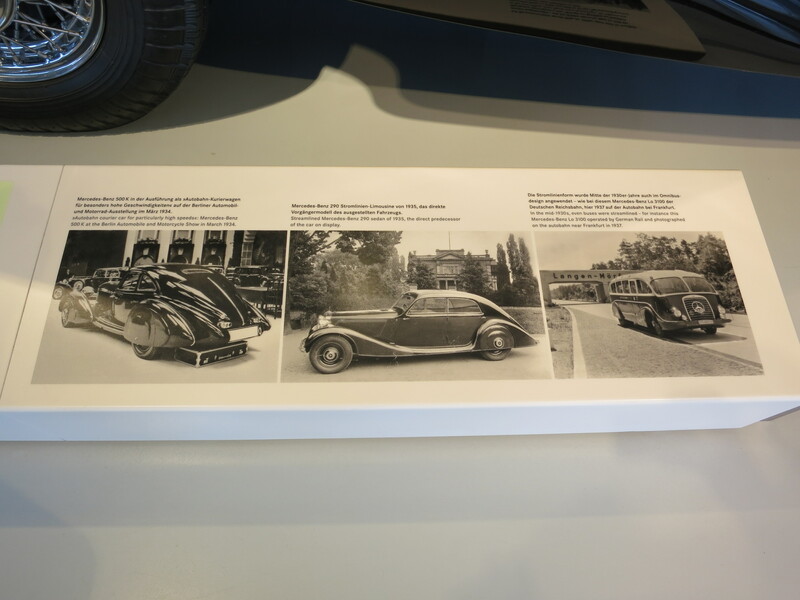 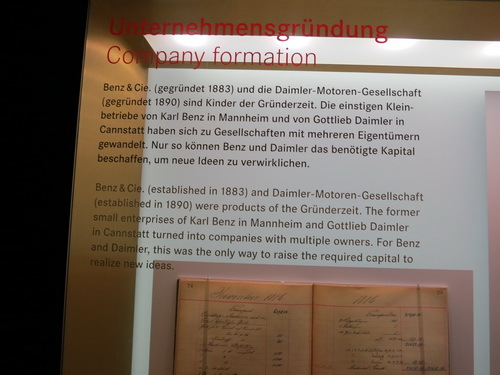 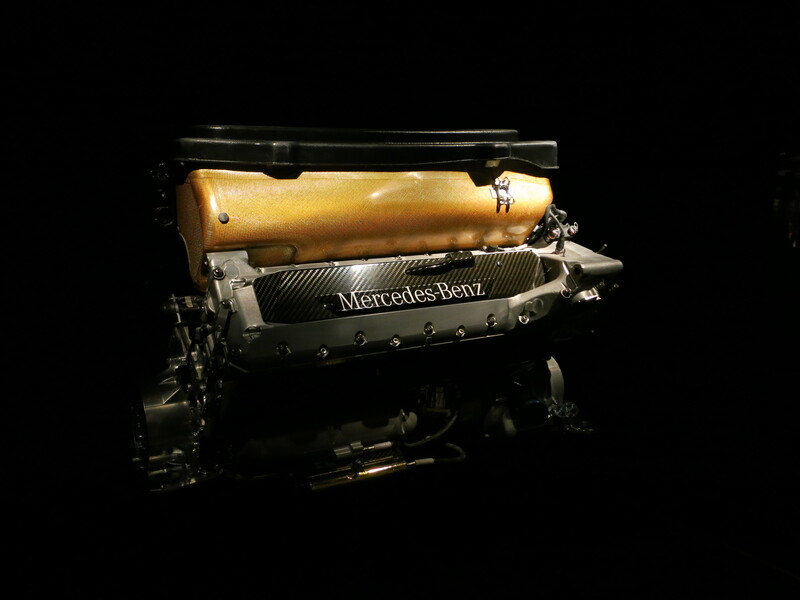 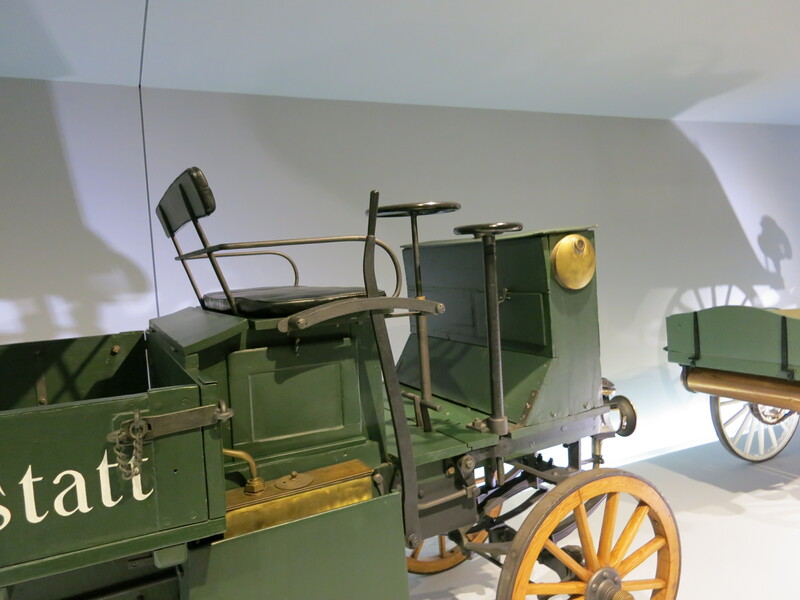 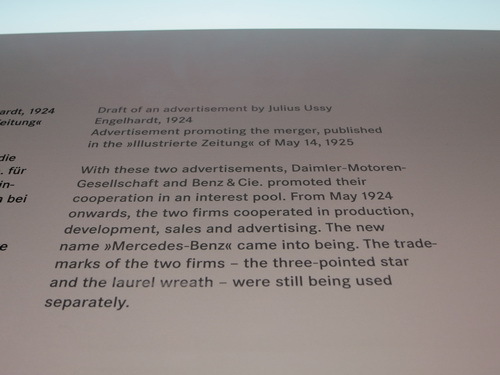 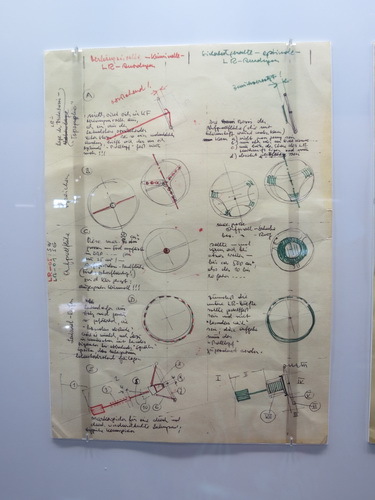 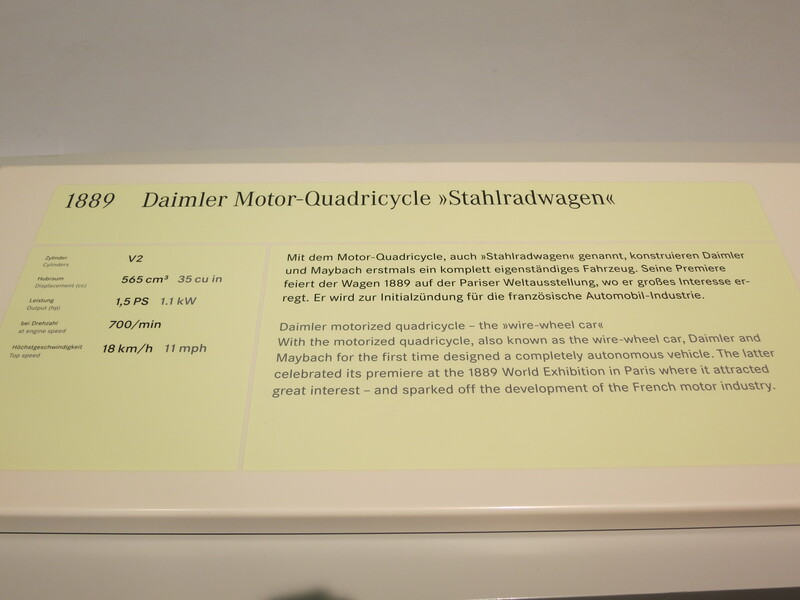 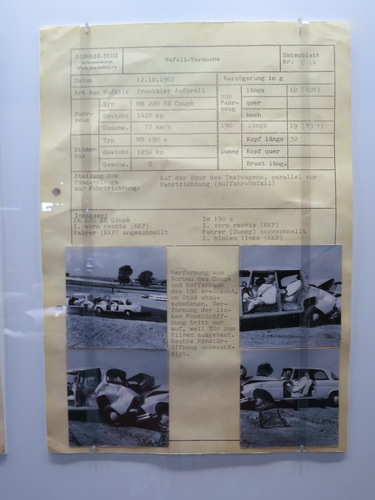 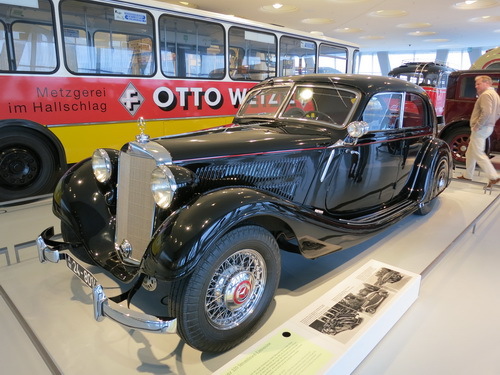 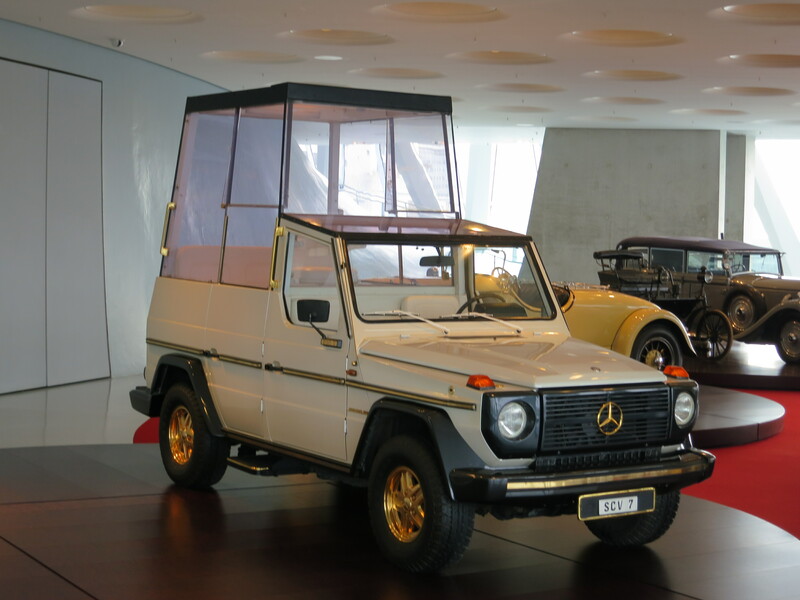 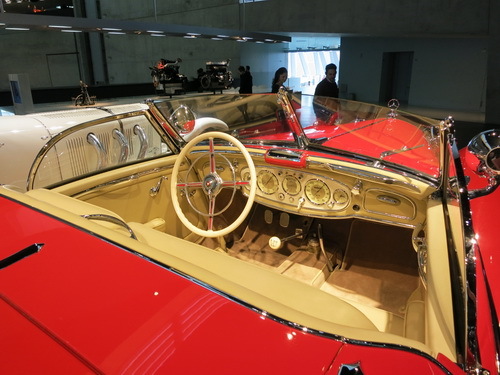 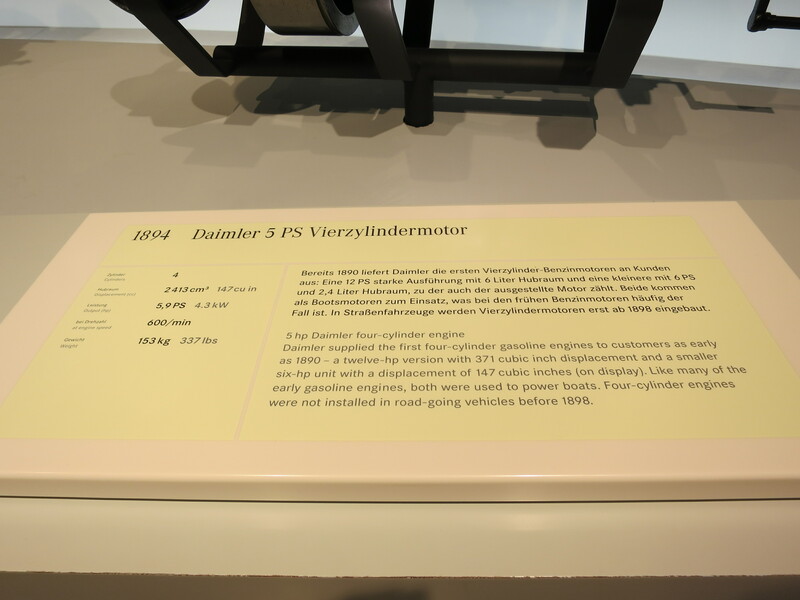 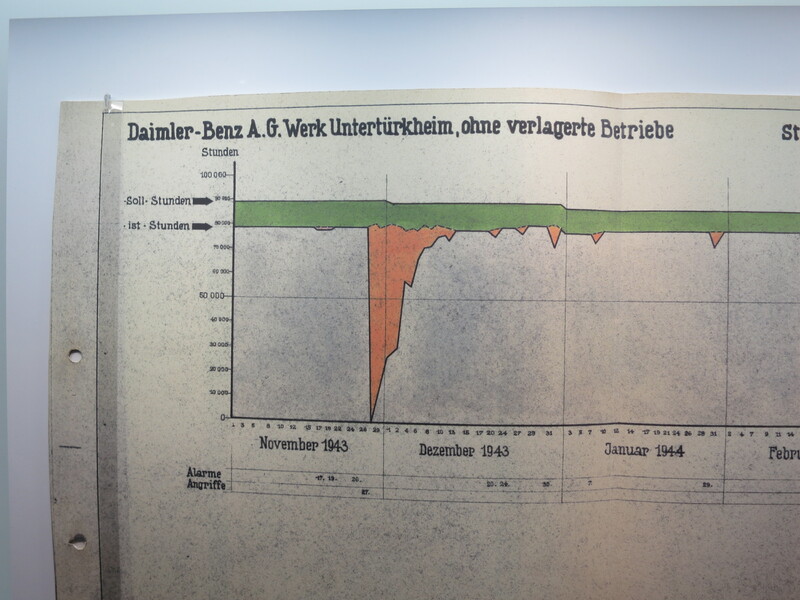 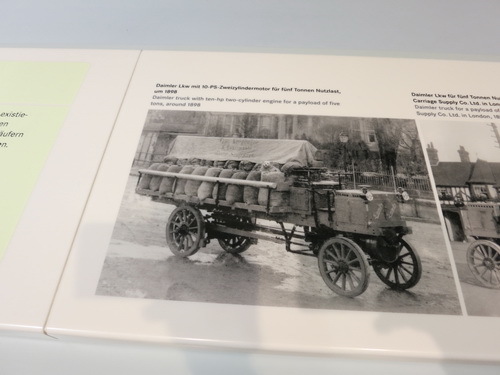 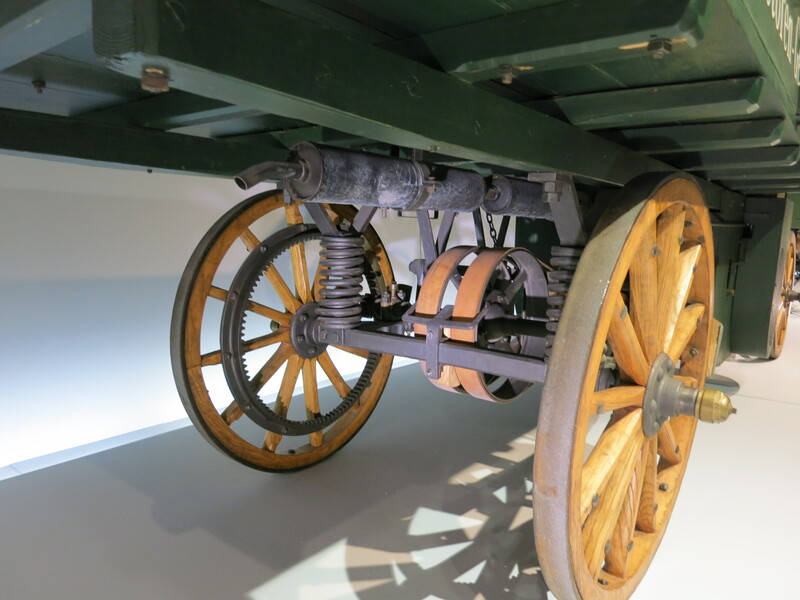 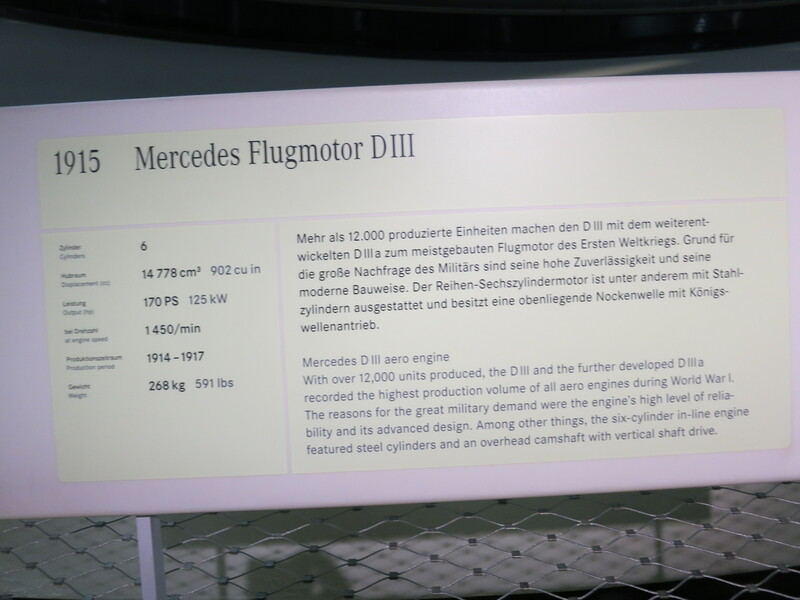 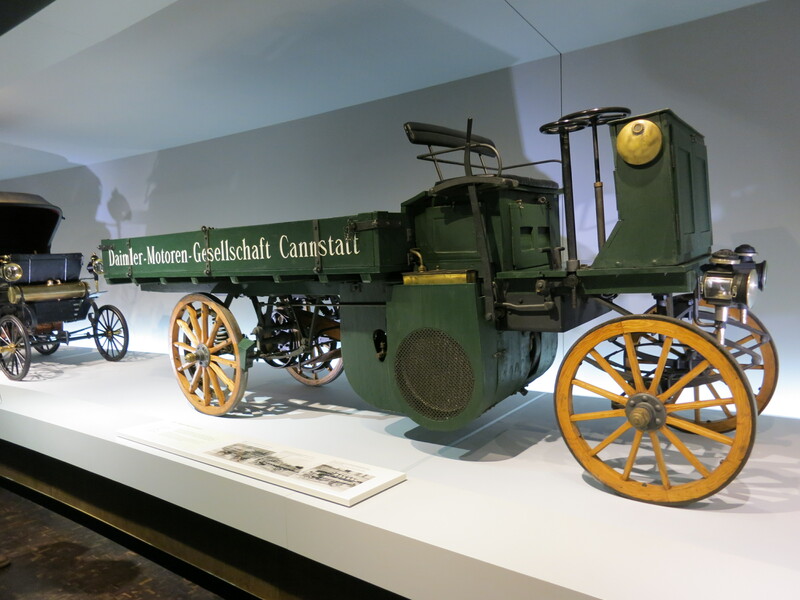 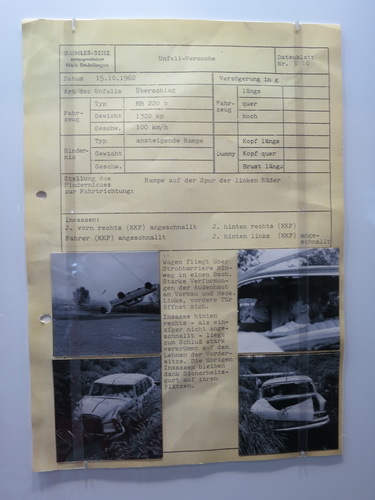 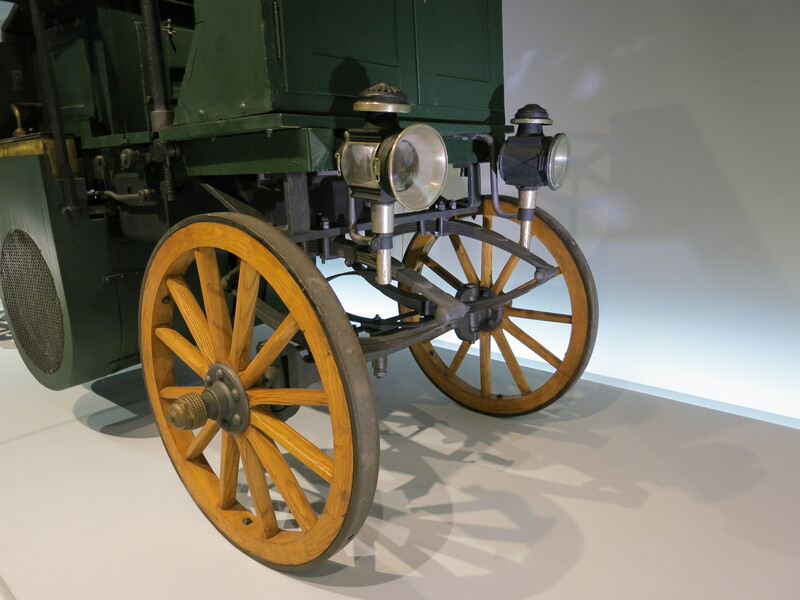 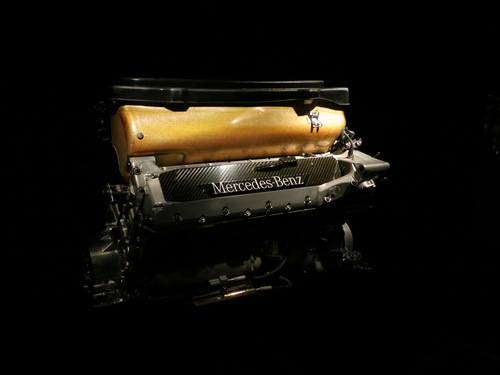 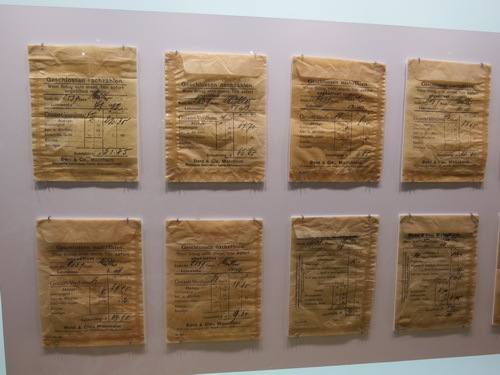 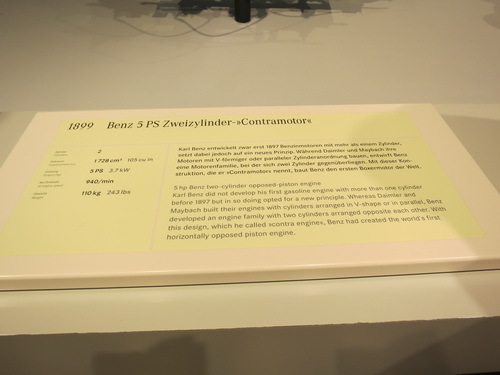 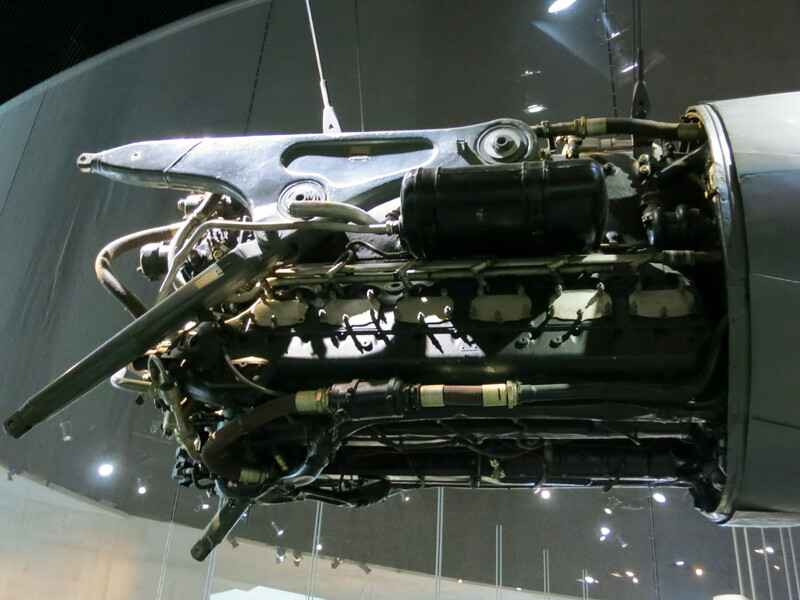 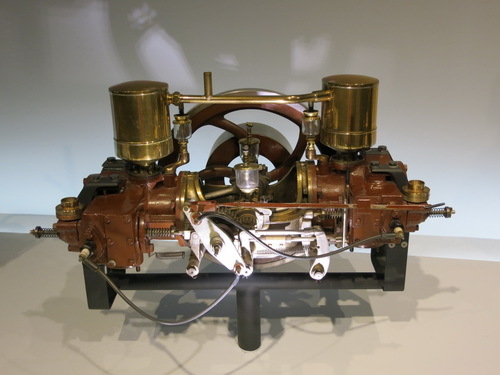 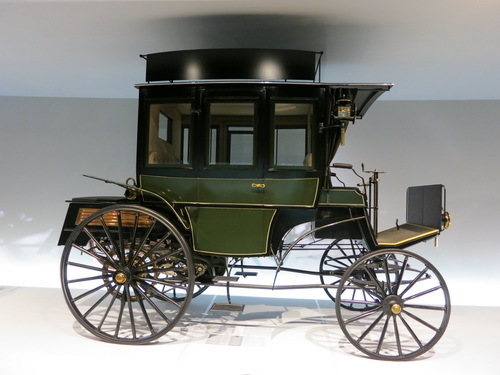 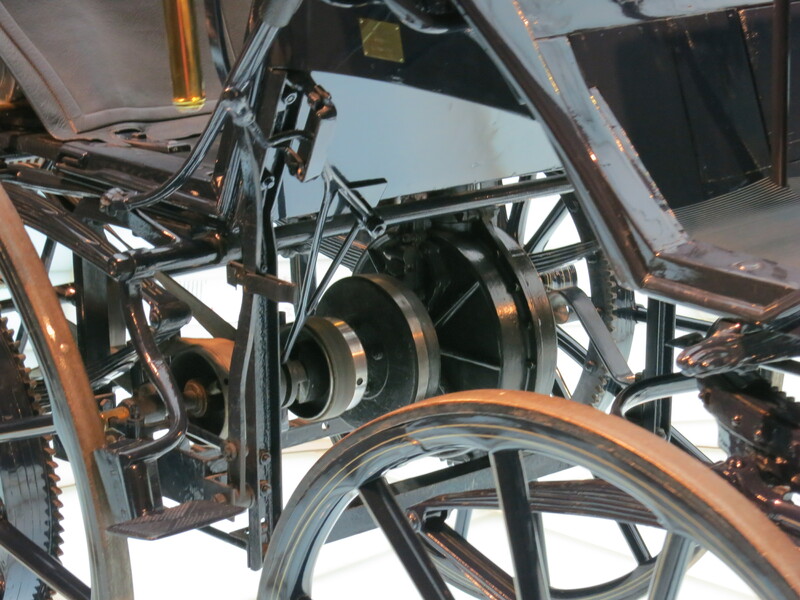 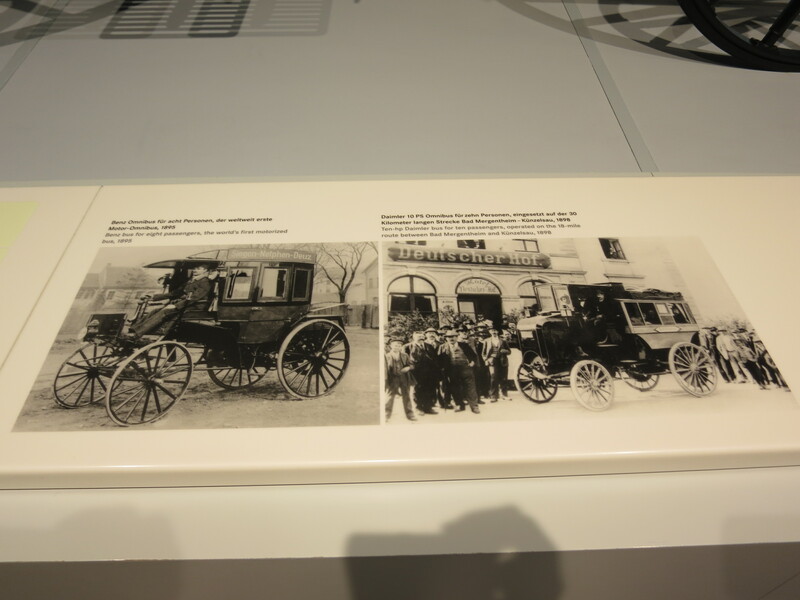 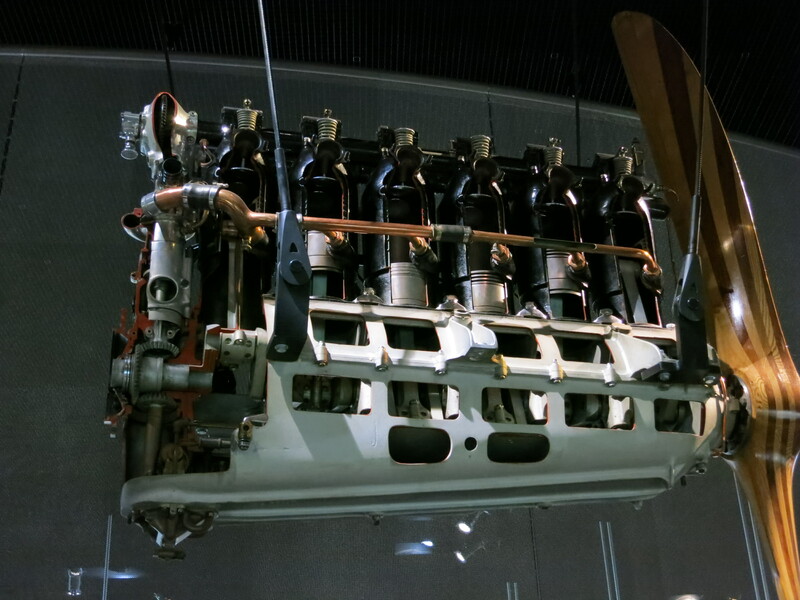 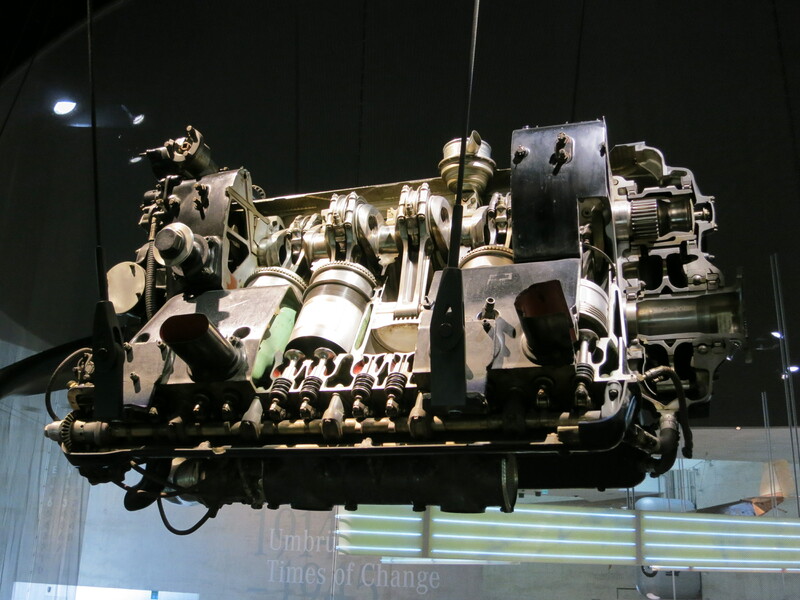 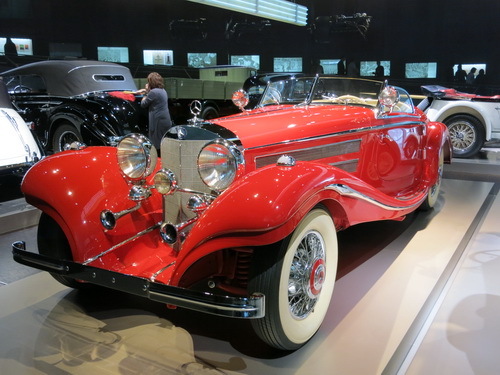 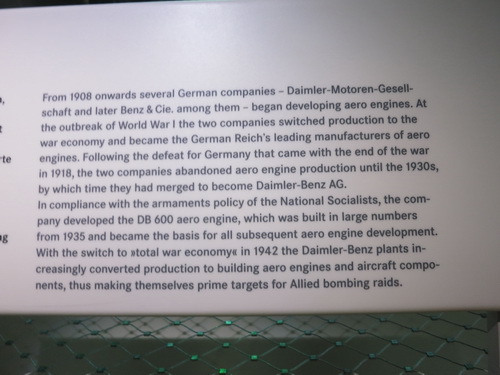 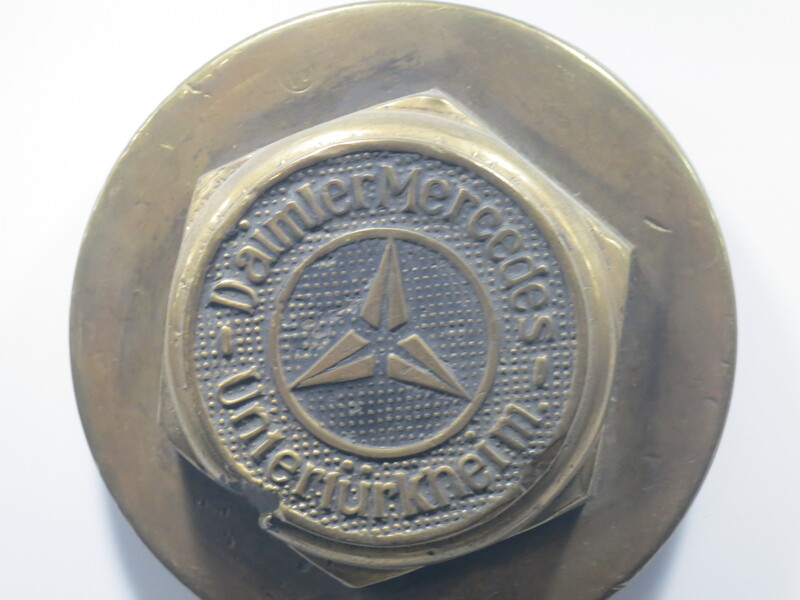 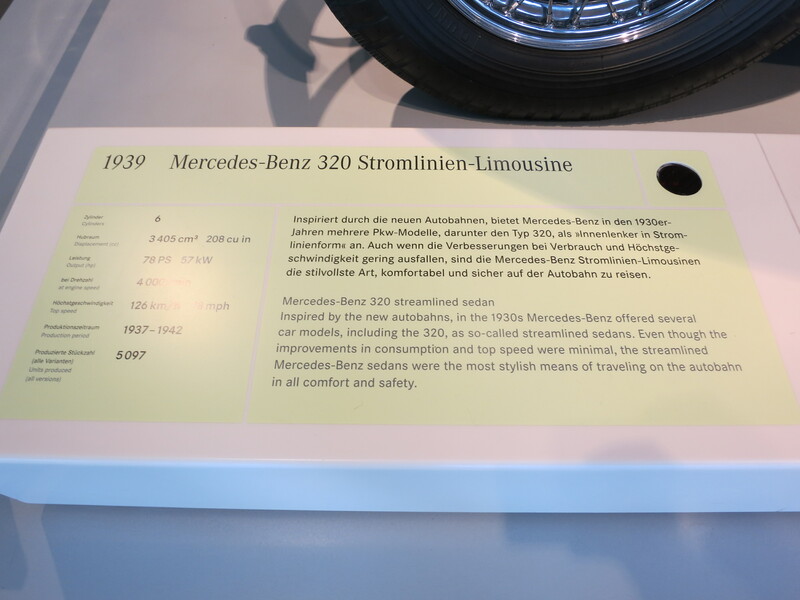 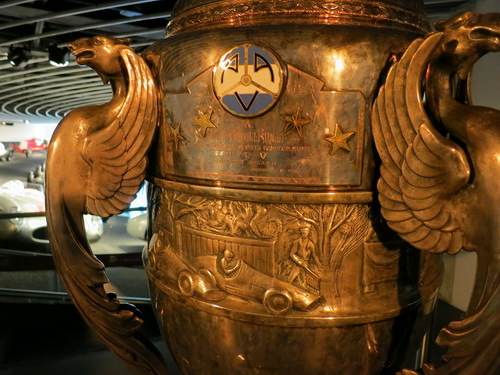 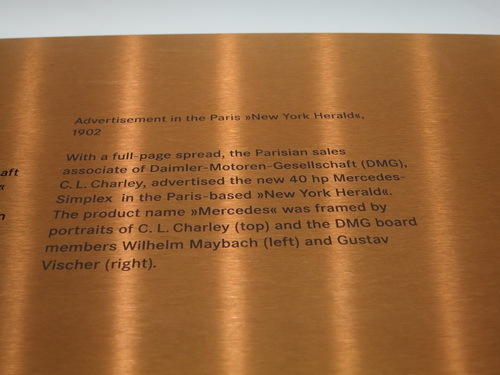 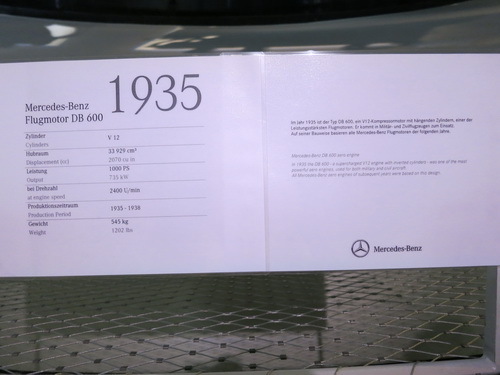 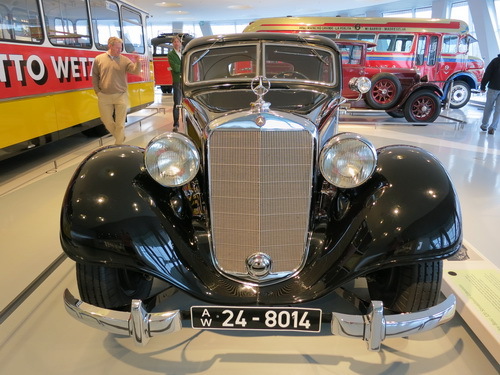 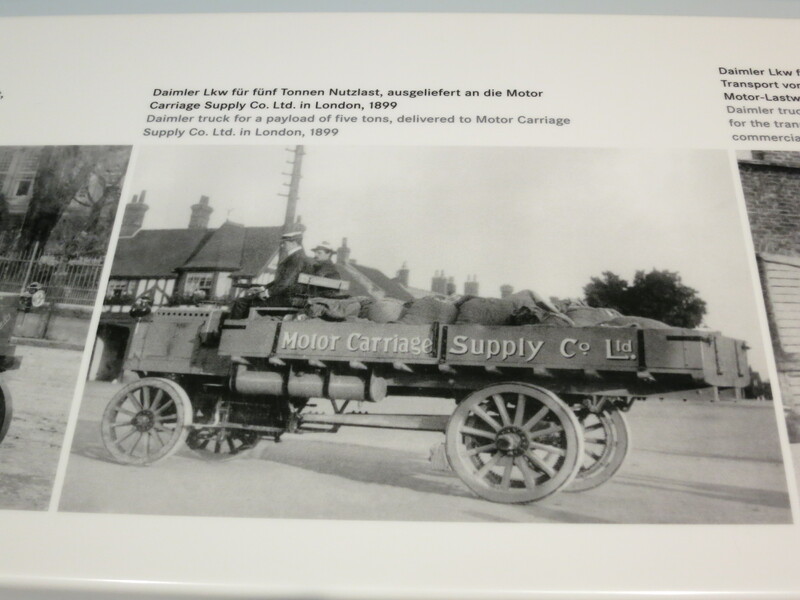 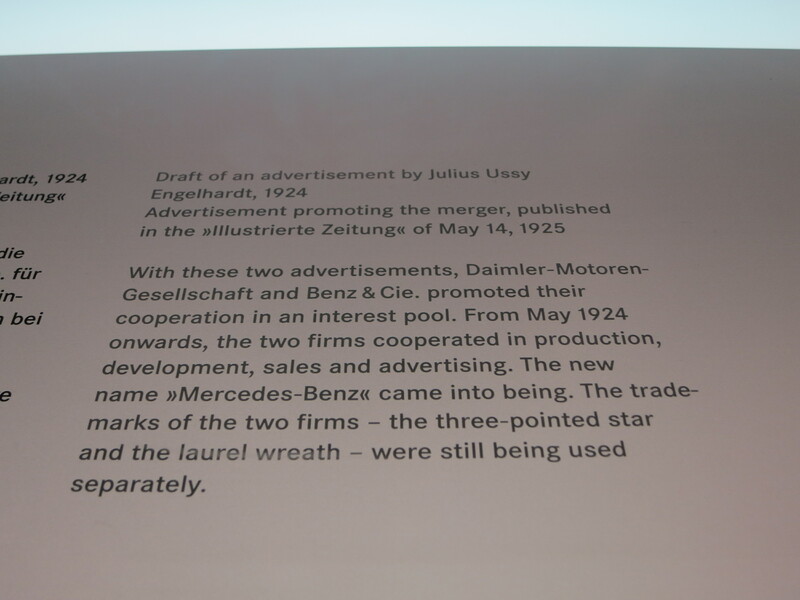 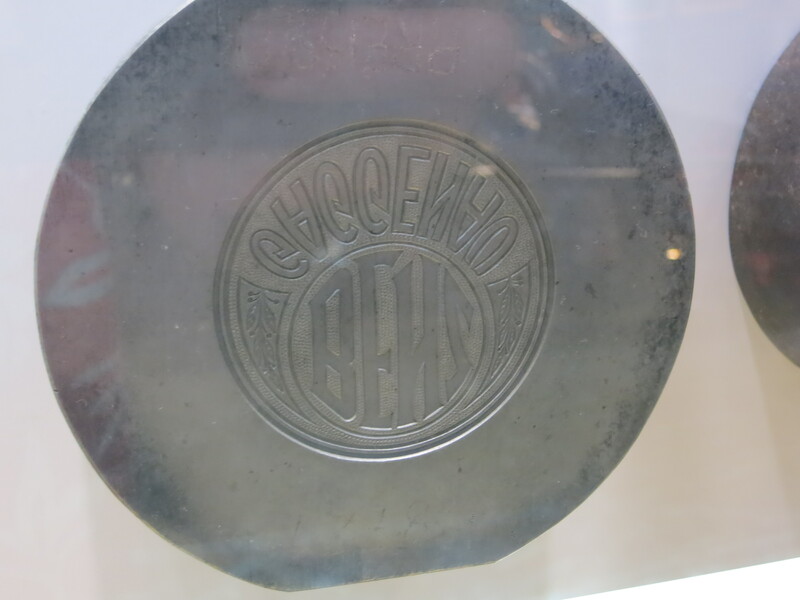 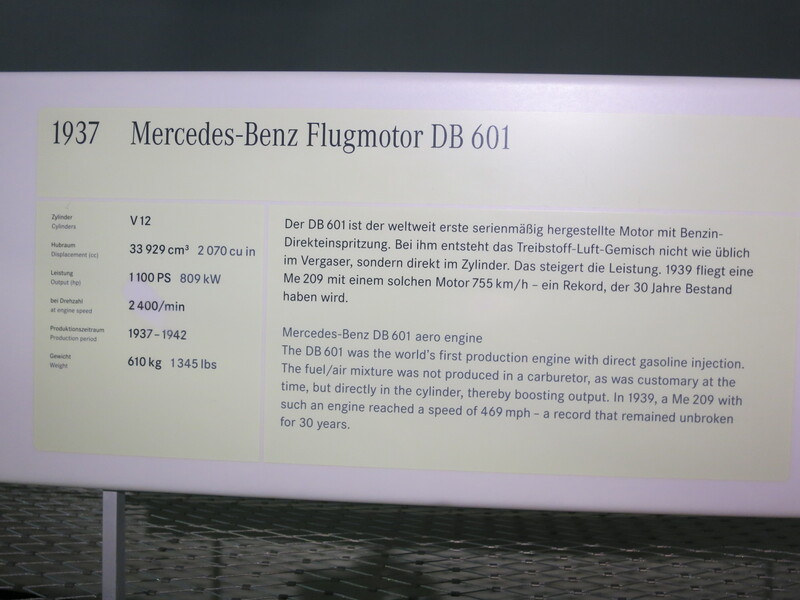 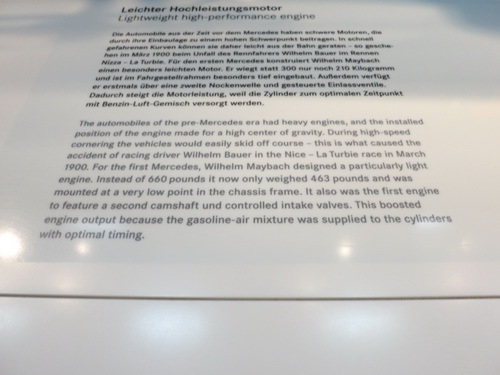 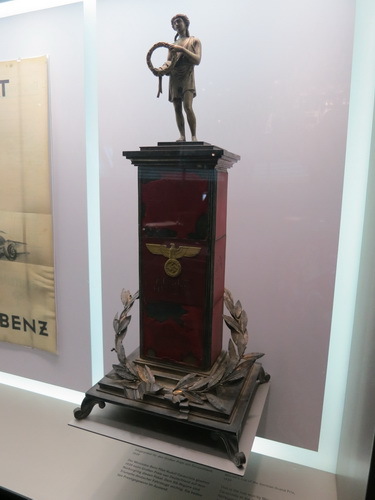 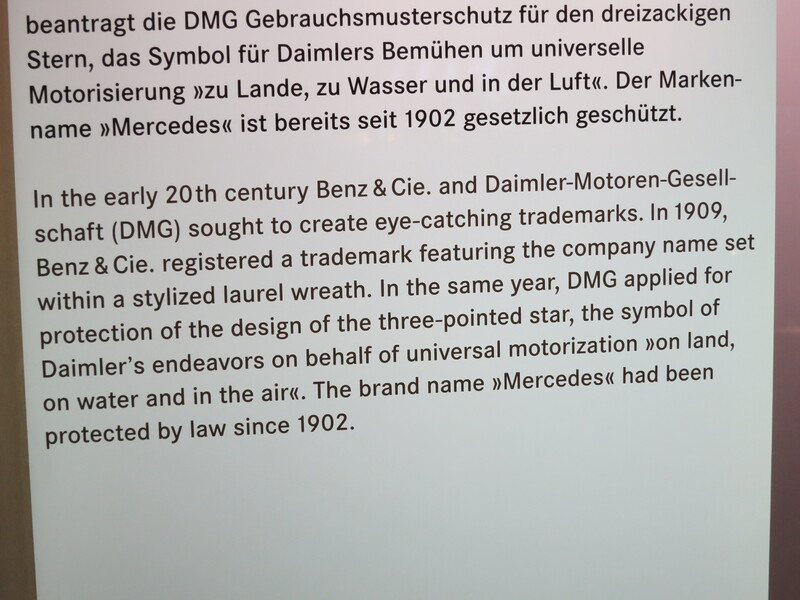 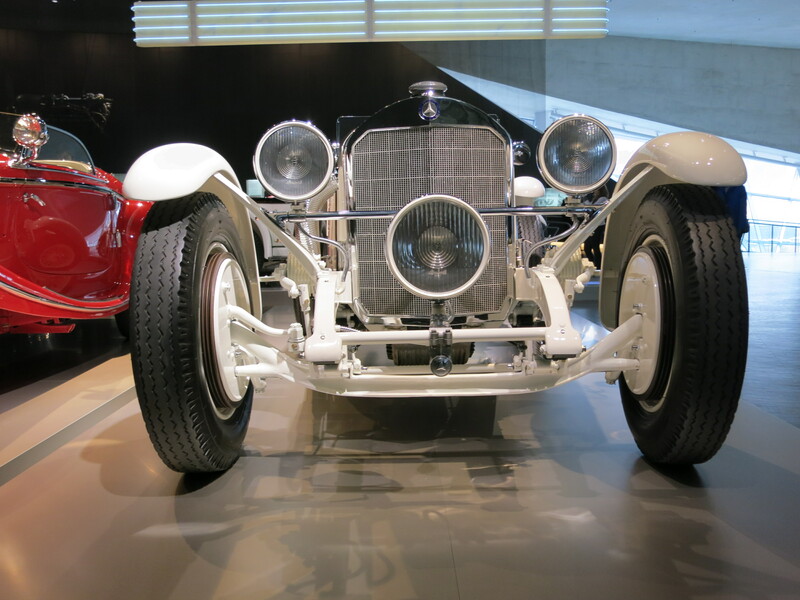 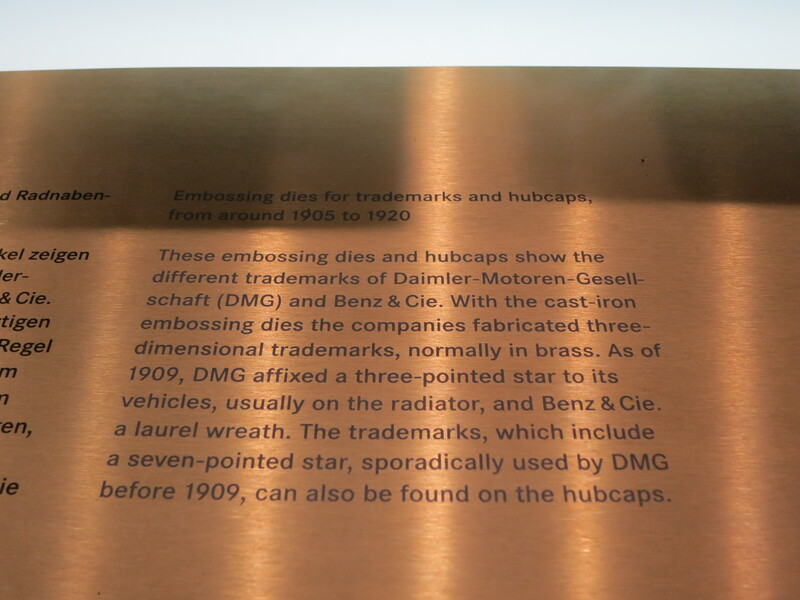 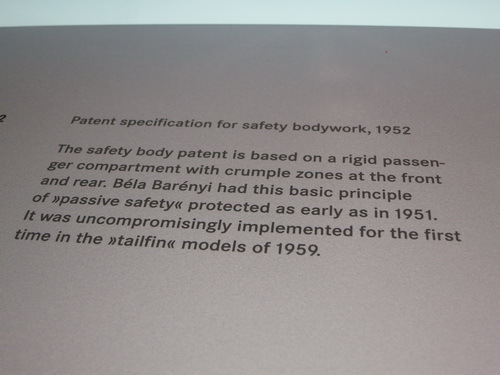 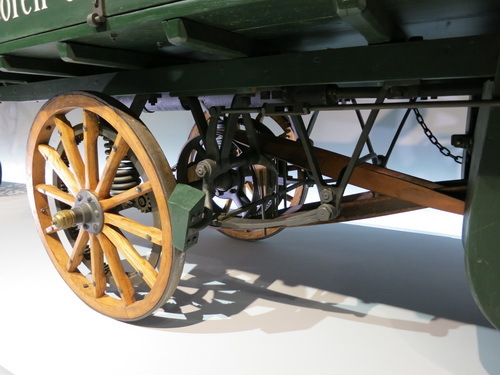 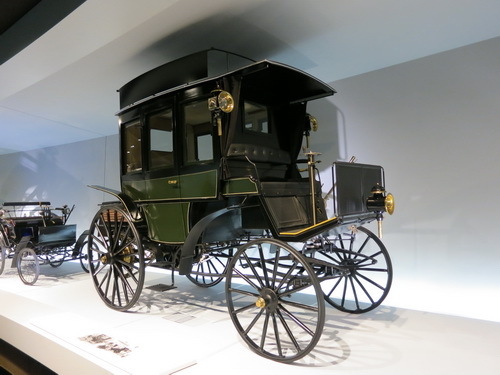 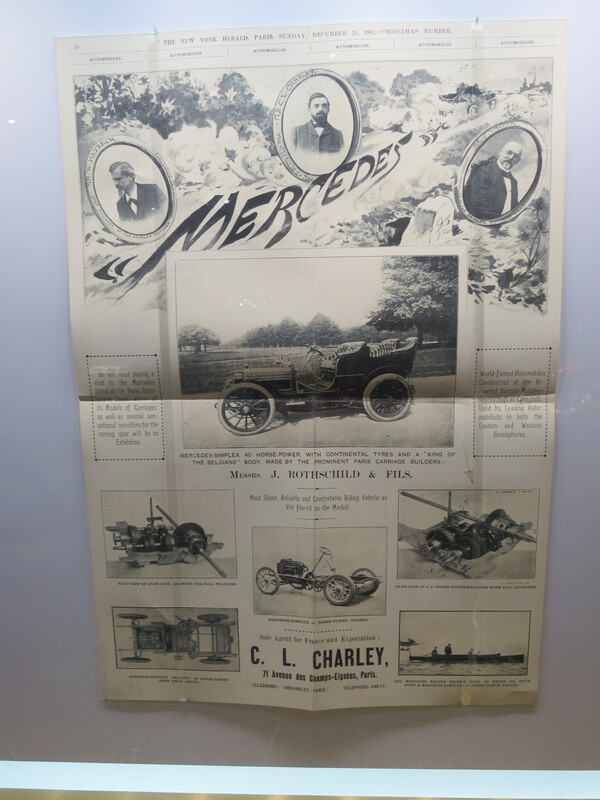 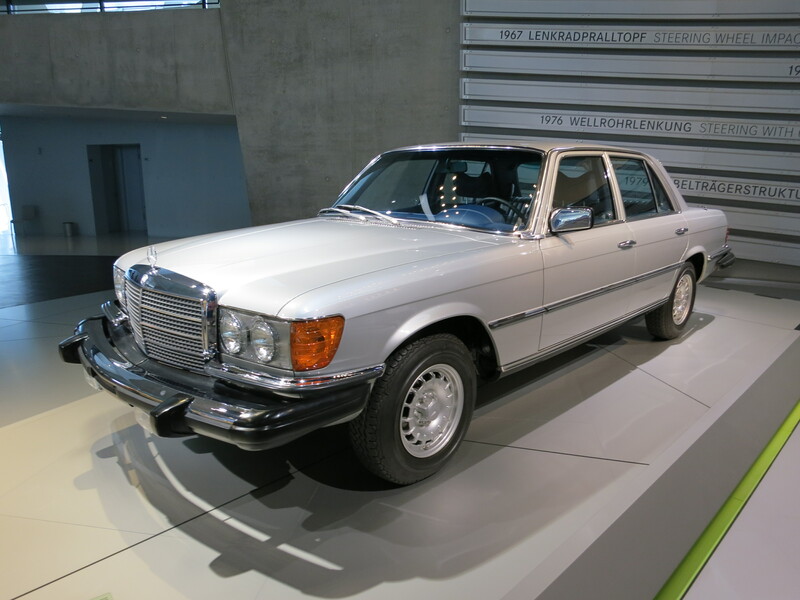 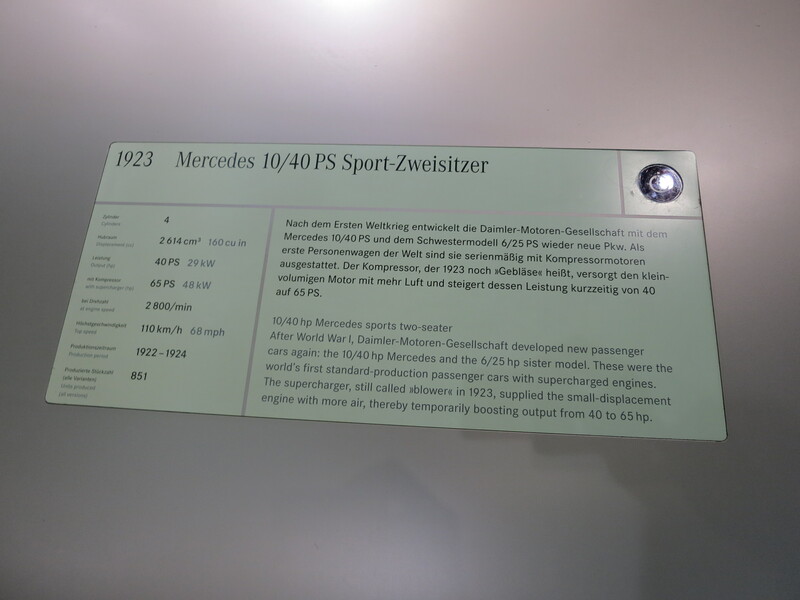 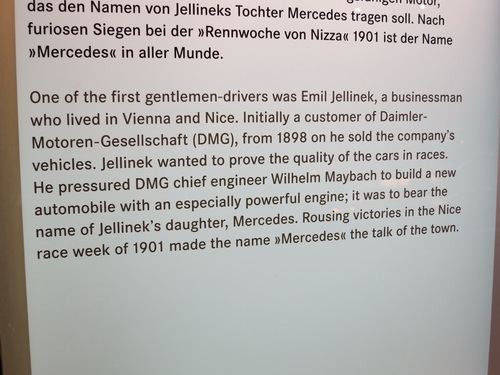 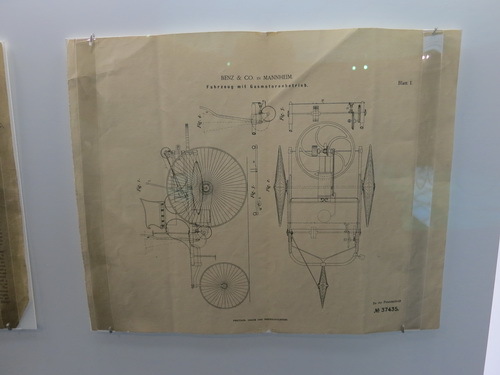 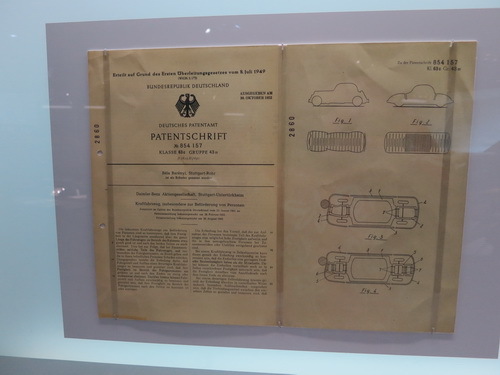 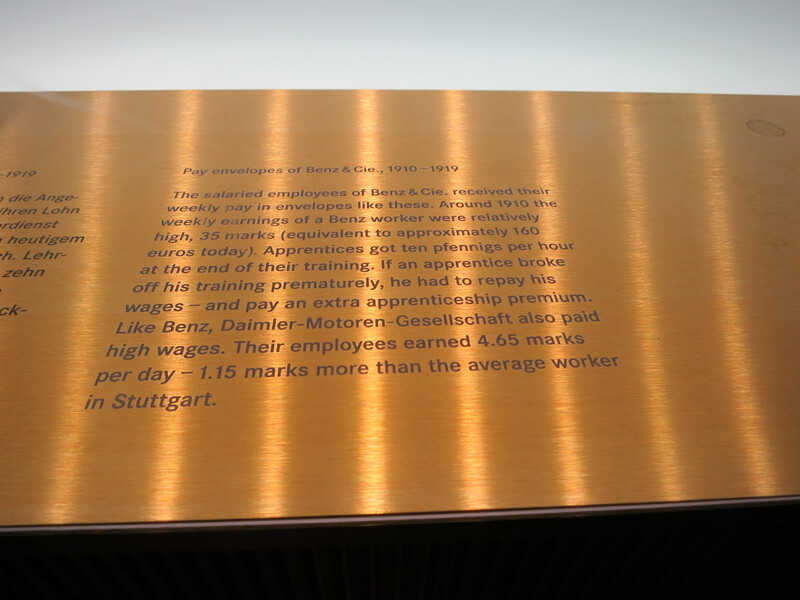 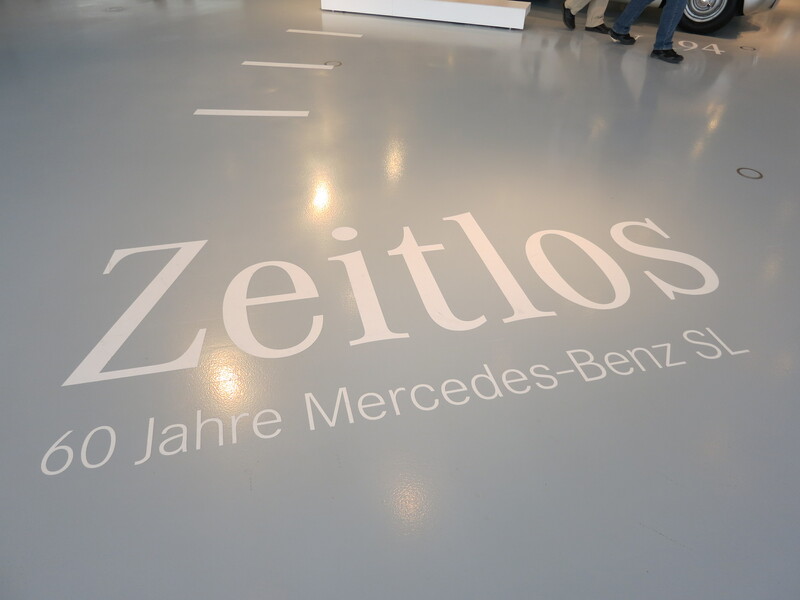 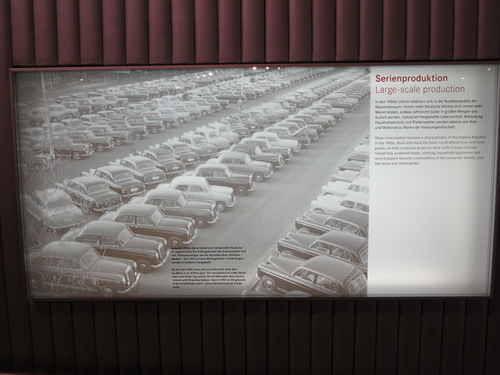 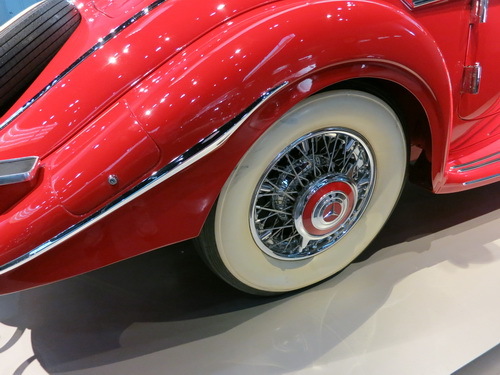 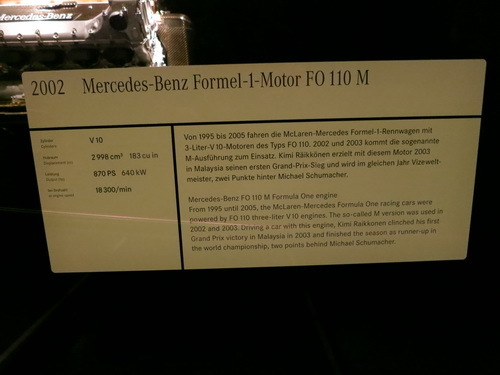 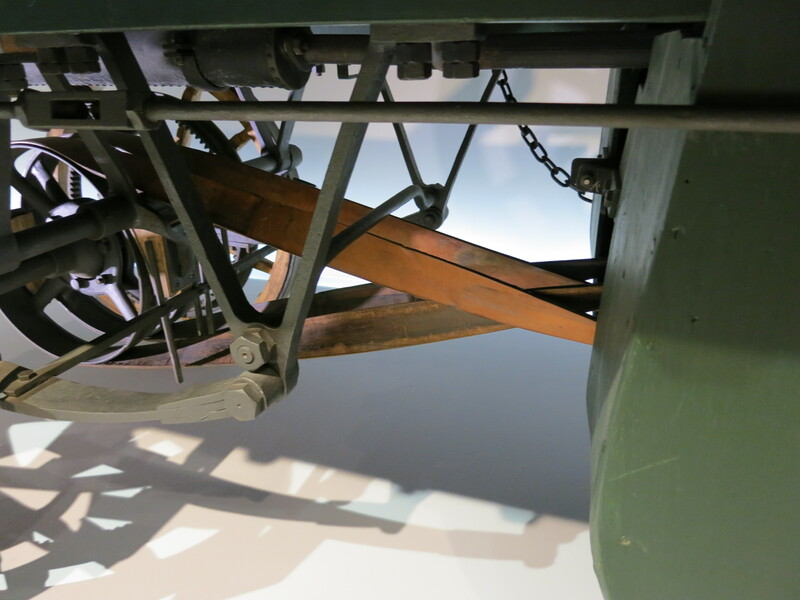 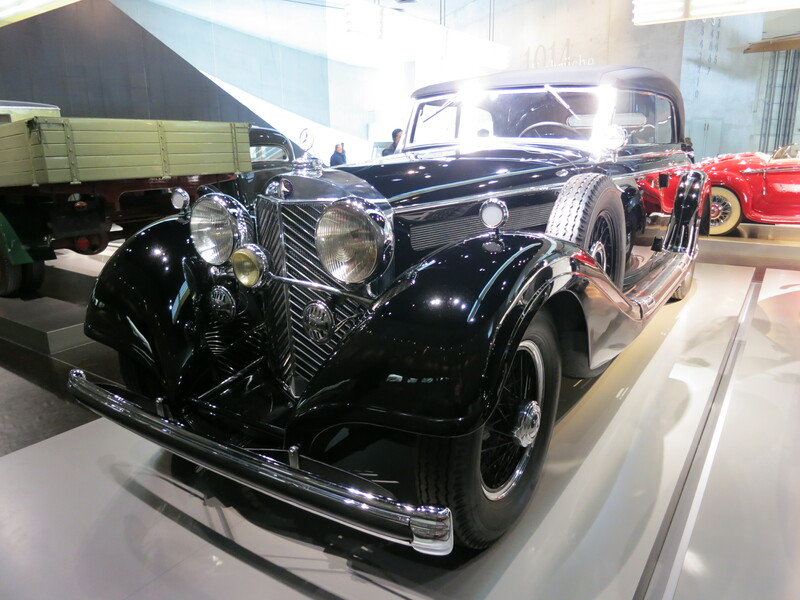 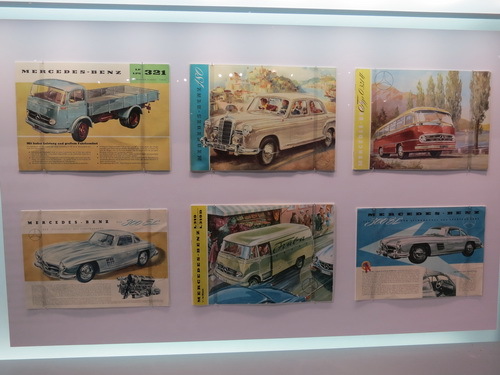 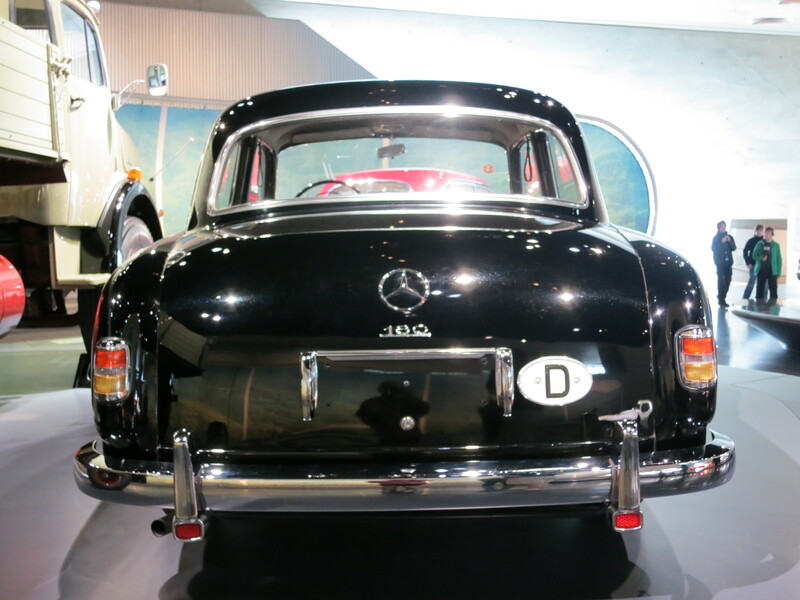 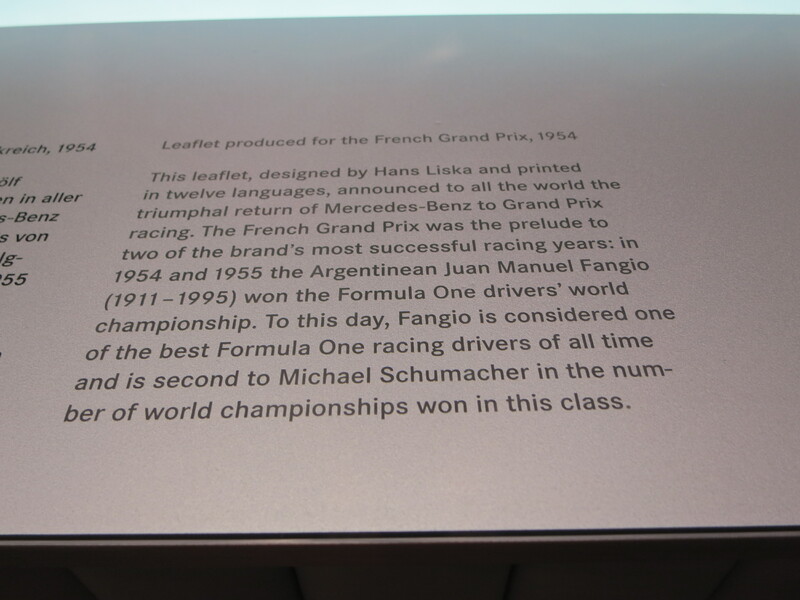 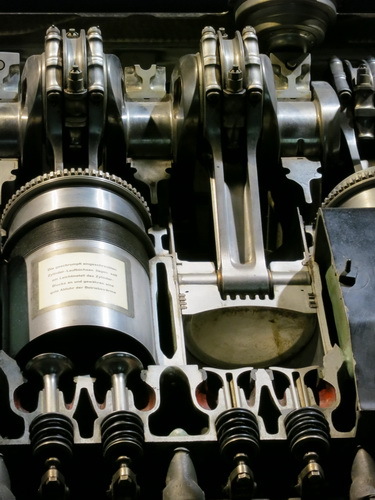 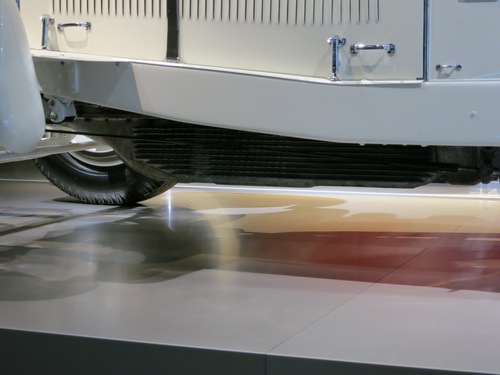 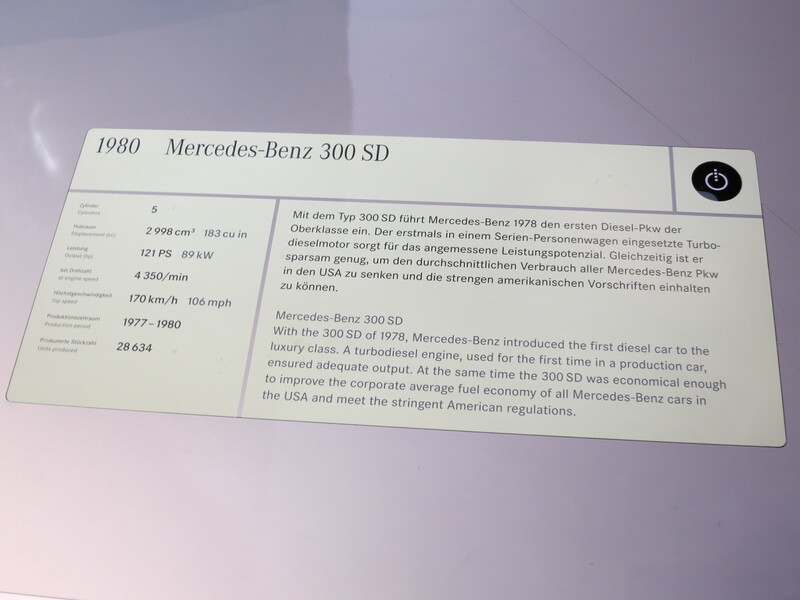 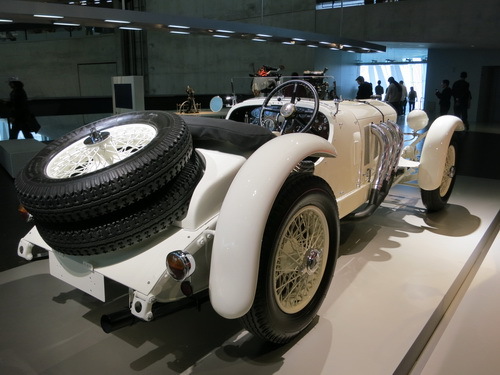 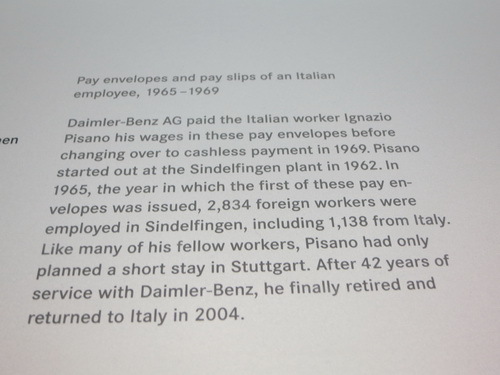 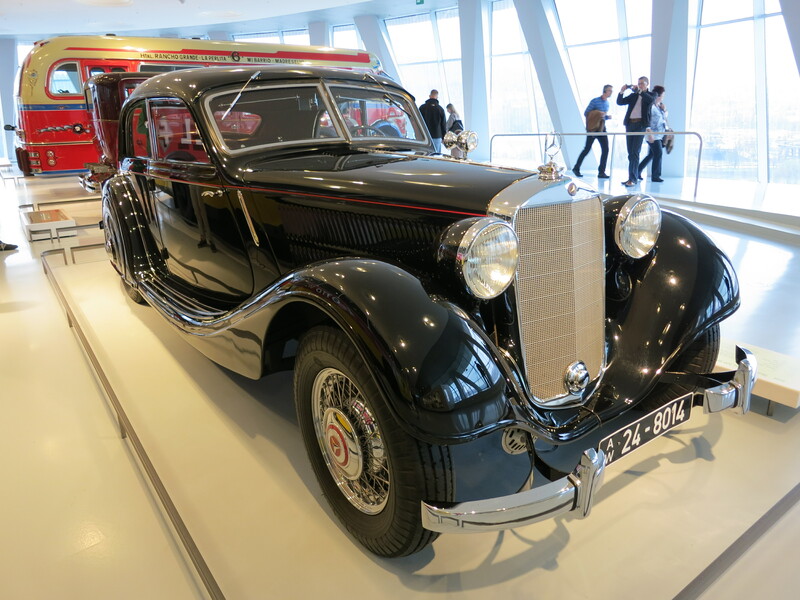 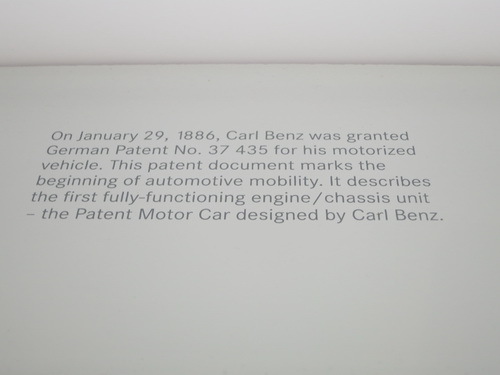 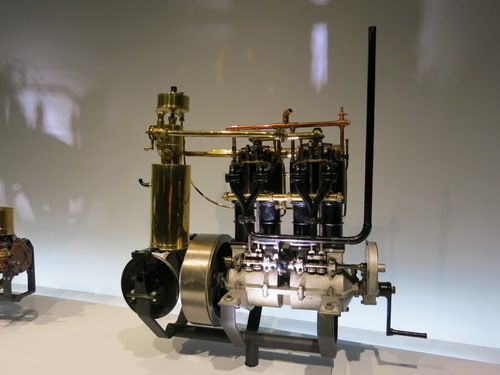 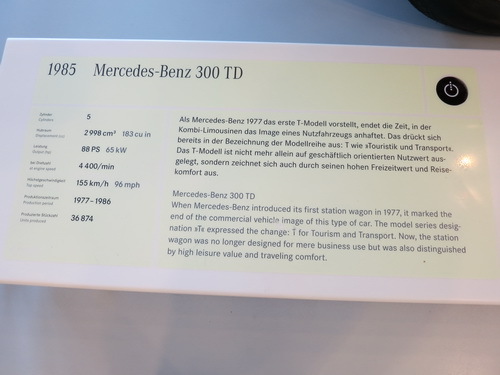 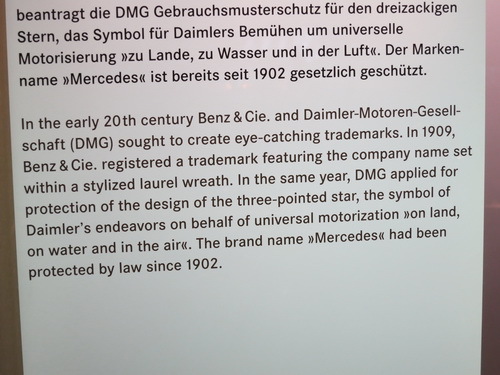 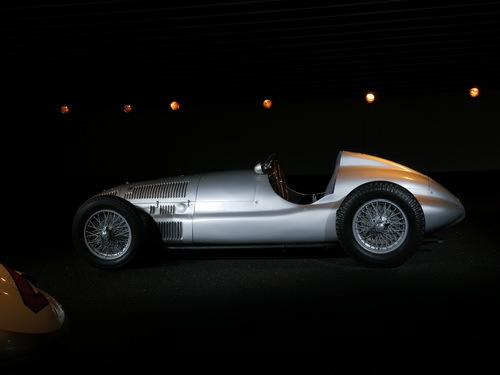 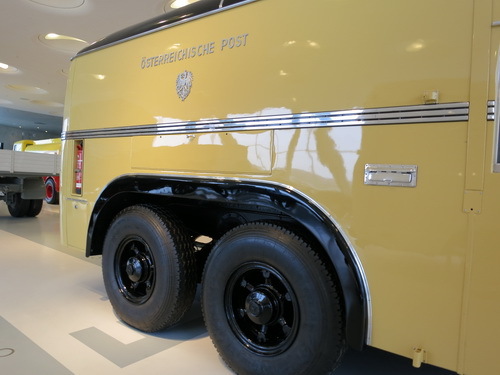 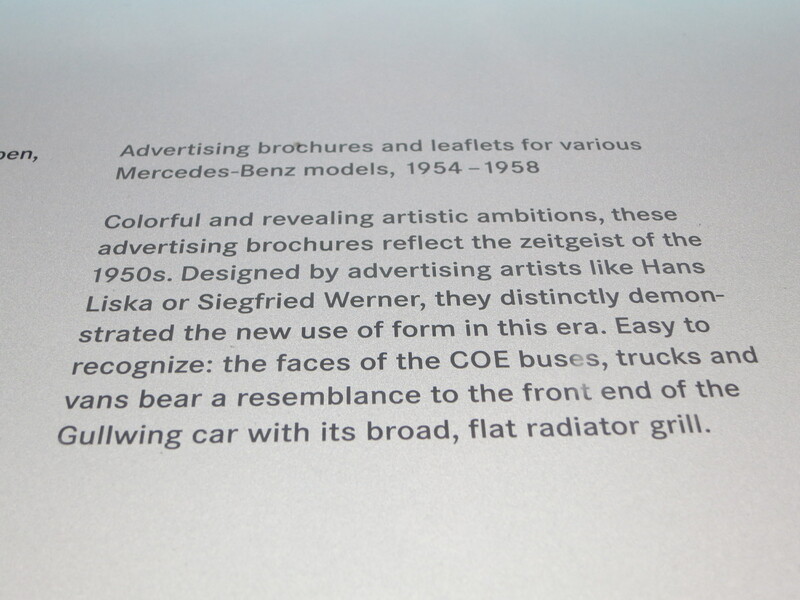 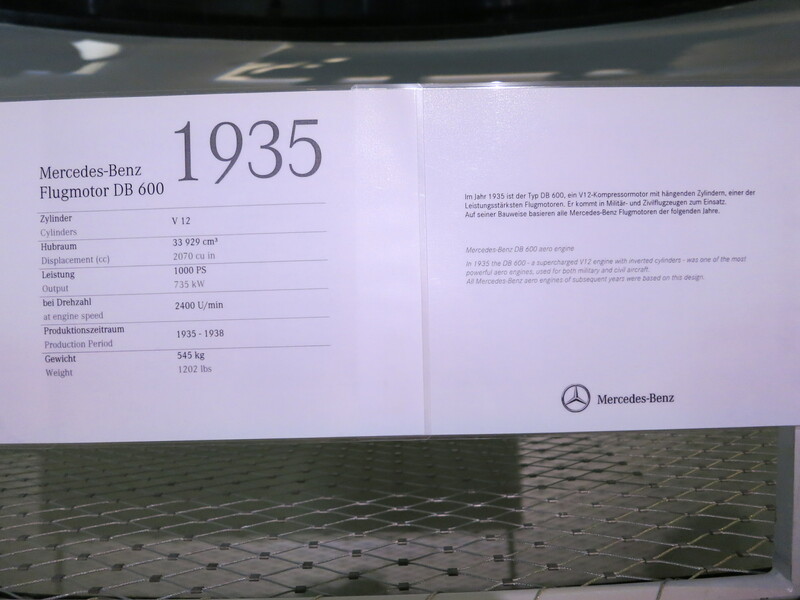 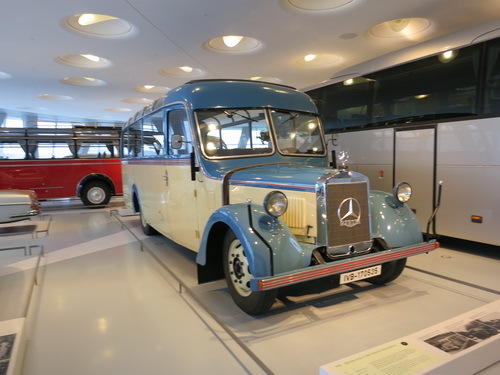 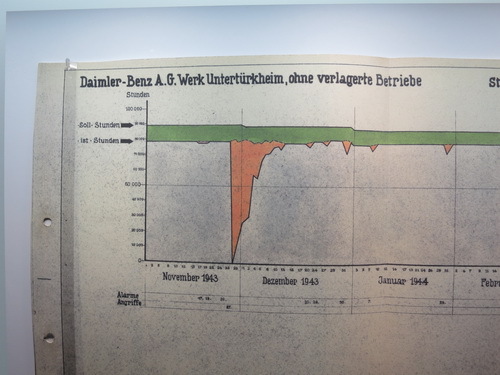 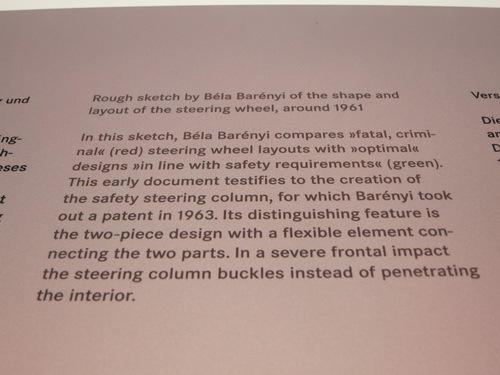 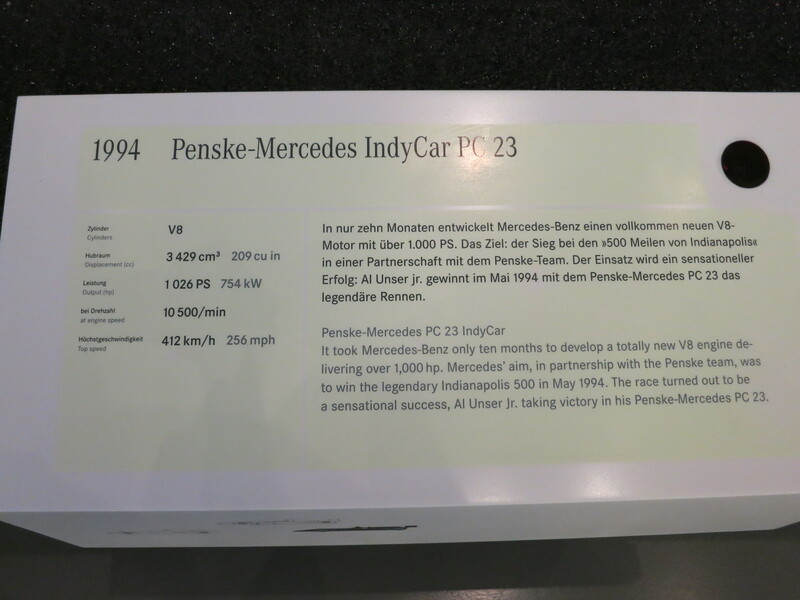 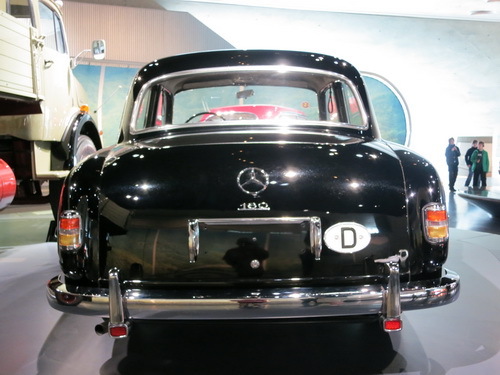 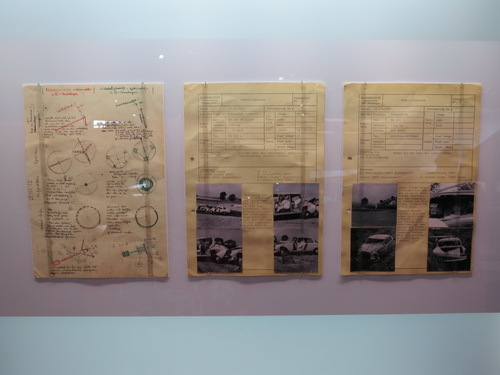 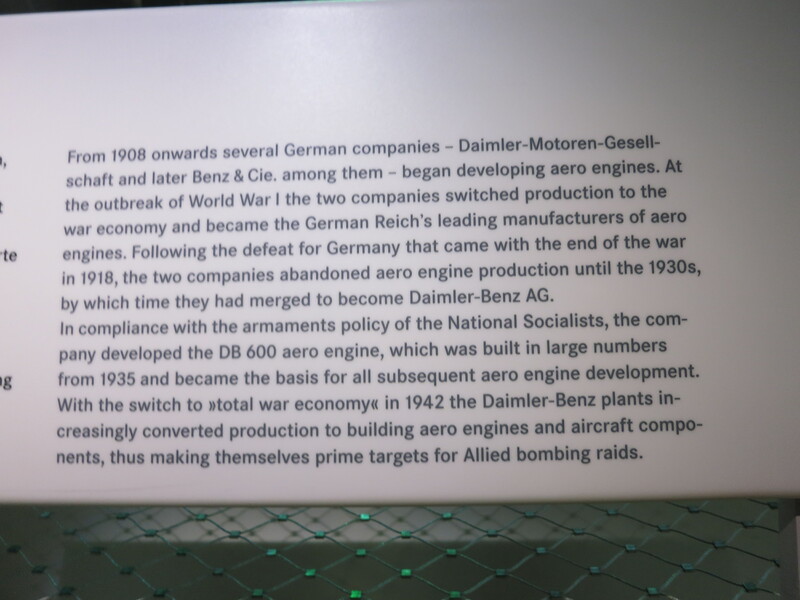 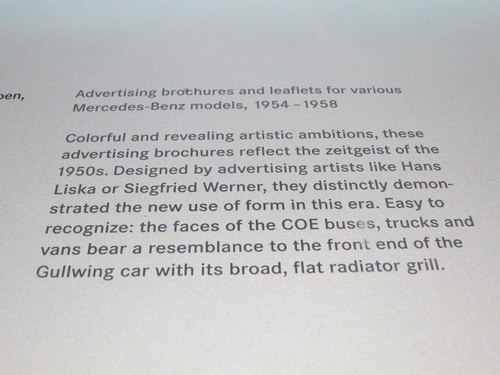 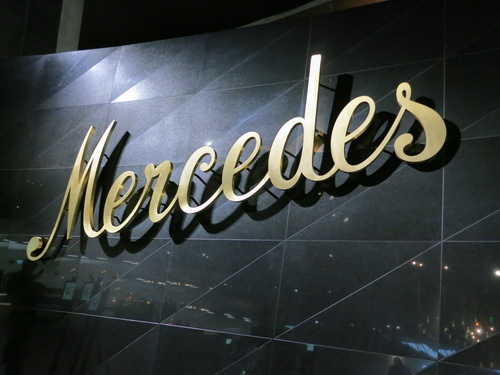 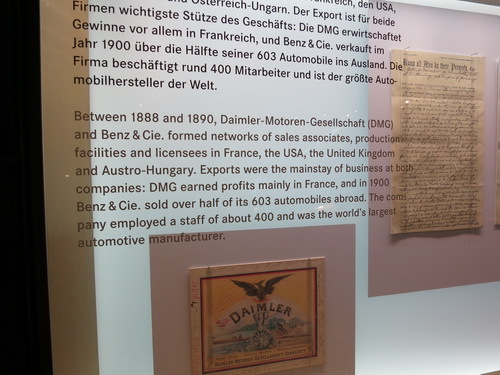 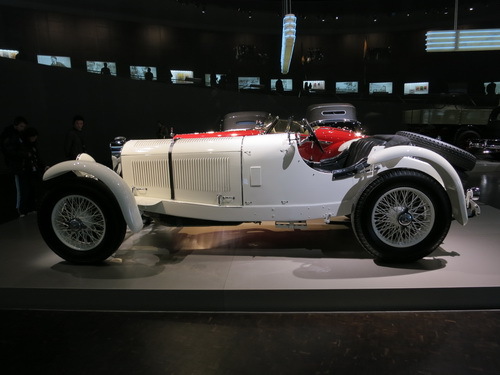 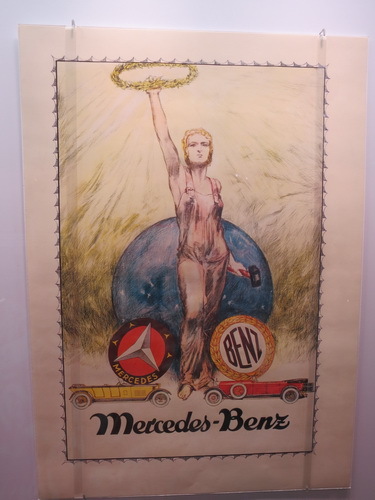 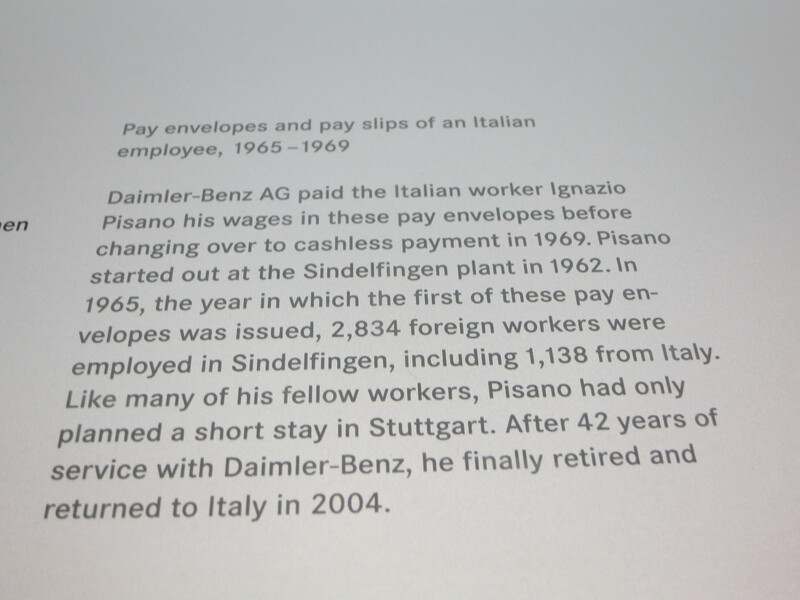 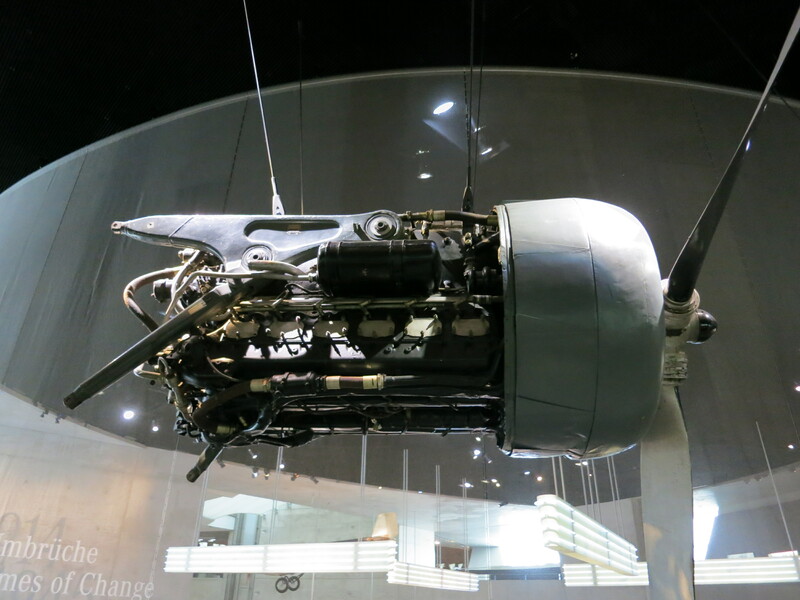 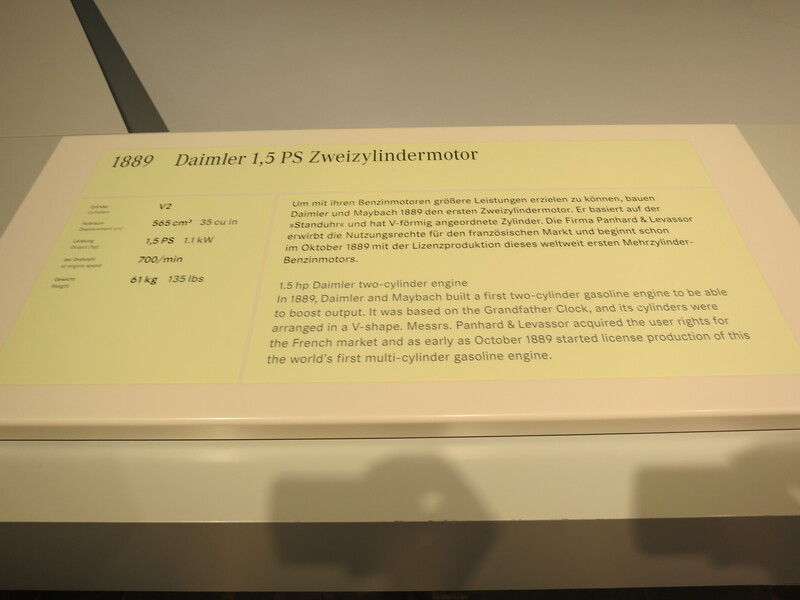 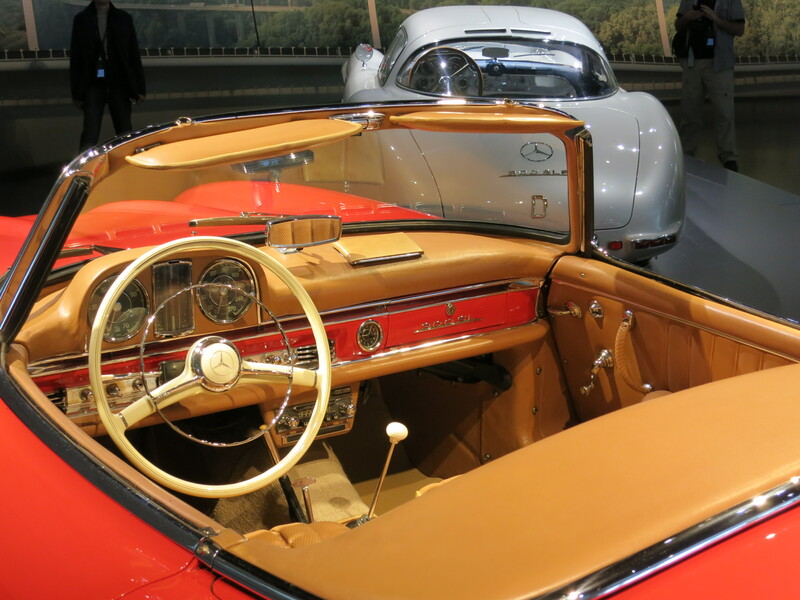 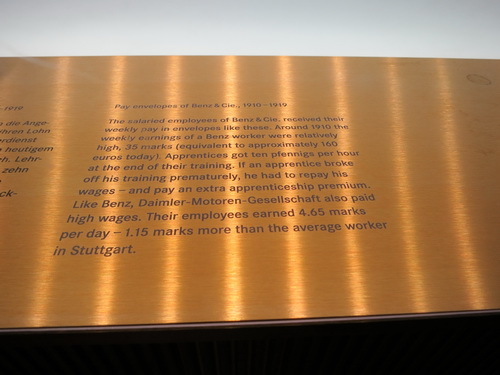 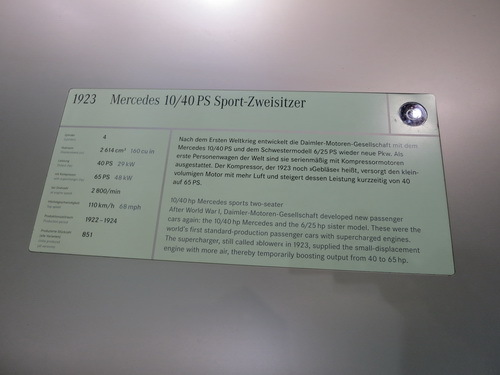 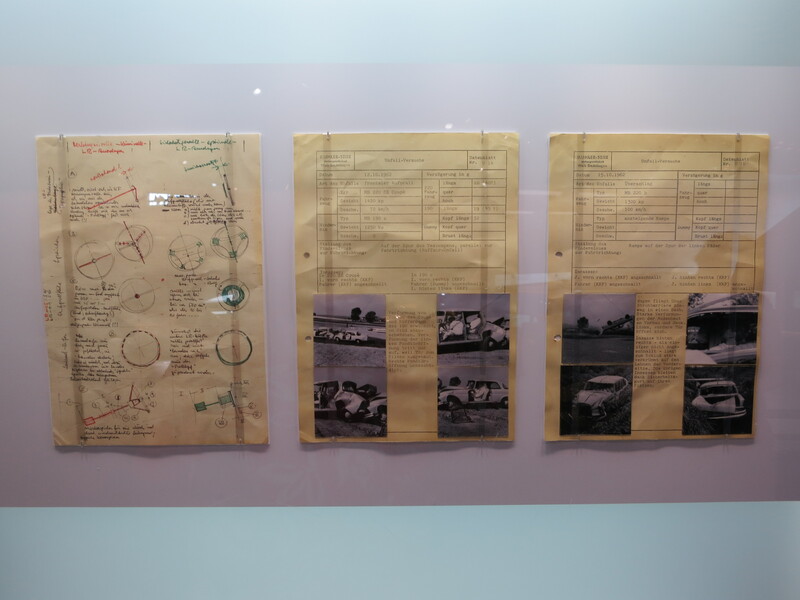 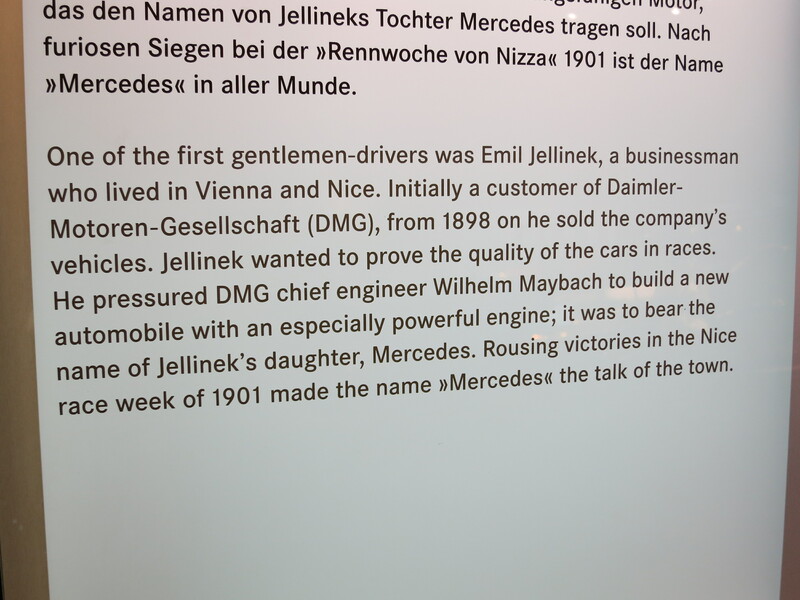 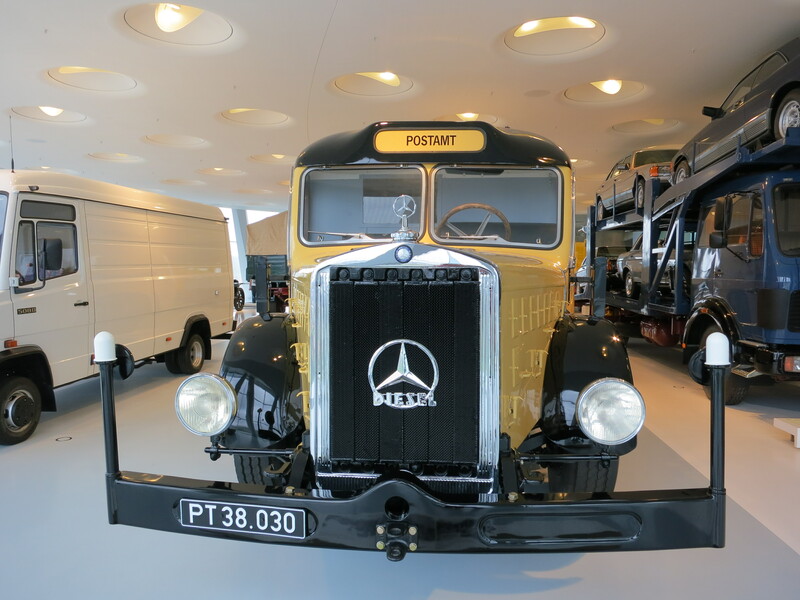 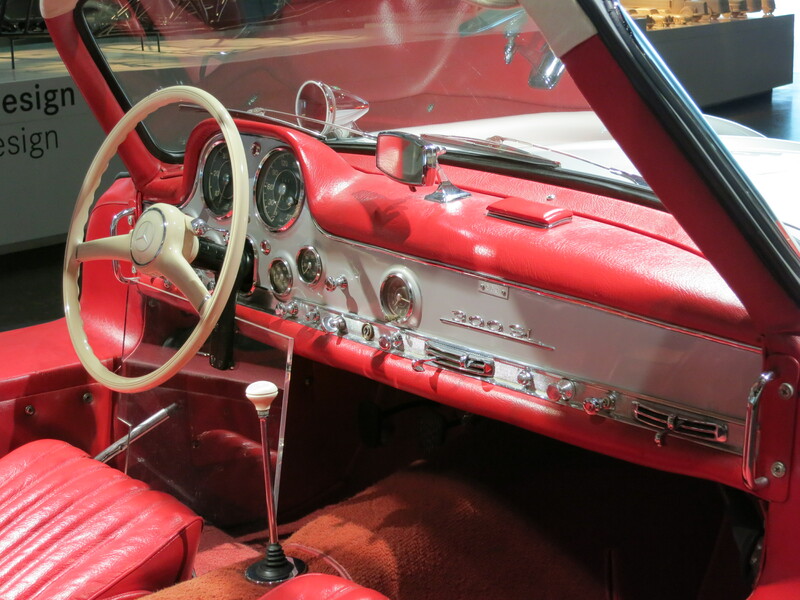 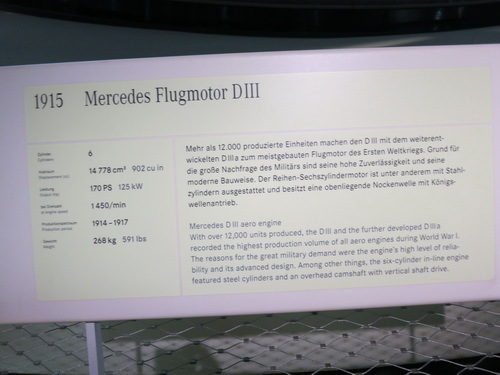 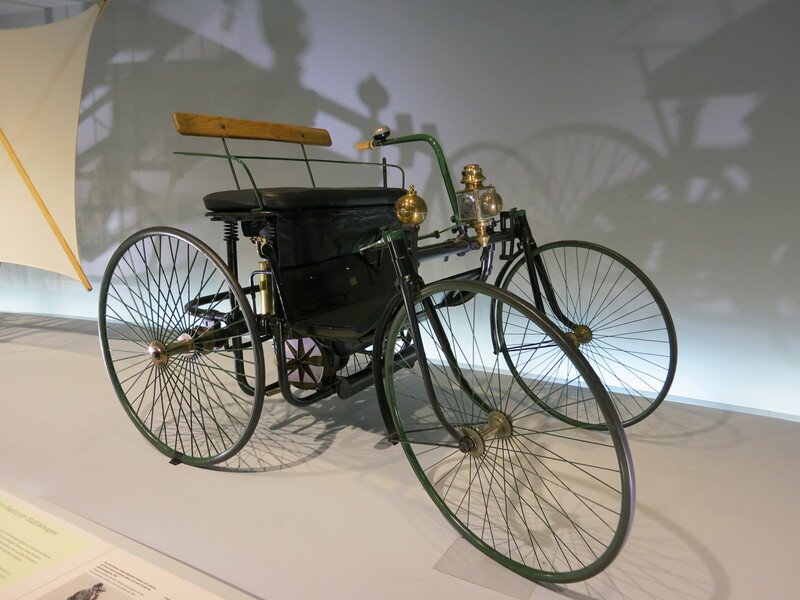 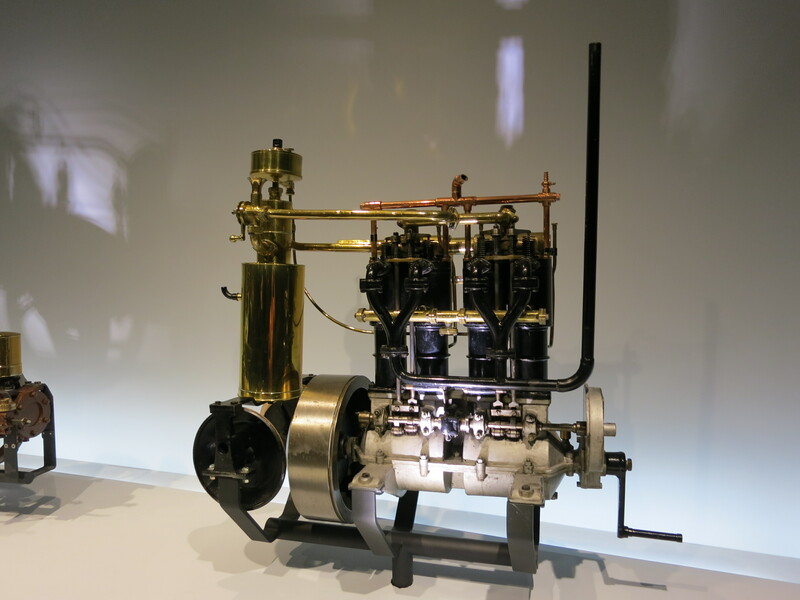 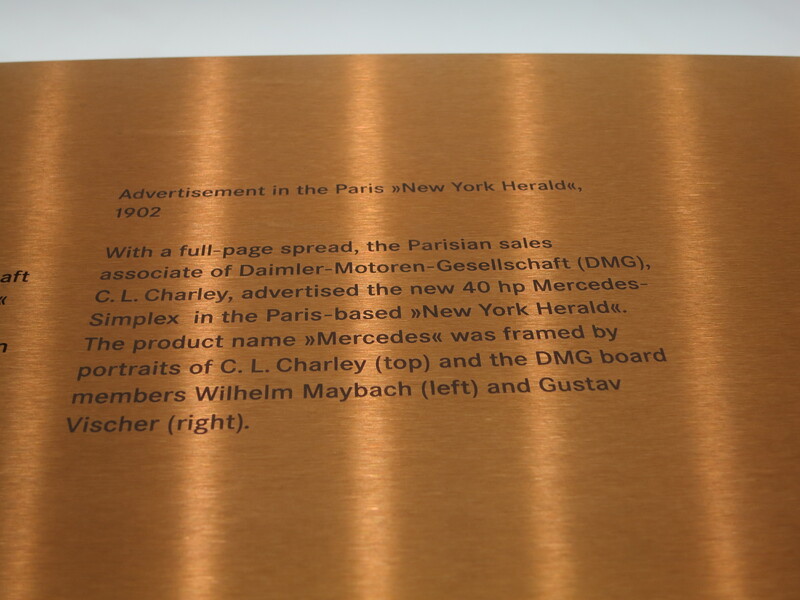 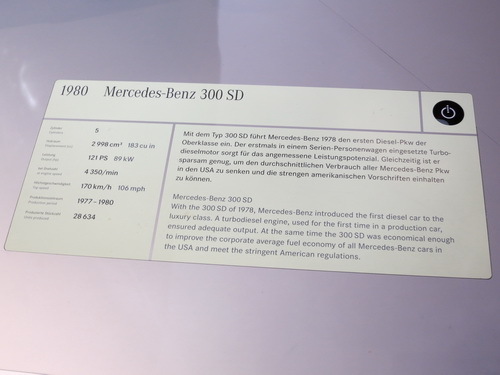 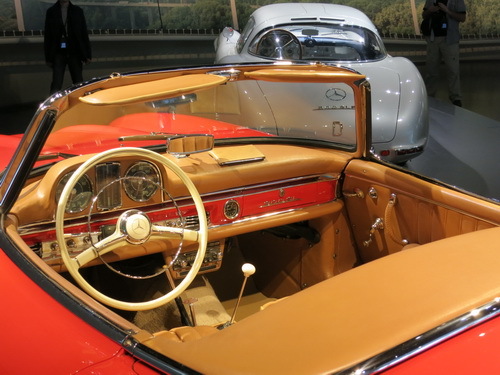 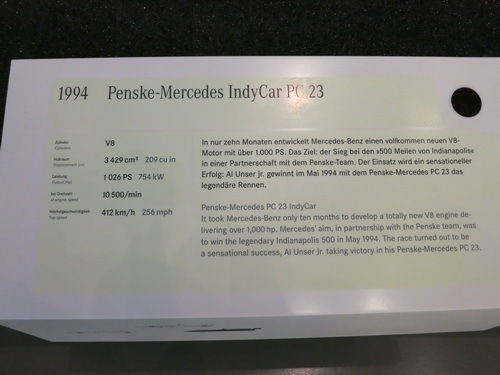 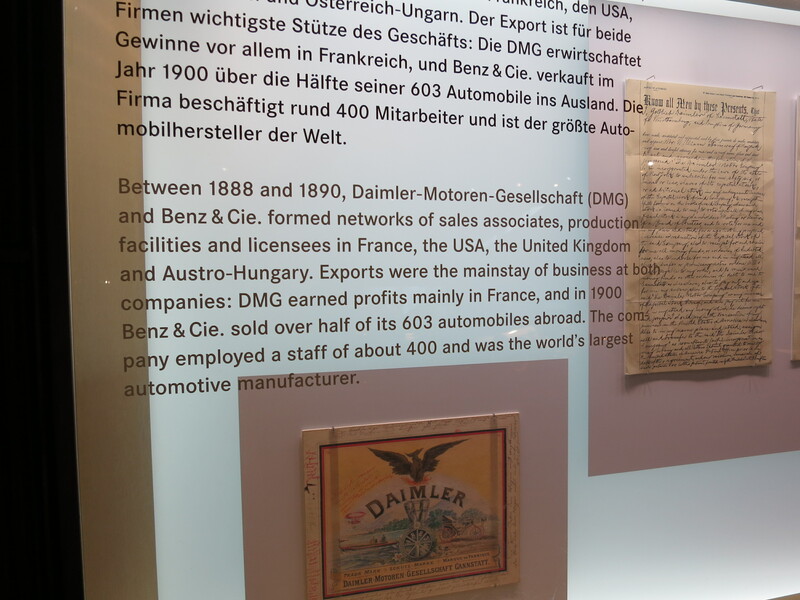 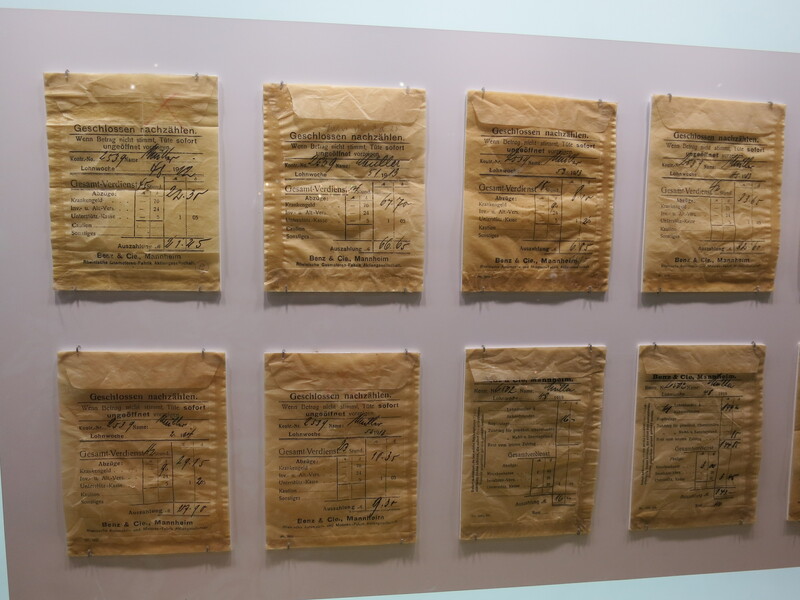 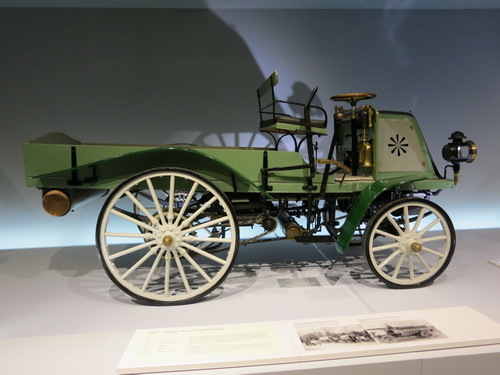 To the credit of Mercedes-Benz, they didn't shrink from the fact that they made war material for the Nazis nor that they employed forced laborers. 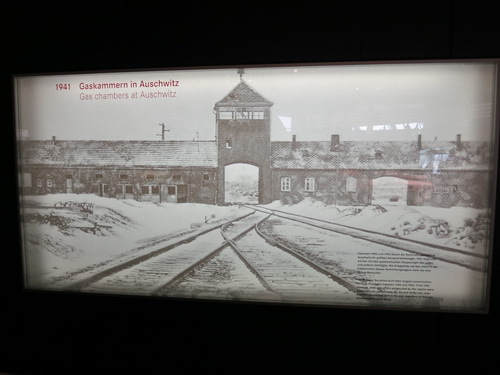 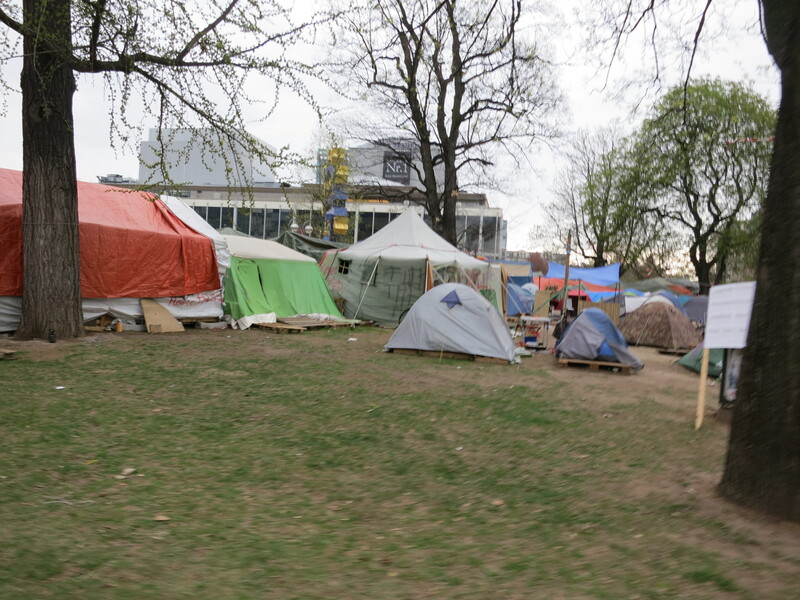 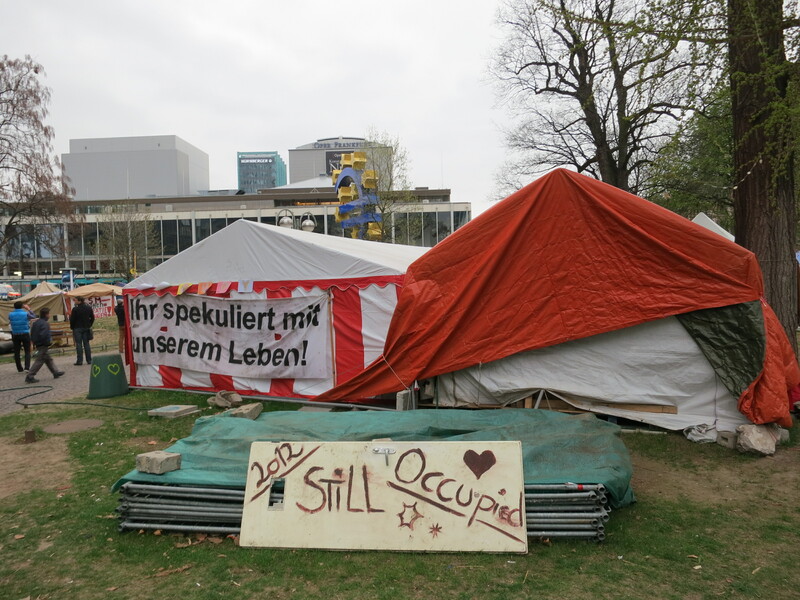 Overall, a very thought-provoking experience. 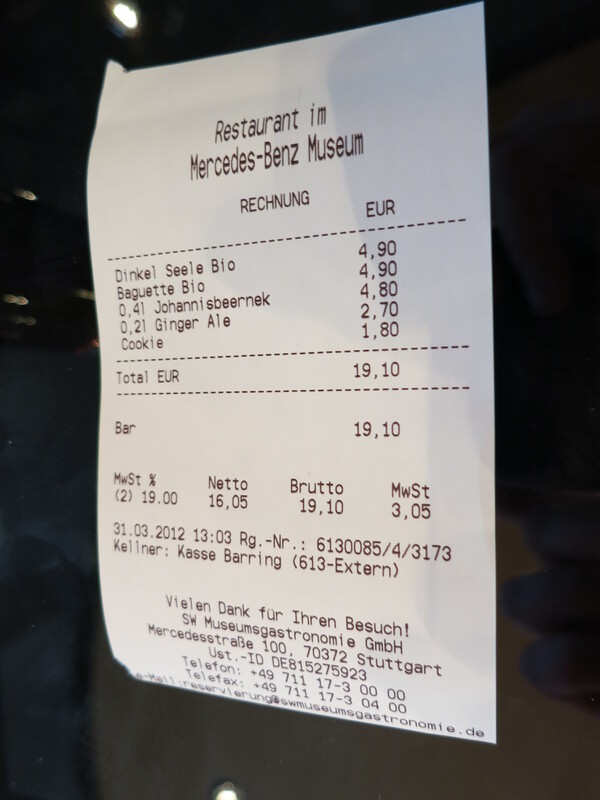 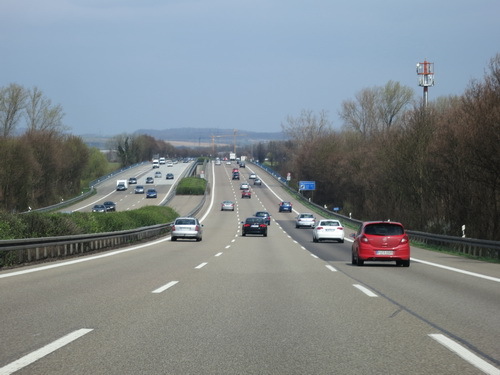 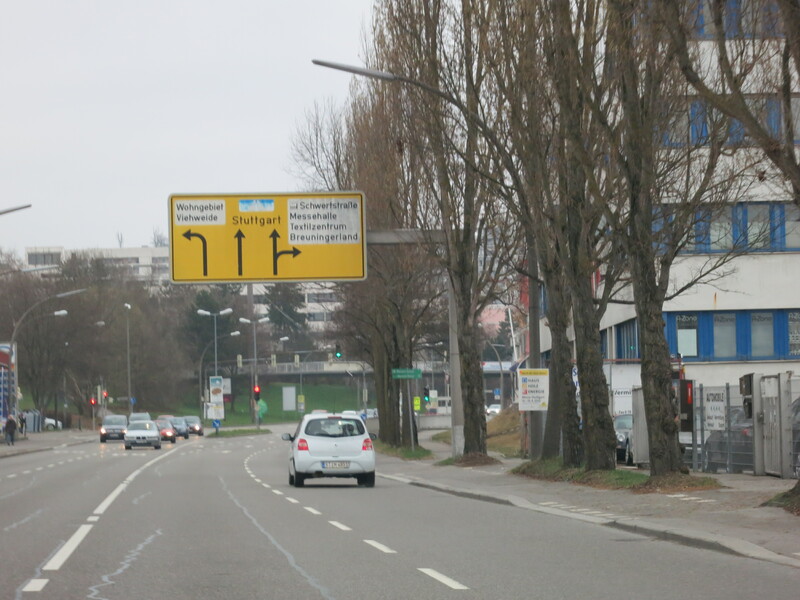 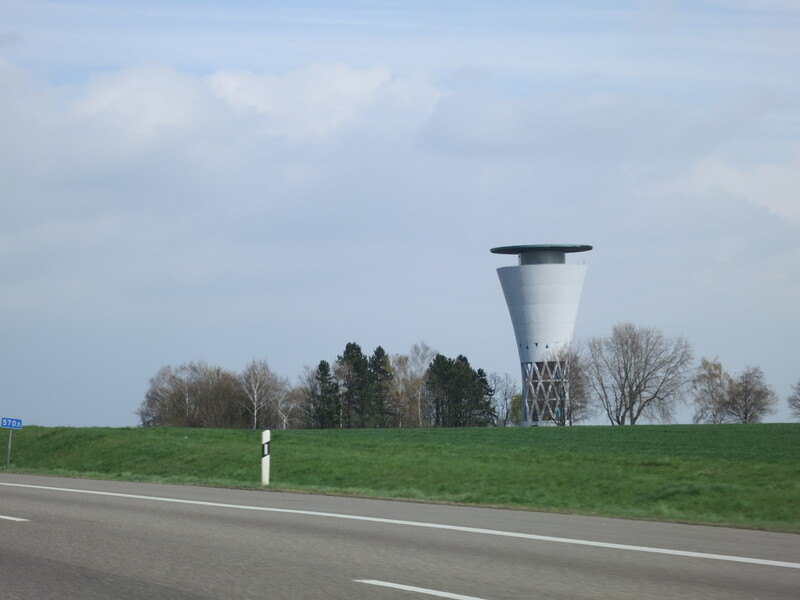 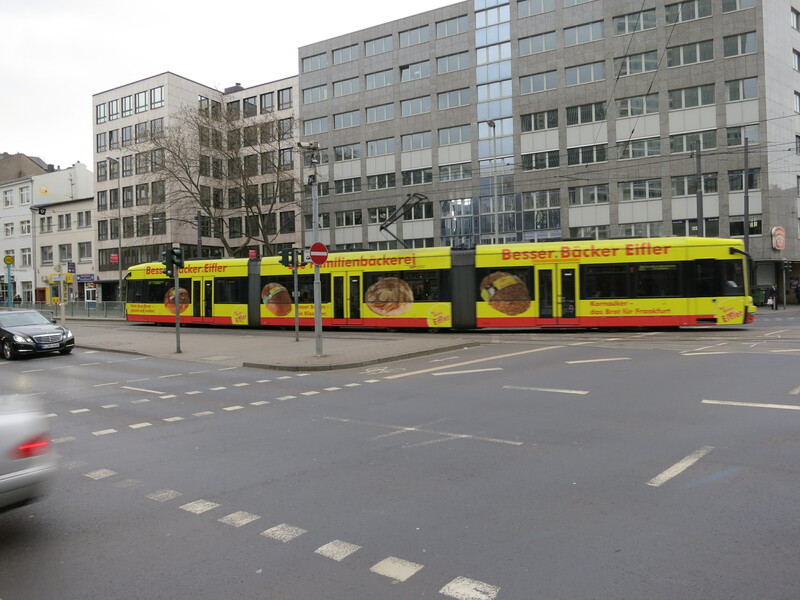 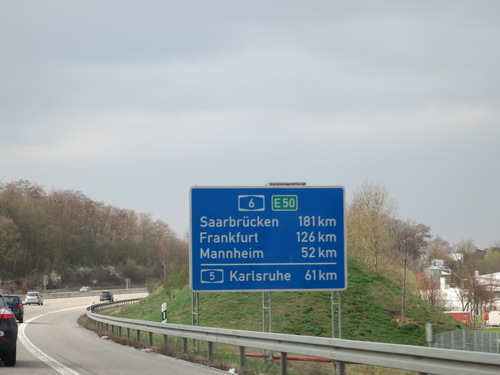 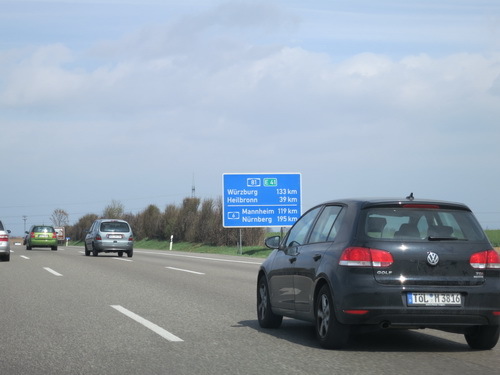 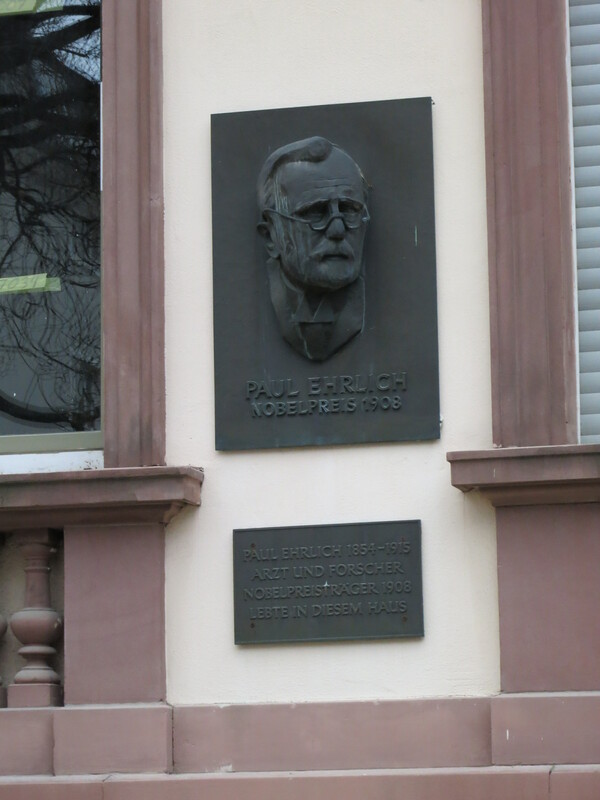 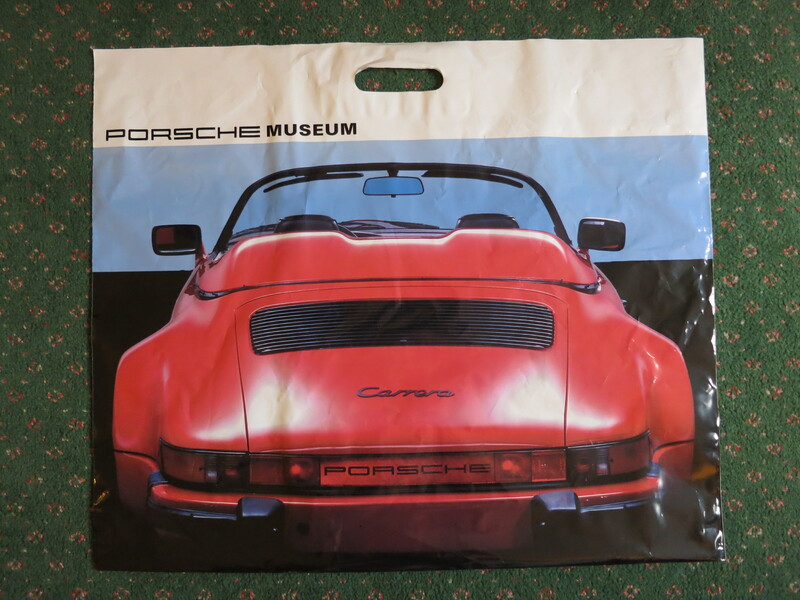 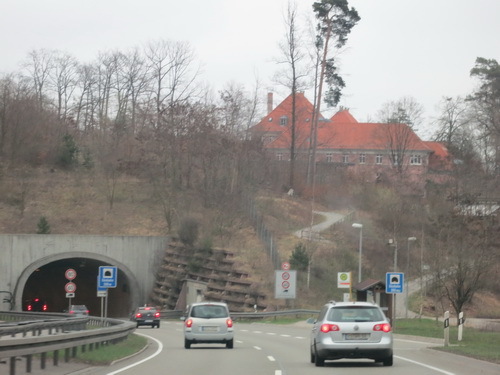 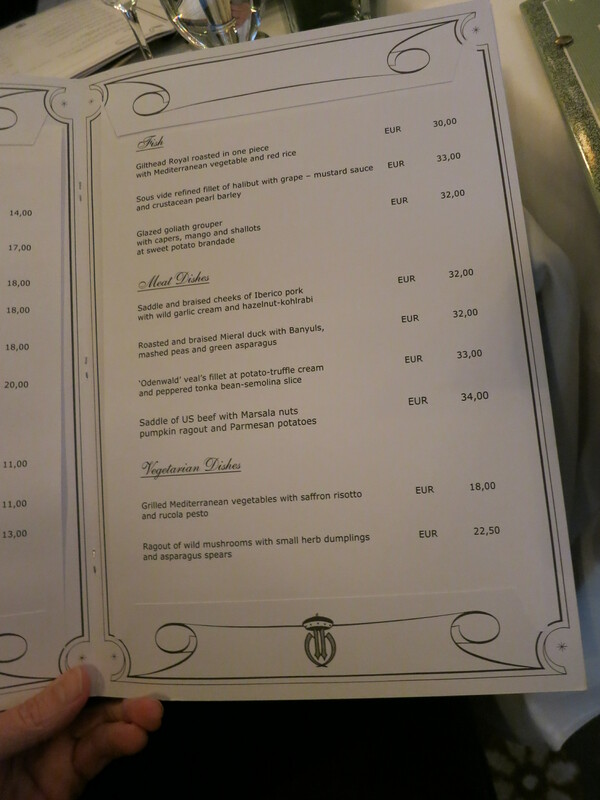 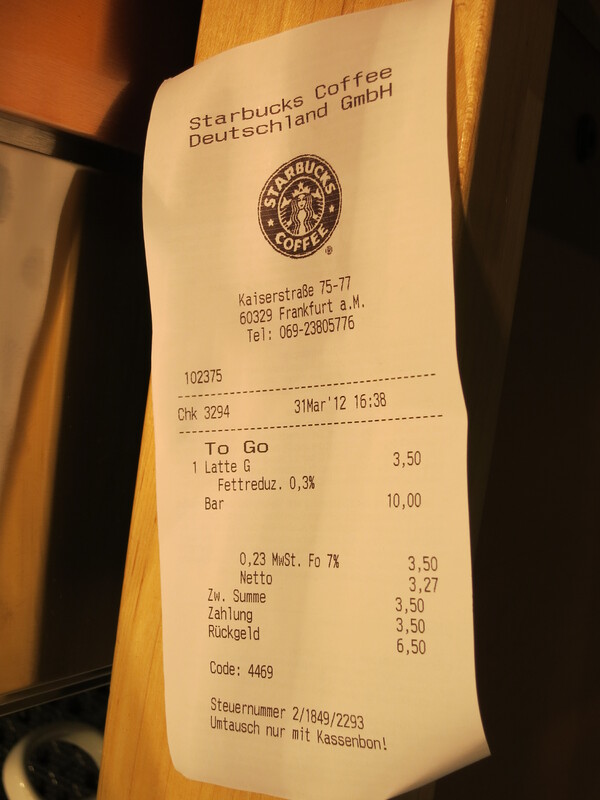 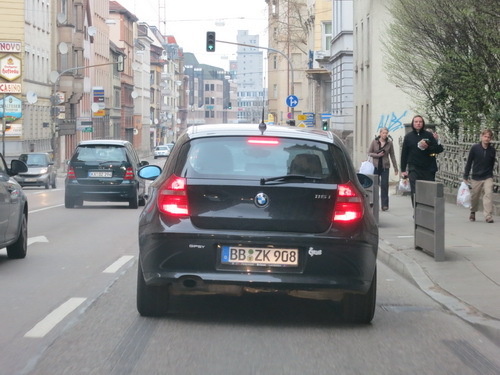 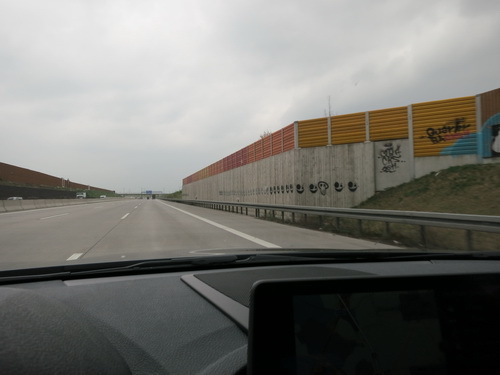 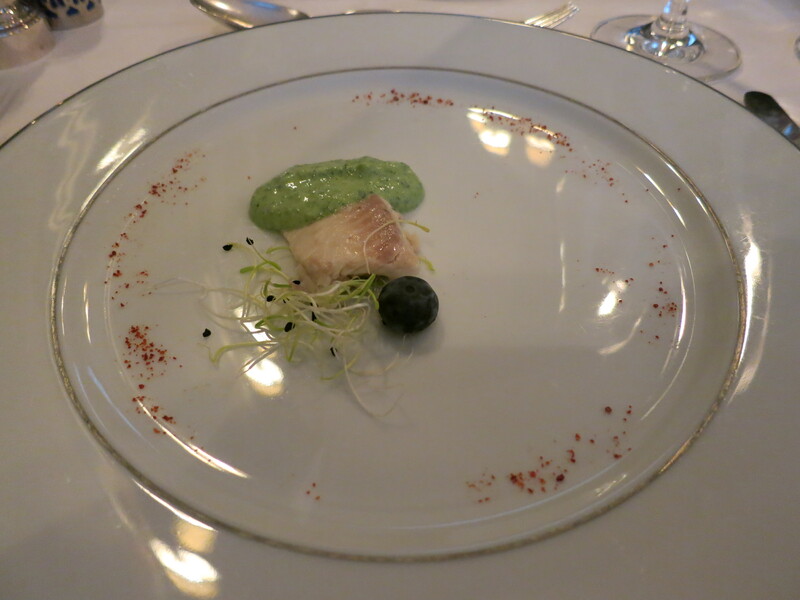 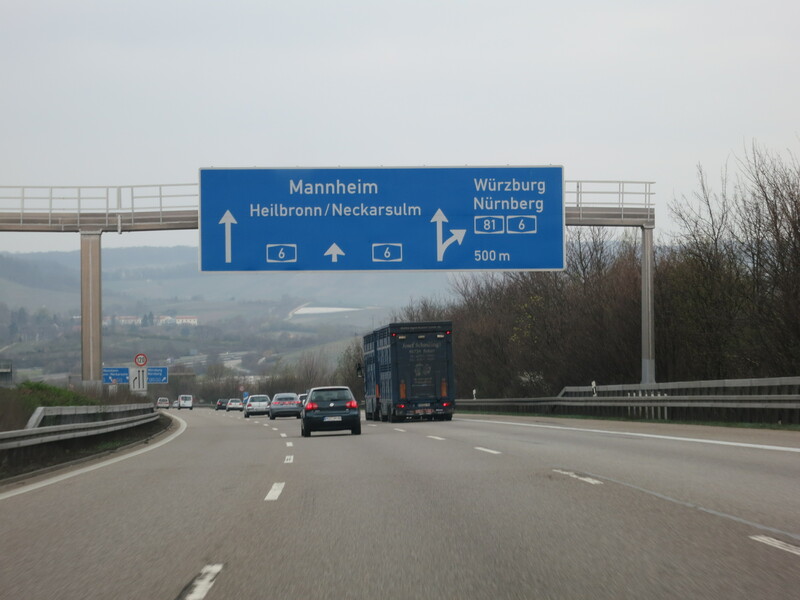 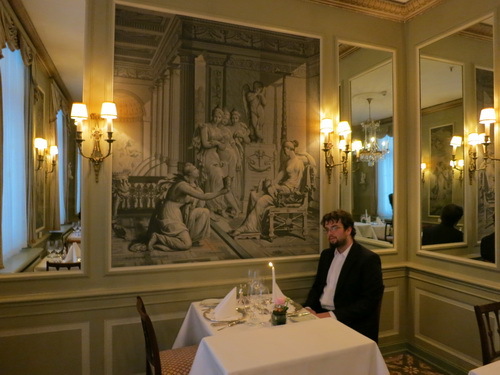 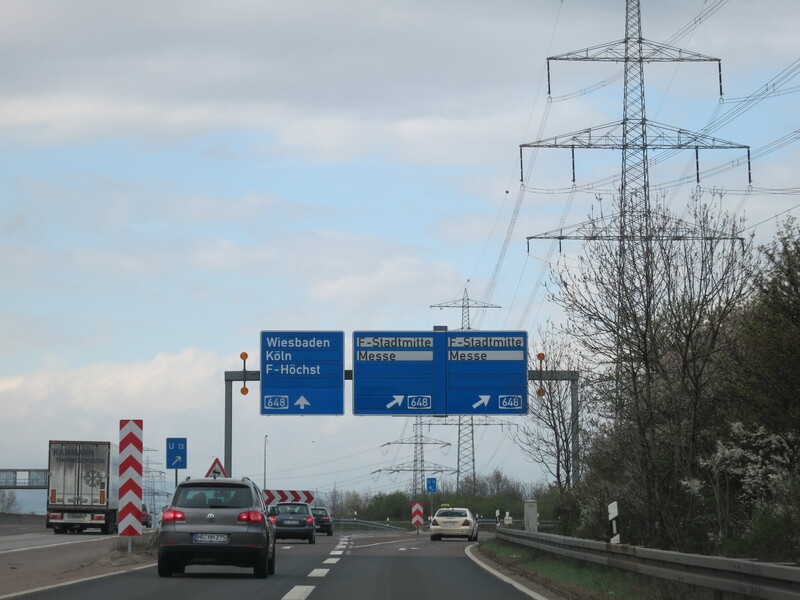 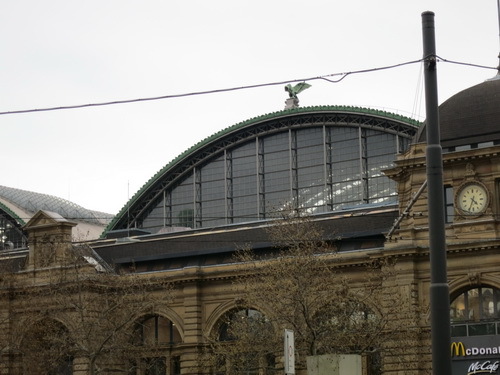 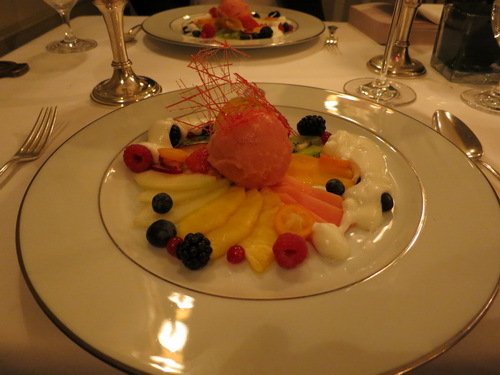 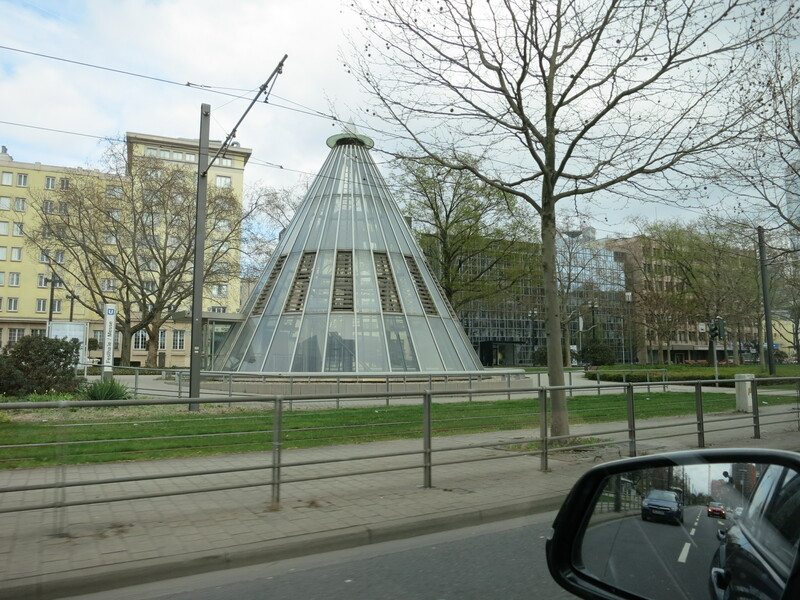 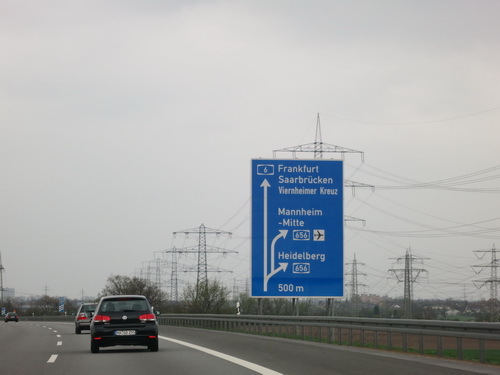 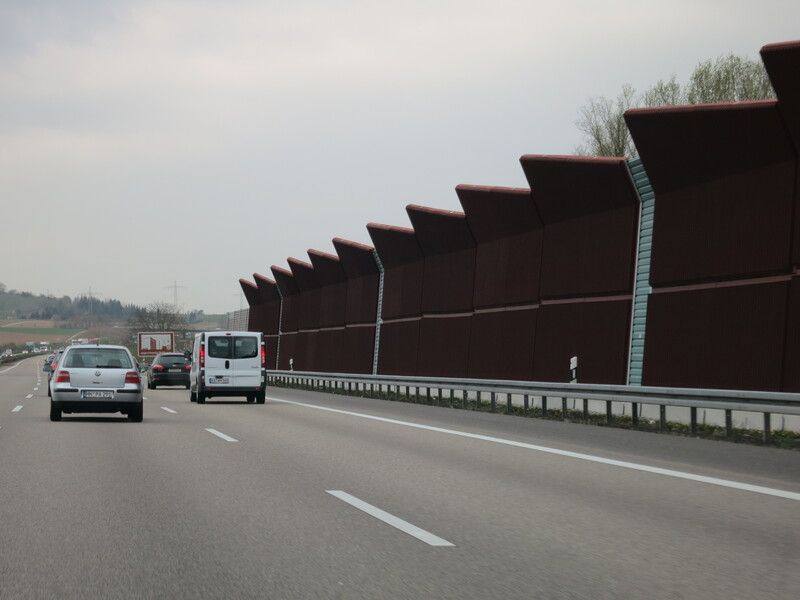 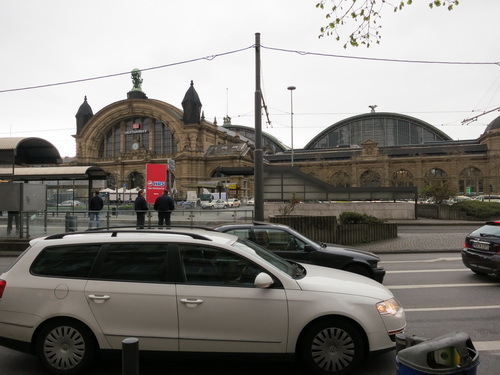 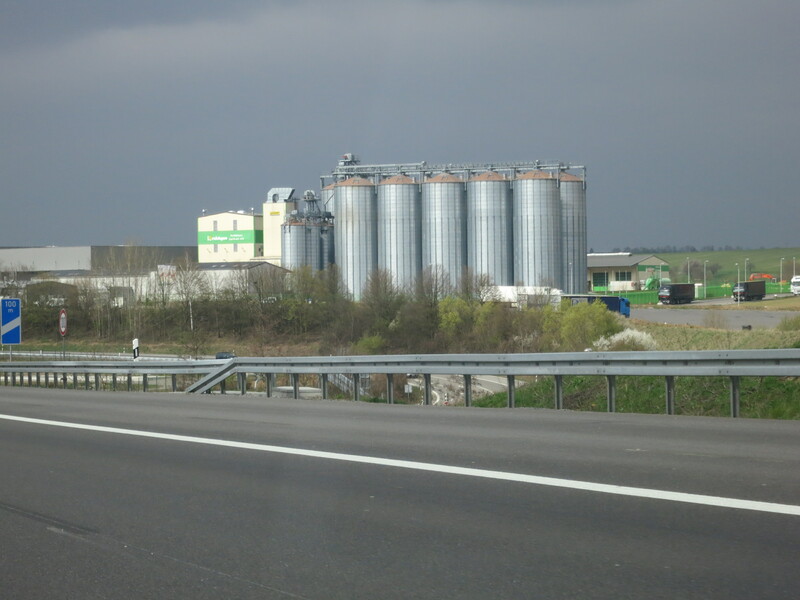 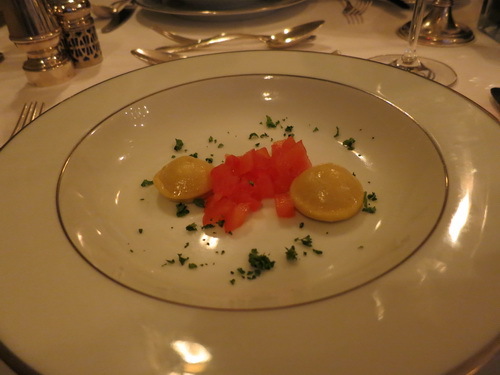 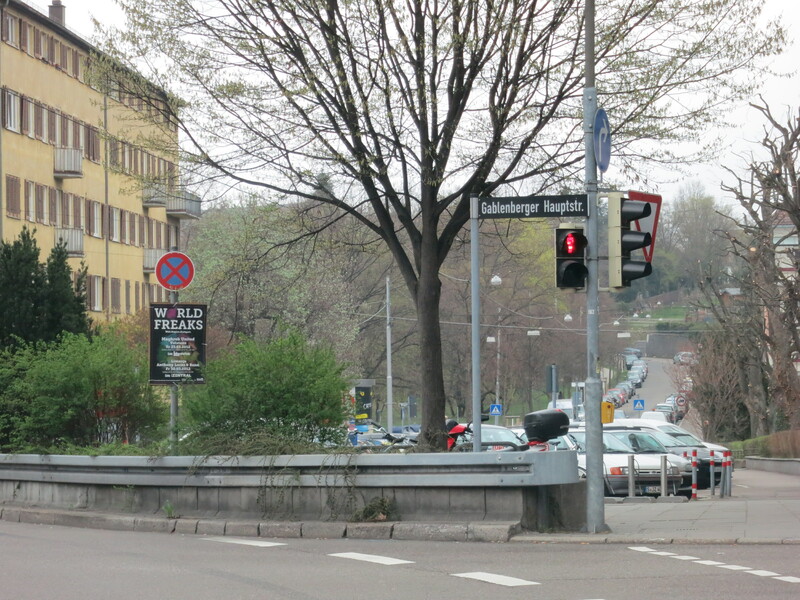 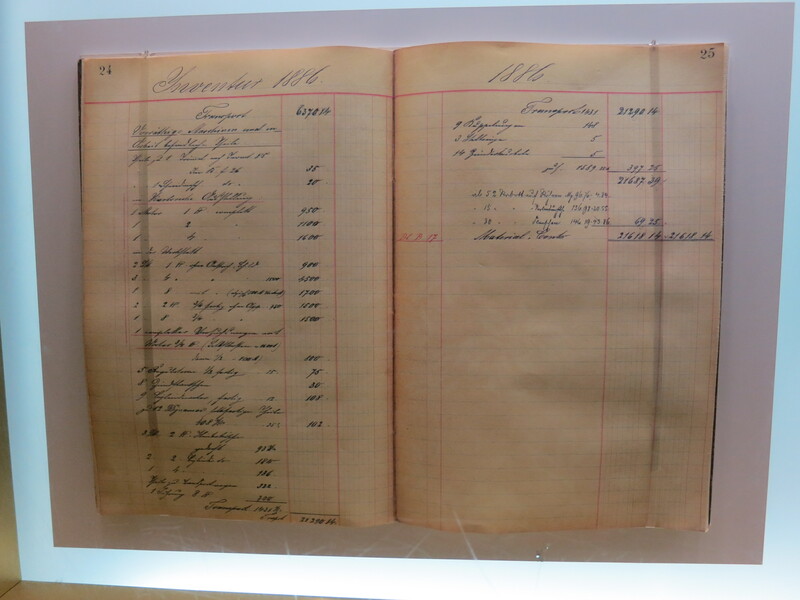 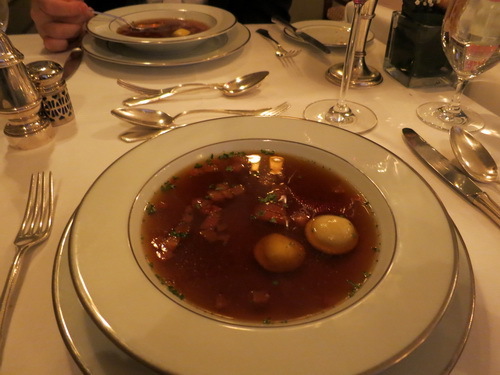 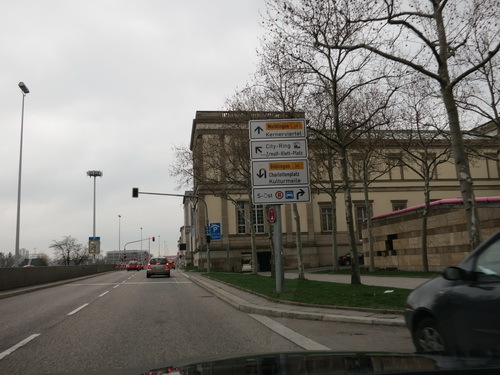 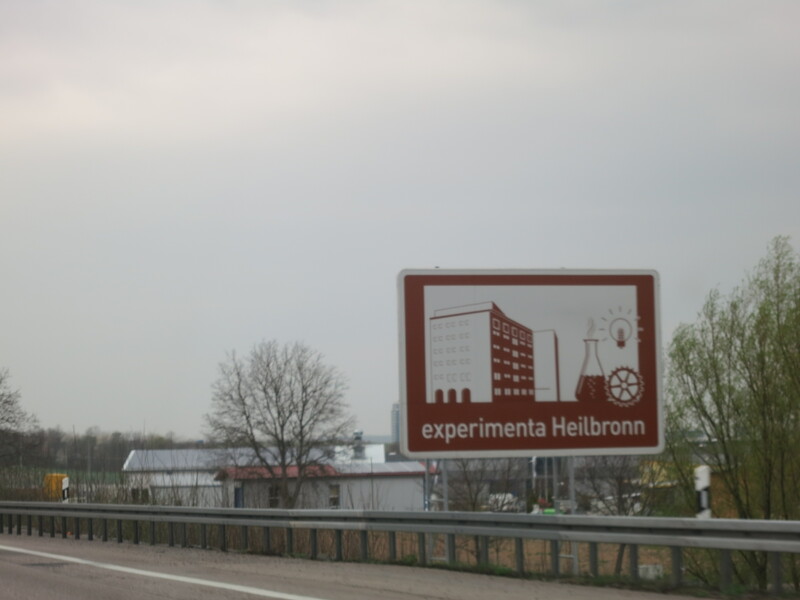 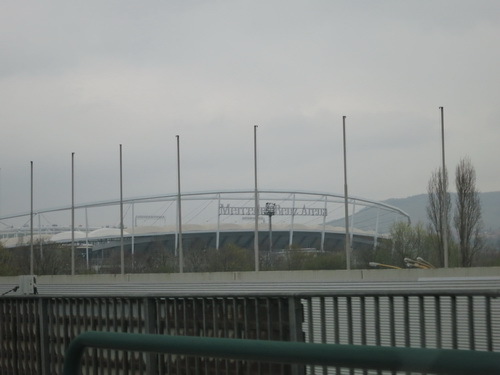 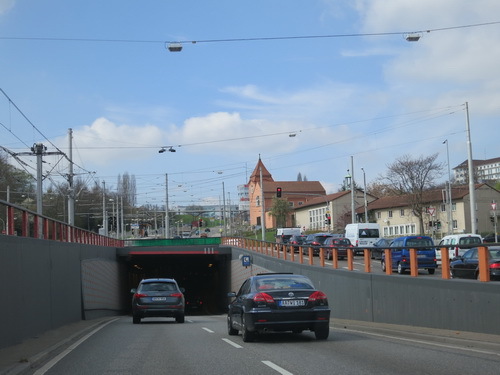 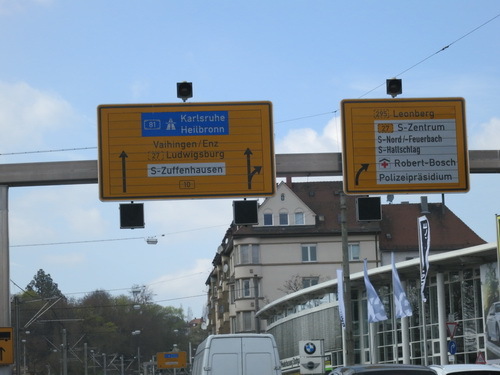 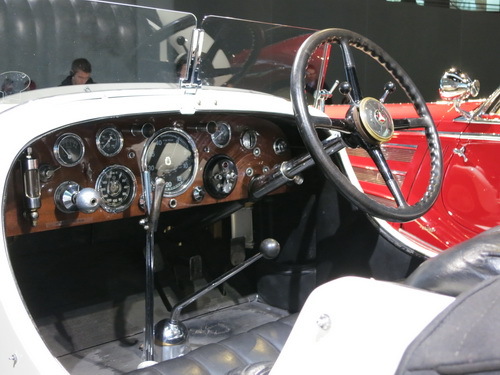 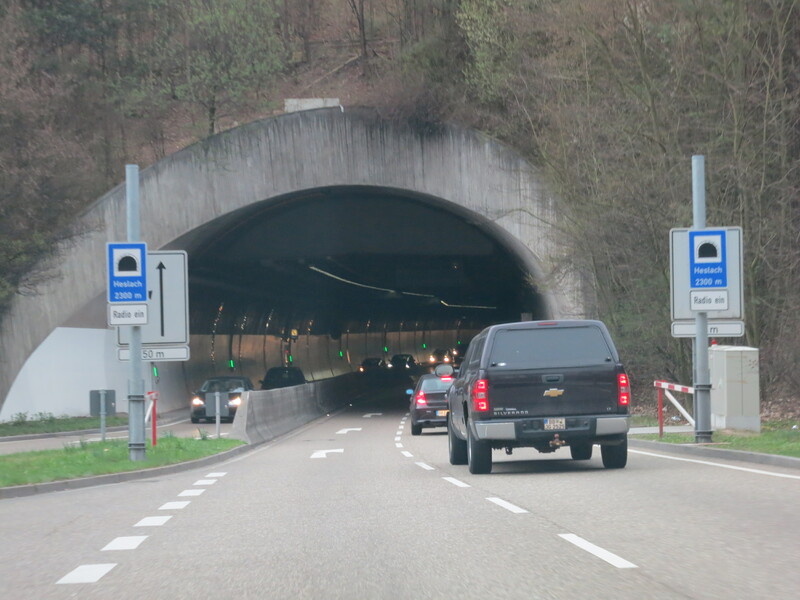 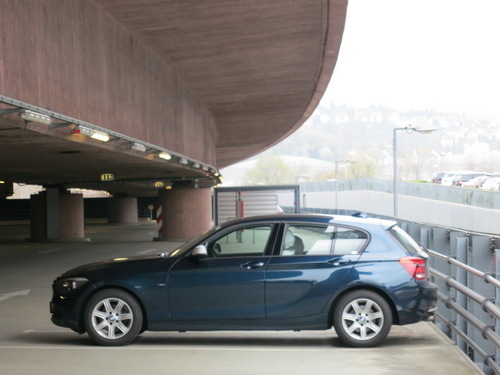 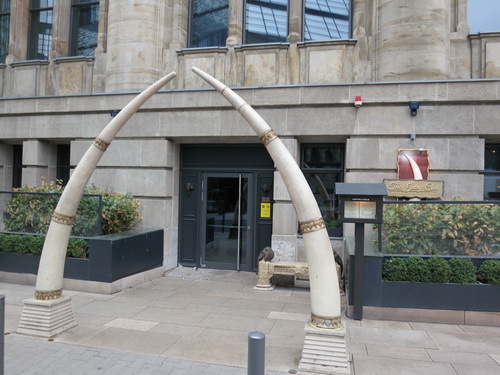 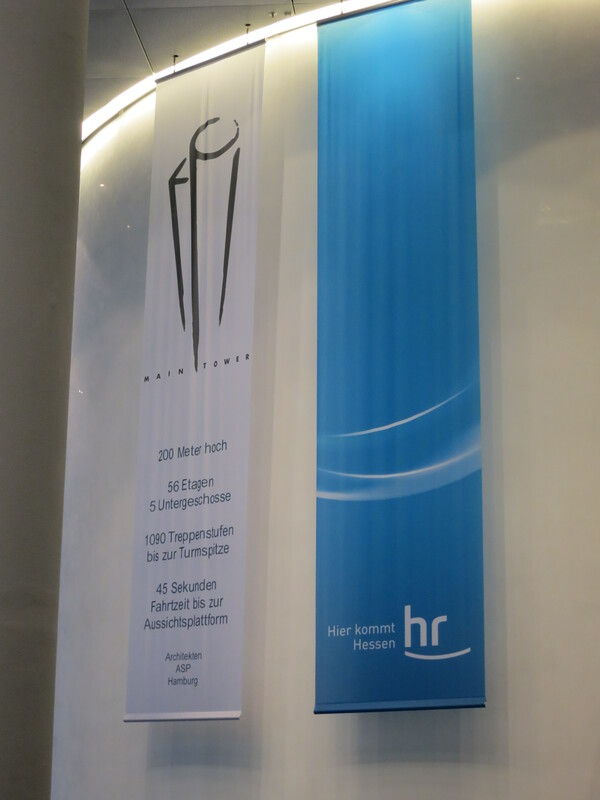 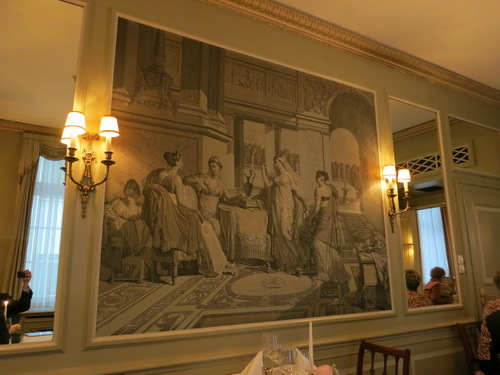 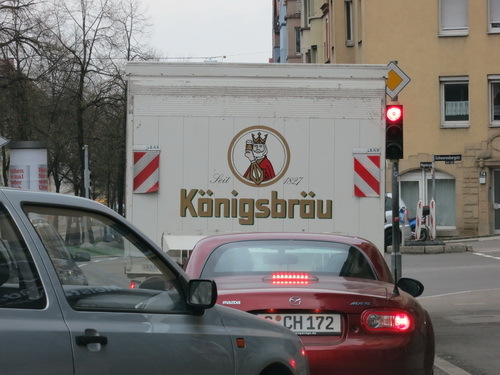 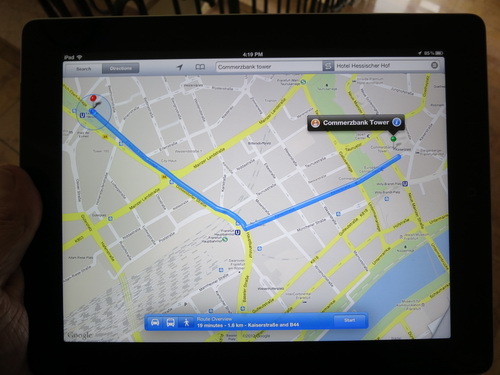 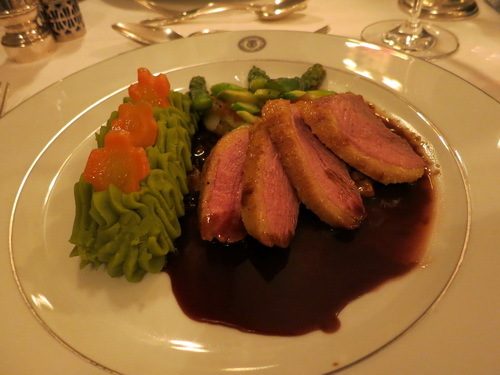 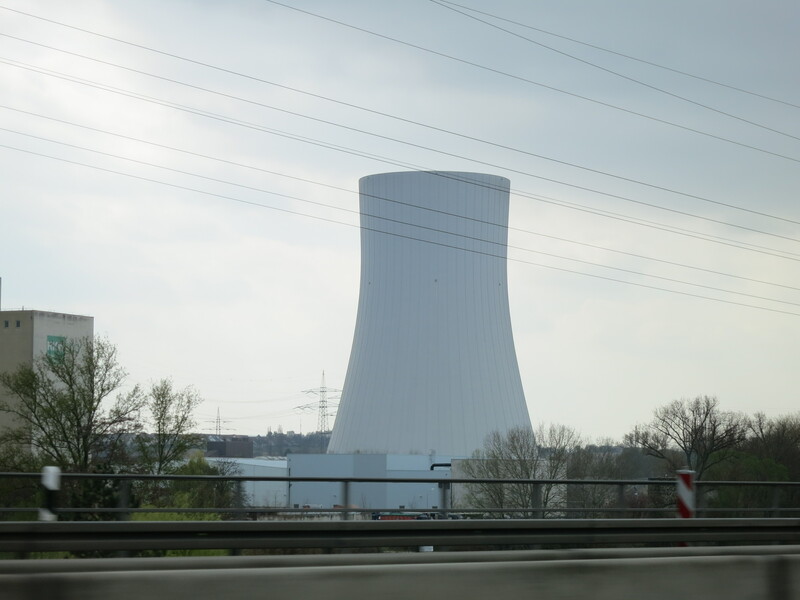 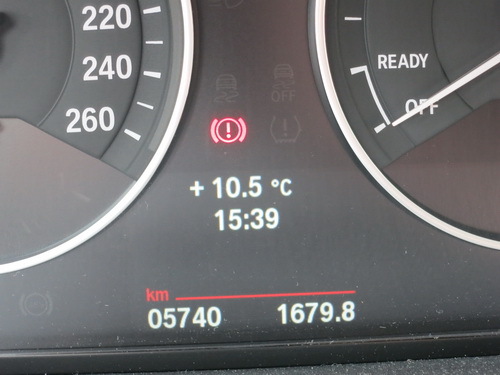 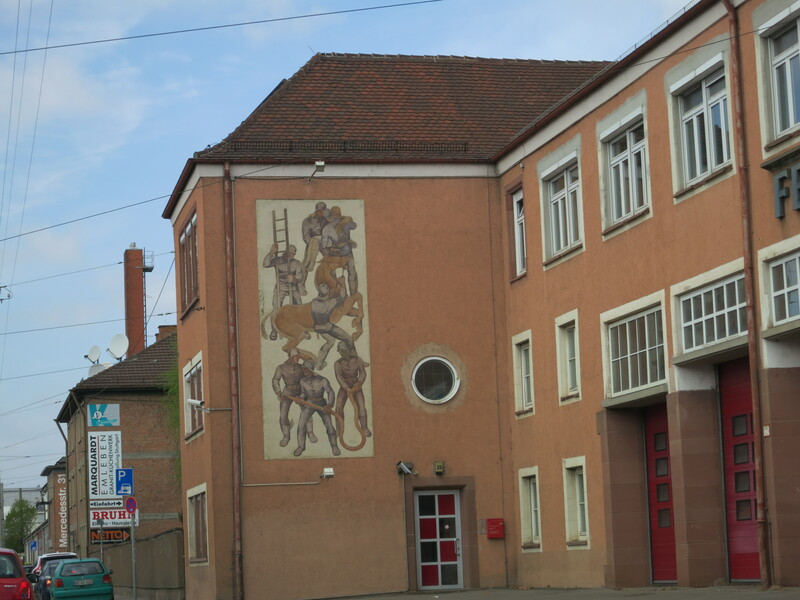 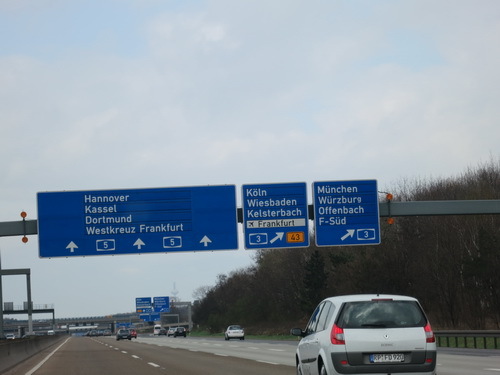 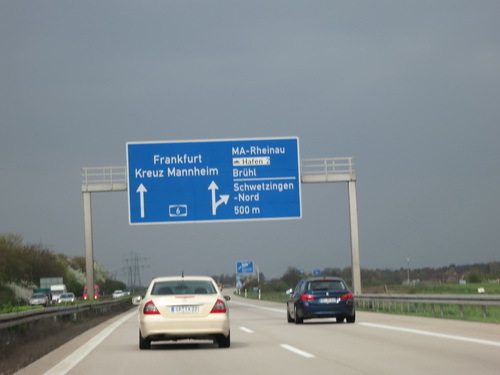 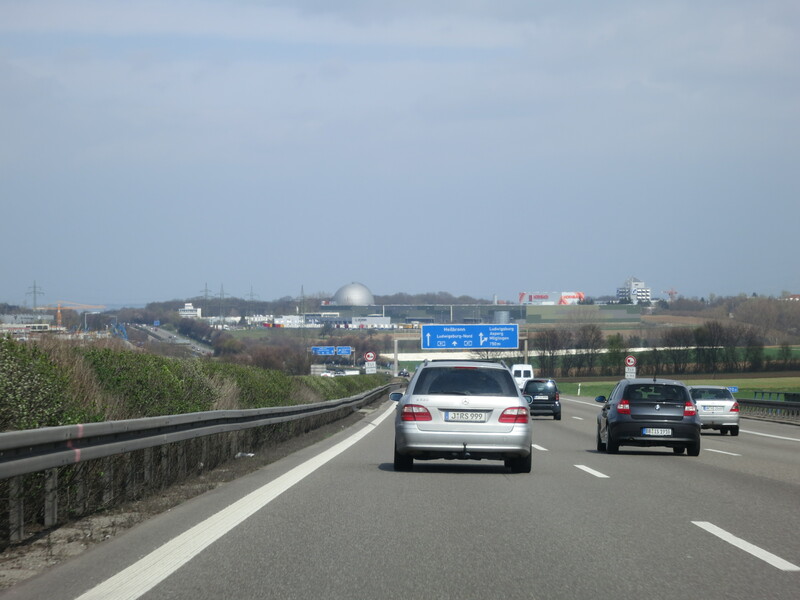 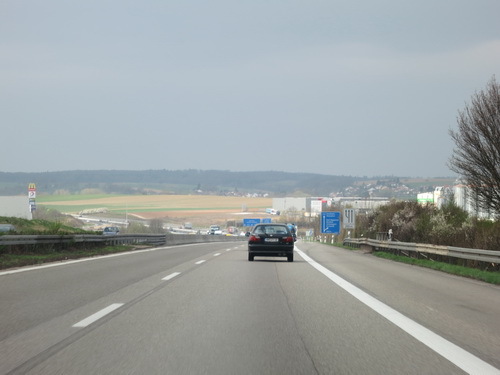 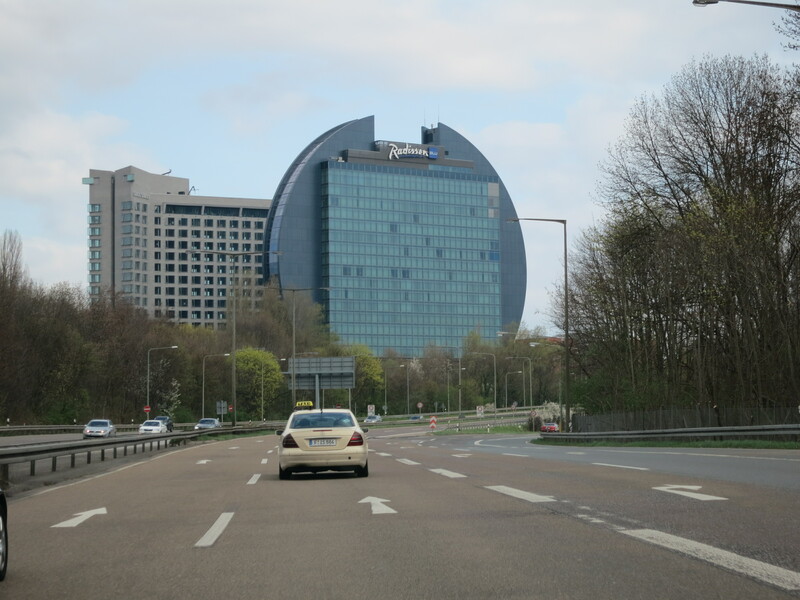 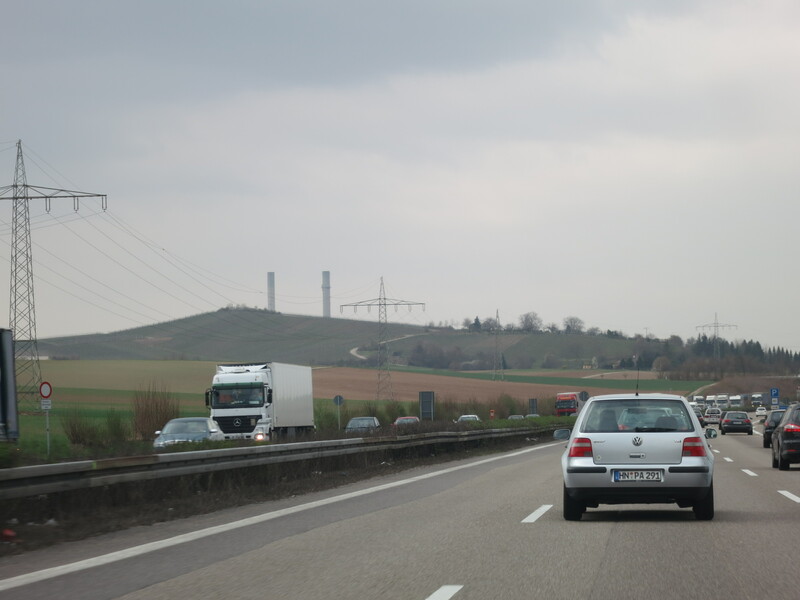 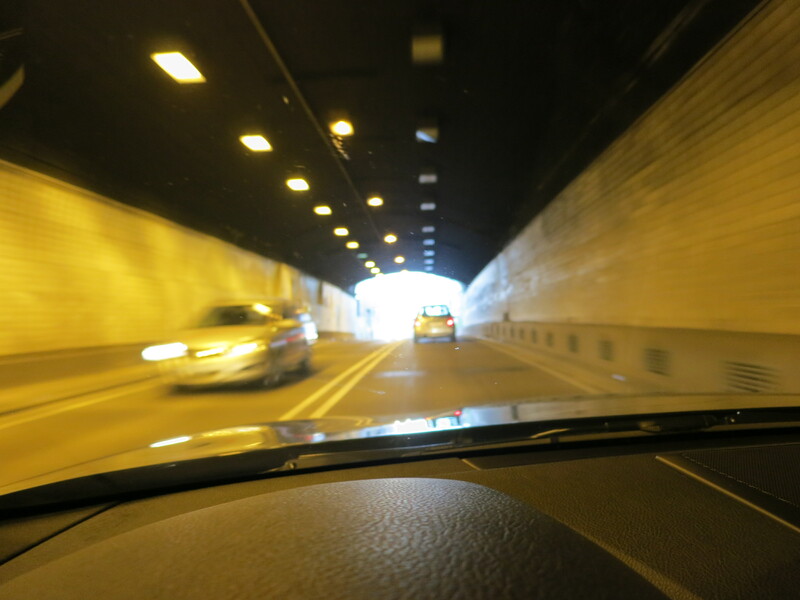 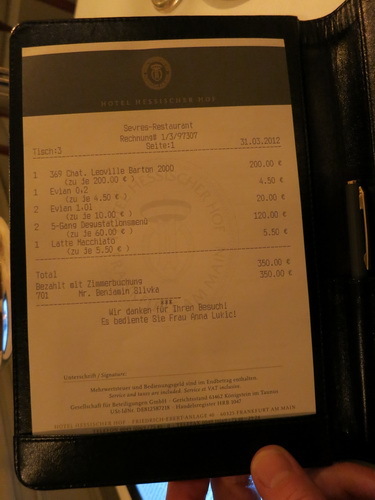 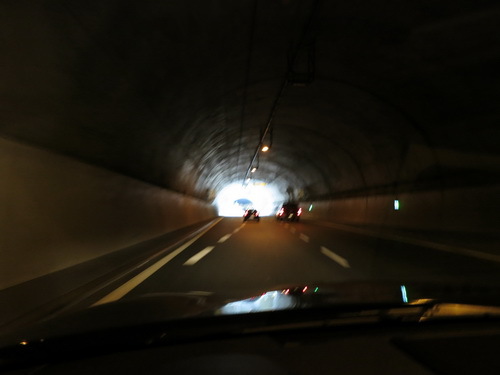 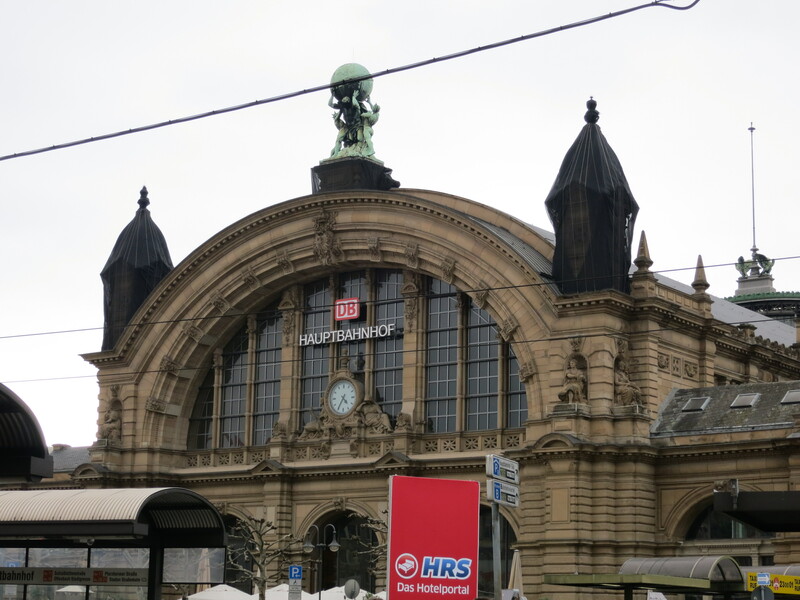 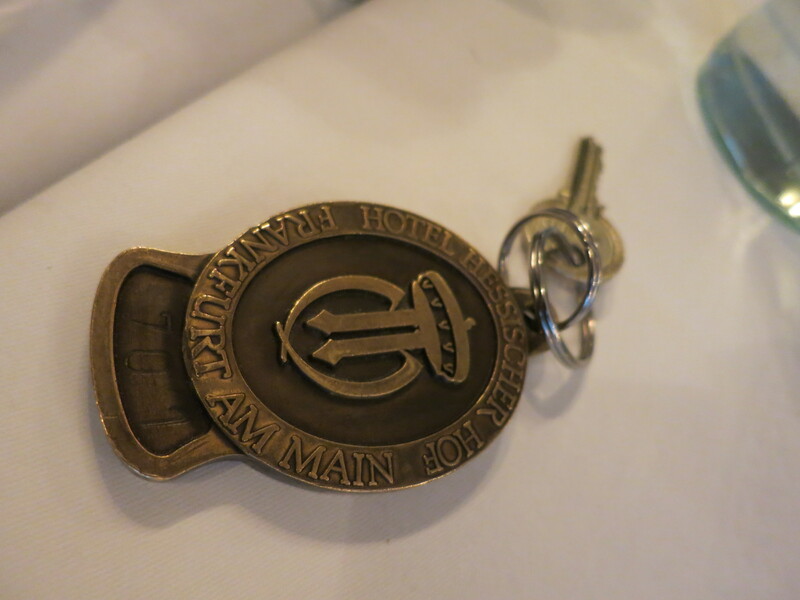 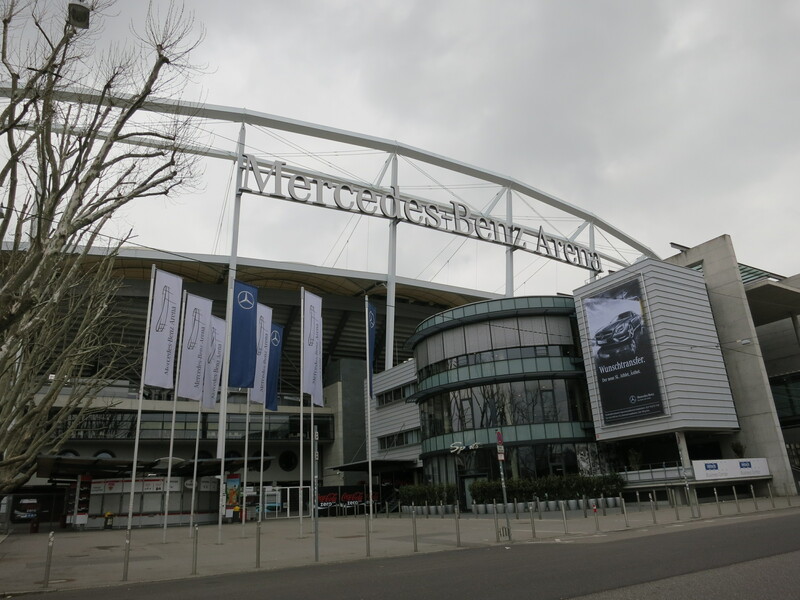 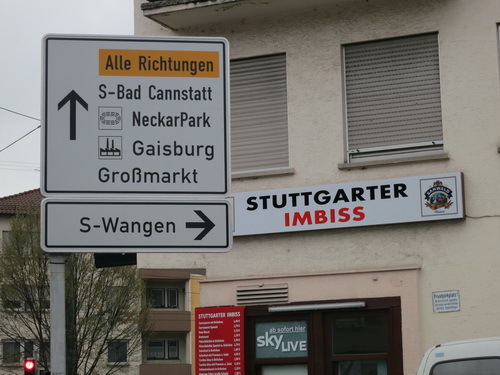 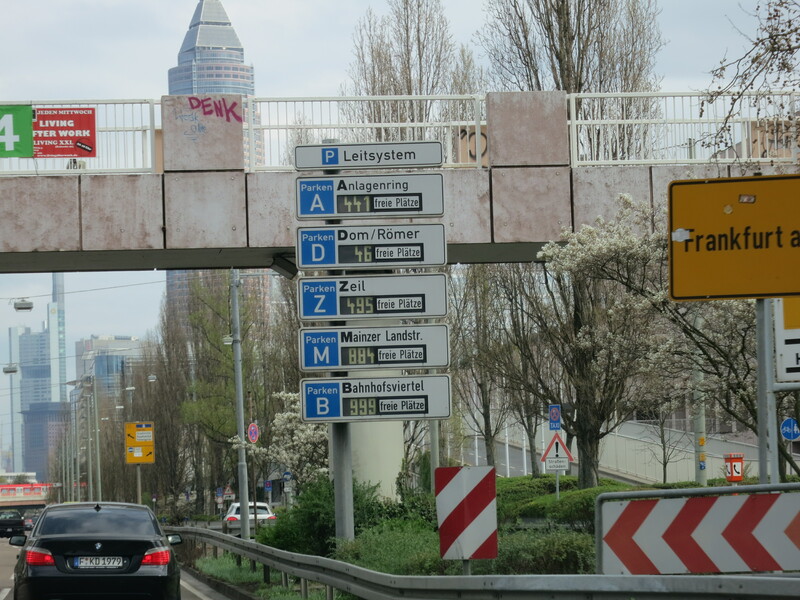 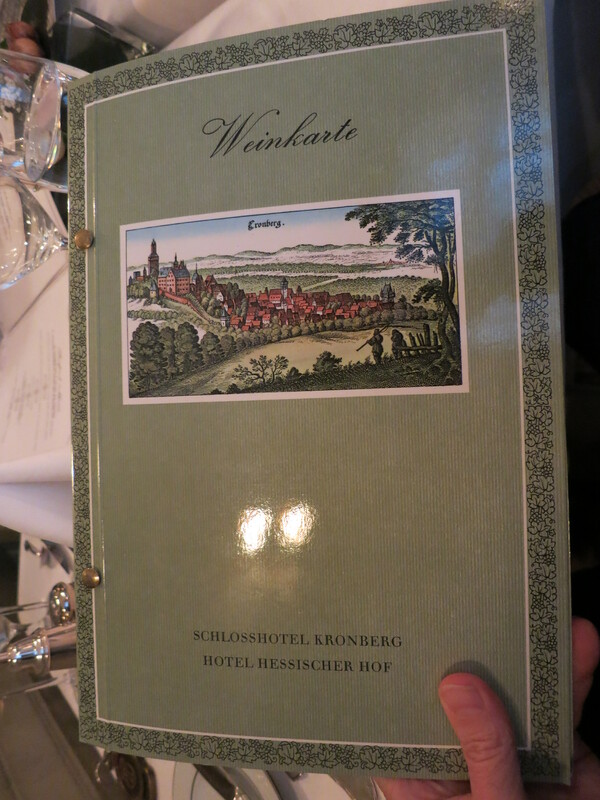 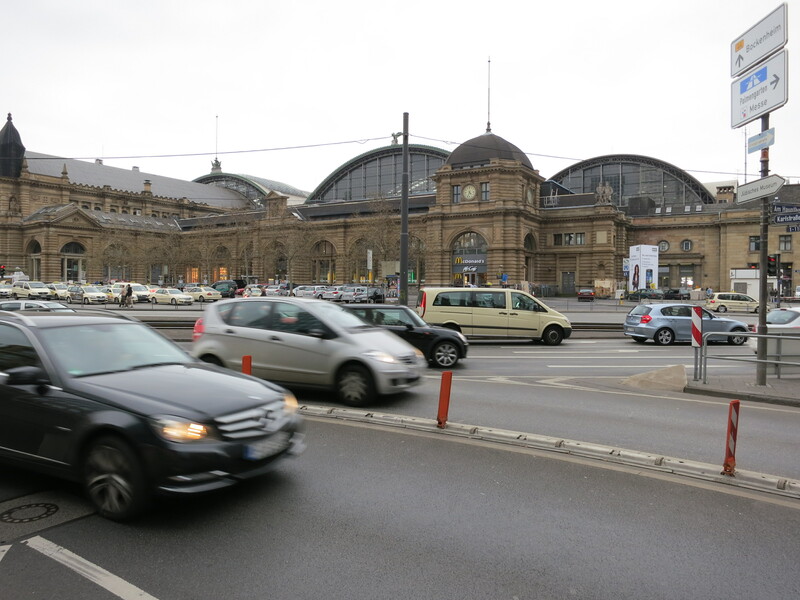 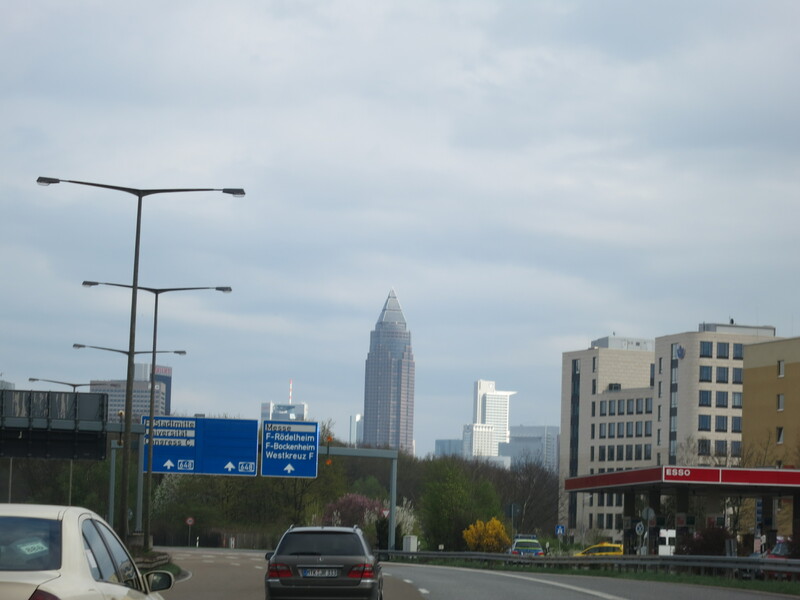 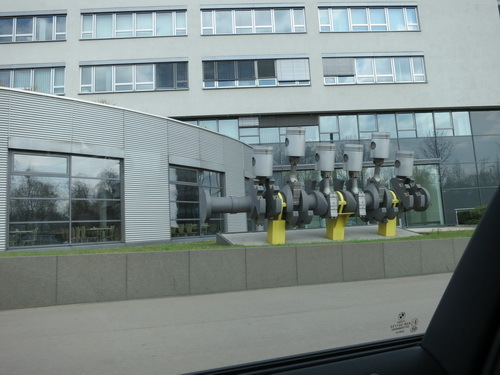 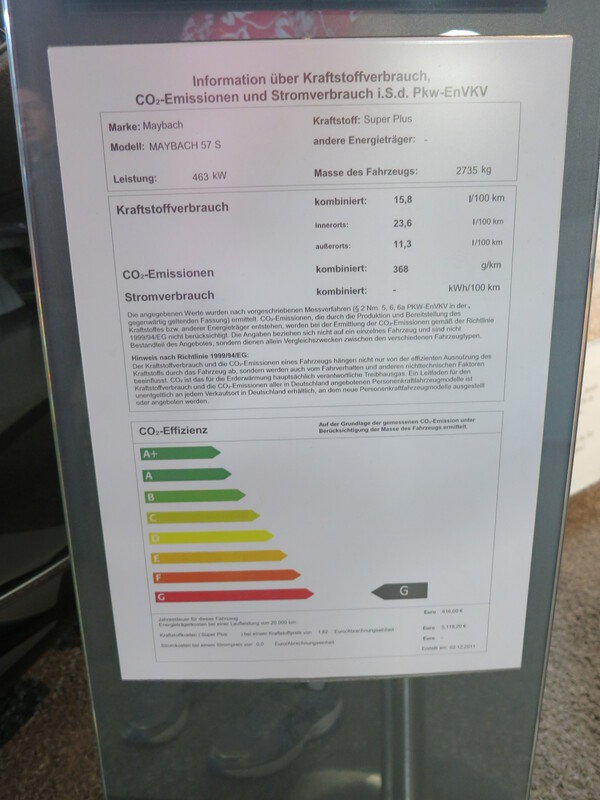 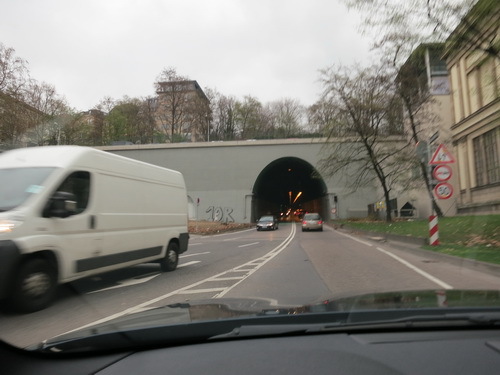 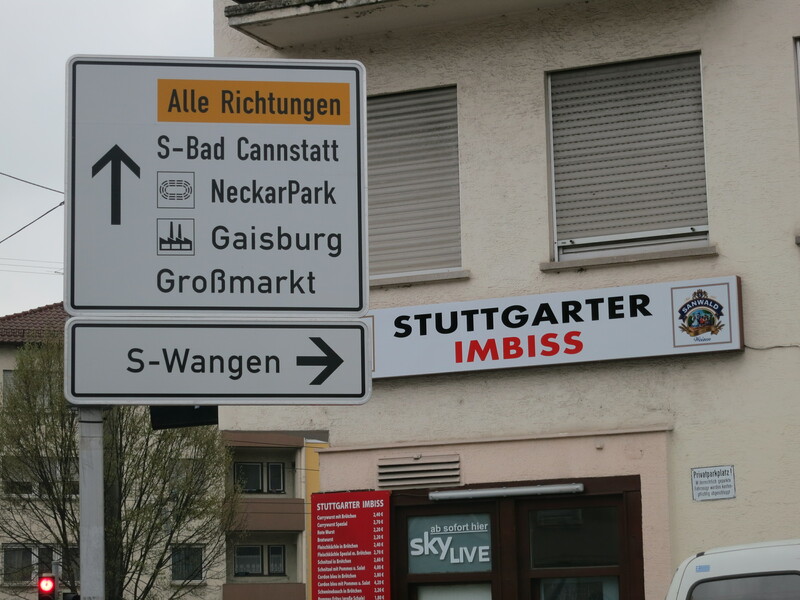 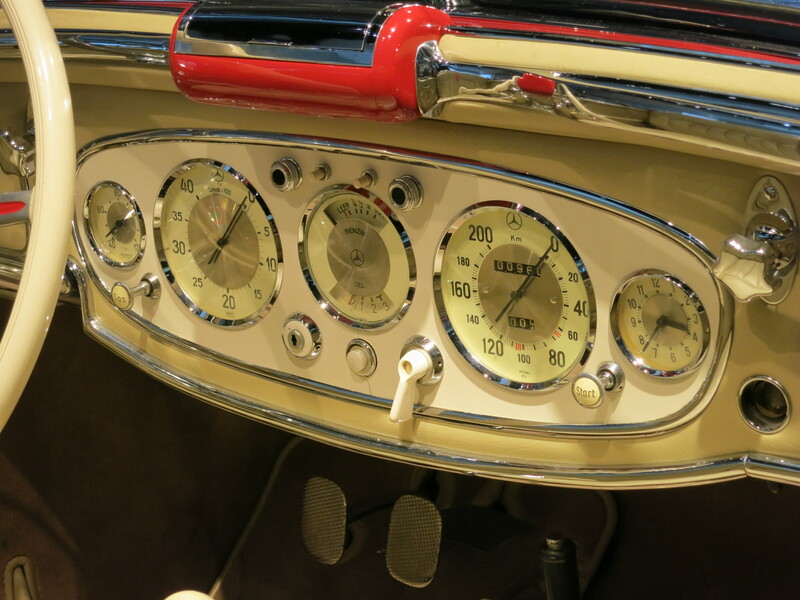 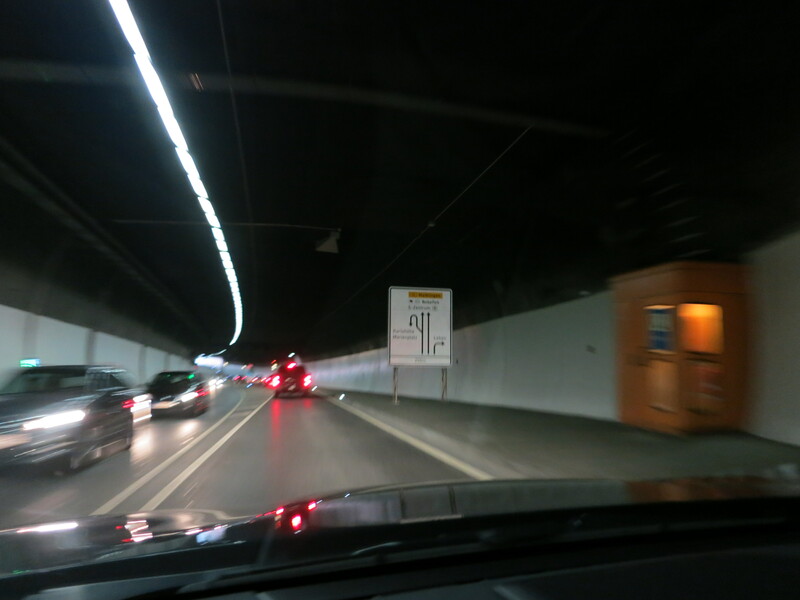 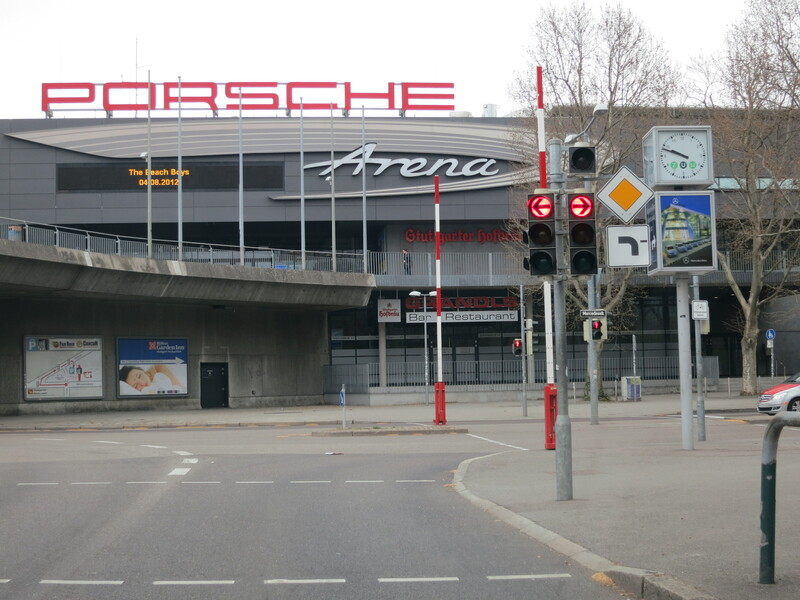 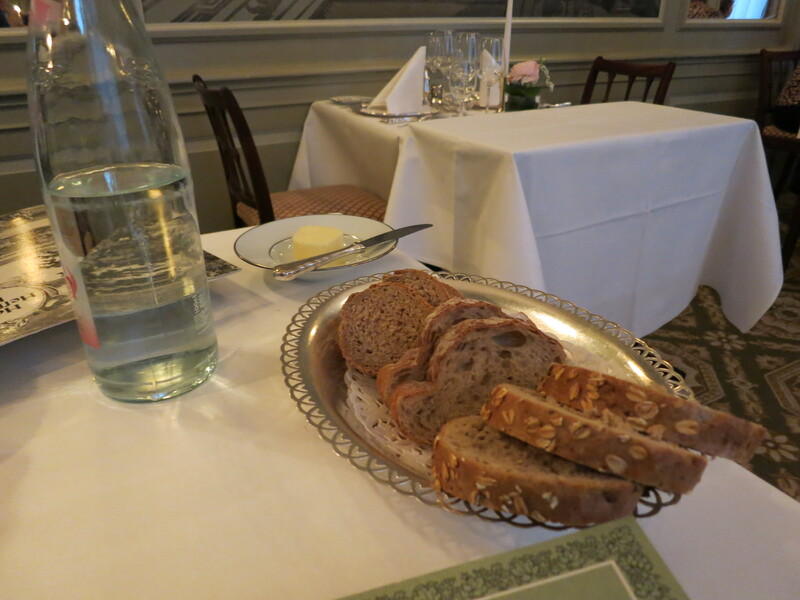 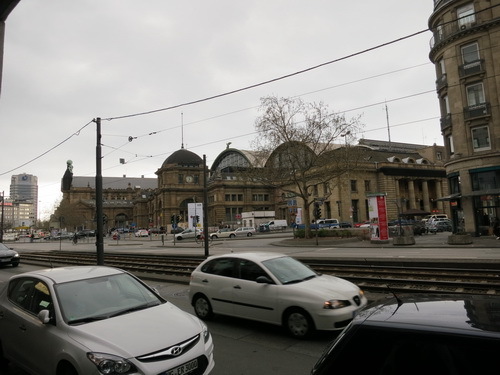 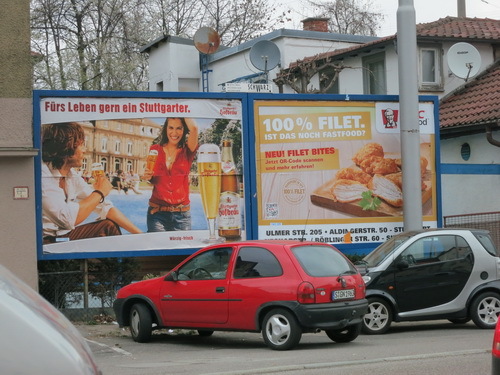 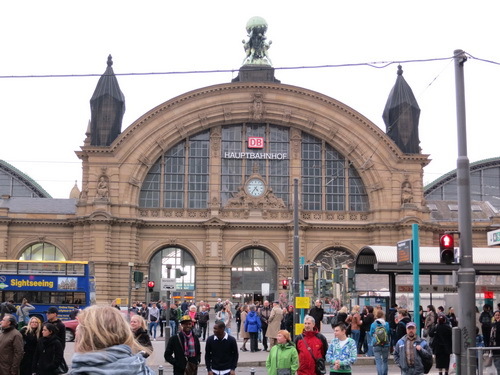 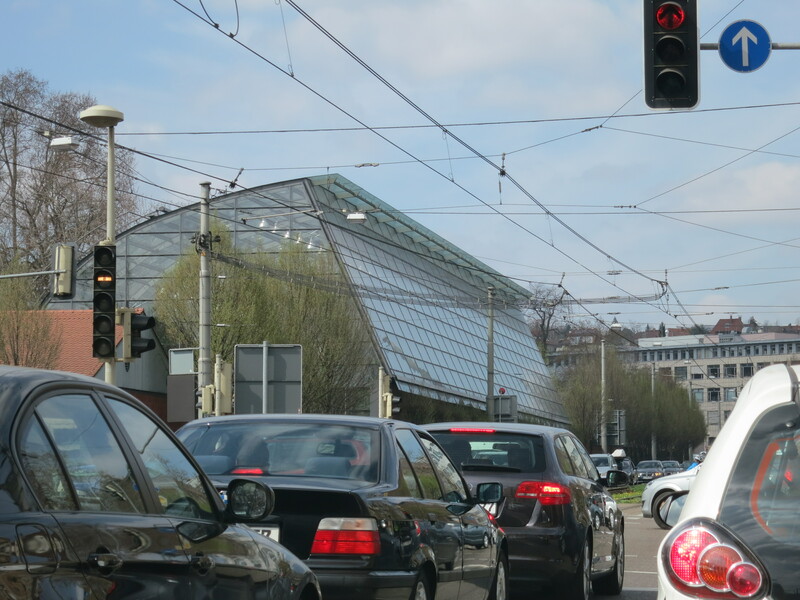 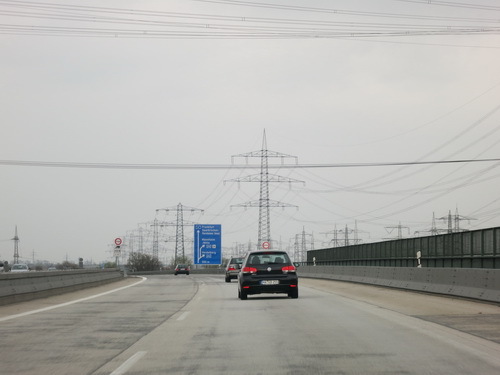 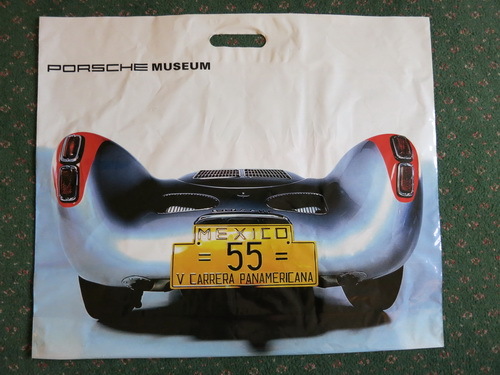 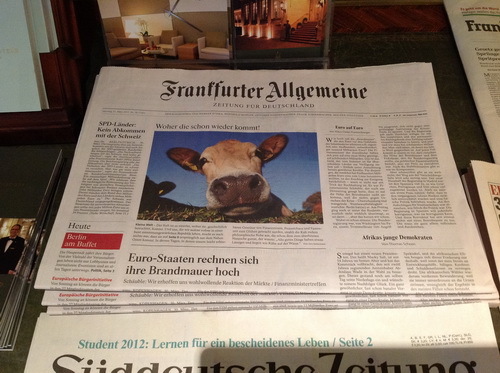 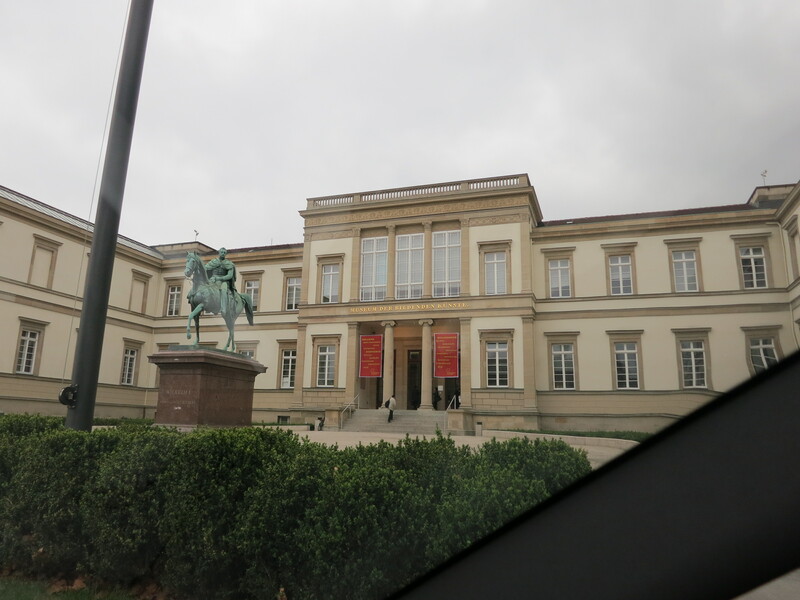 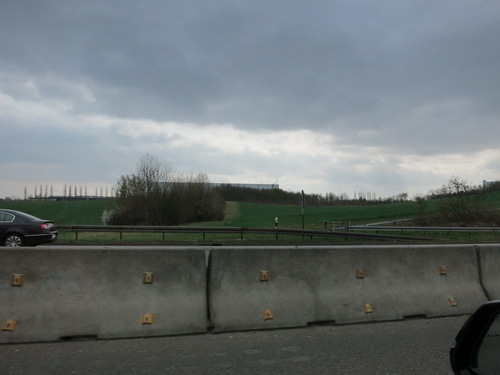 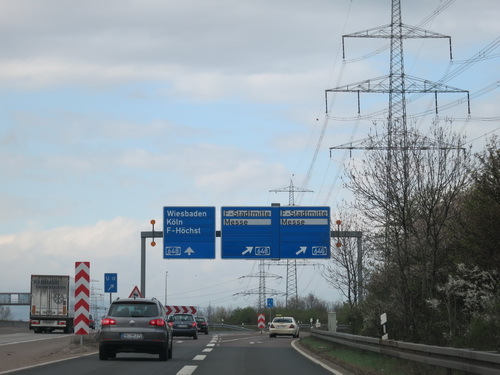 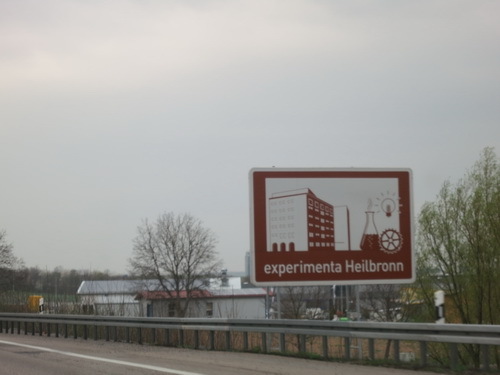 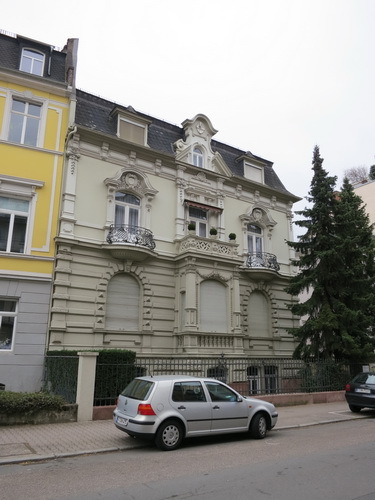 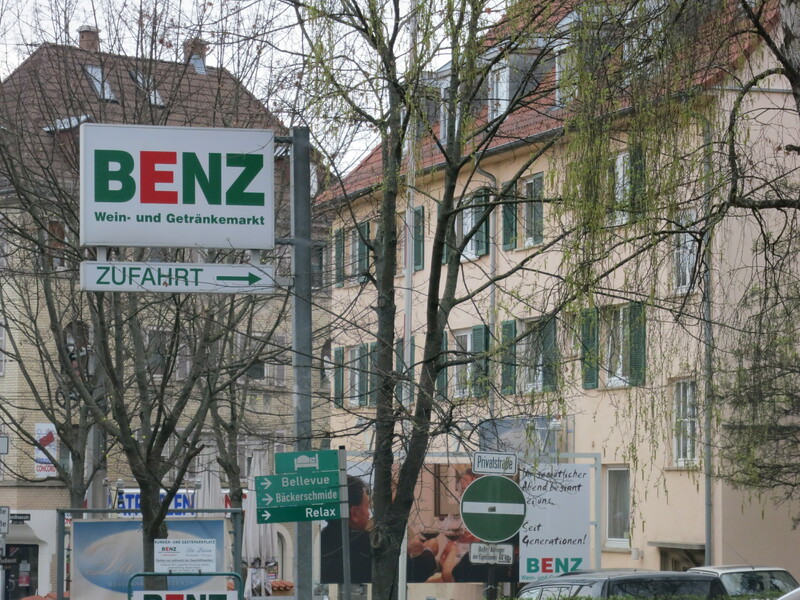 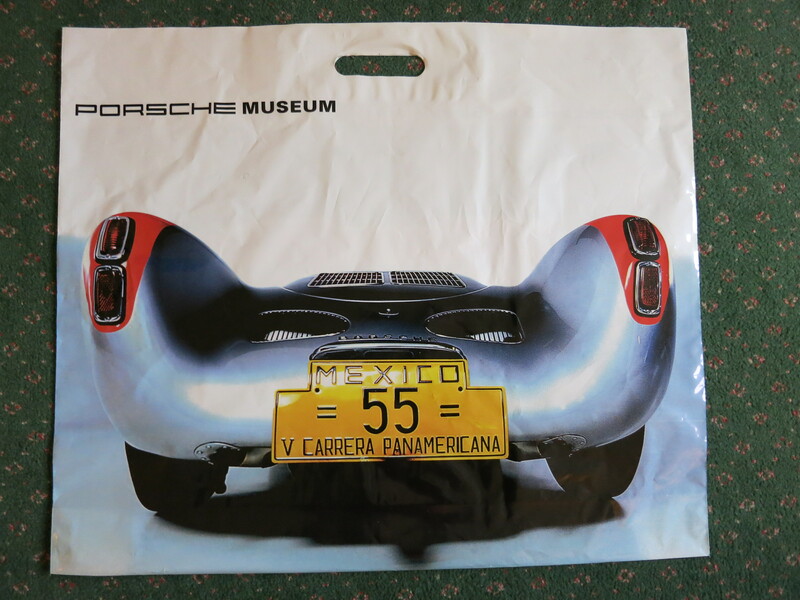 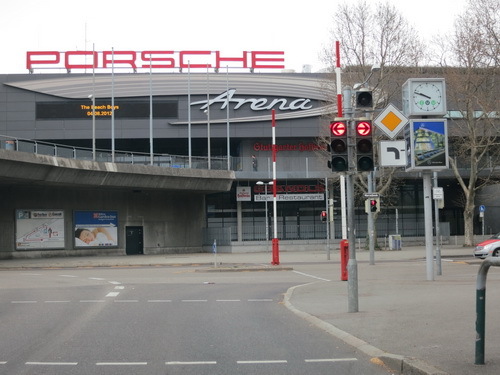 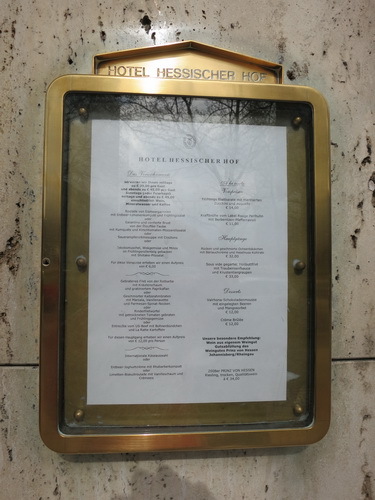 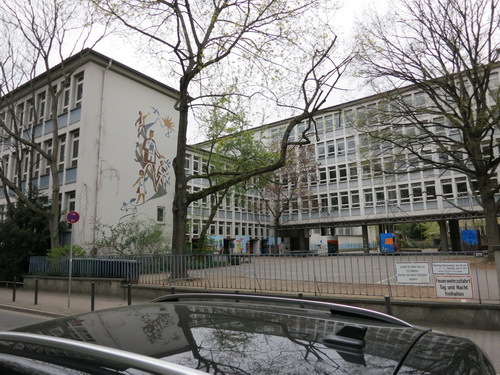 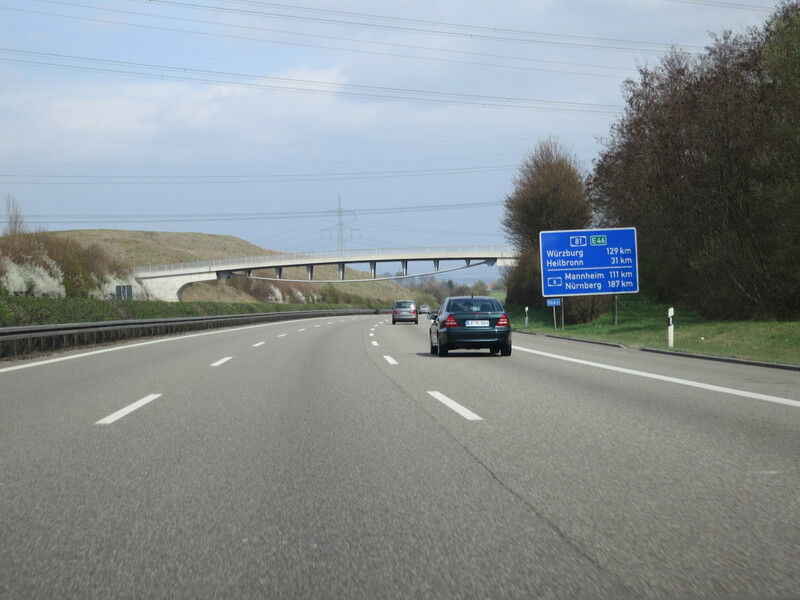 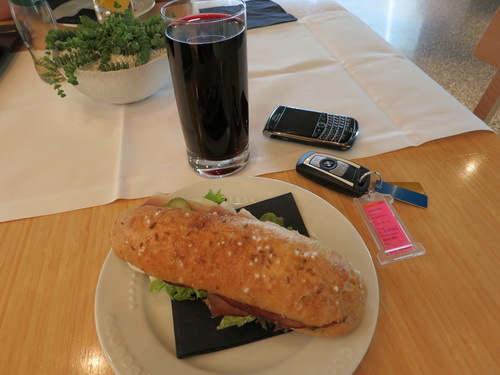 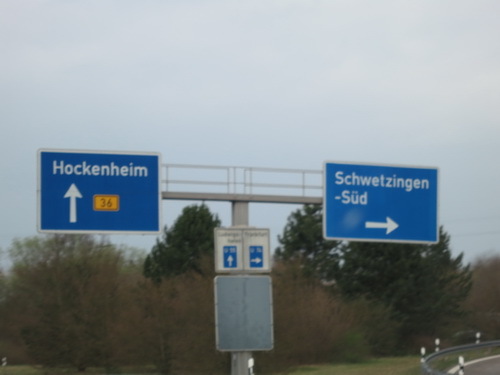 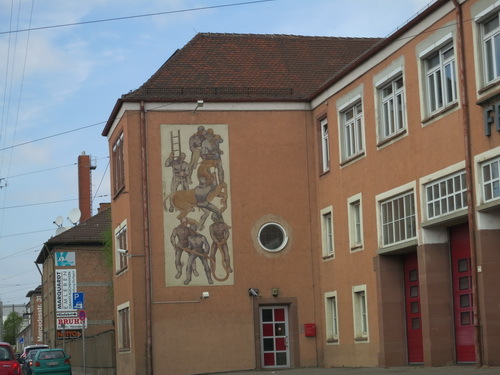 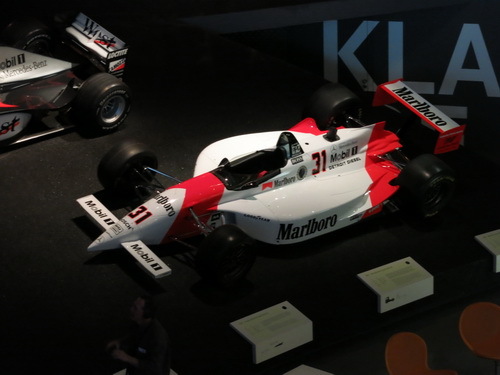 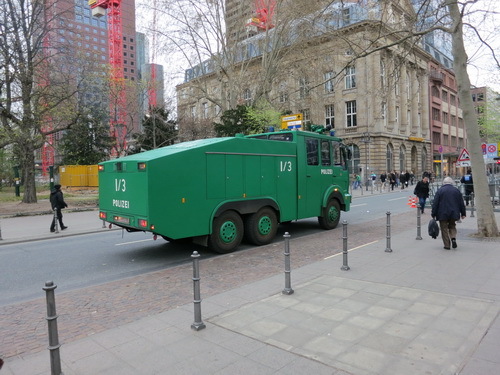 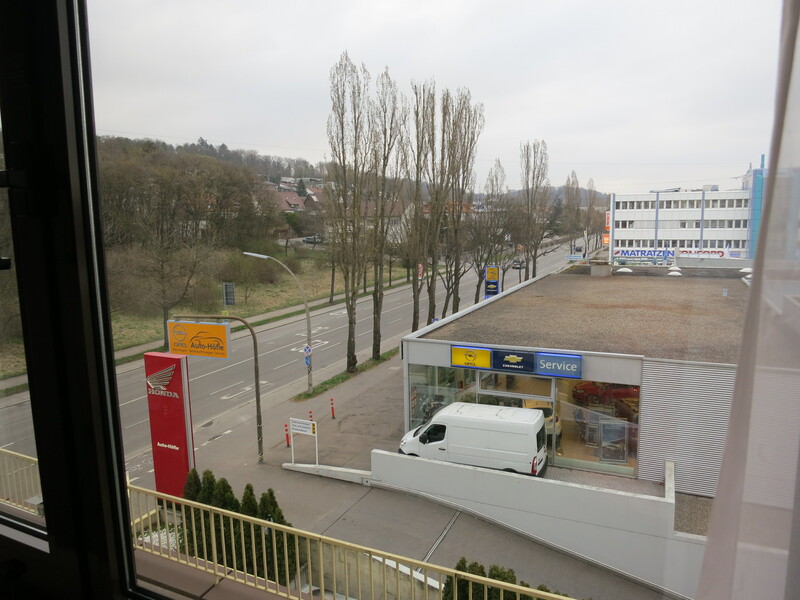 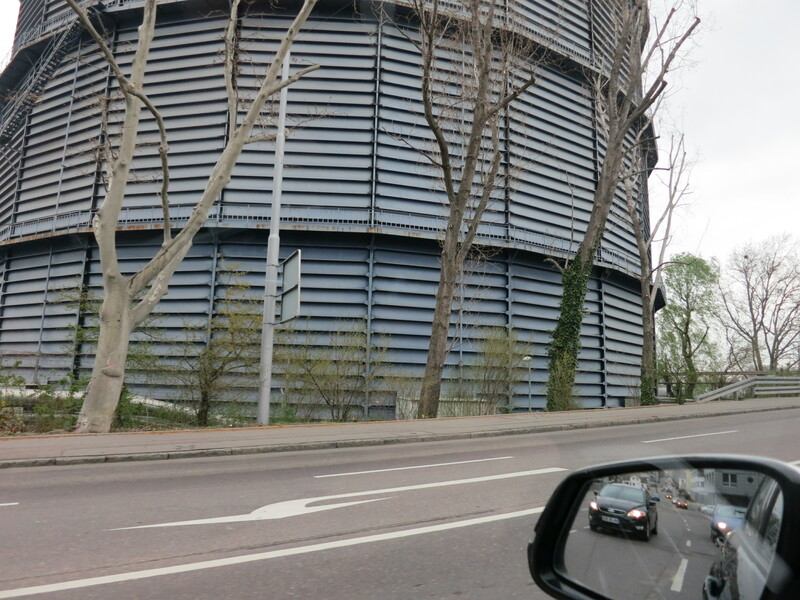 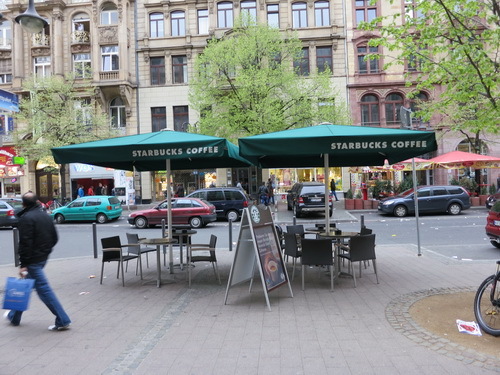 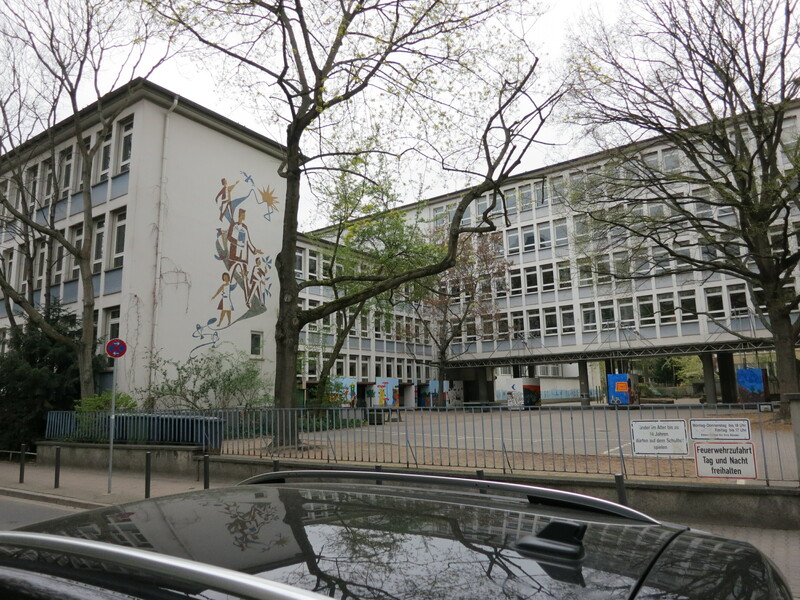 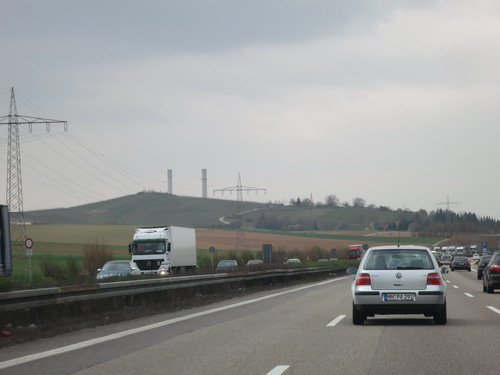 After a simple lunch at the M-B museum restaurant, we got in the car at 1:35 p.m. for the 2 hour drive to Frankfurt. 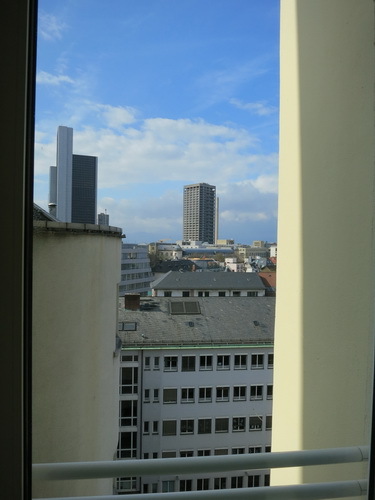 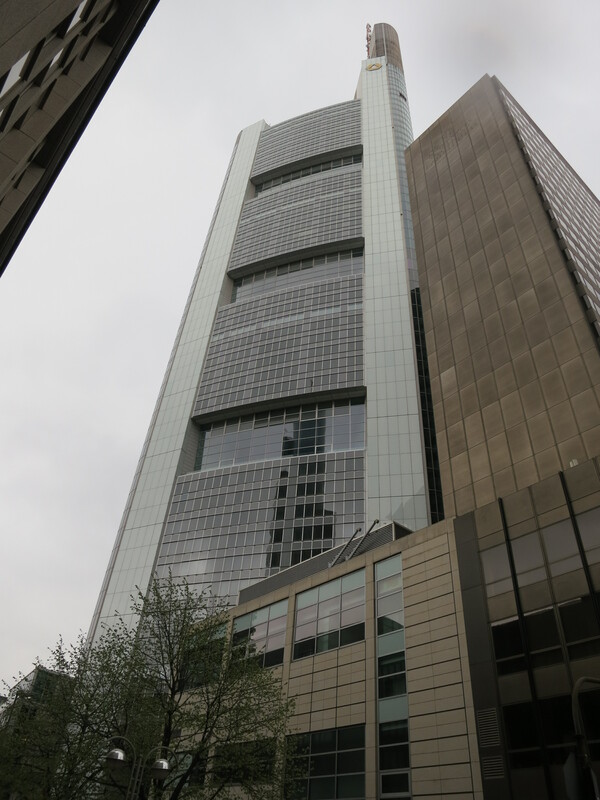 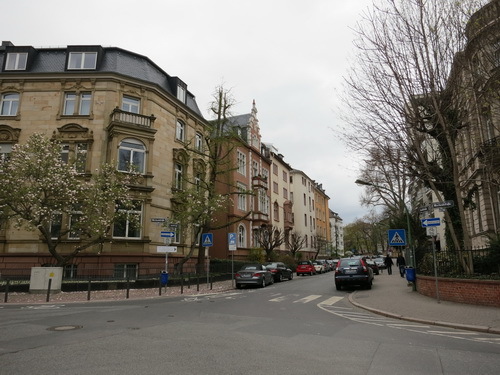 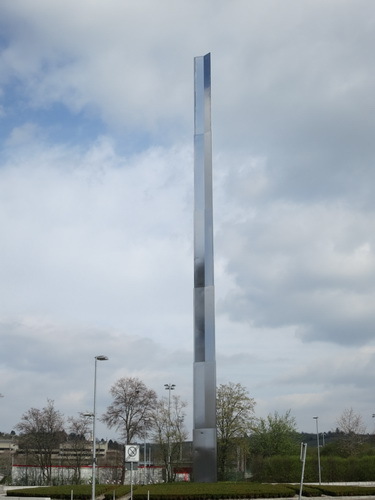 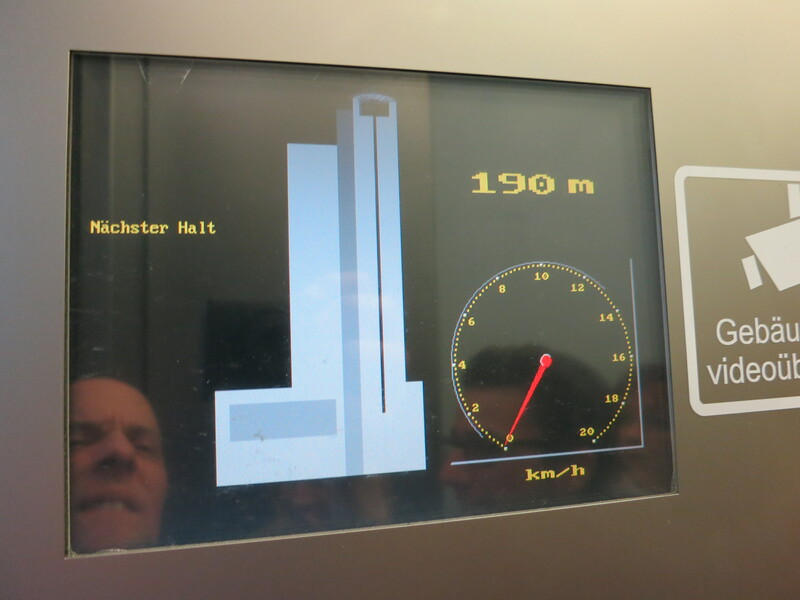 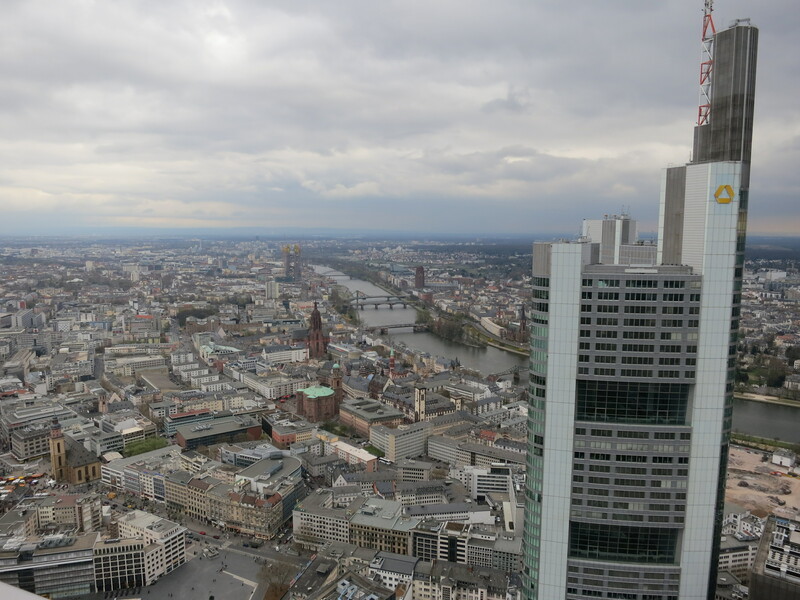 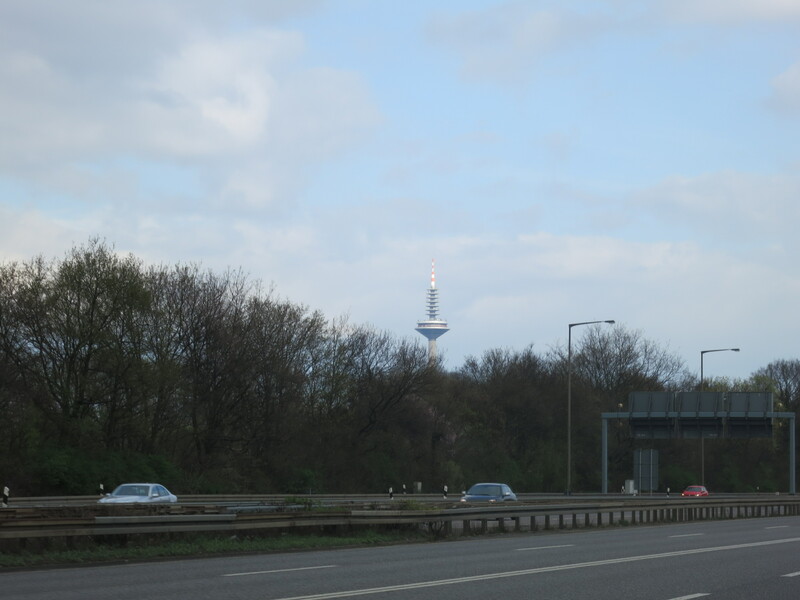 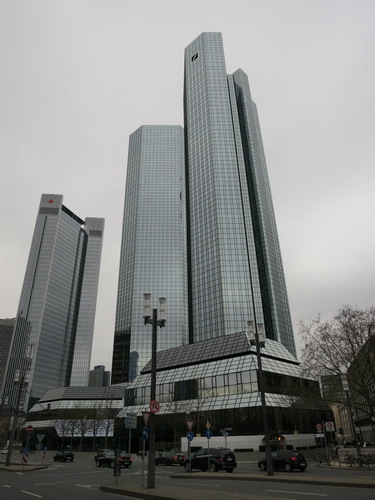 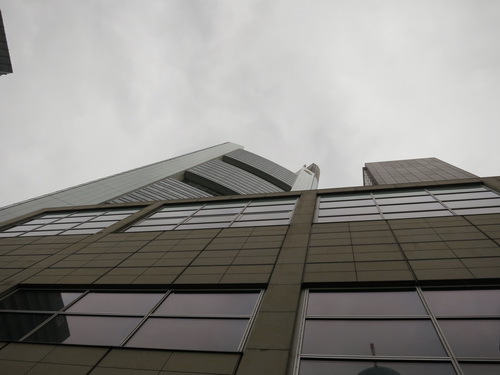 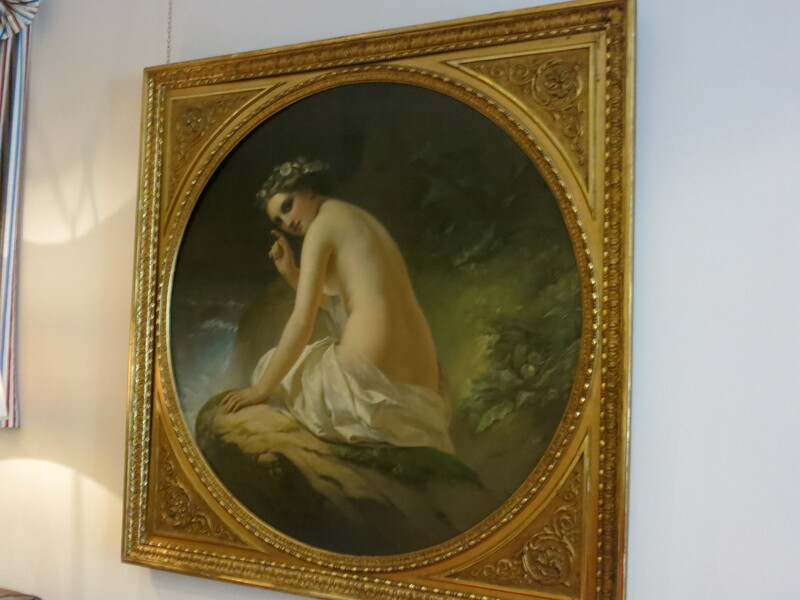 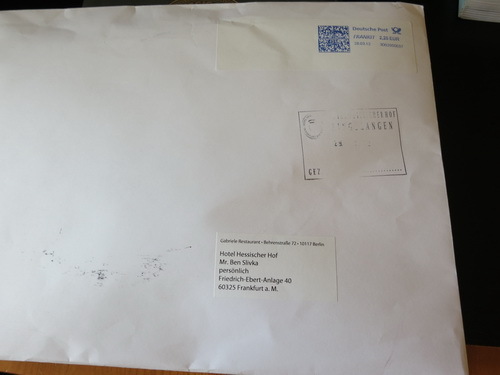 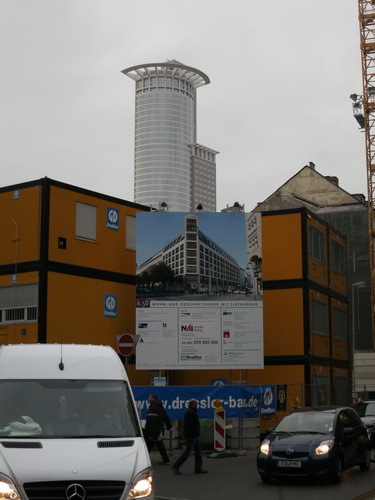 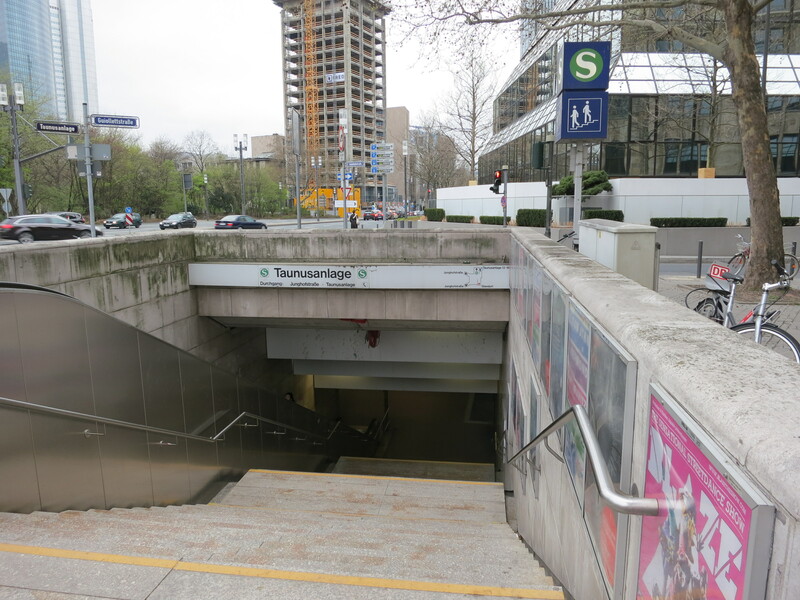 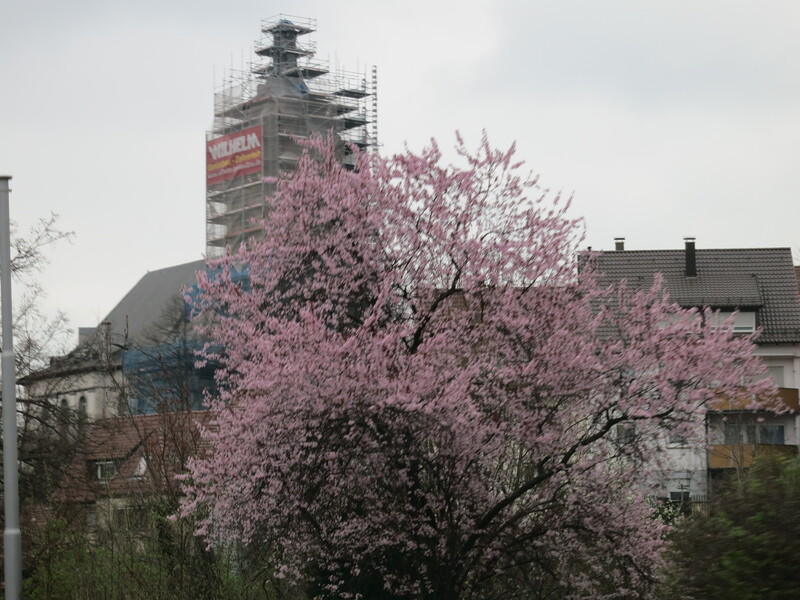 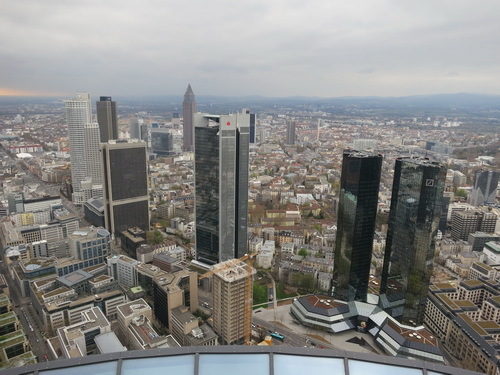 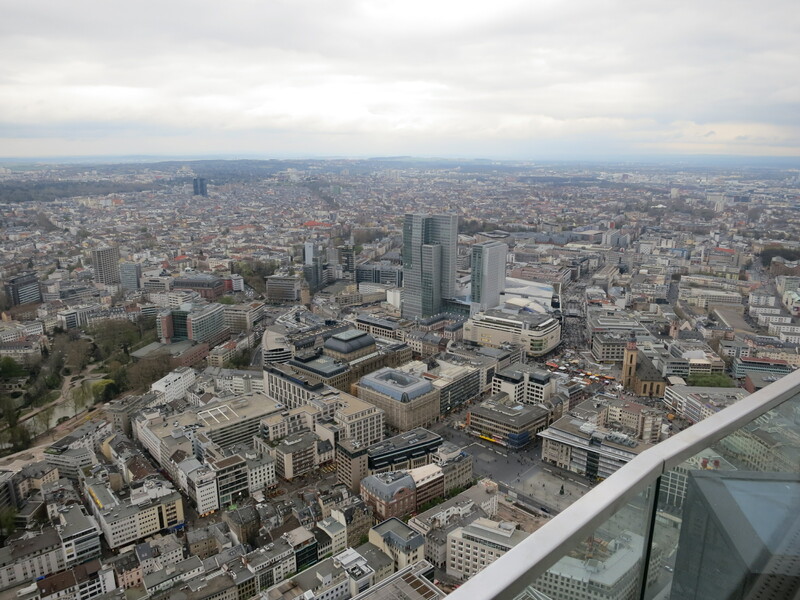 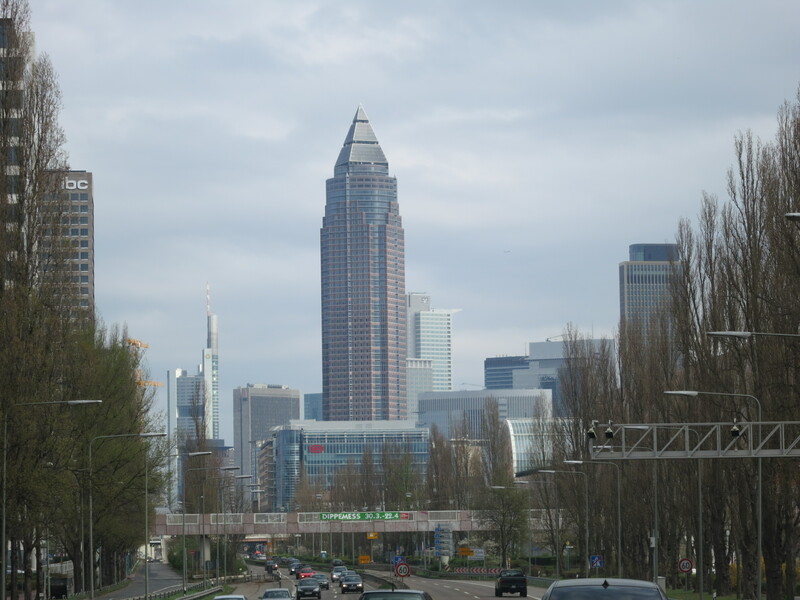 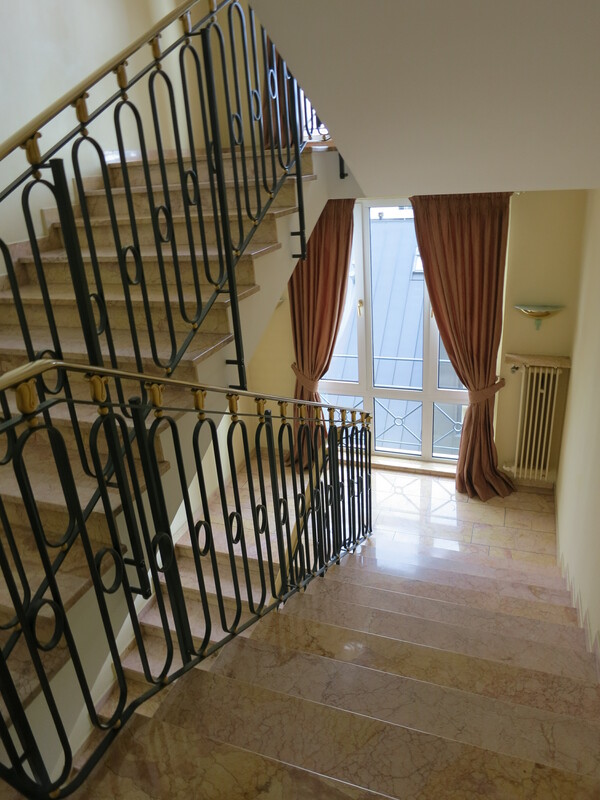 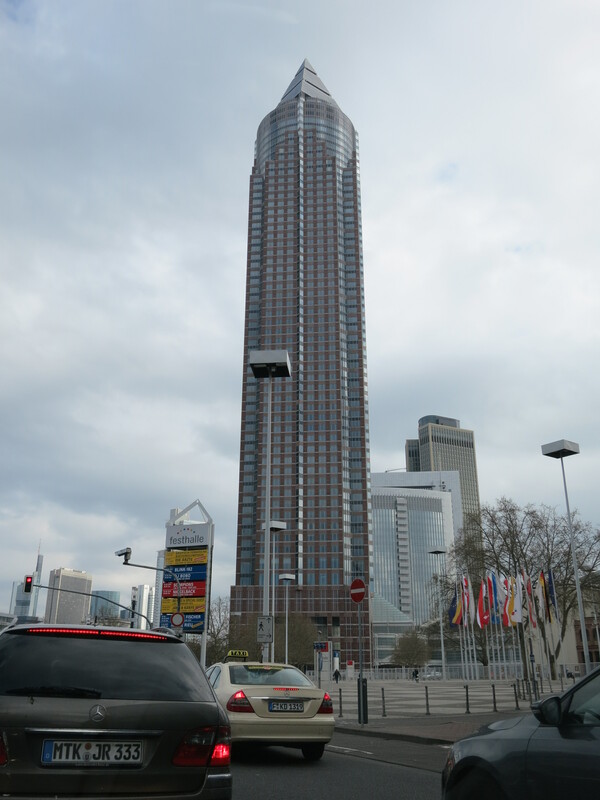 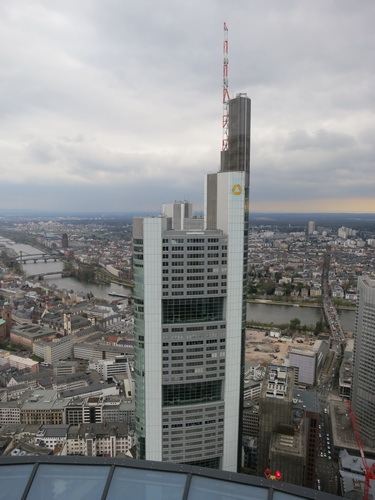 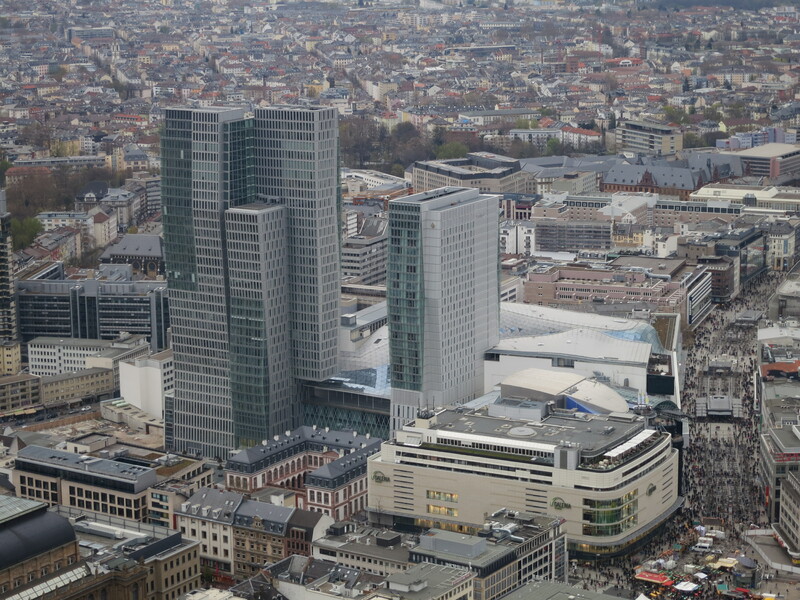 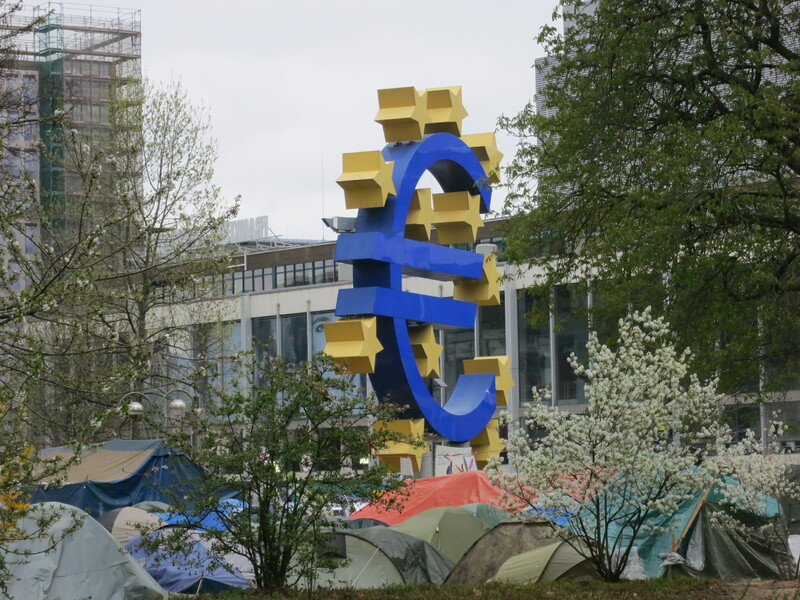 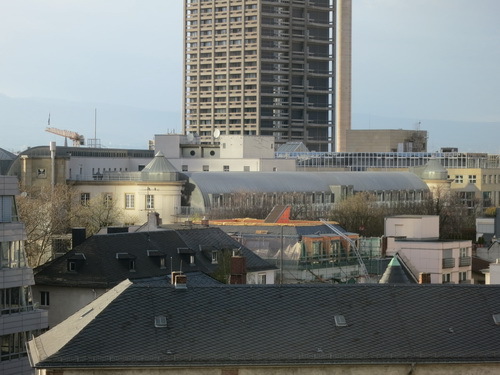 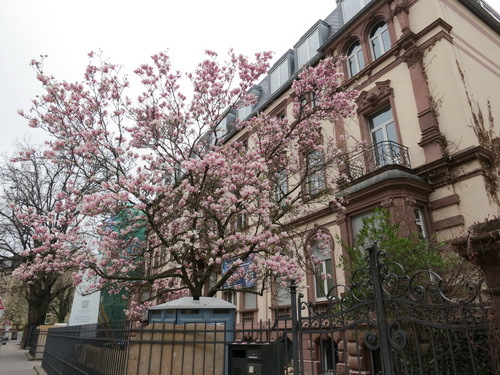 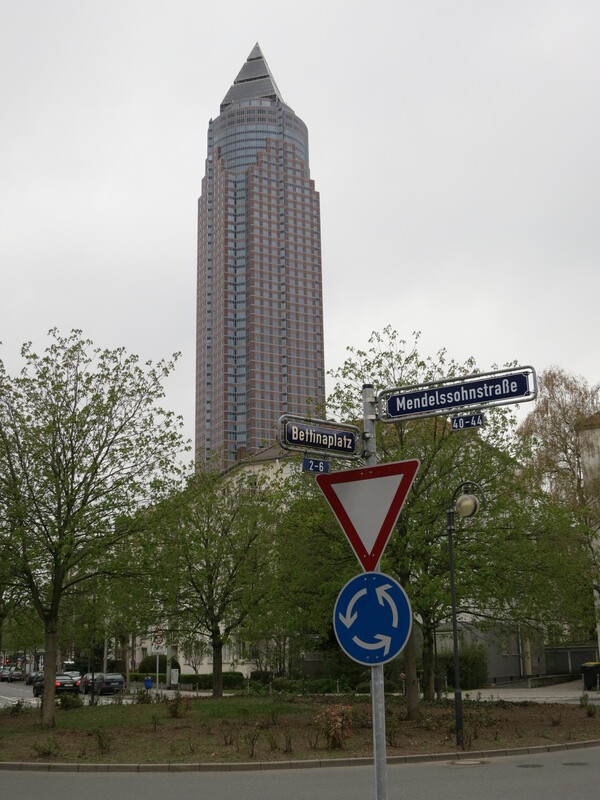 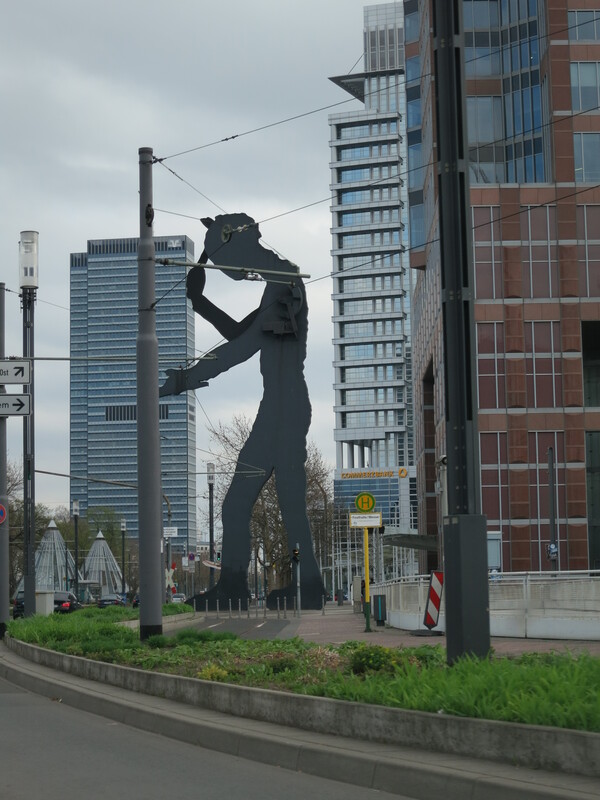 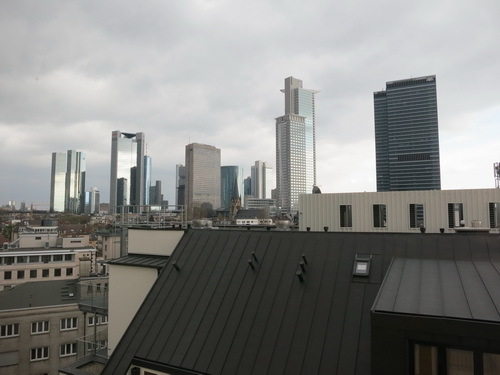 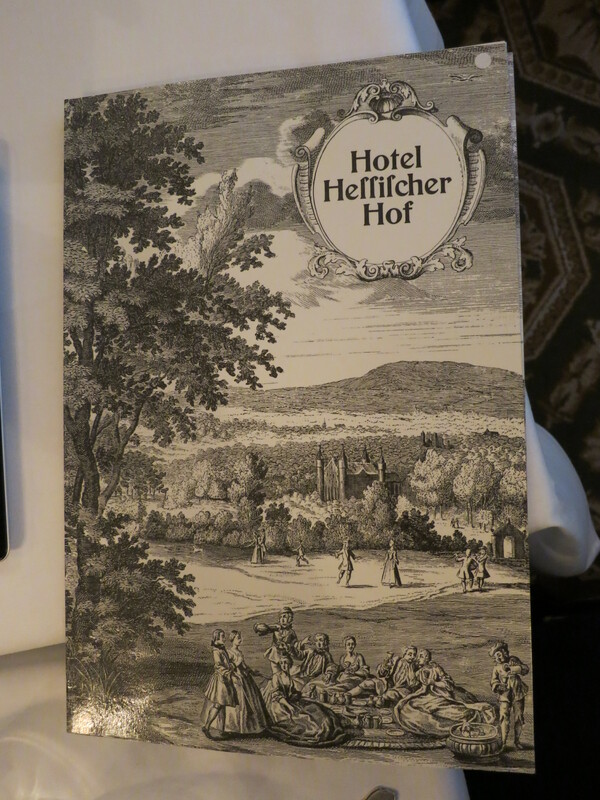 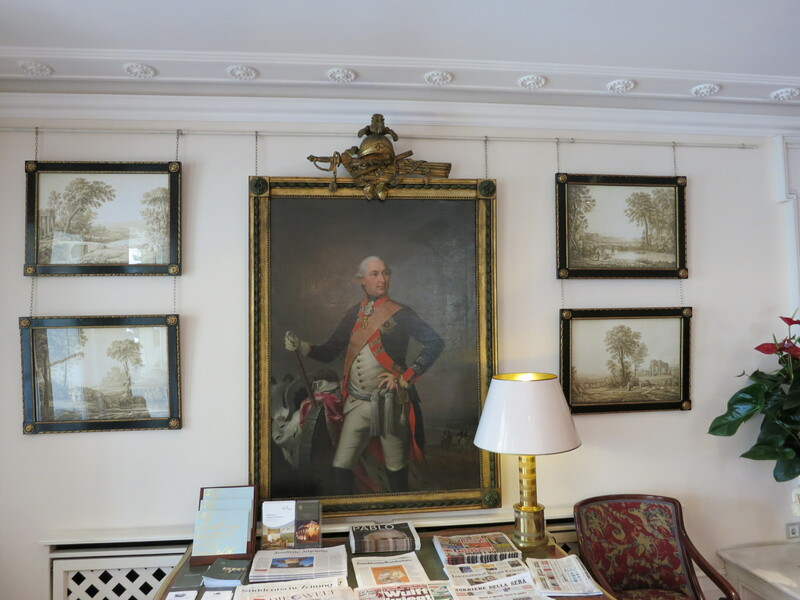 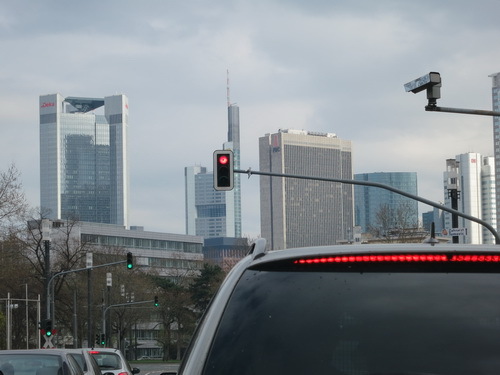 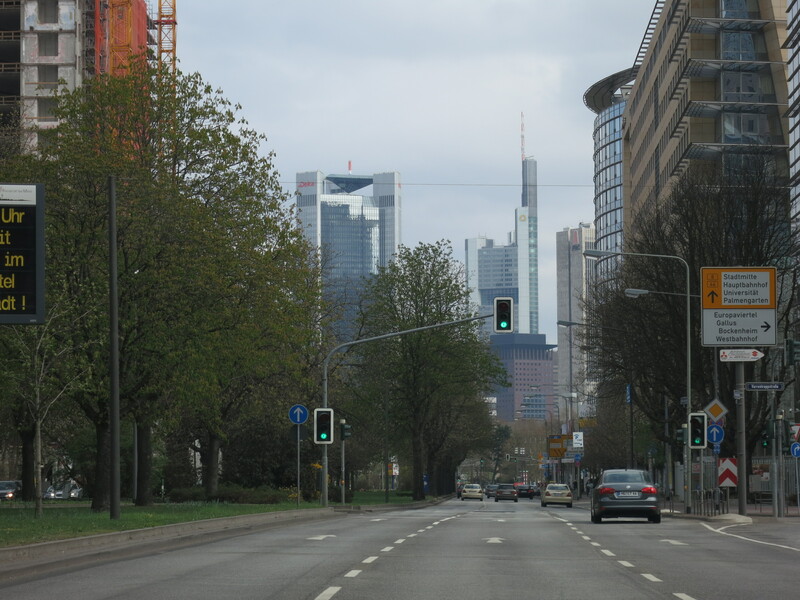 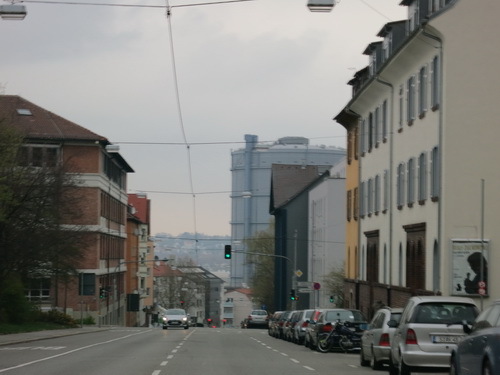 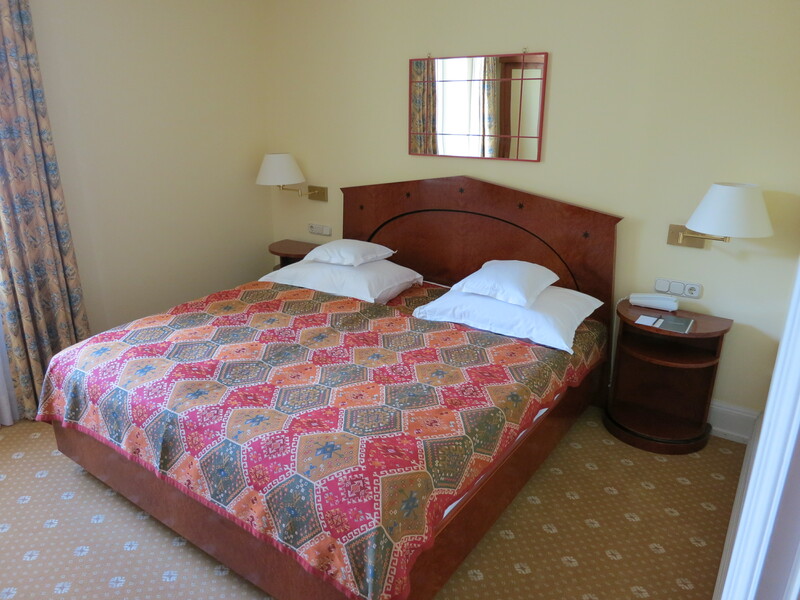 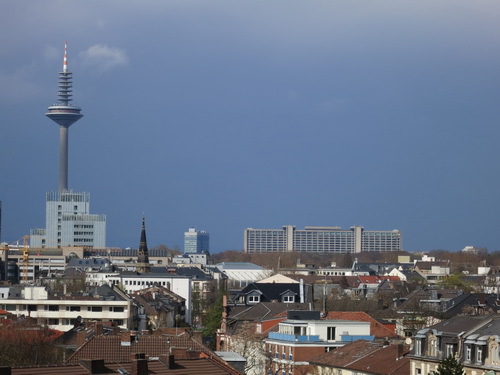 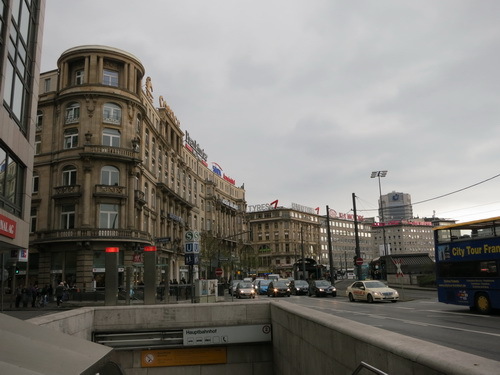 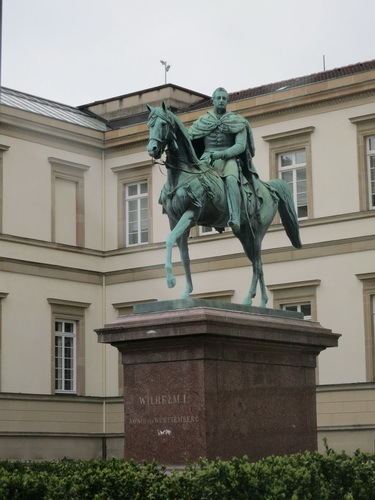 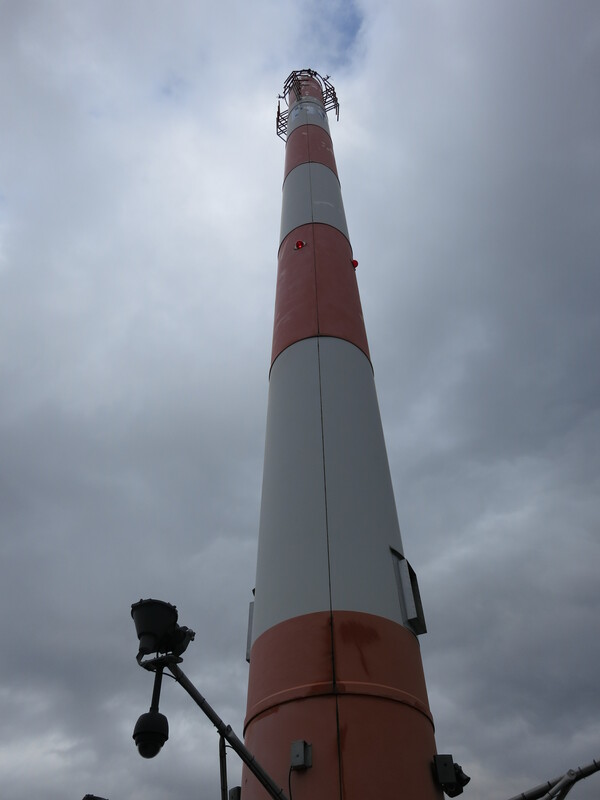 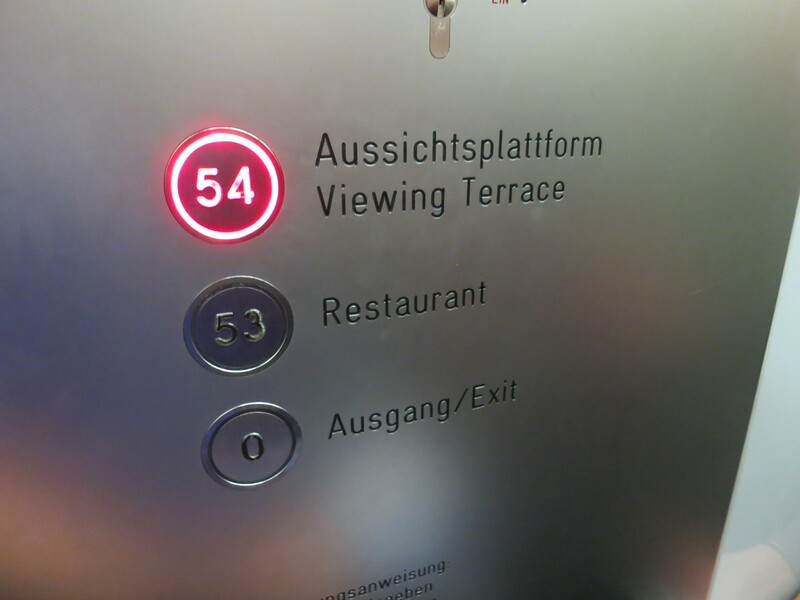 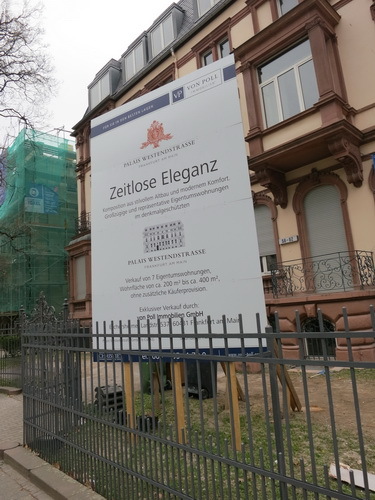 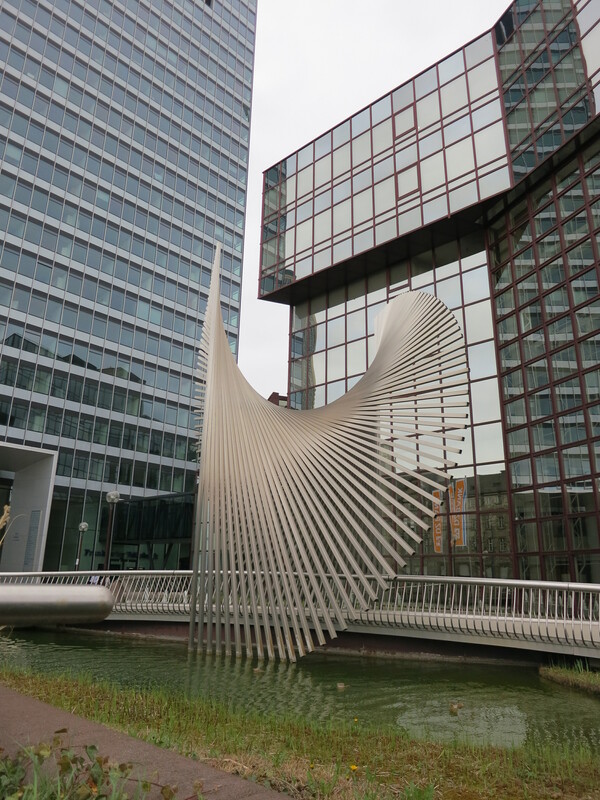 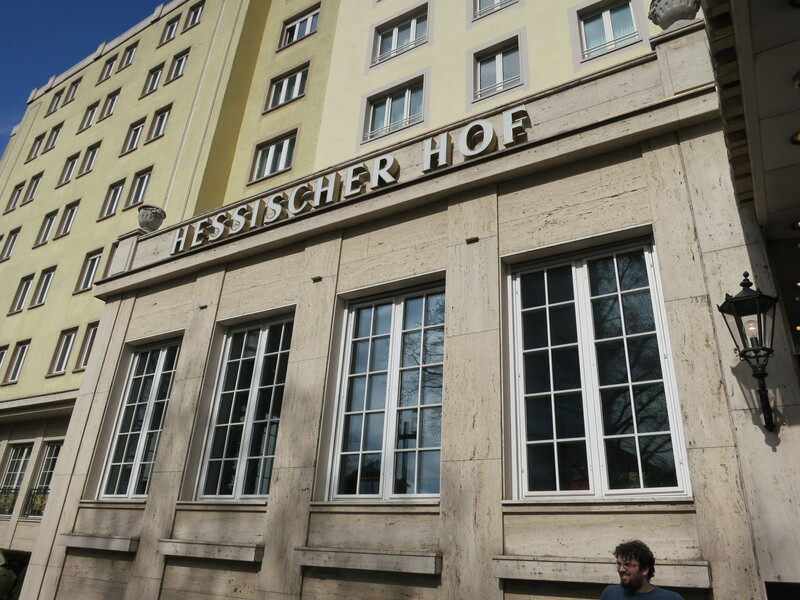 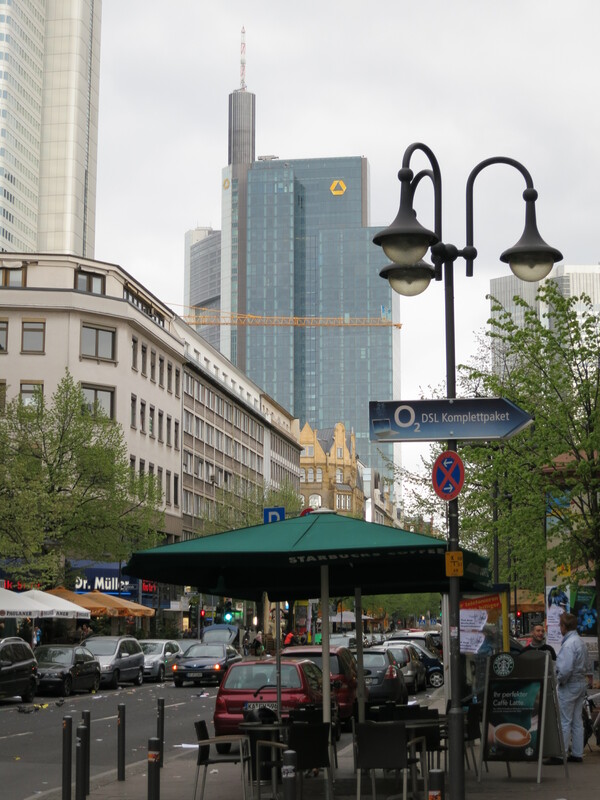 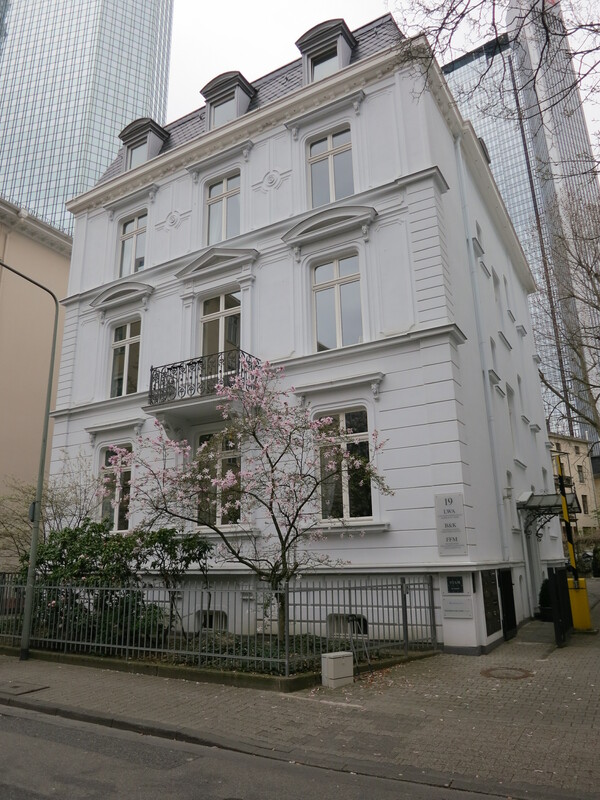 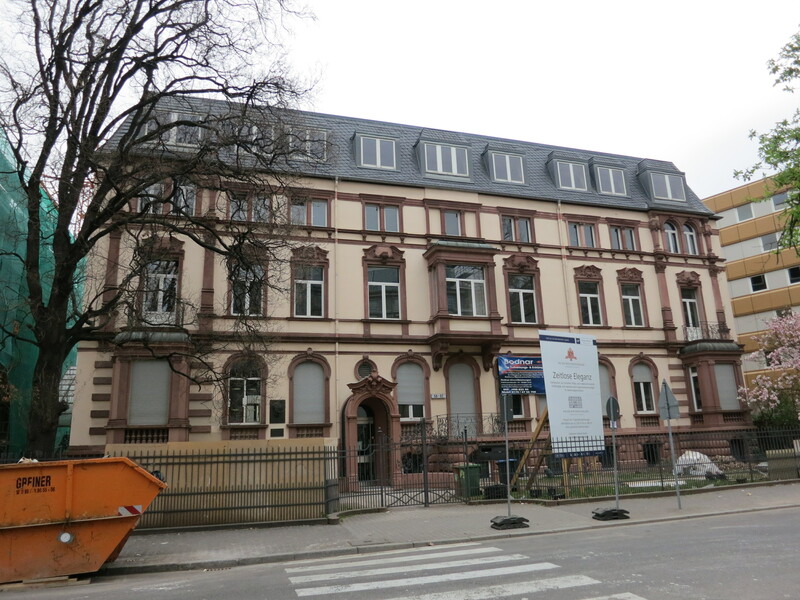 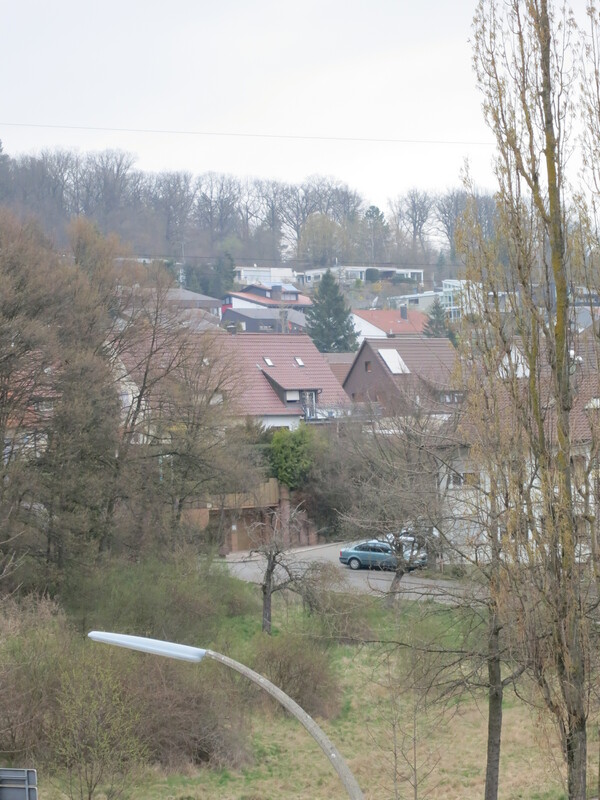 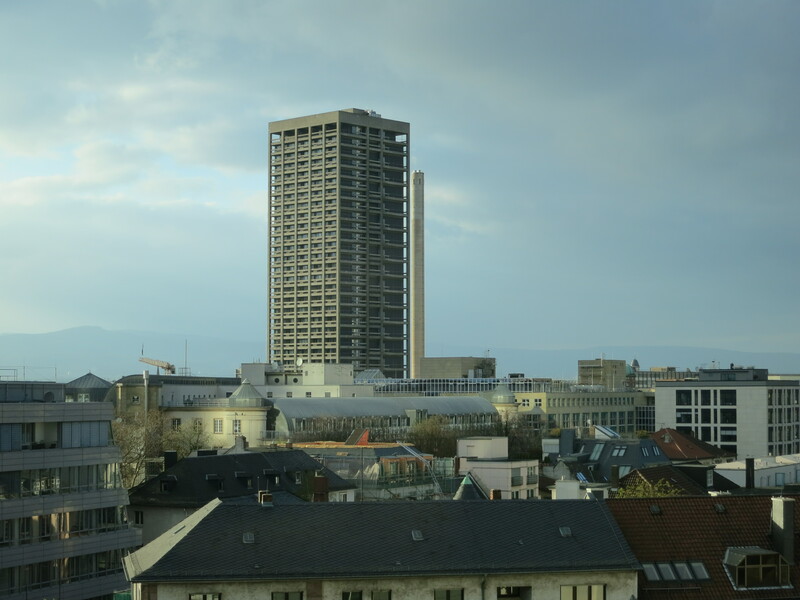 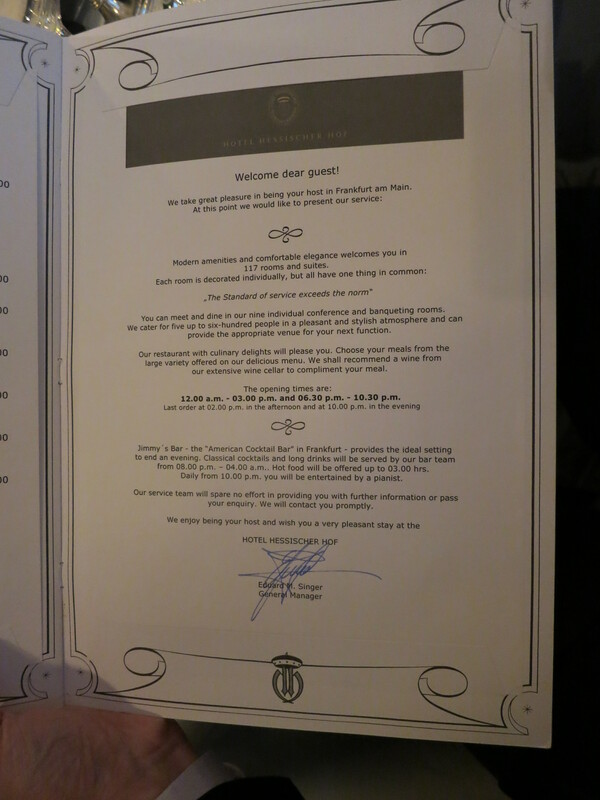 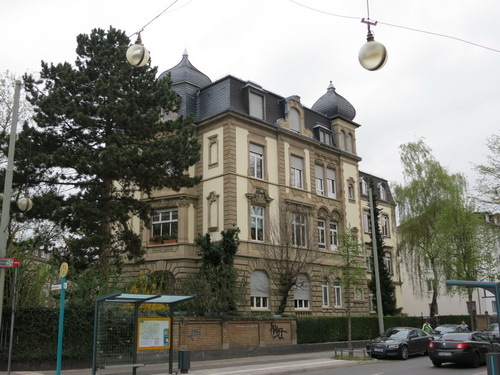 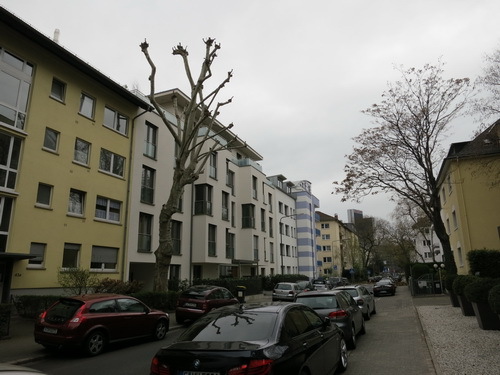 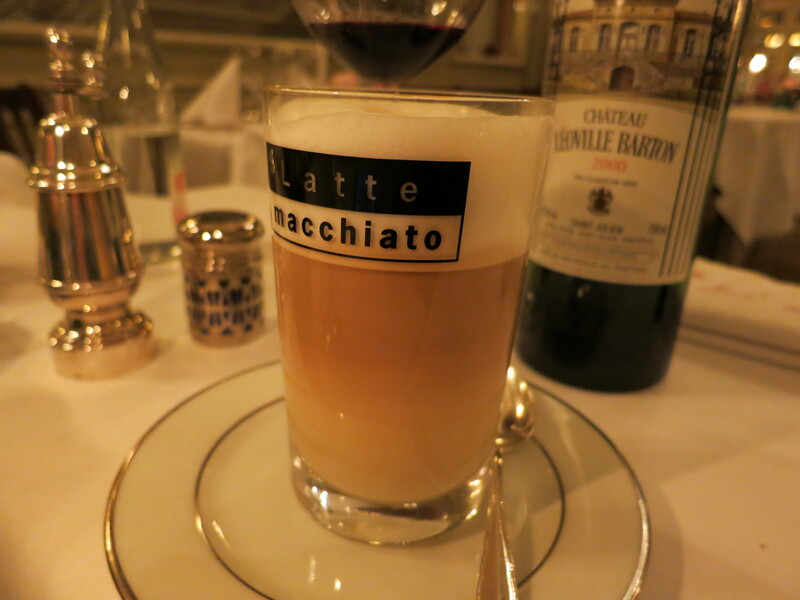 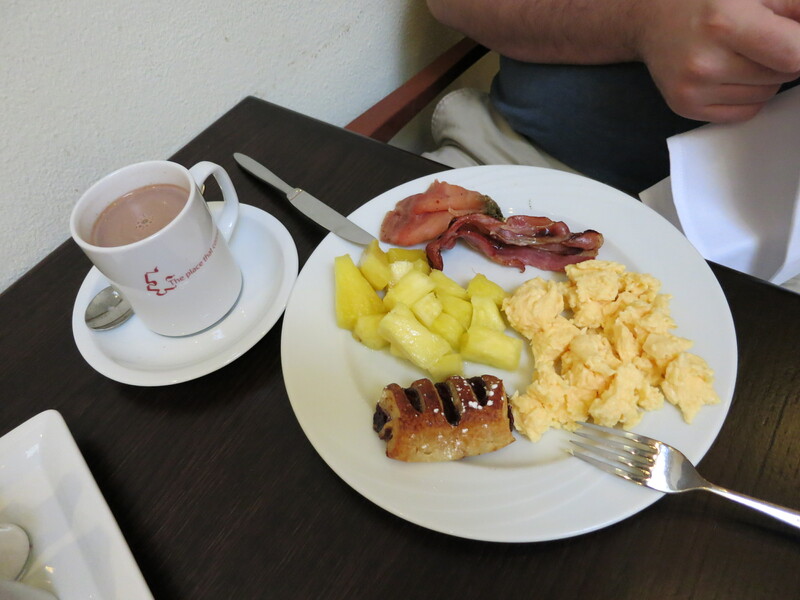 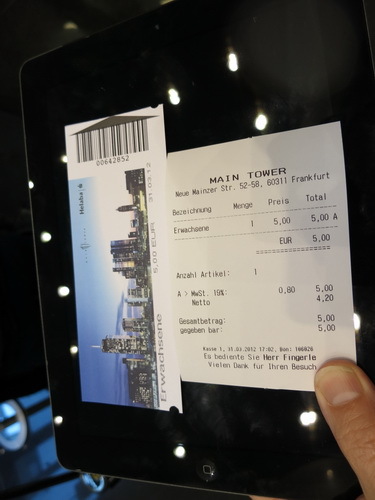 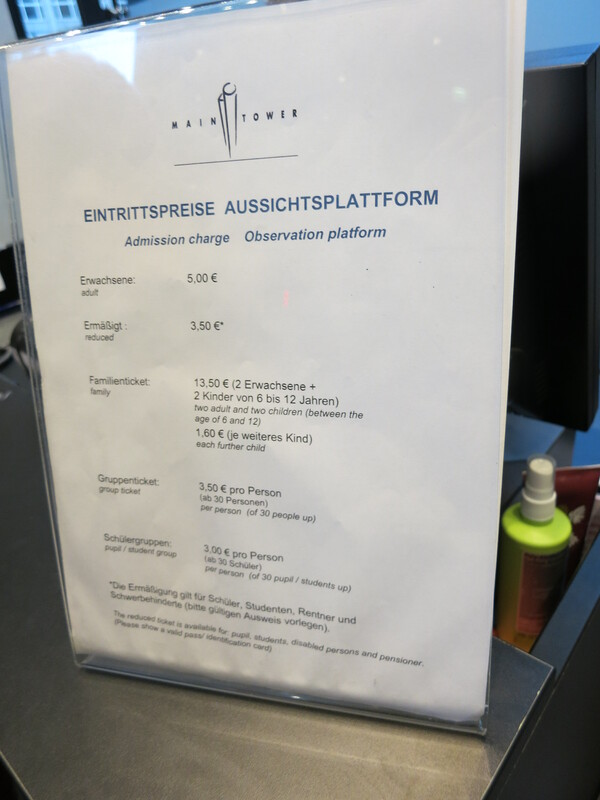 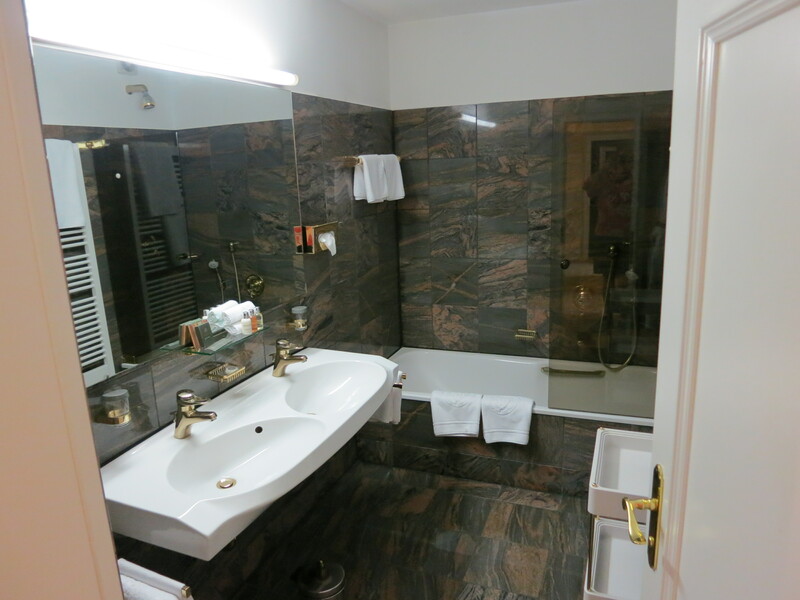 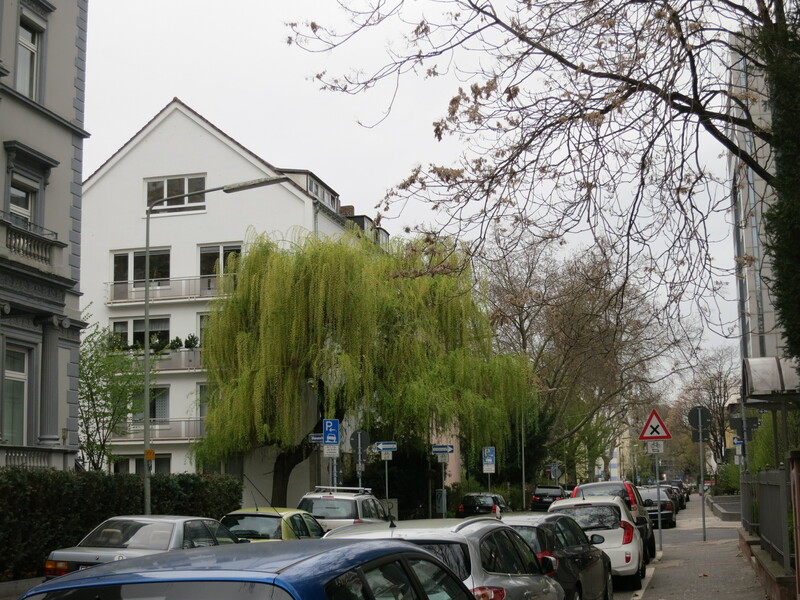 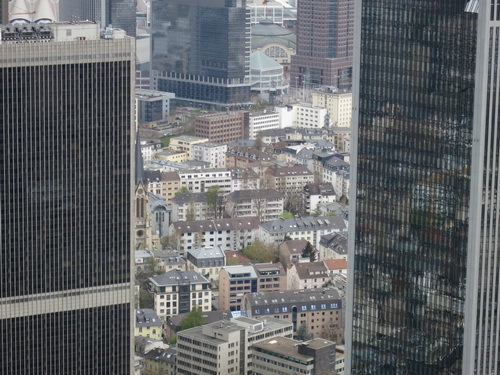 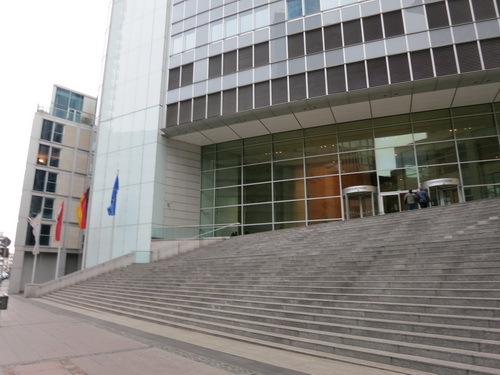 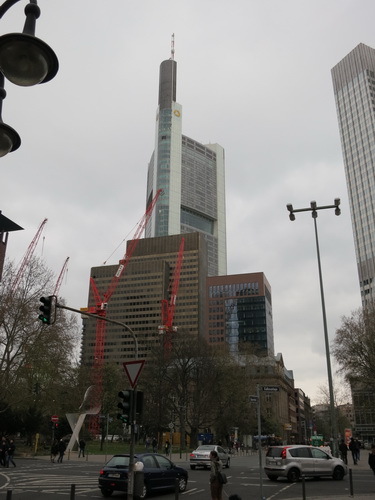 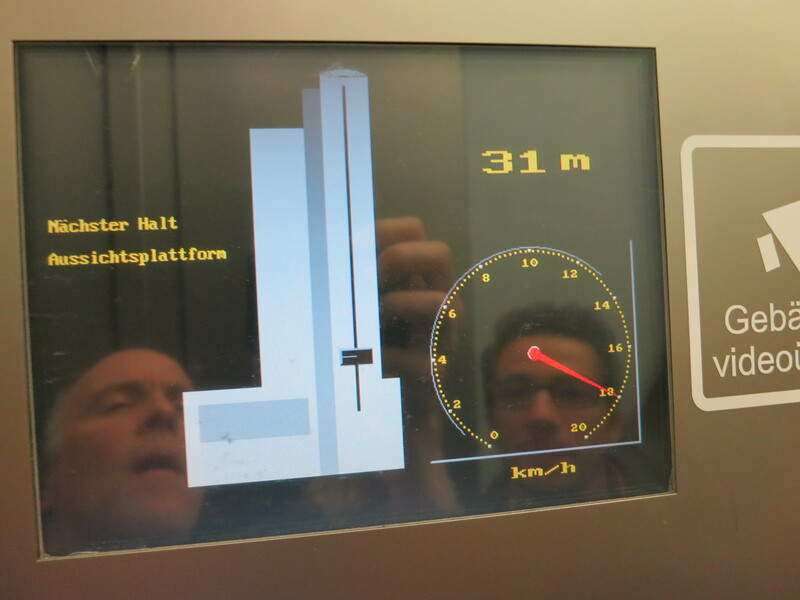 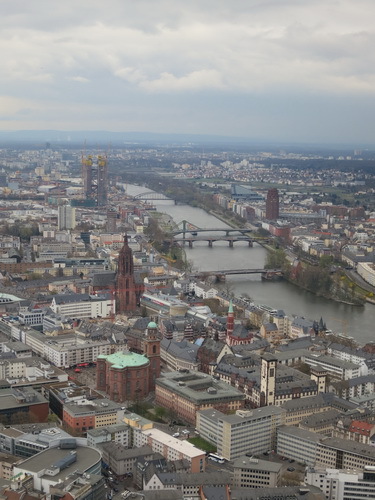 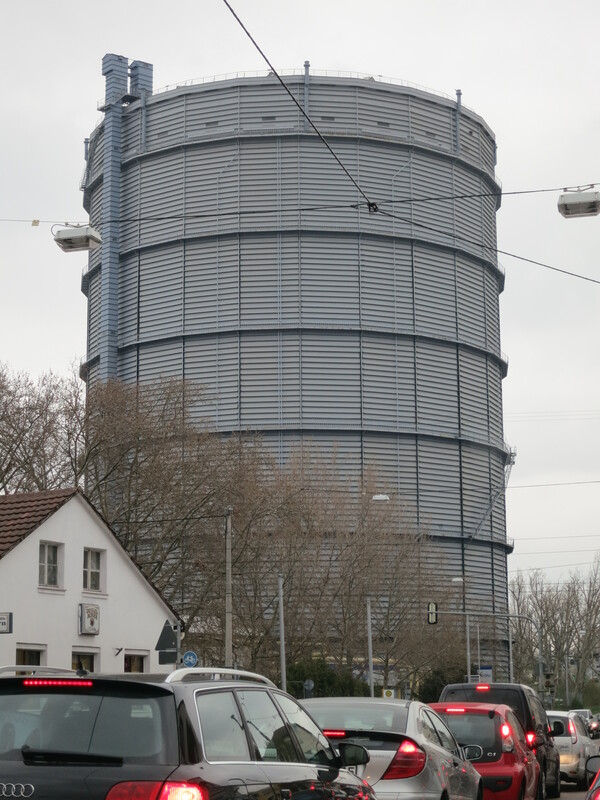 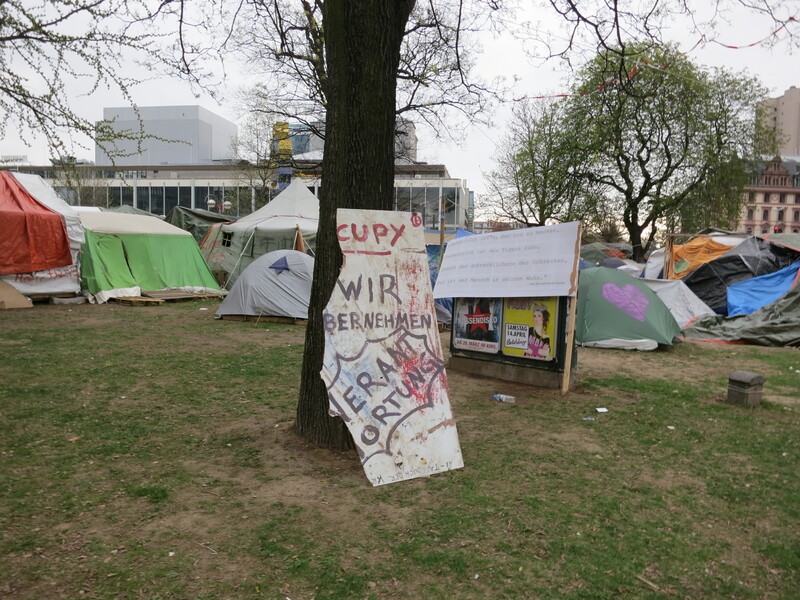 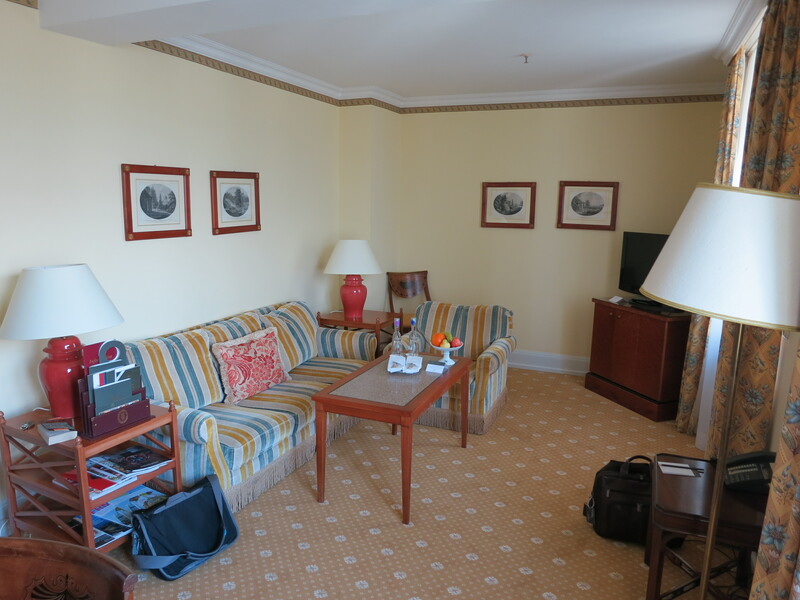 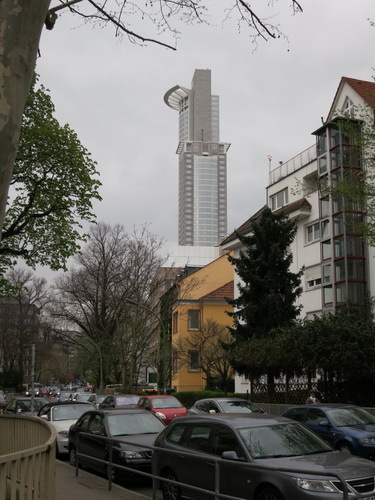 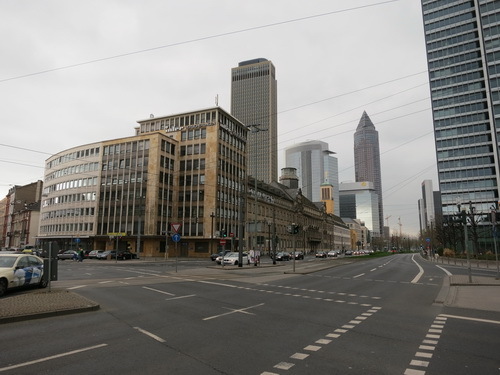 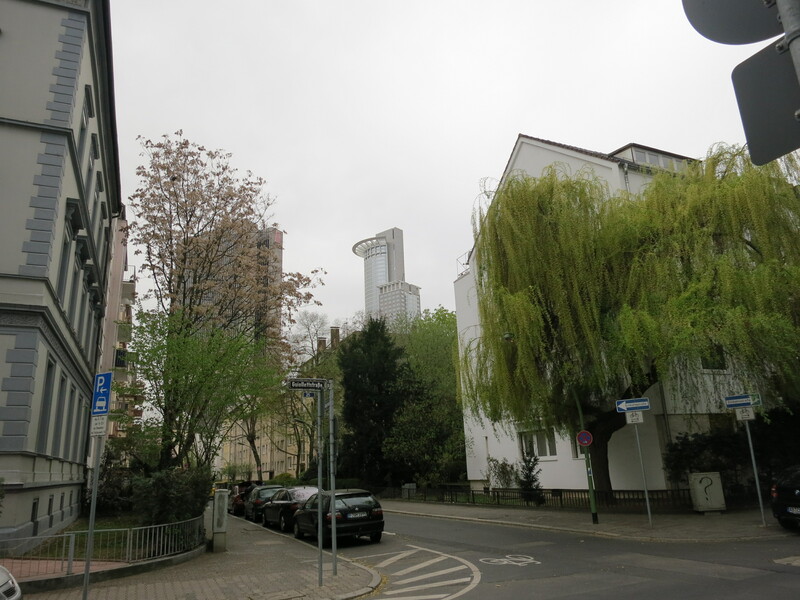 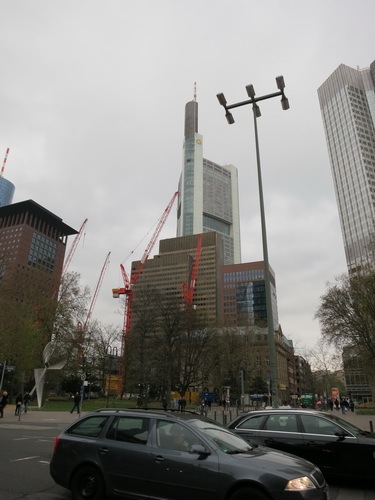 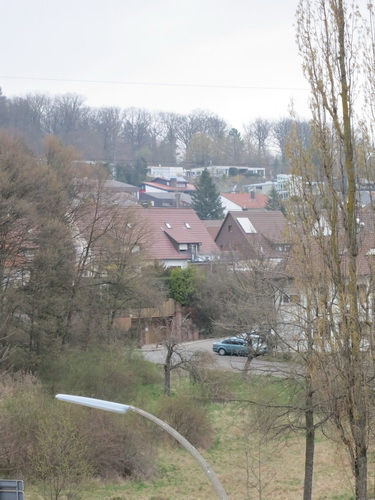 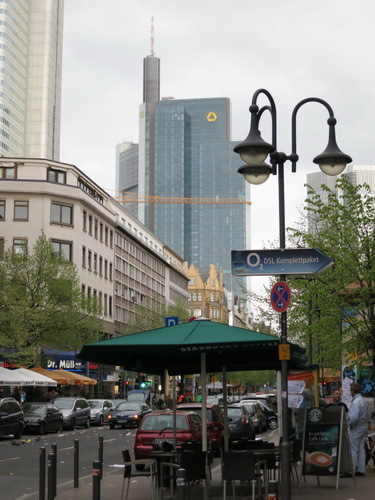 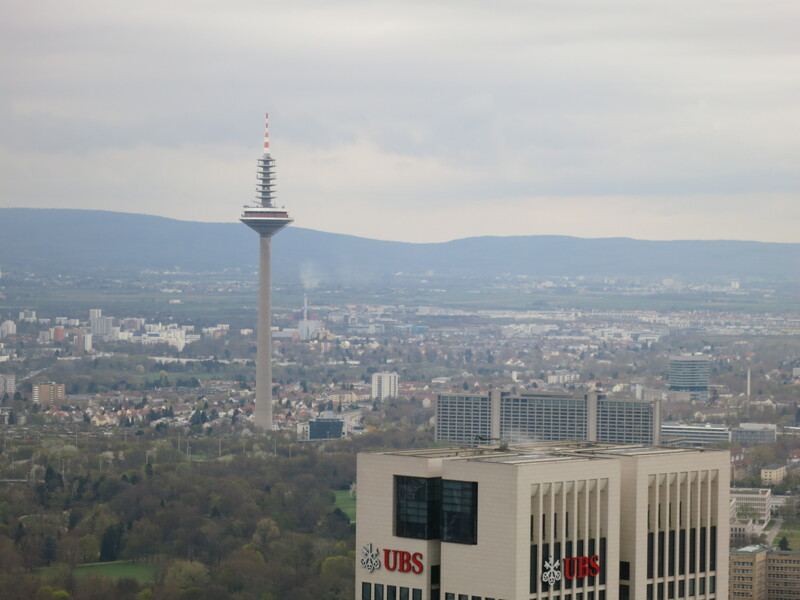 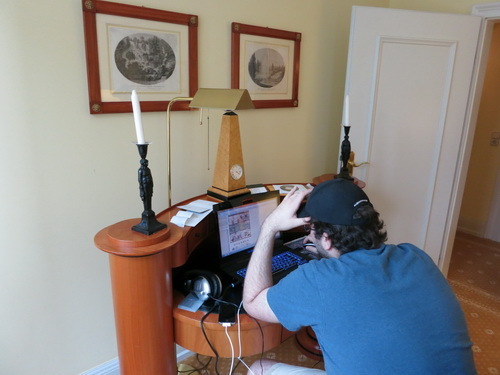 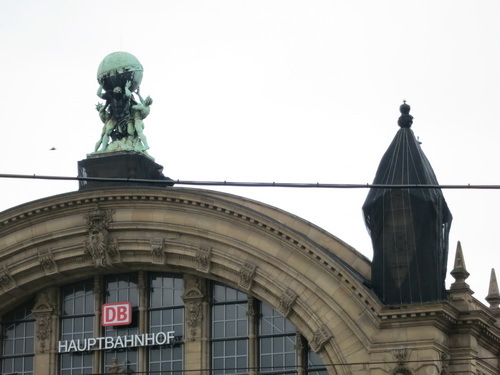 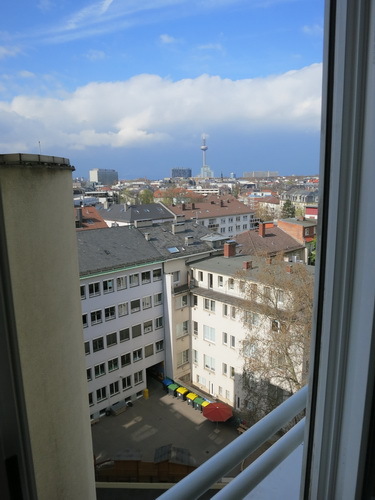 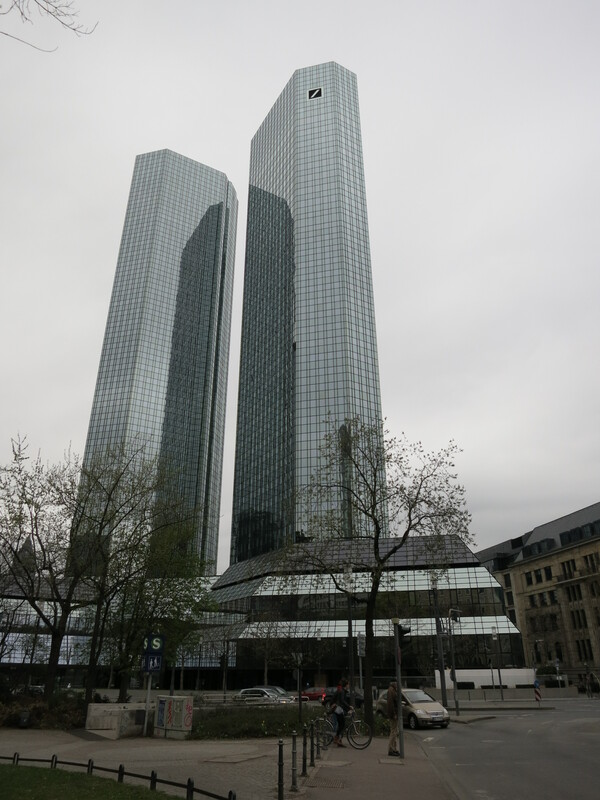 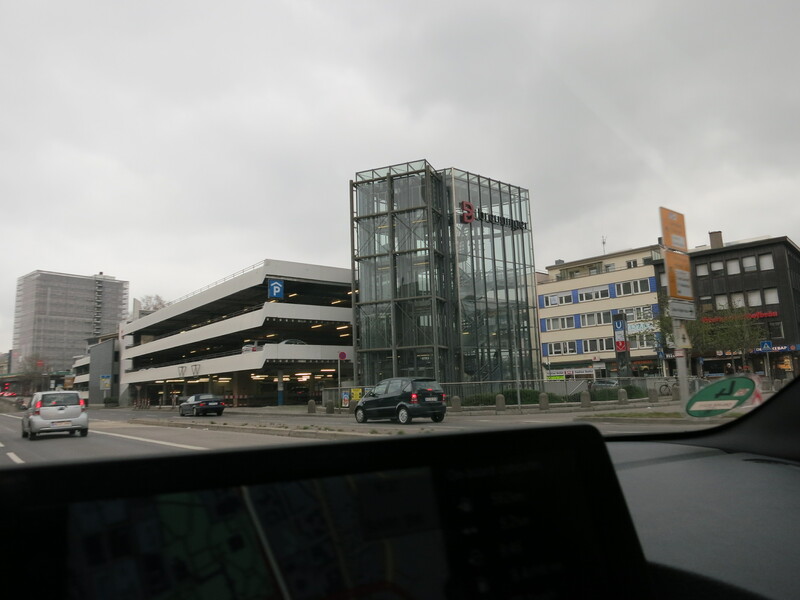 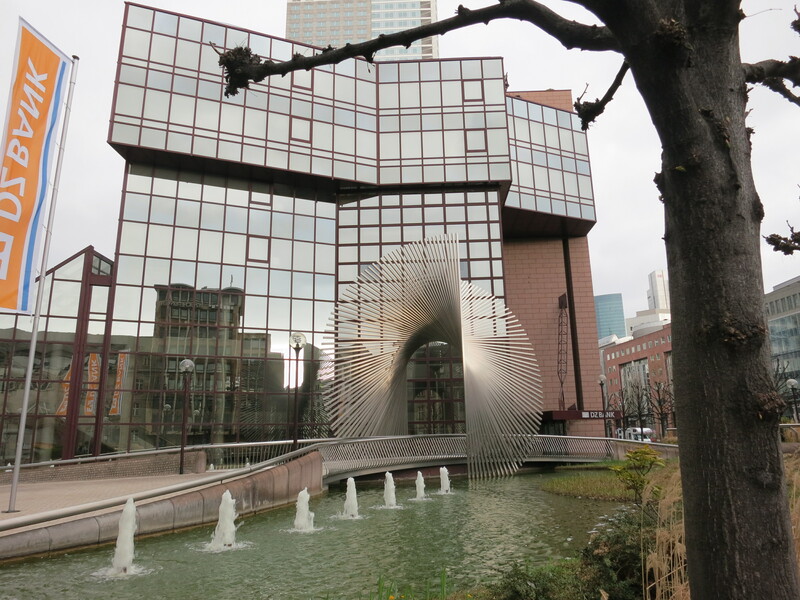 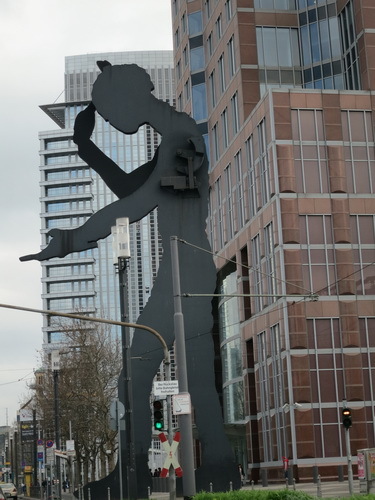 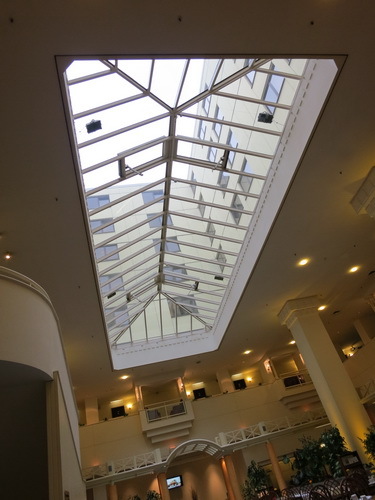 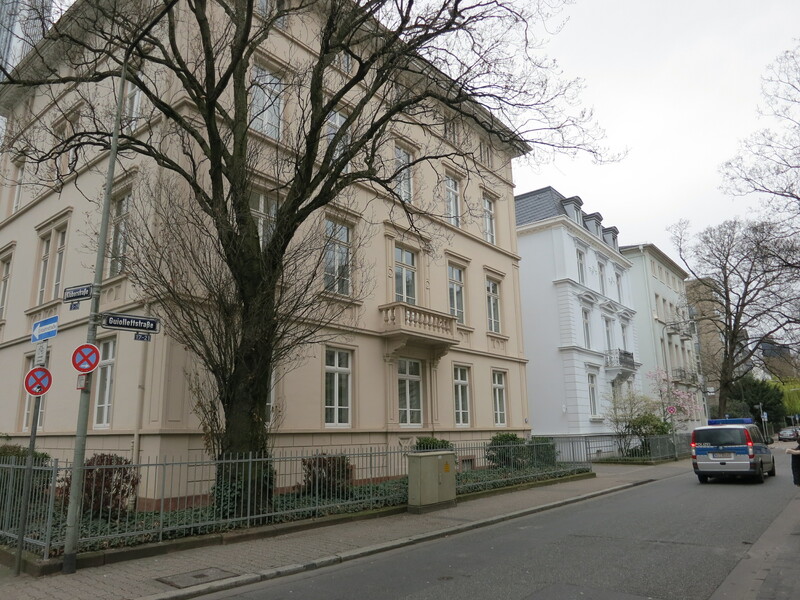 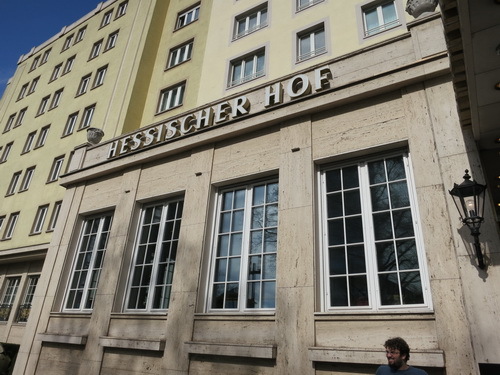 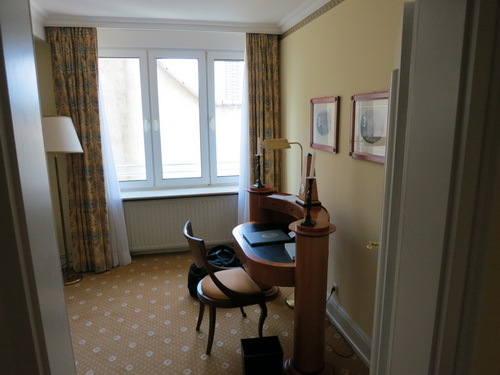 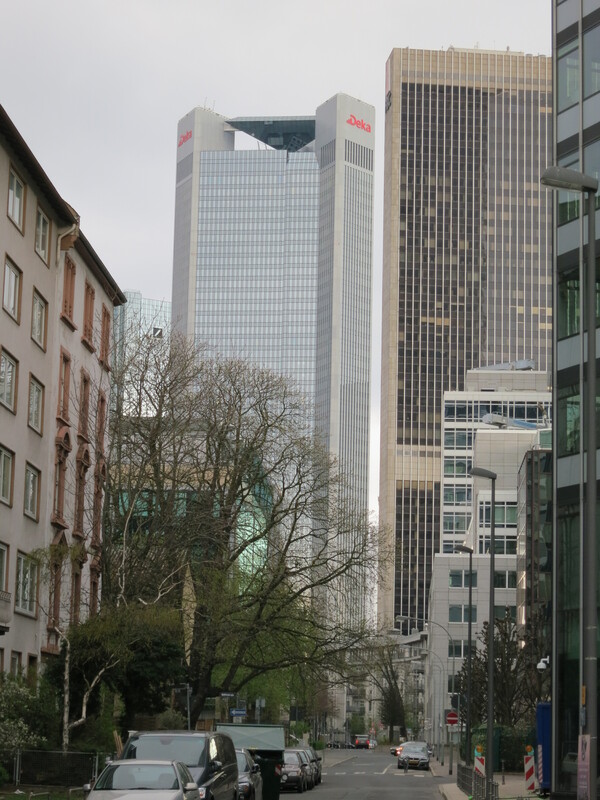 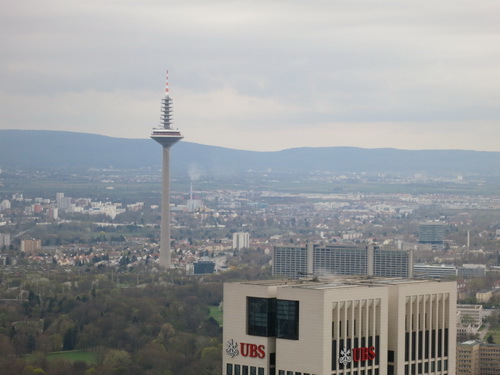 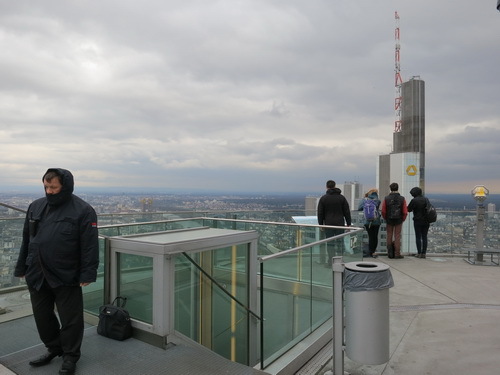 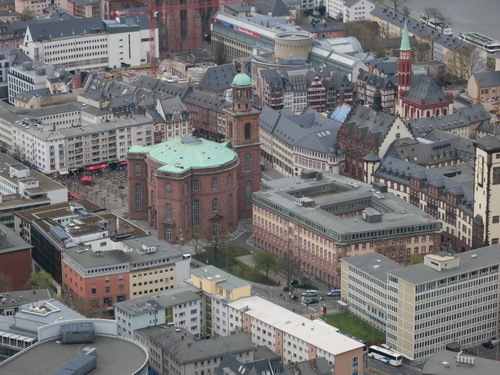 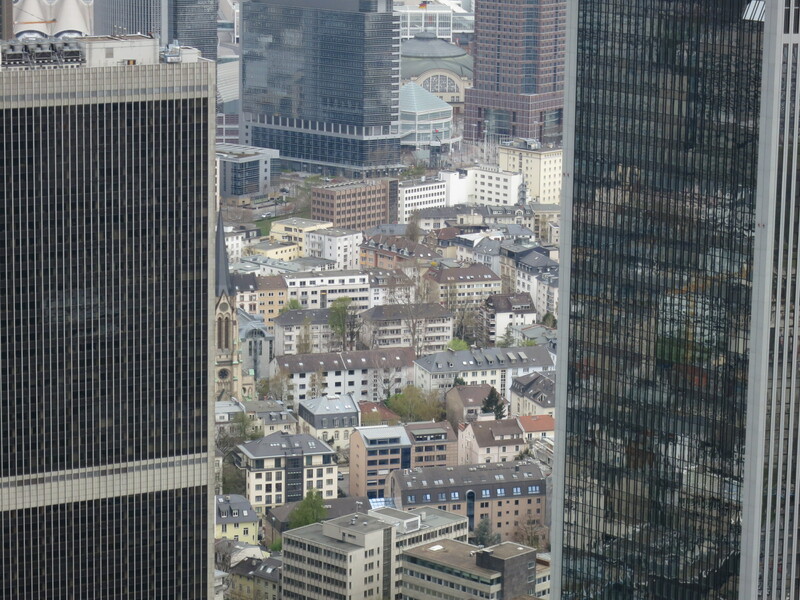 We checked into the Hotel Hessischer Hof for our last night in Germany and then Ben set out for a walk and found the Frankfurt Main Tower, took the short elevator ride up to the top, and was buffeted by strong winds and cool temperatures. Great views! 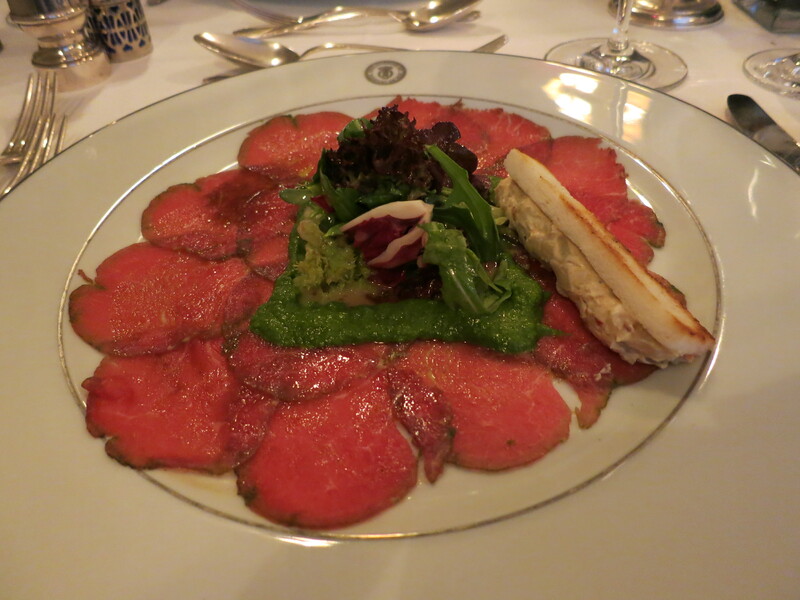 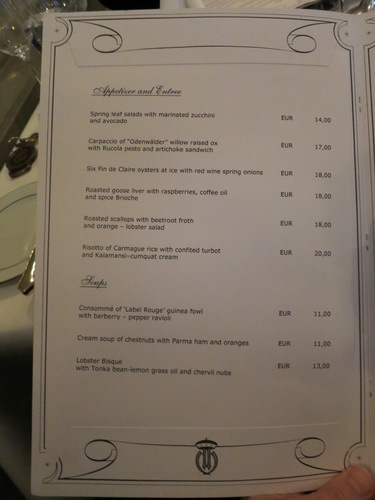 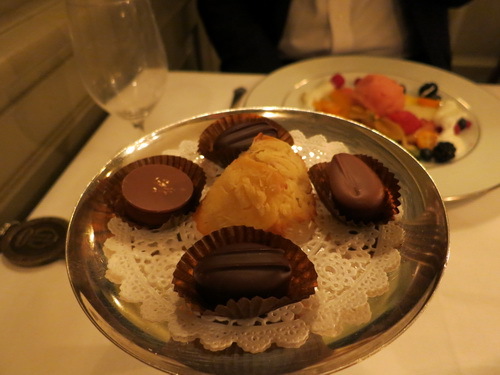 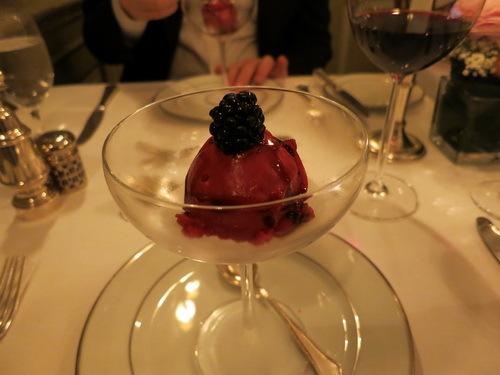 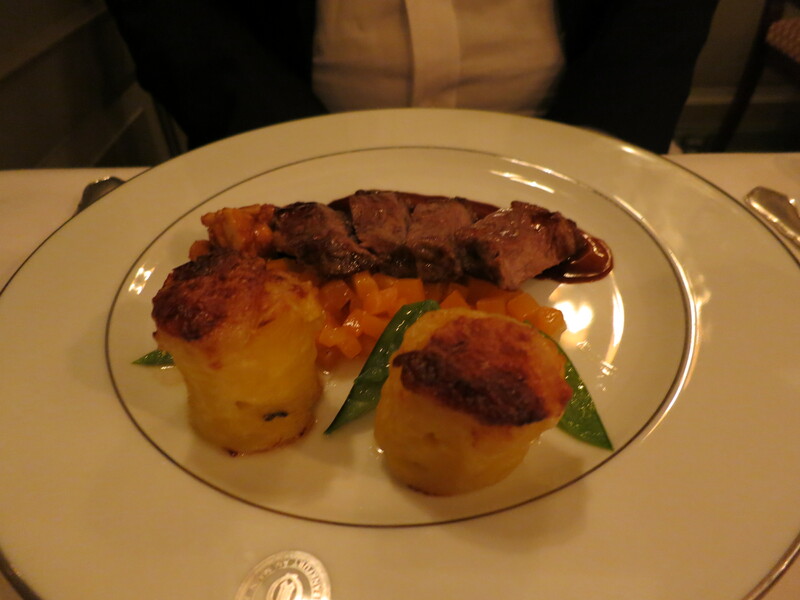 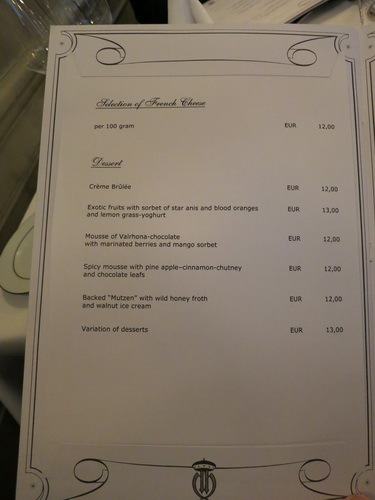 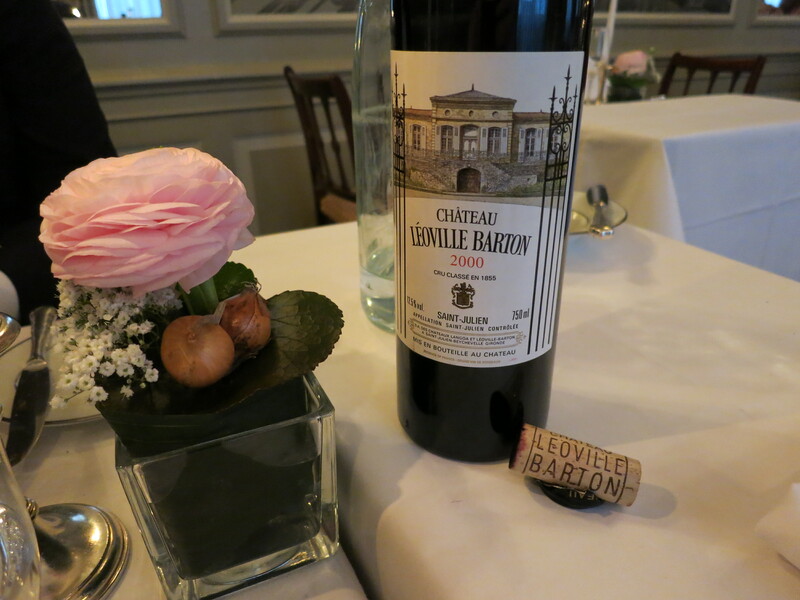 We had a nice dinner at the hotel accompanied by a 2000 Chateau Leoville Barton and then got to bed early for our flight the next day.